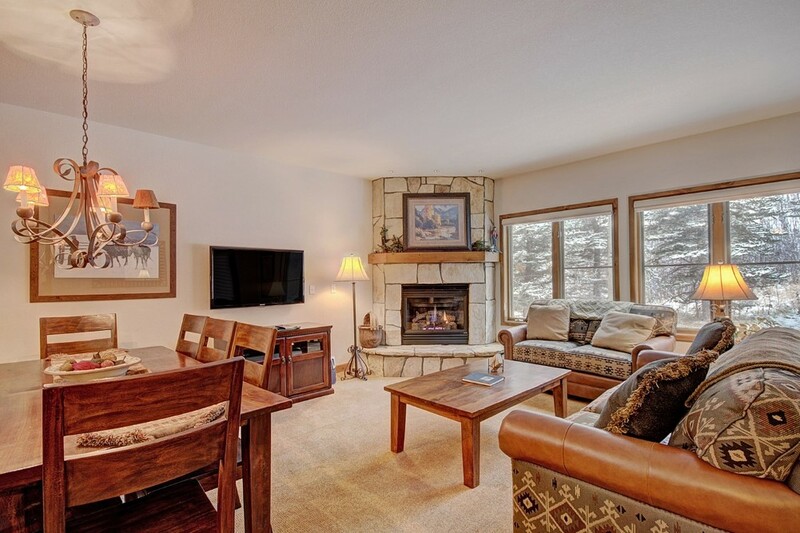 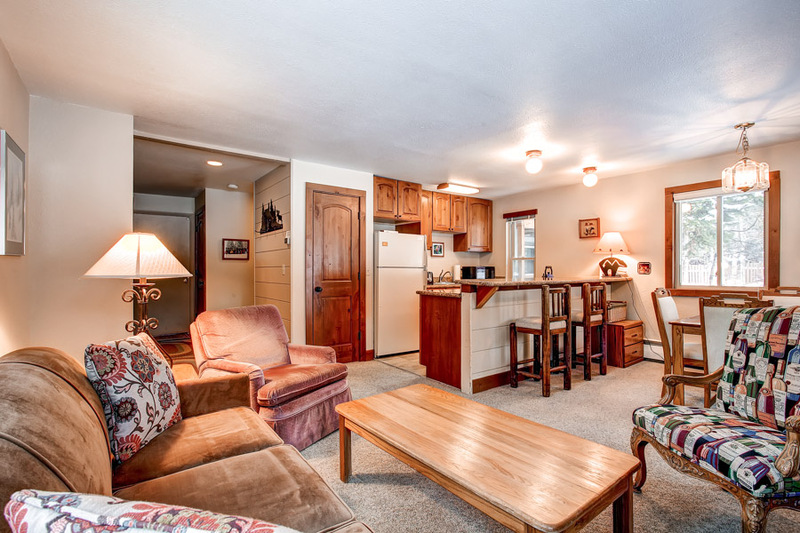 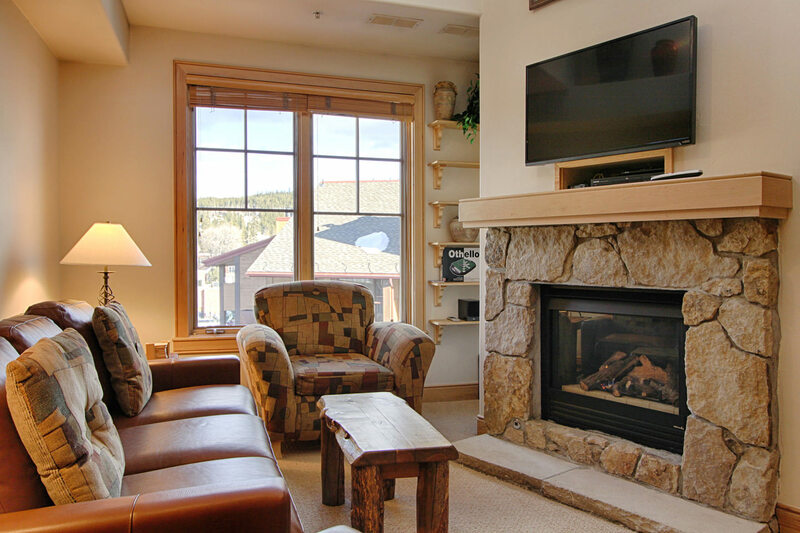 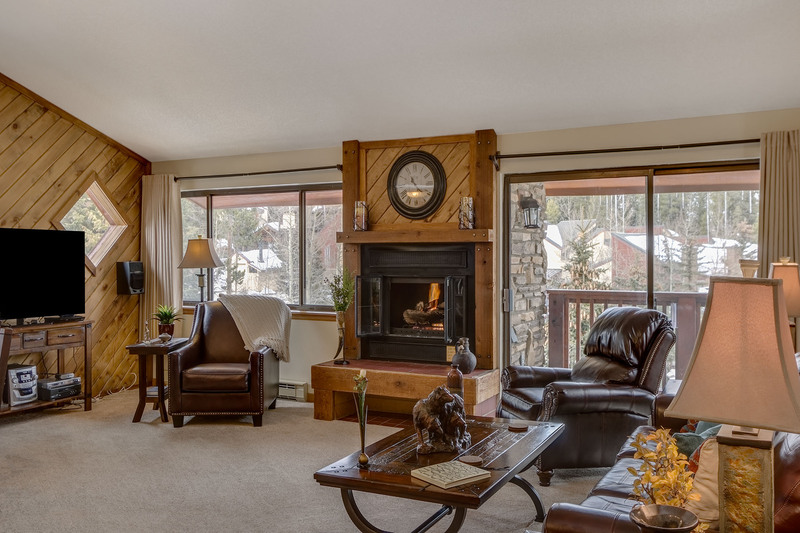 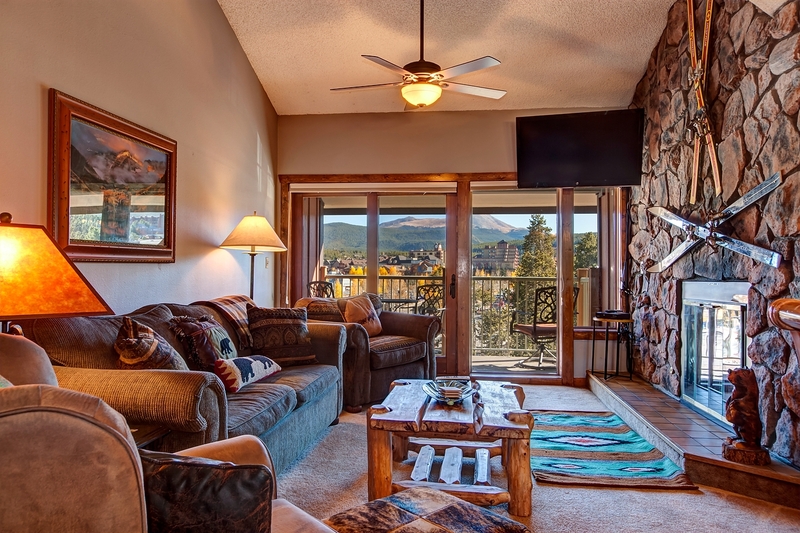 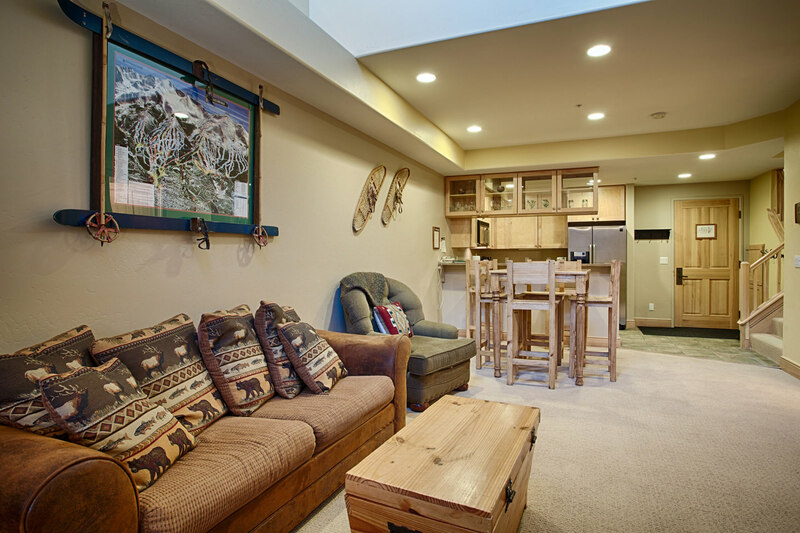 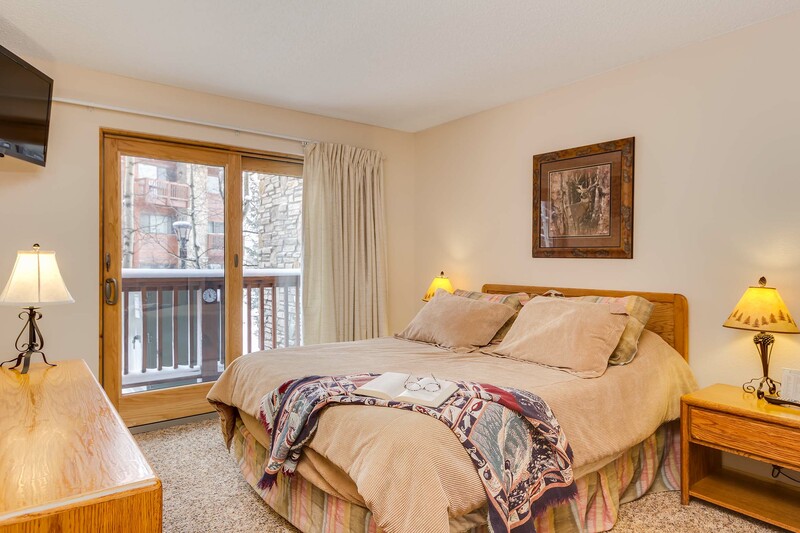 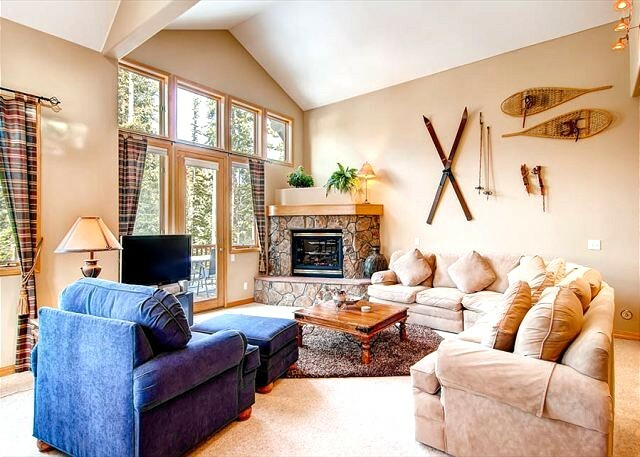 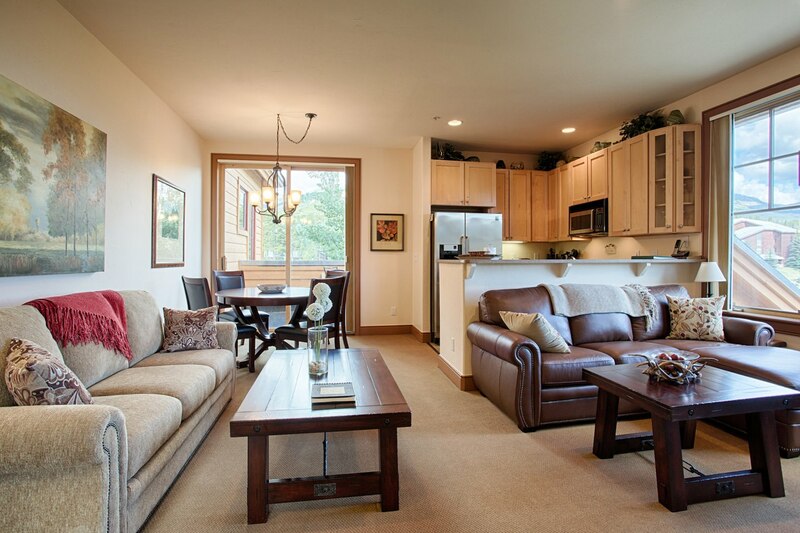 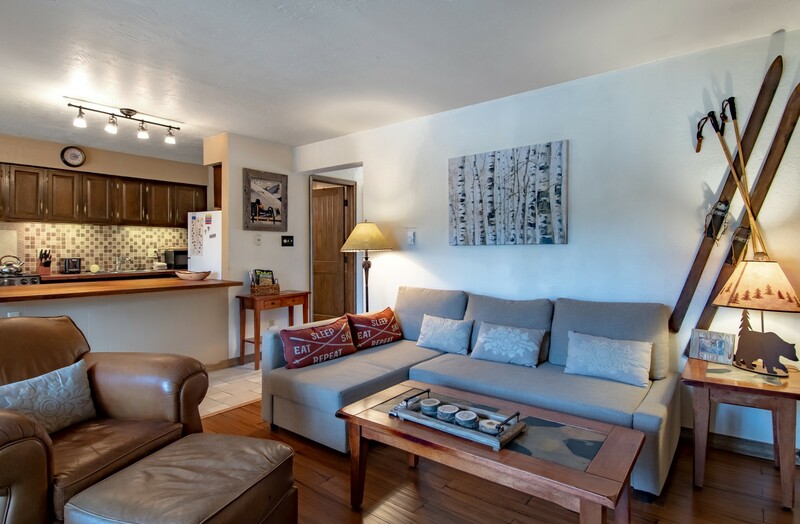 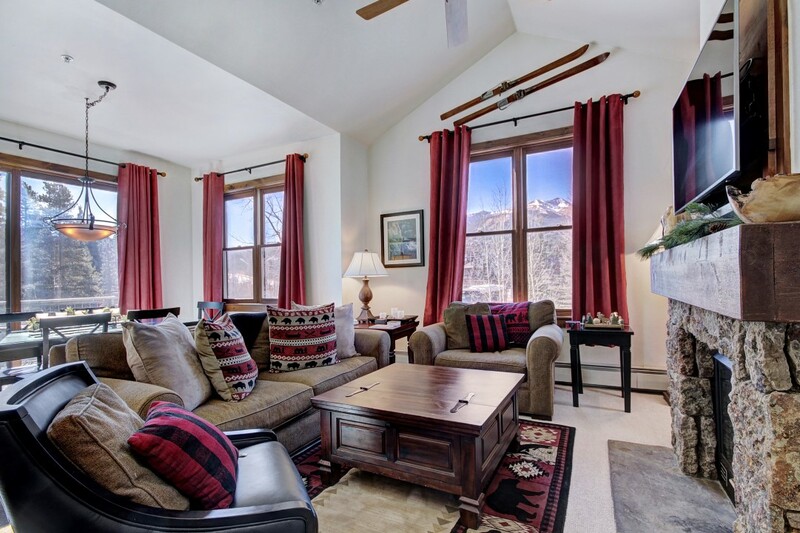 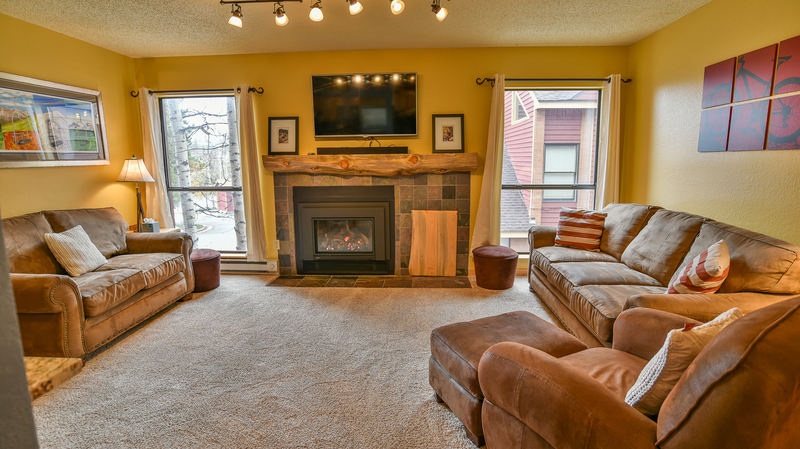 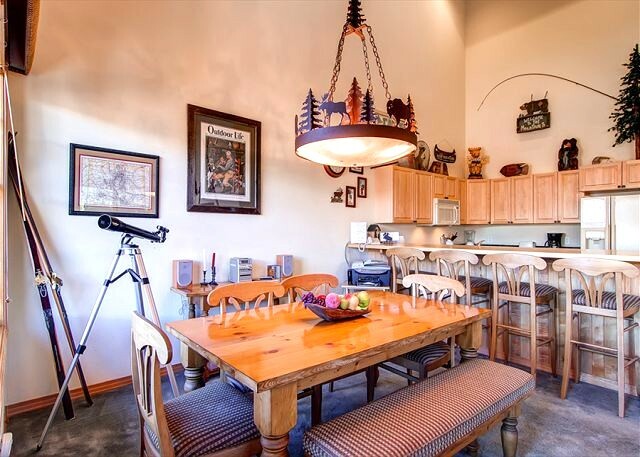 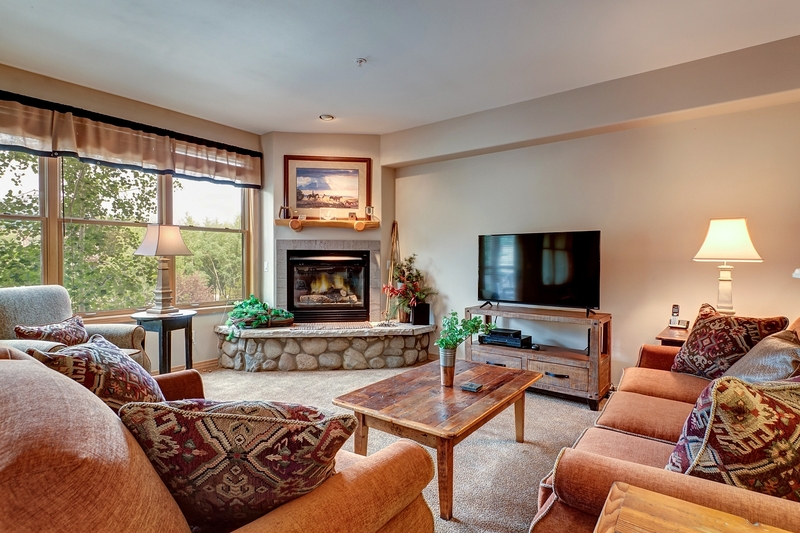 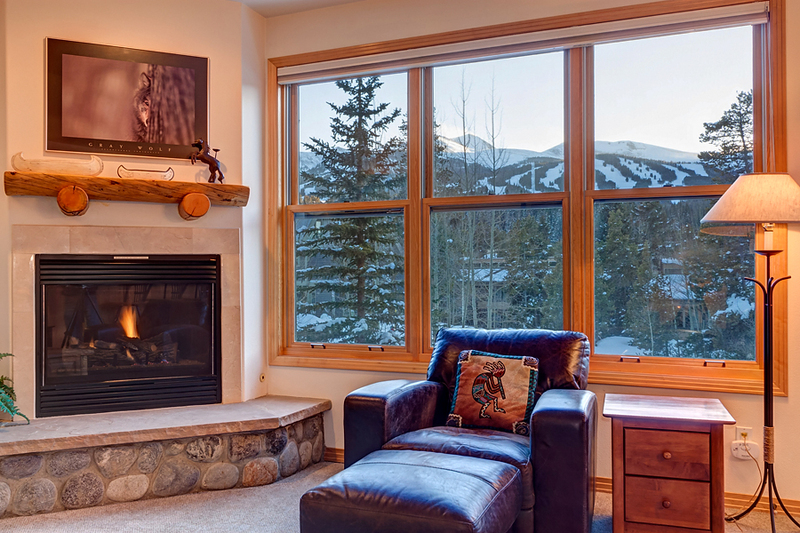 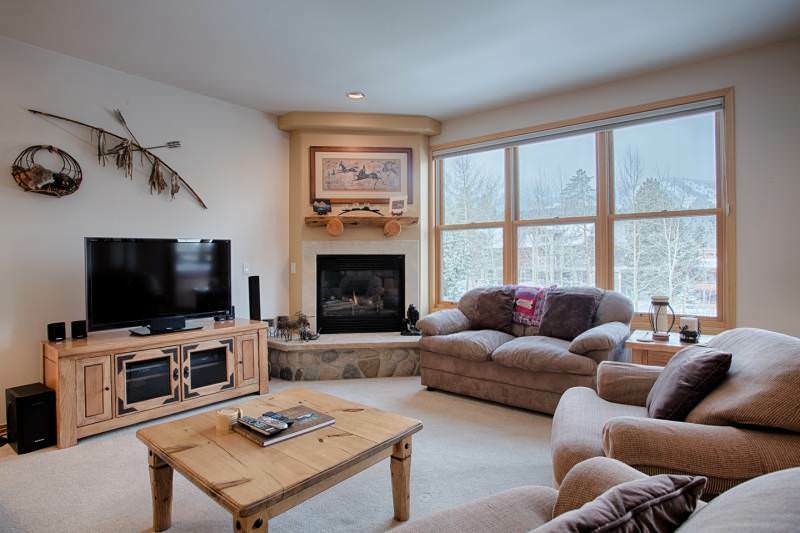 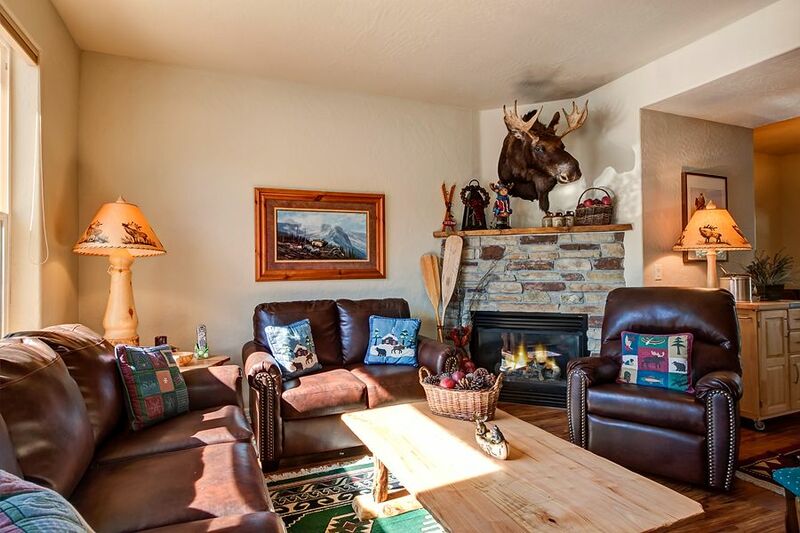 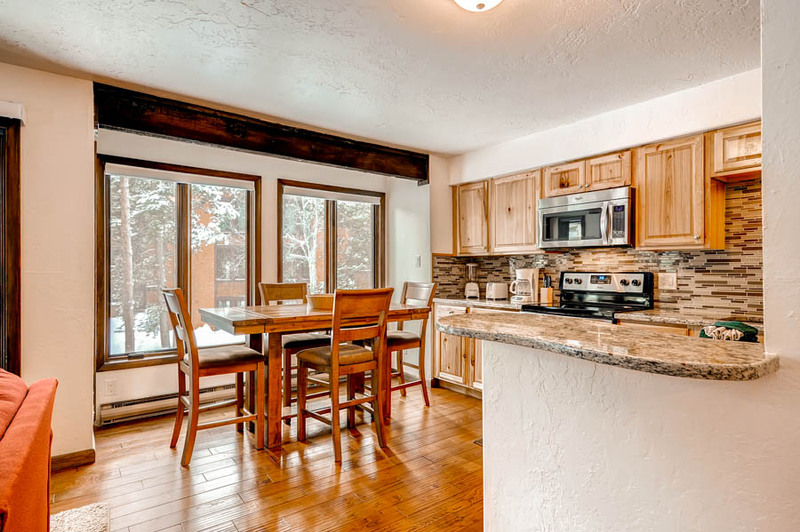 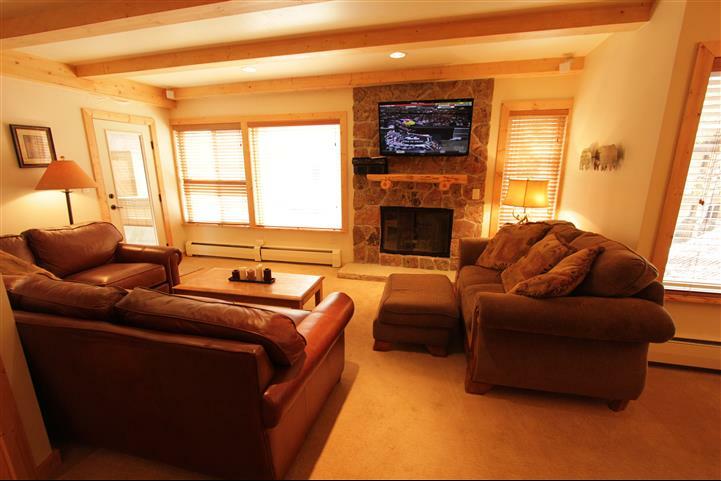 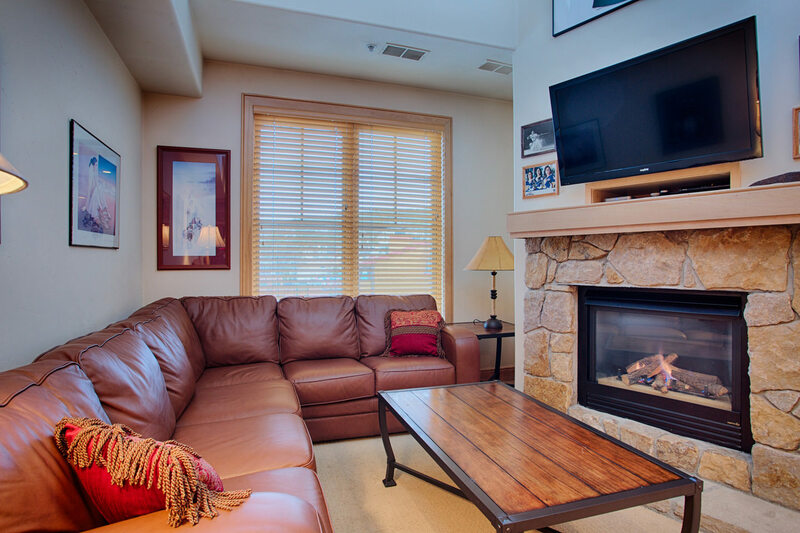 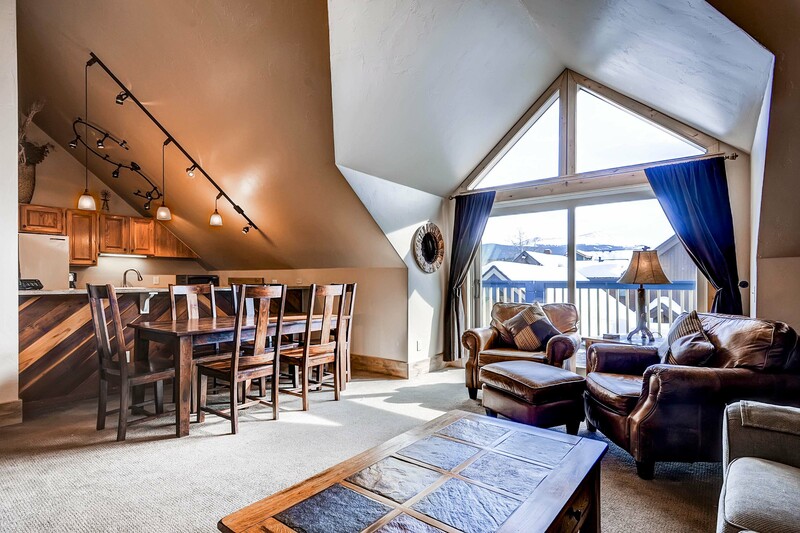 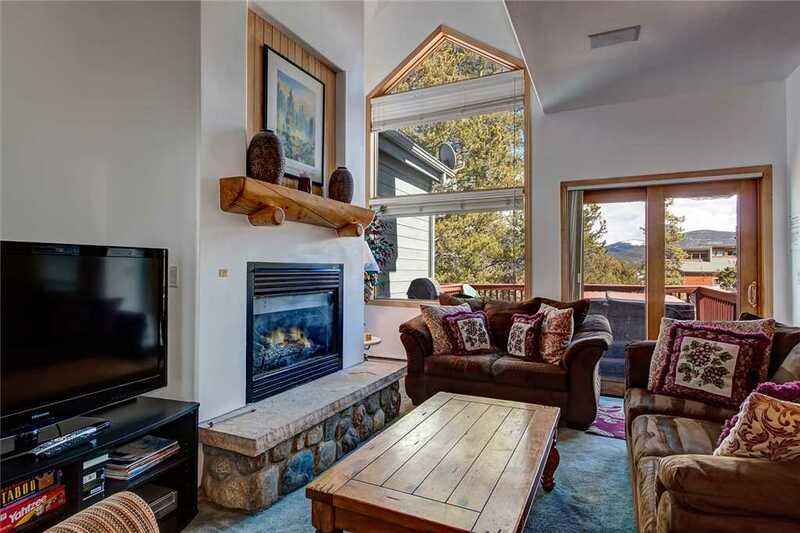 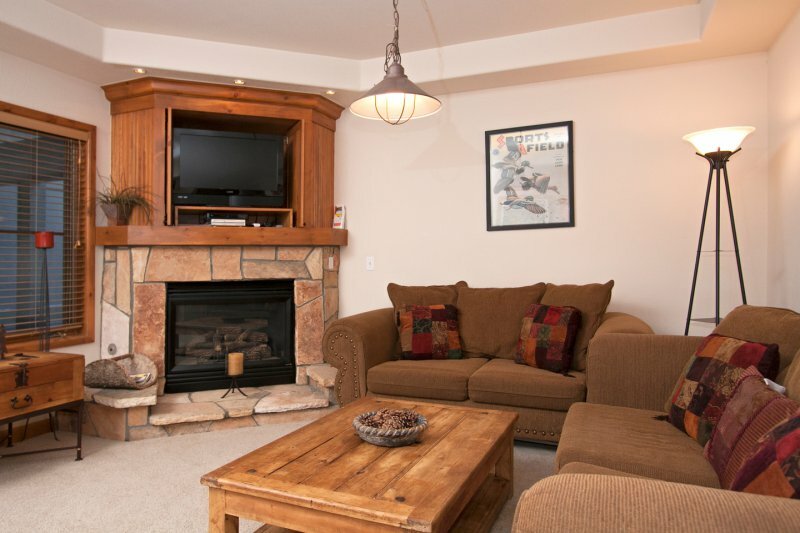 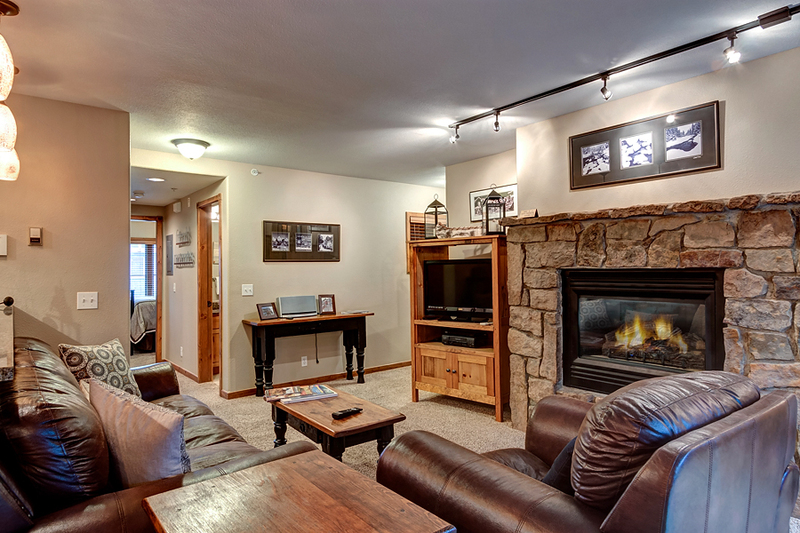 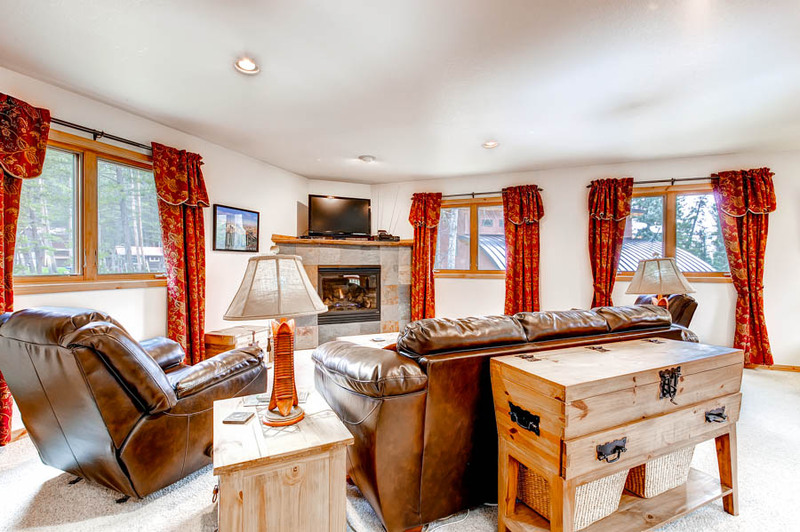 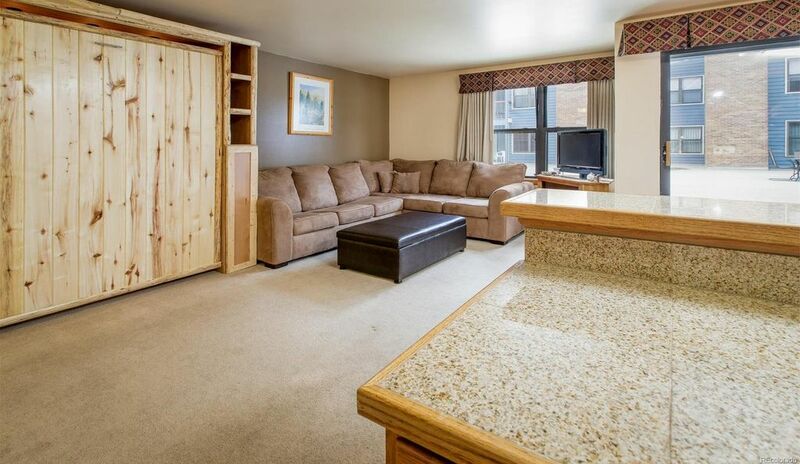 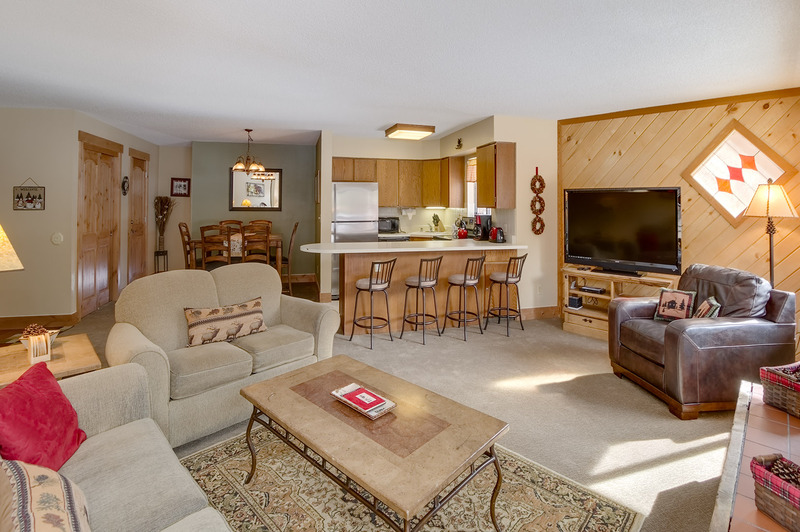 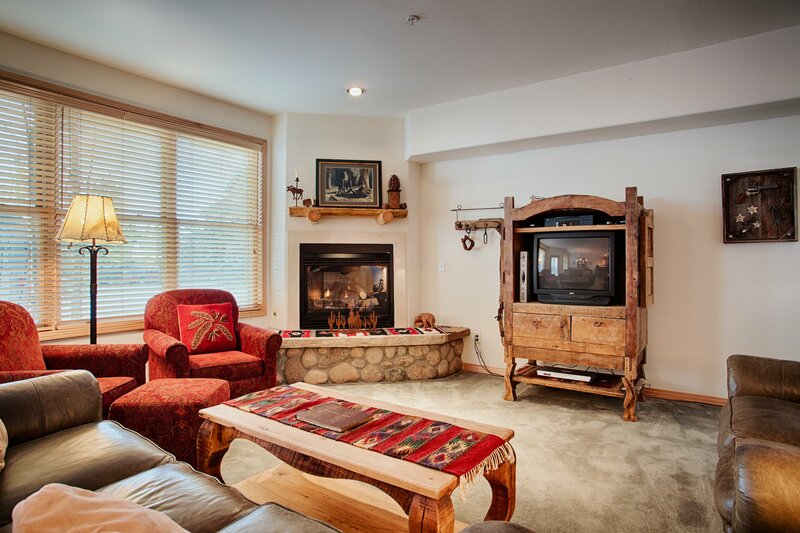 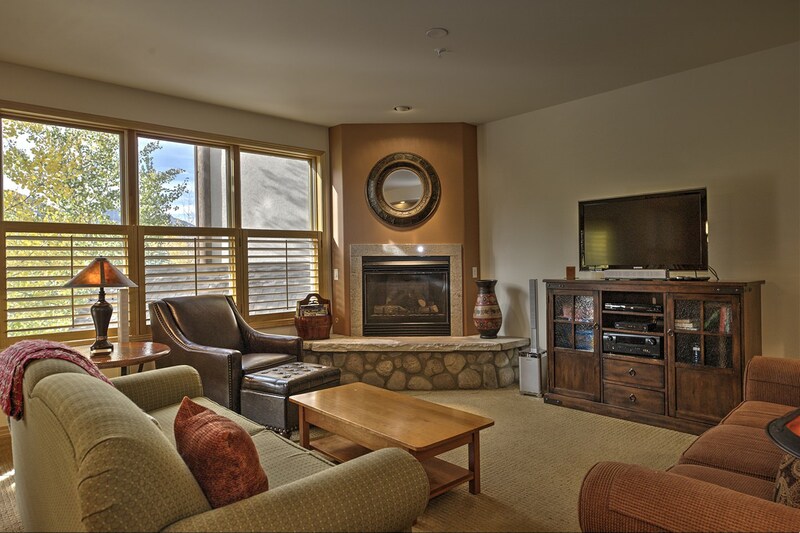 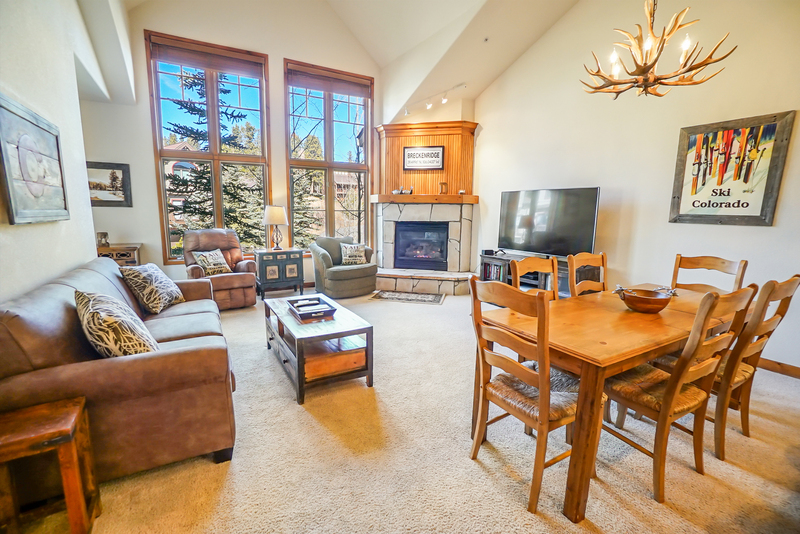 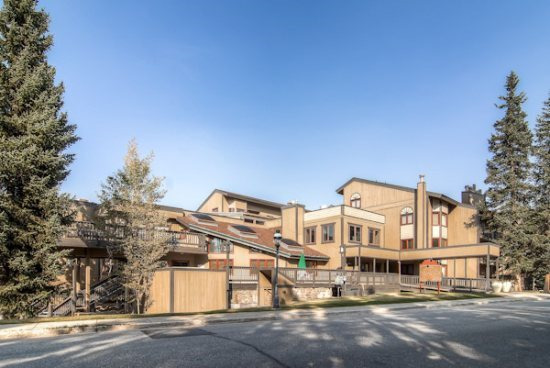 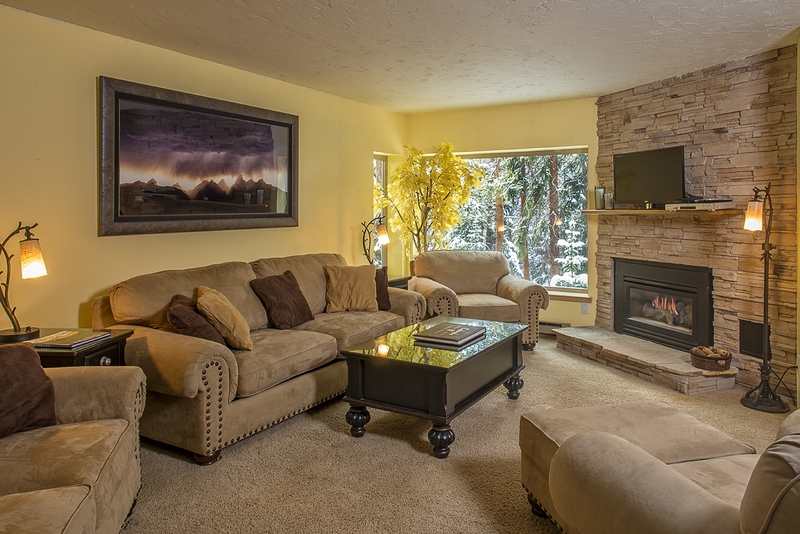 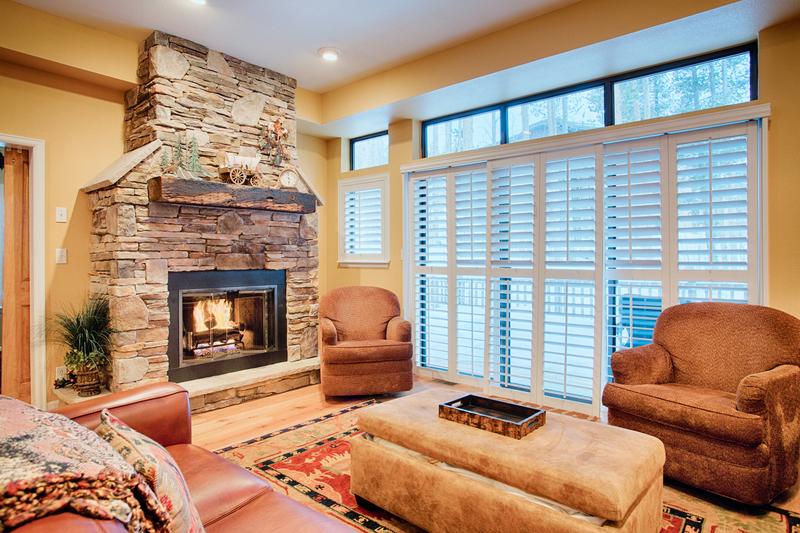 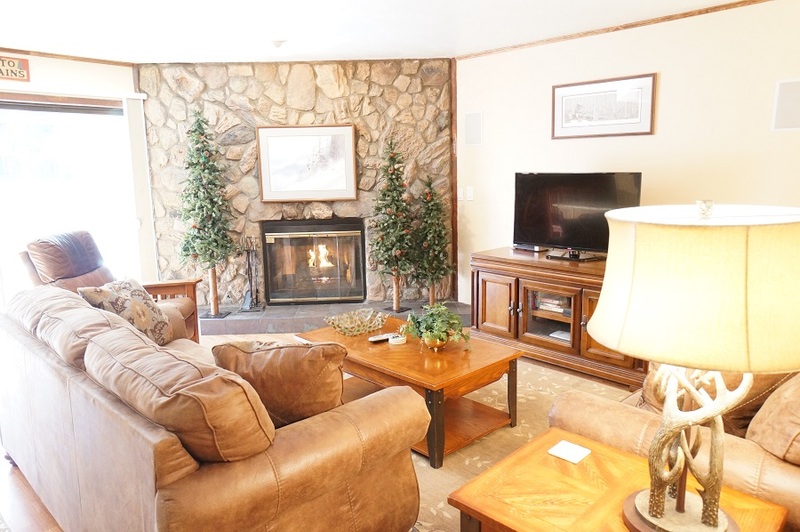 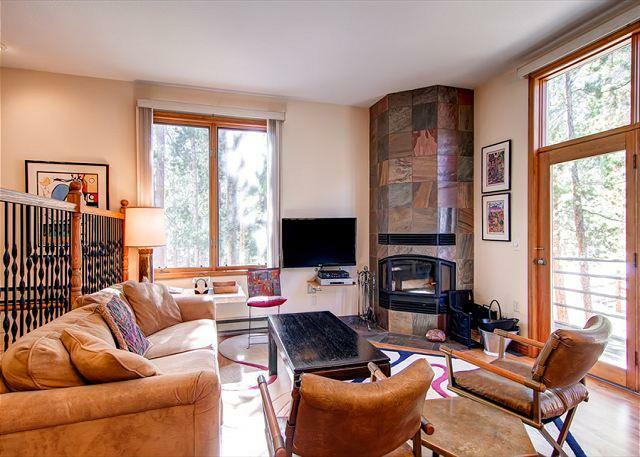 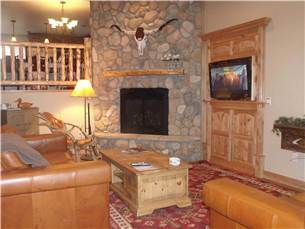 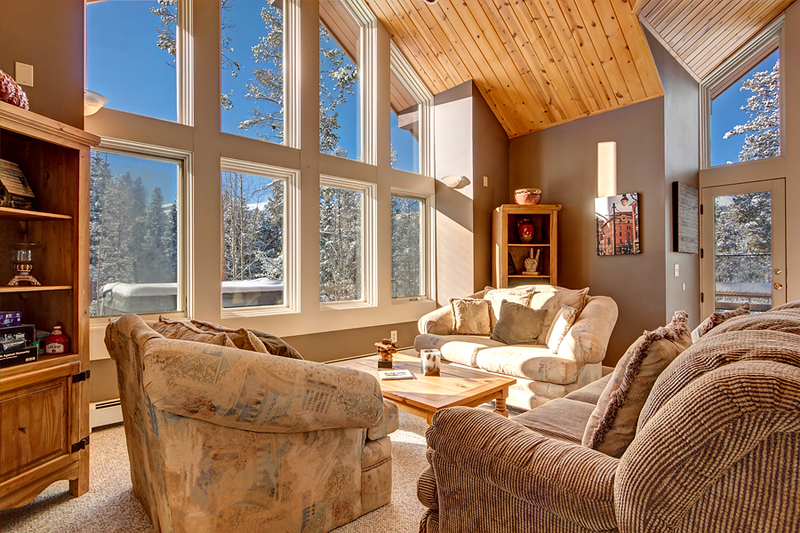 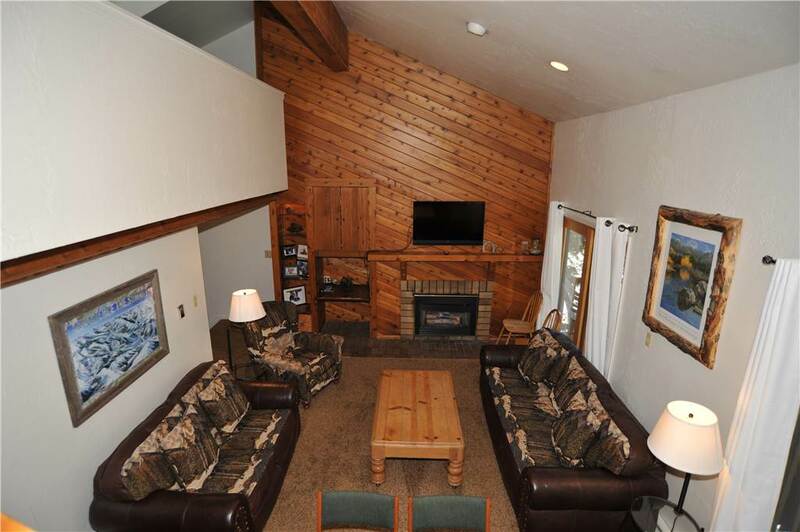 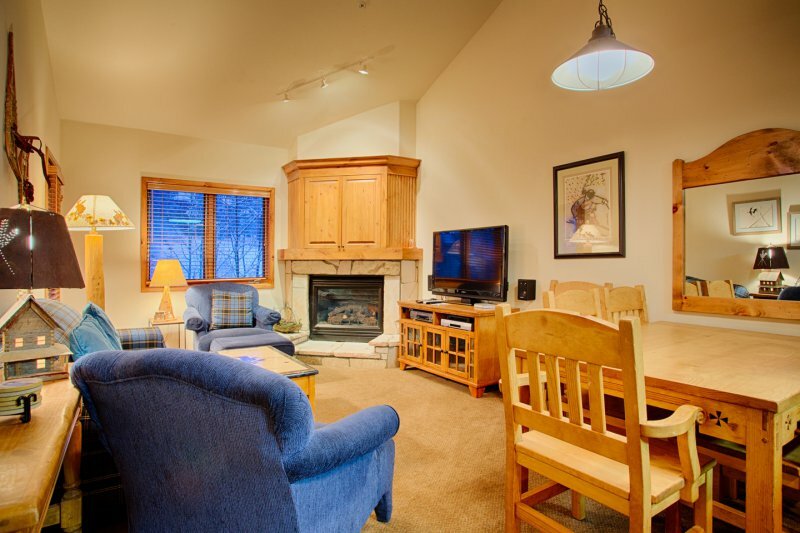 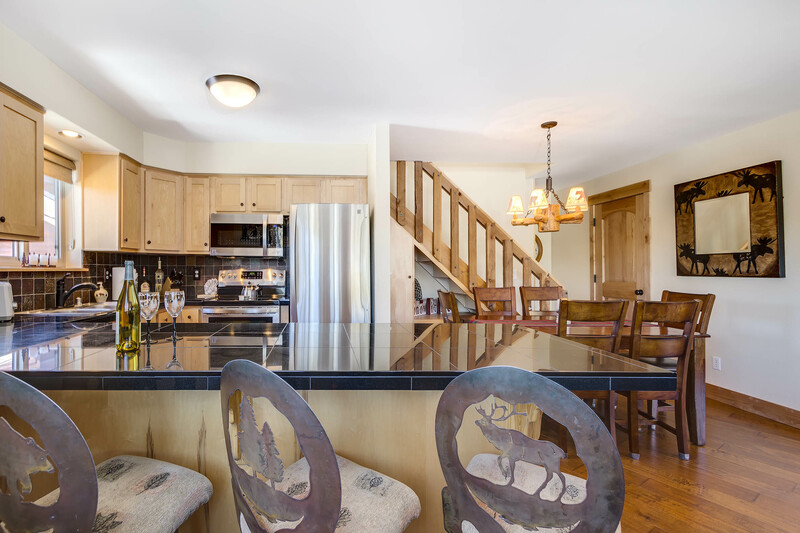 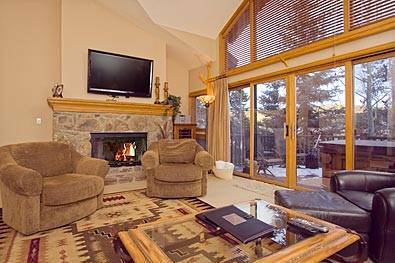 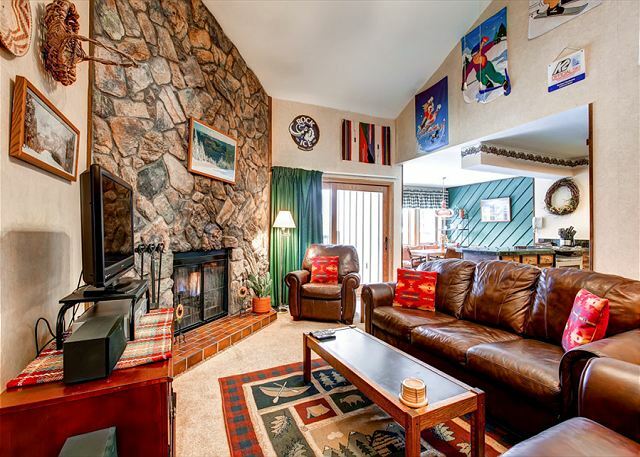 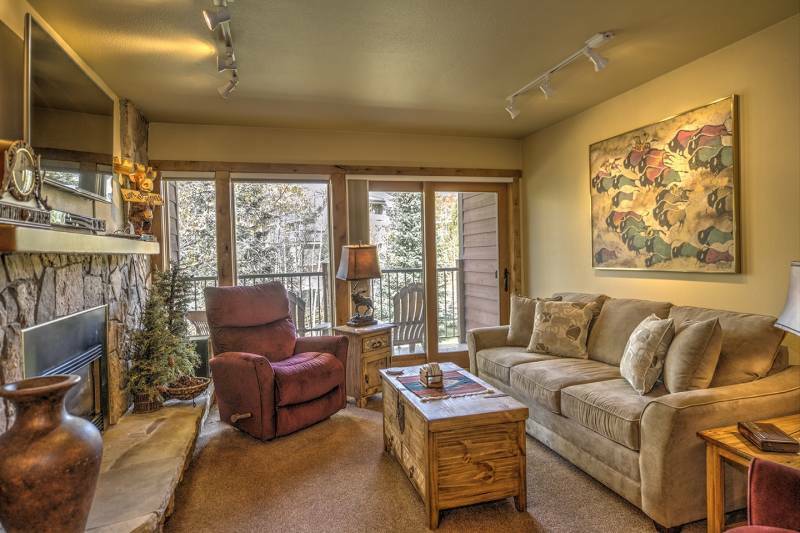 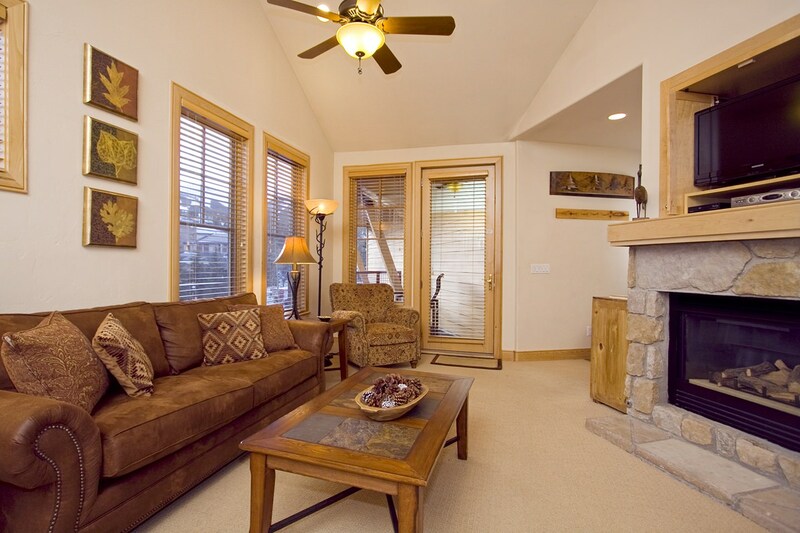 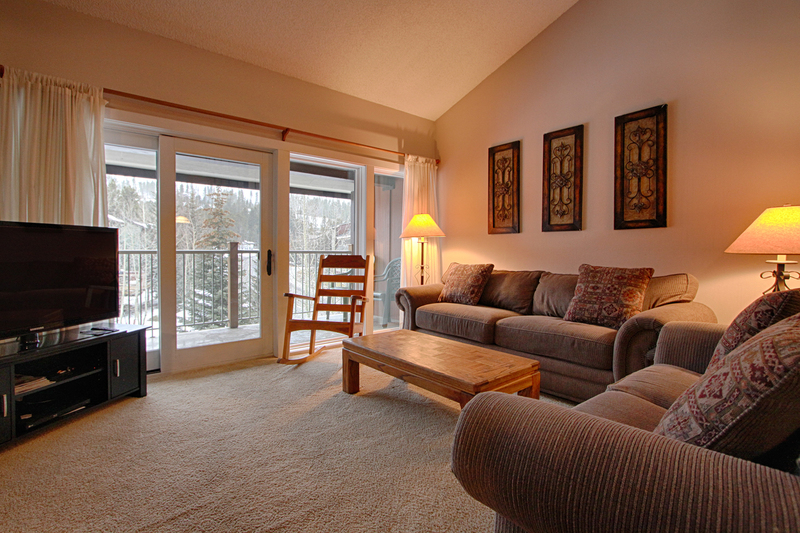 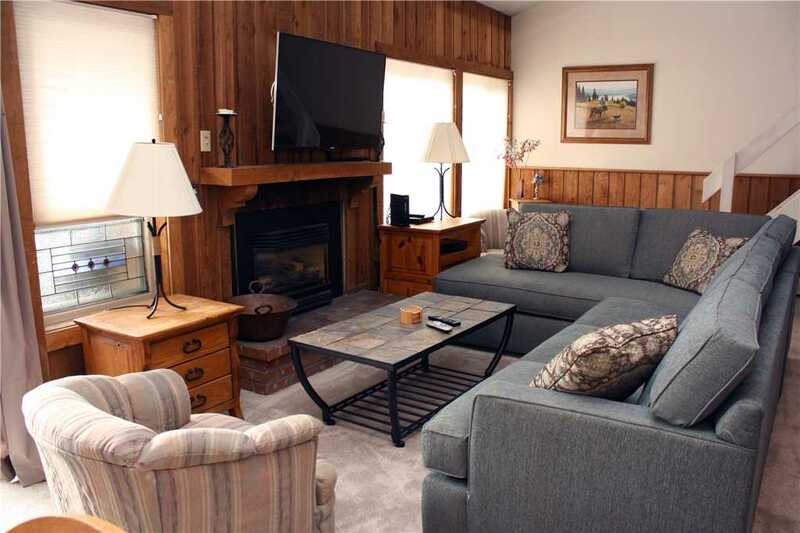 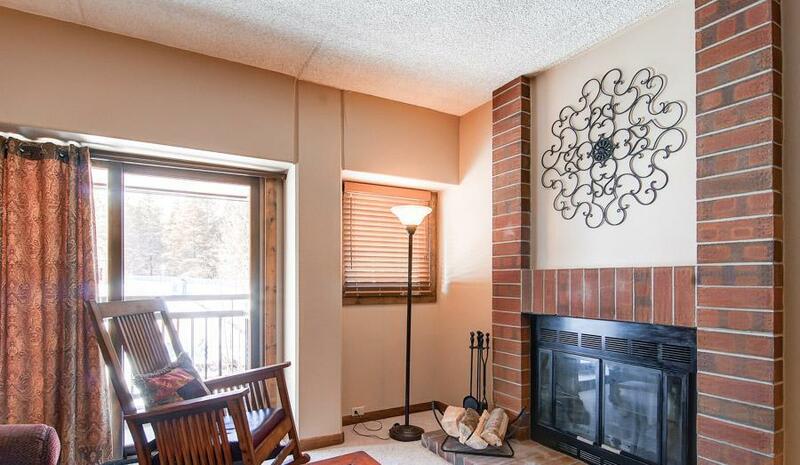 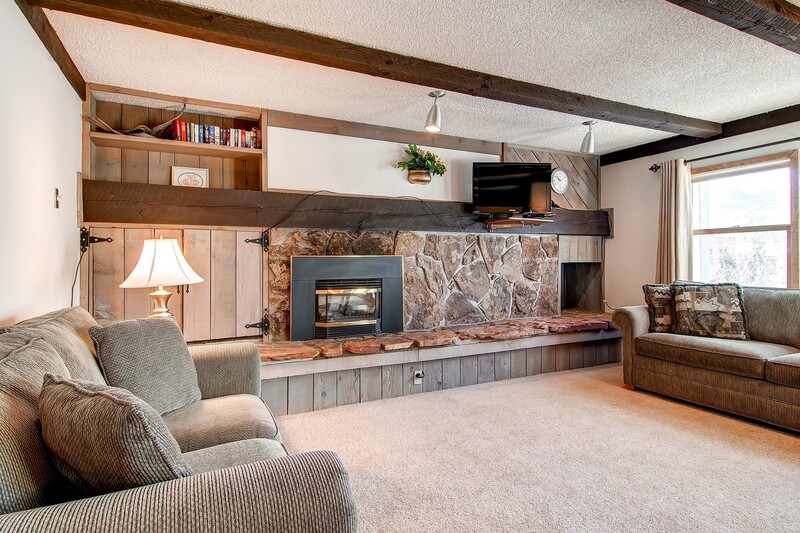 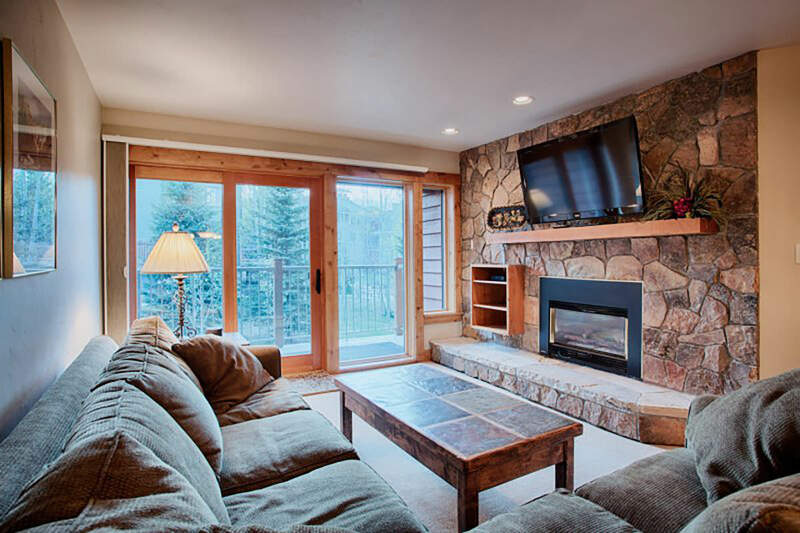 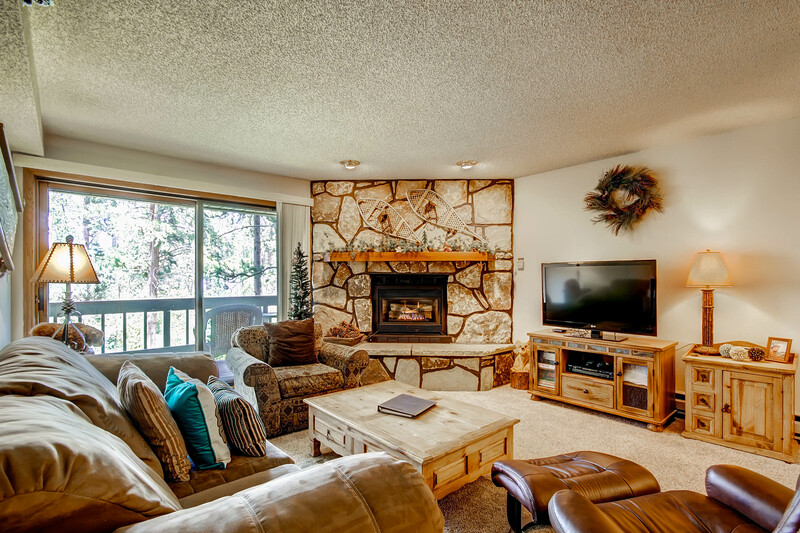 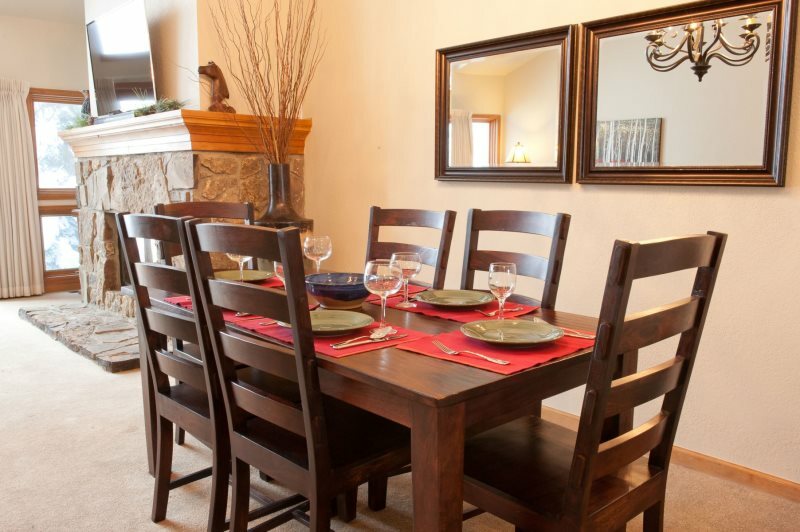 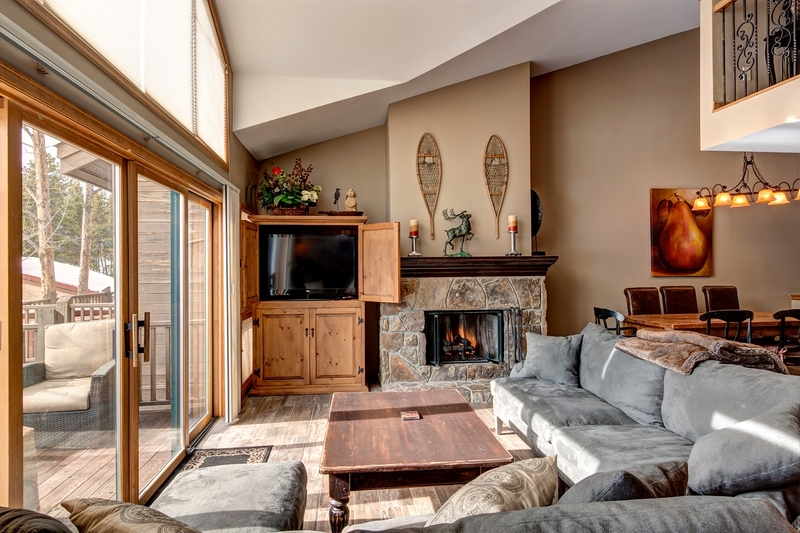 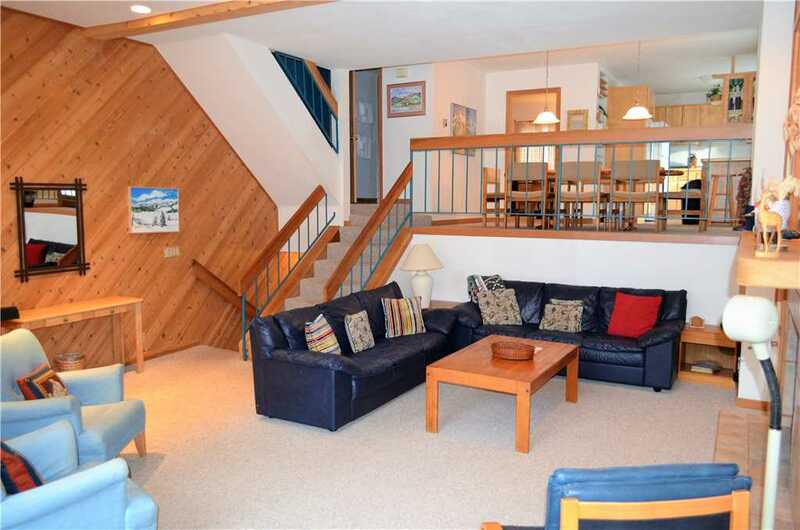 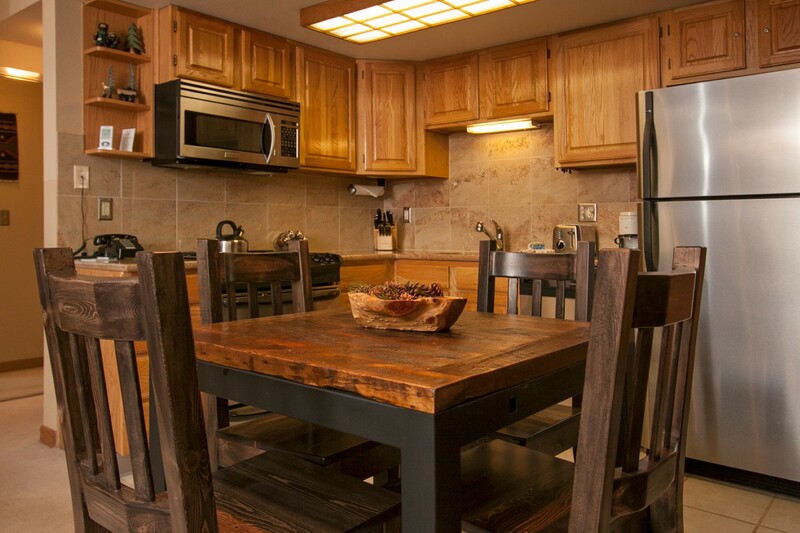 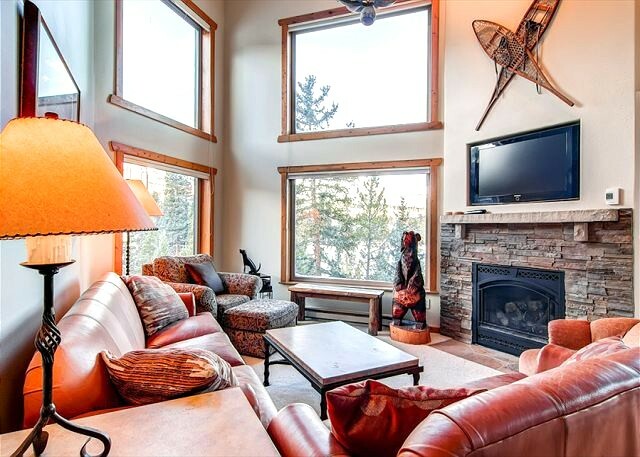 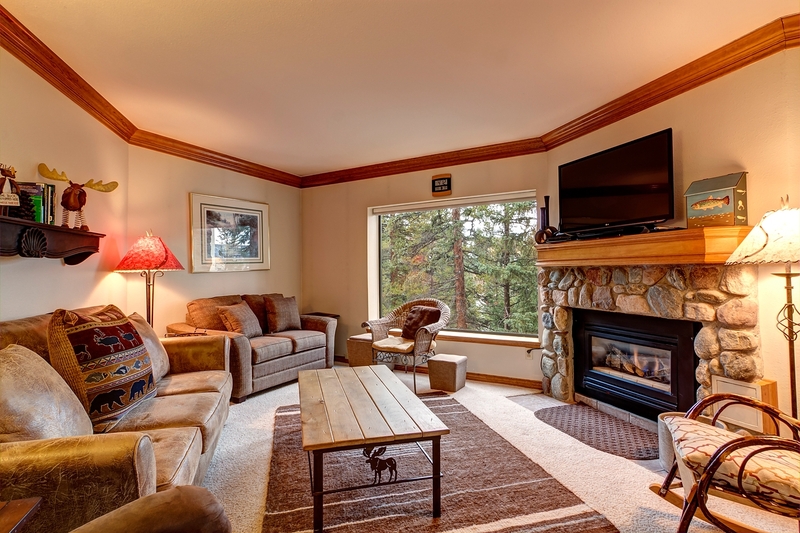 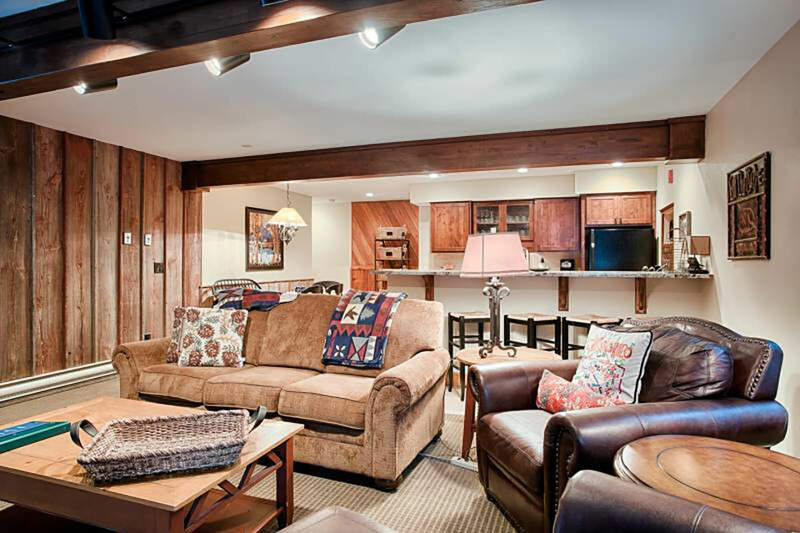 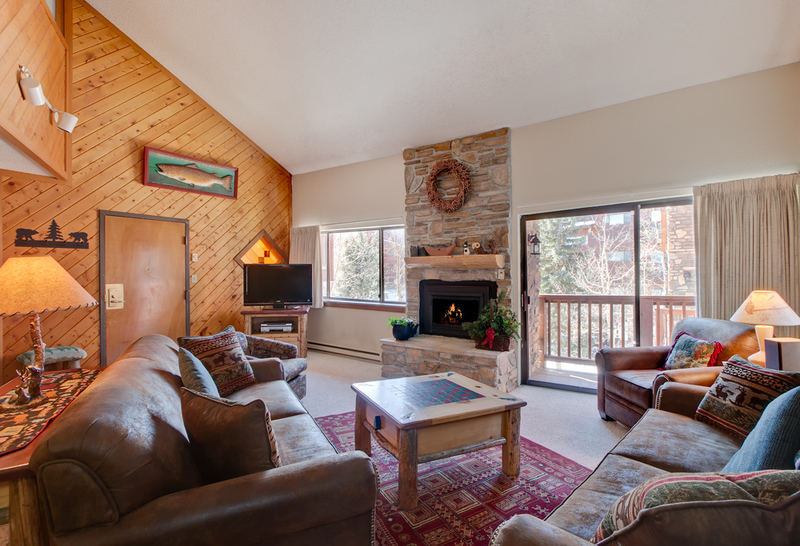 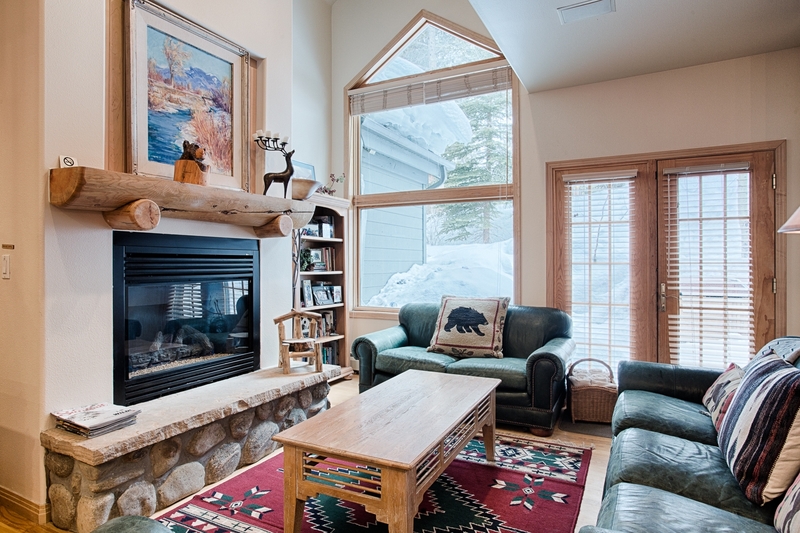 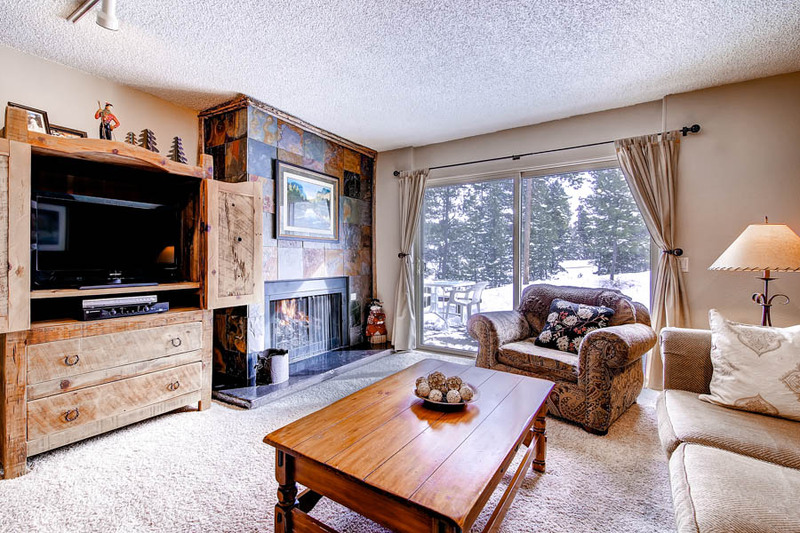 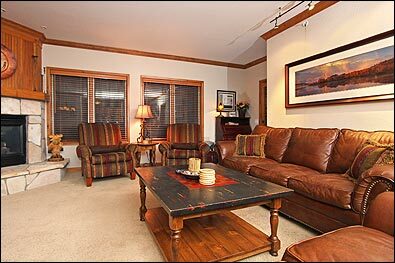 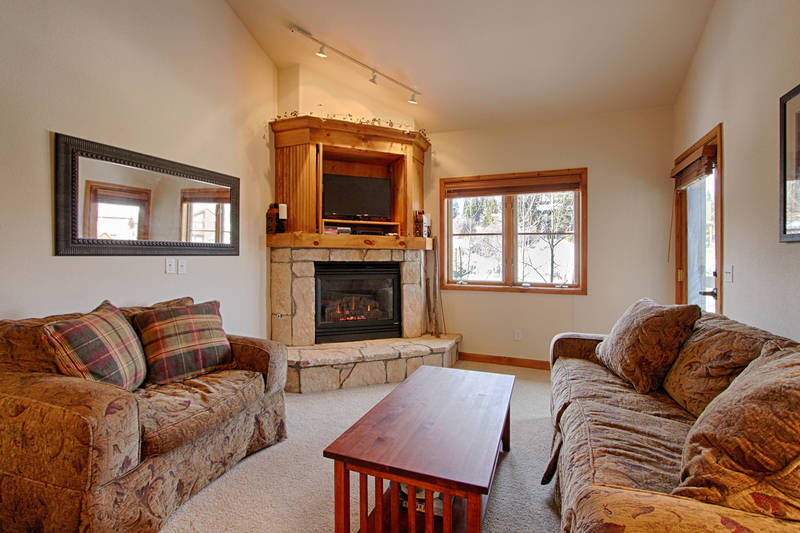 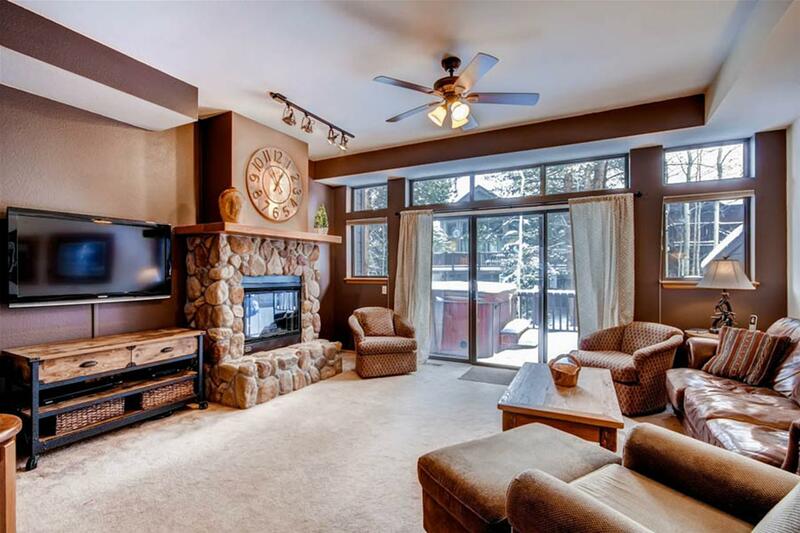 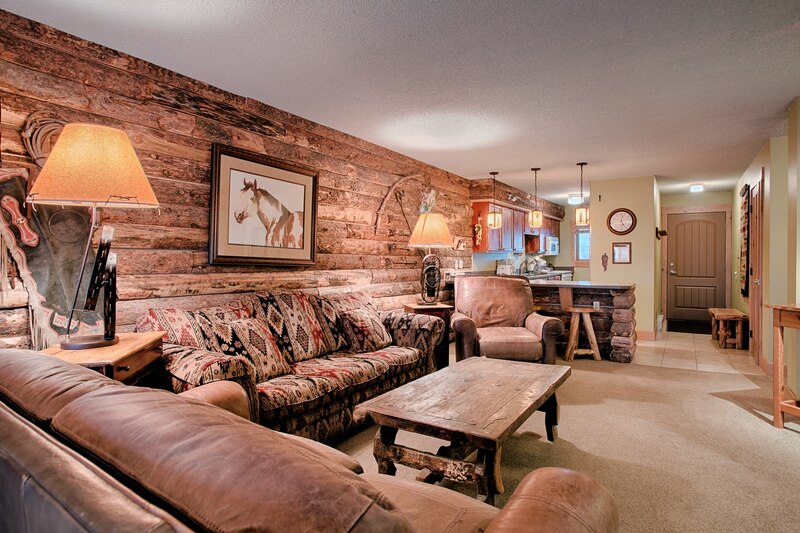 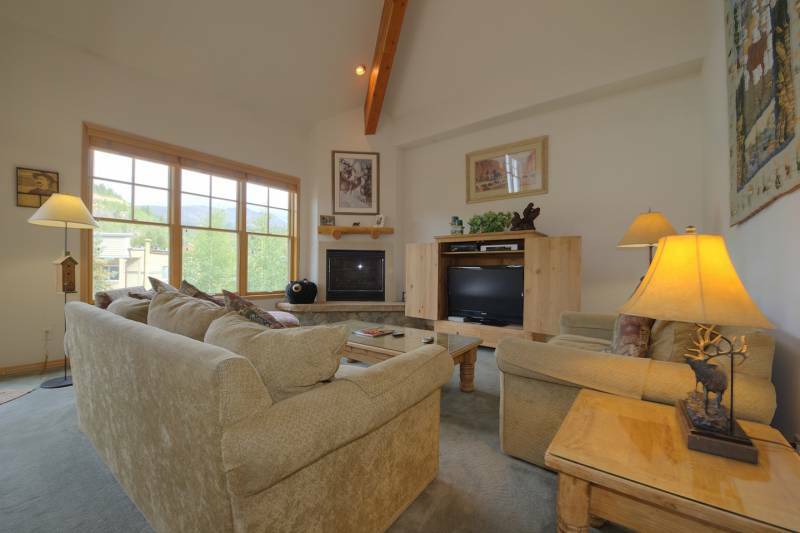 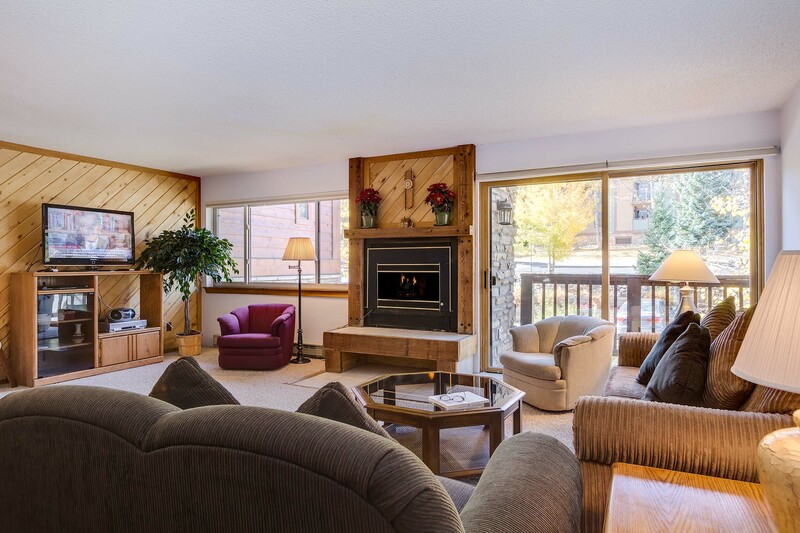 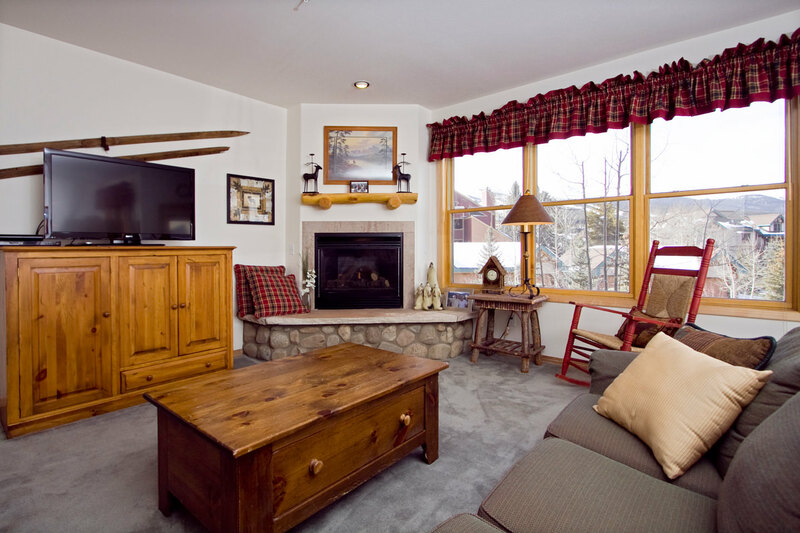 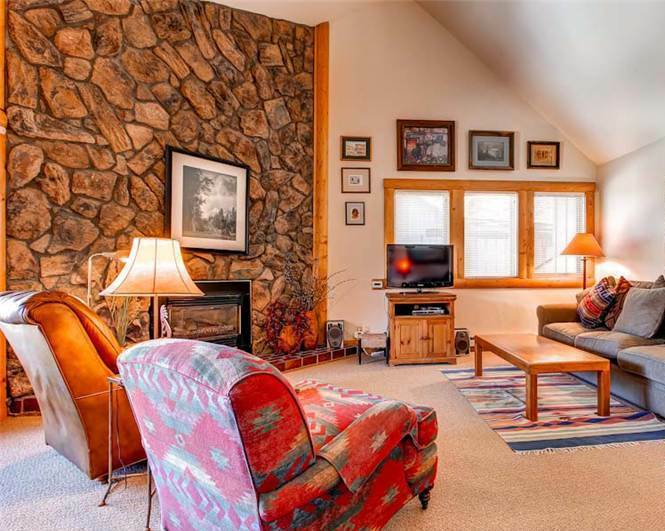 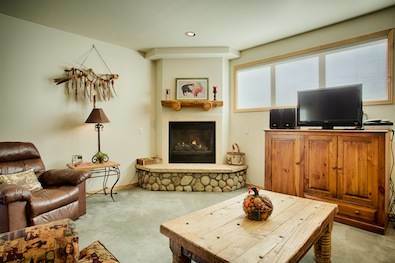 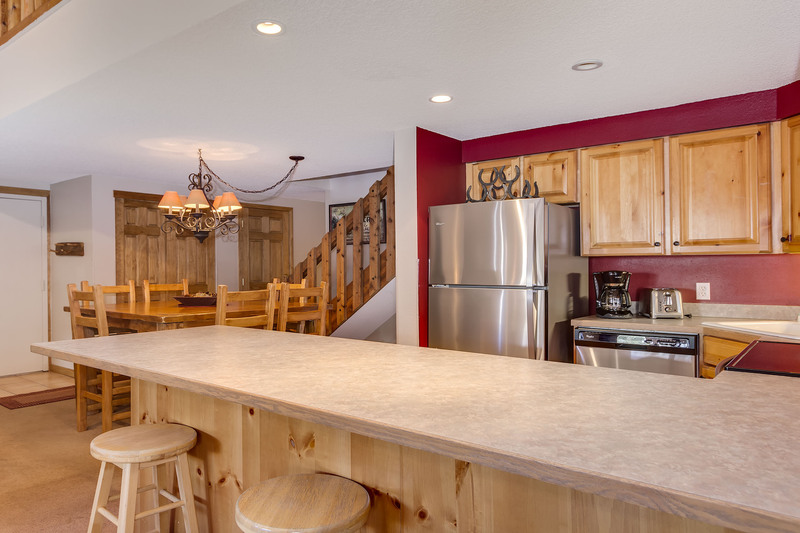 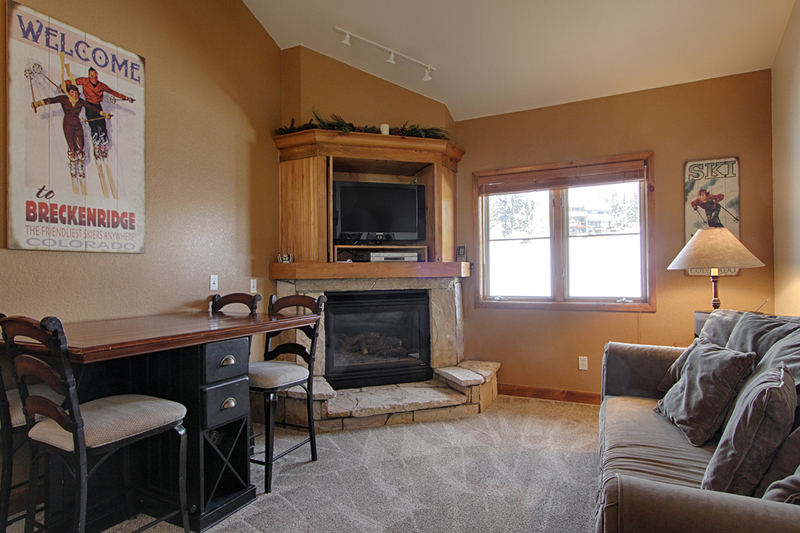 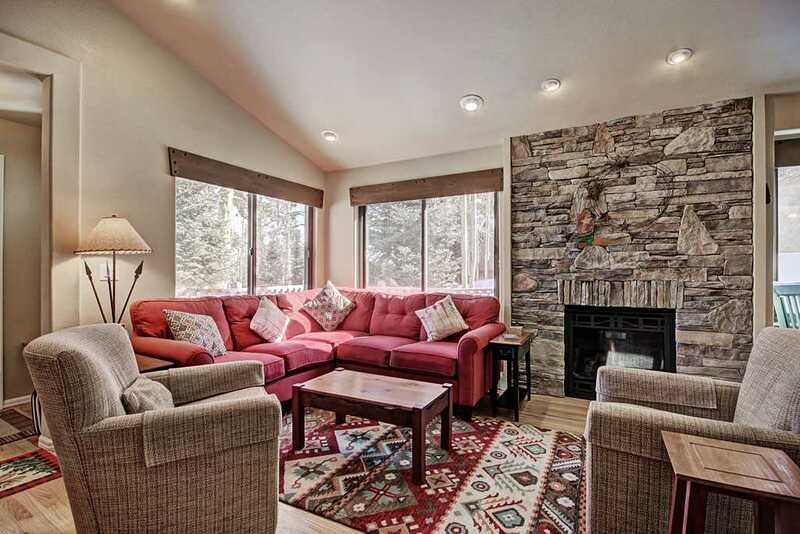 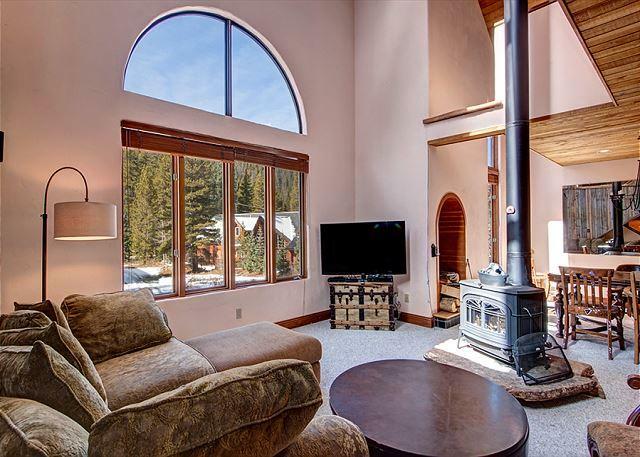 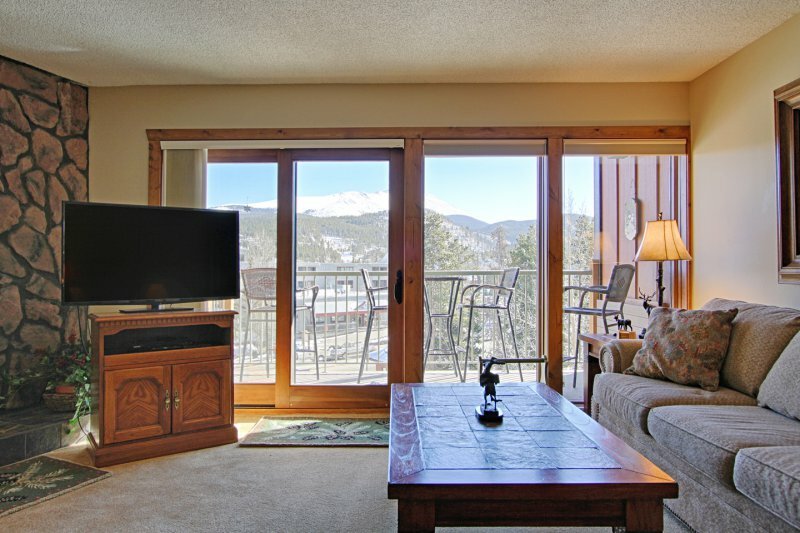 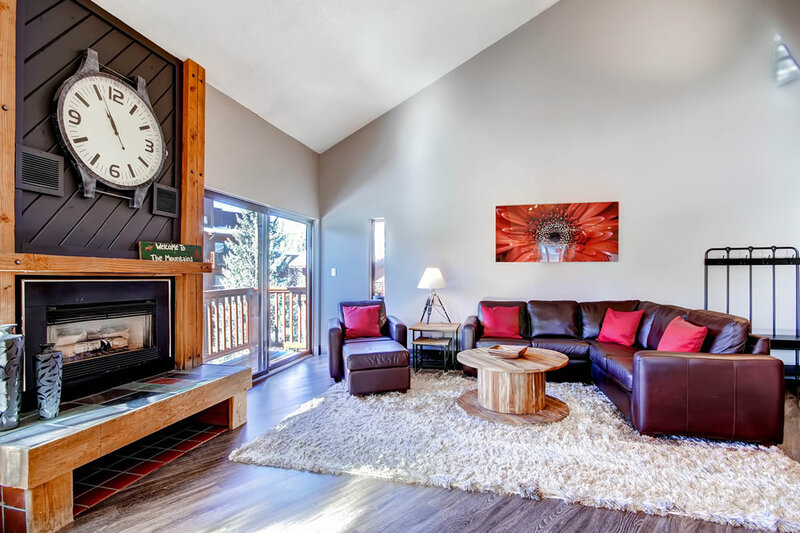 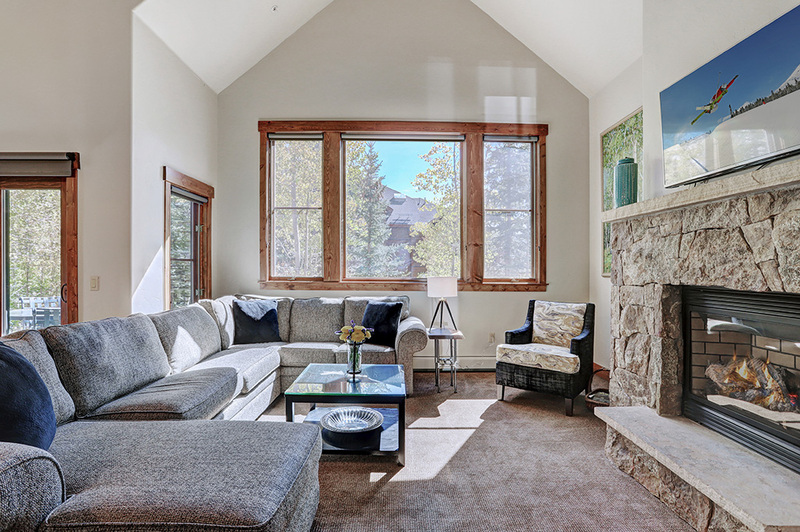 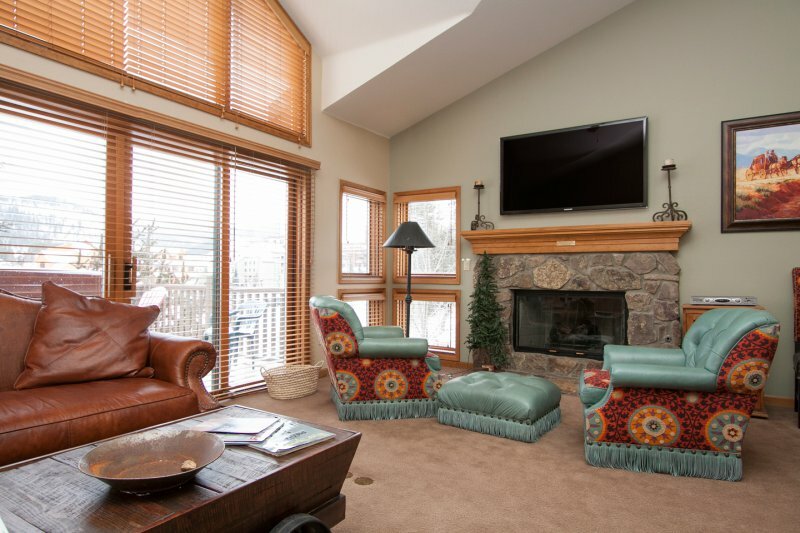 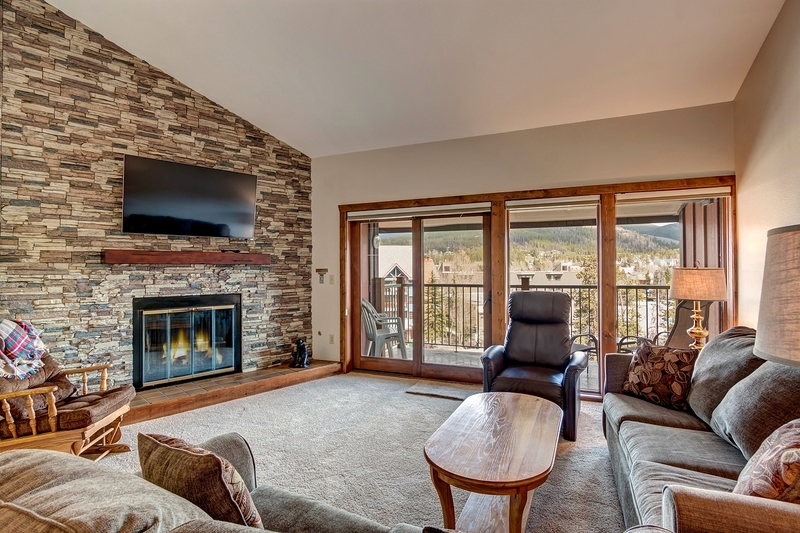 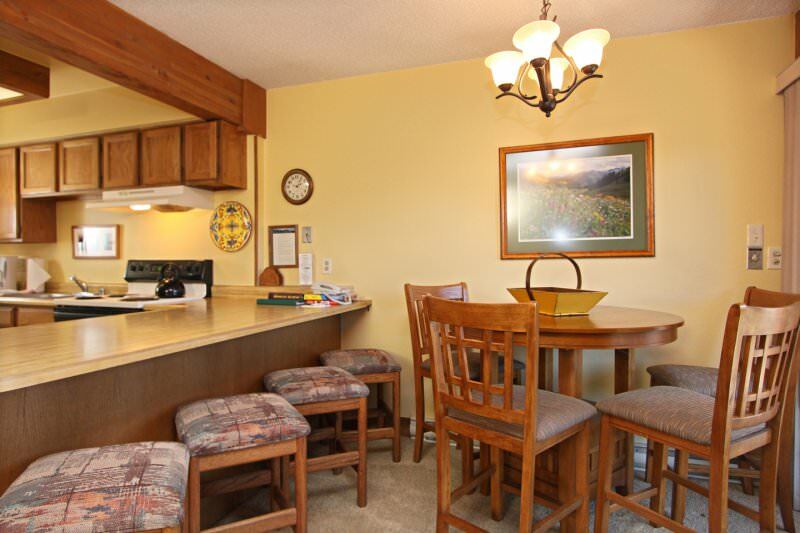 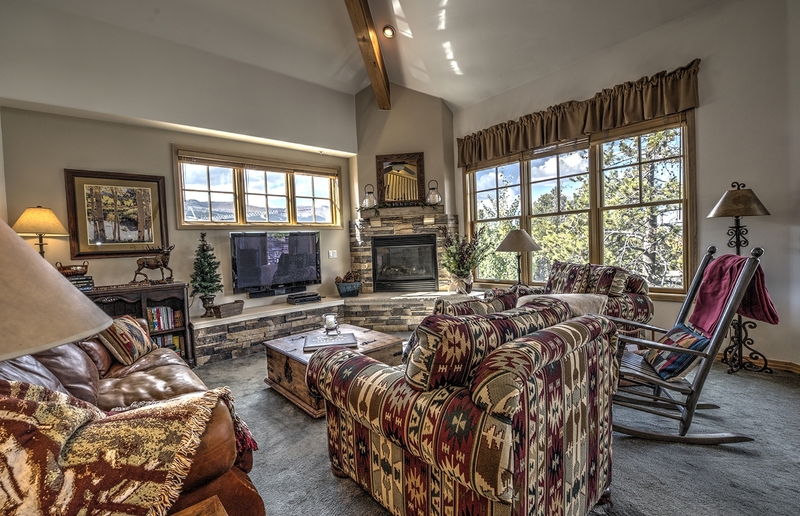 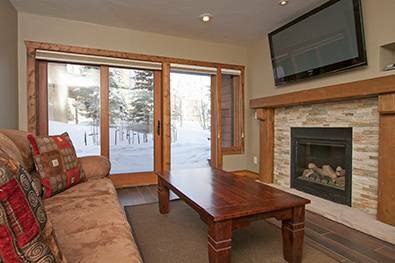 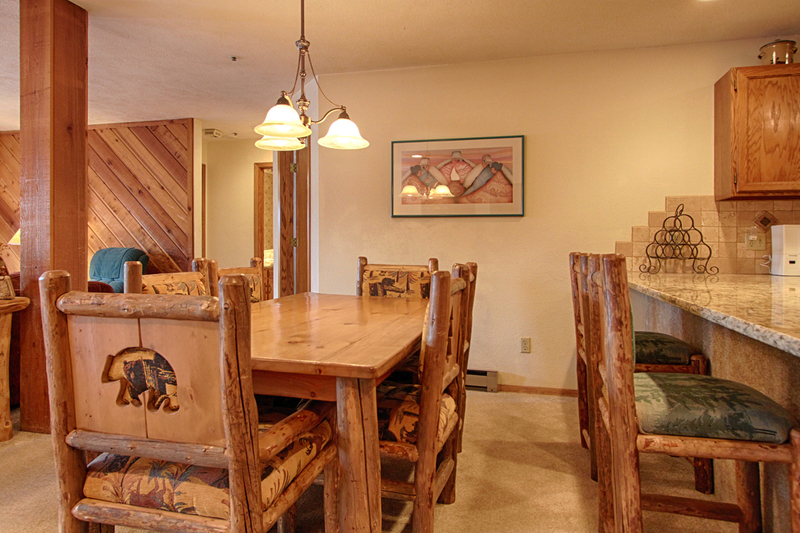 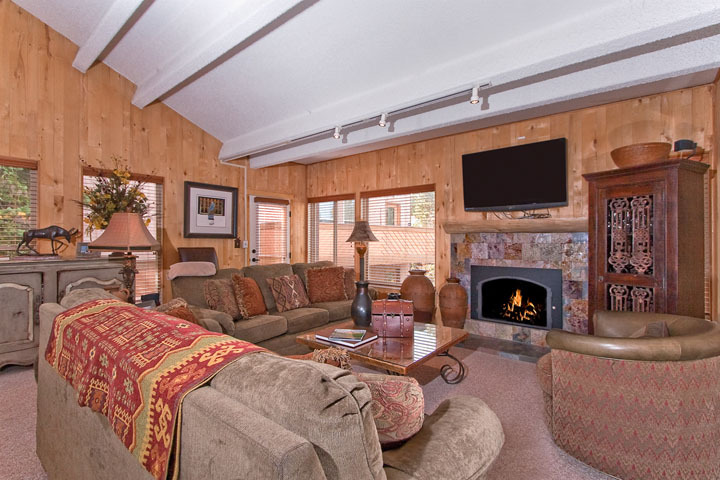 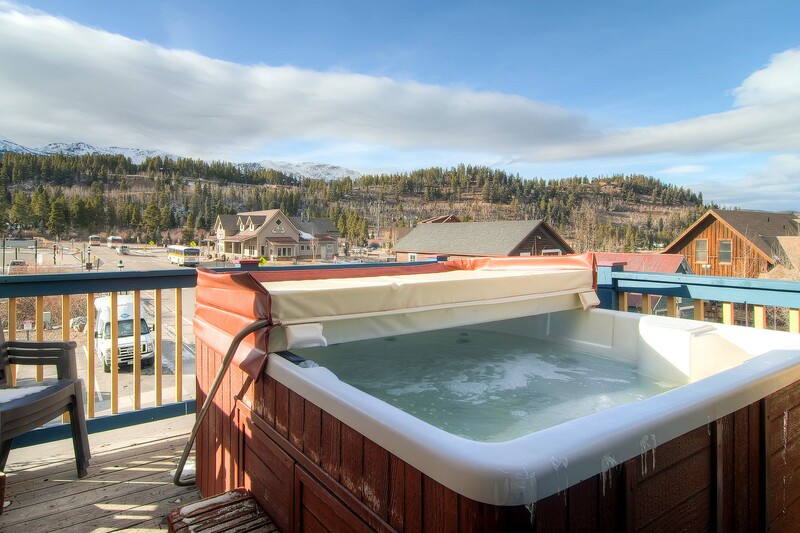 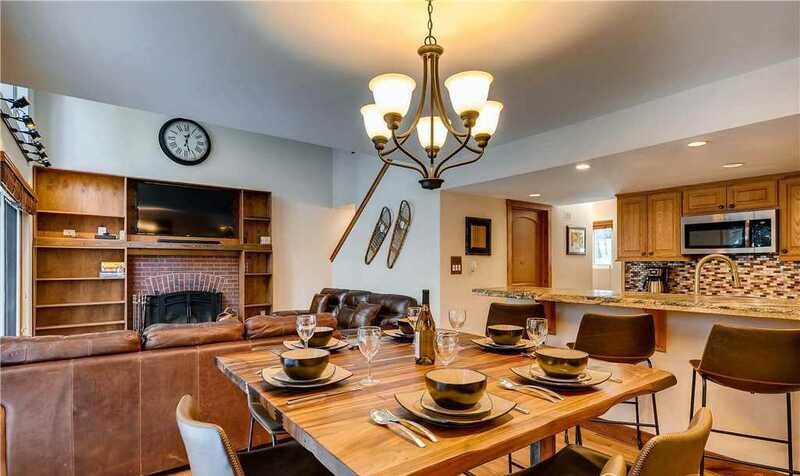 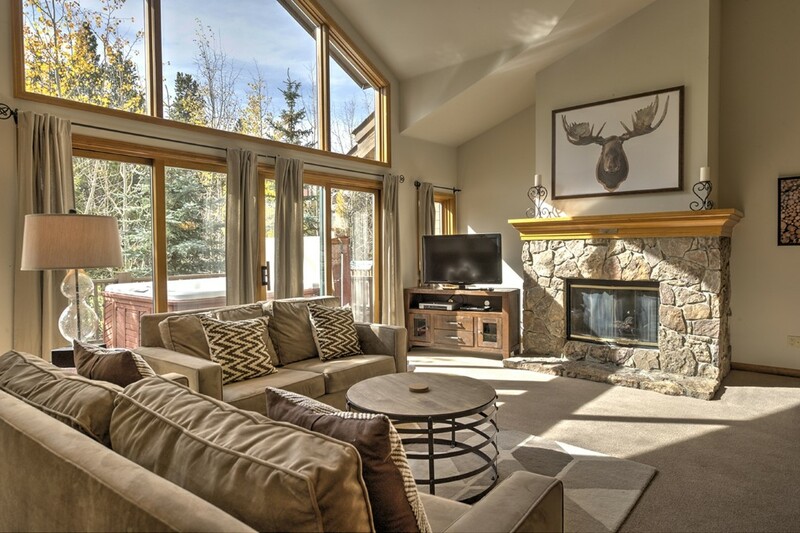 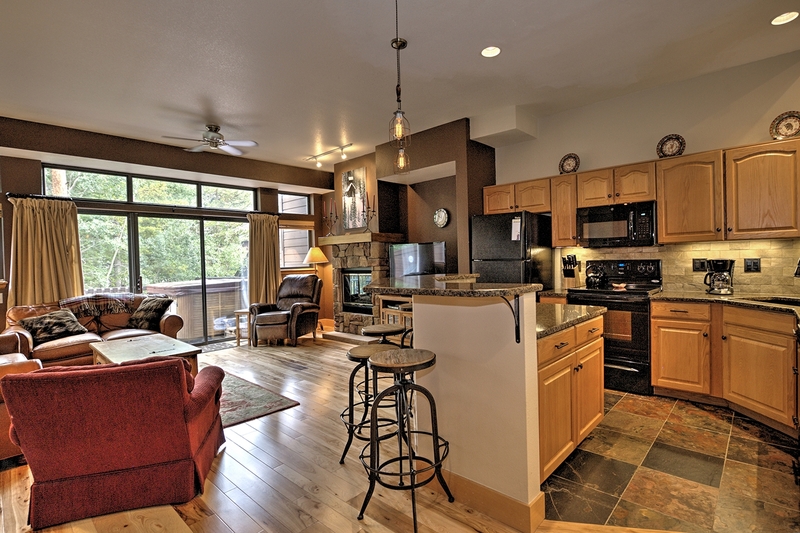 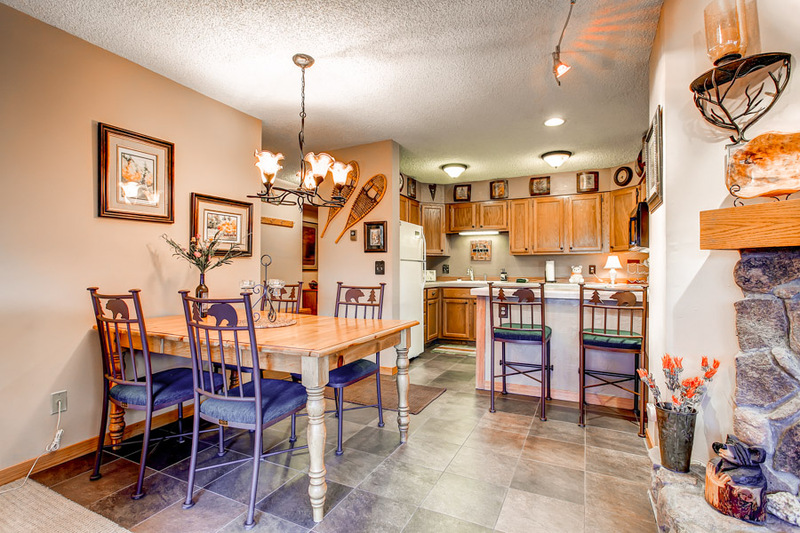 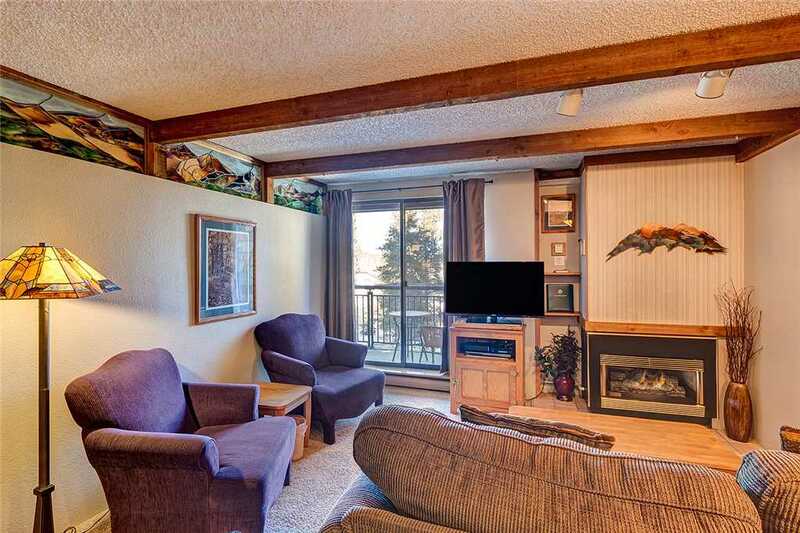 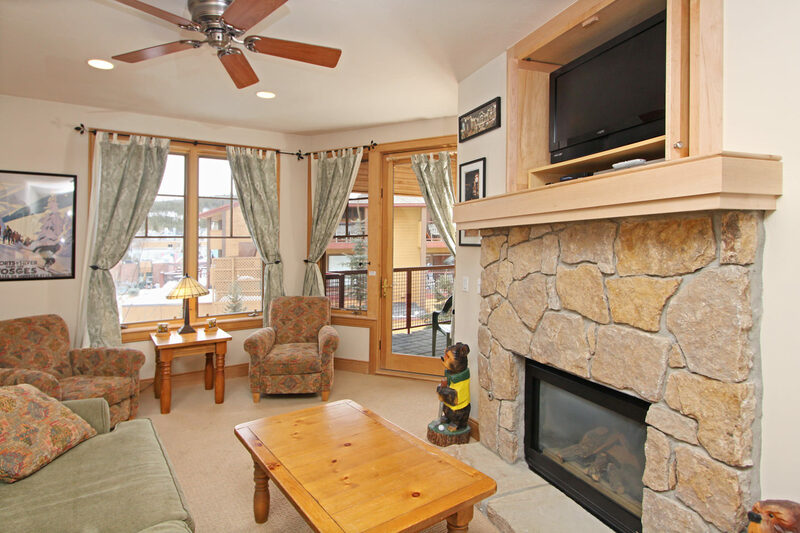 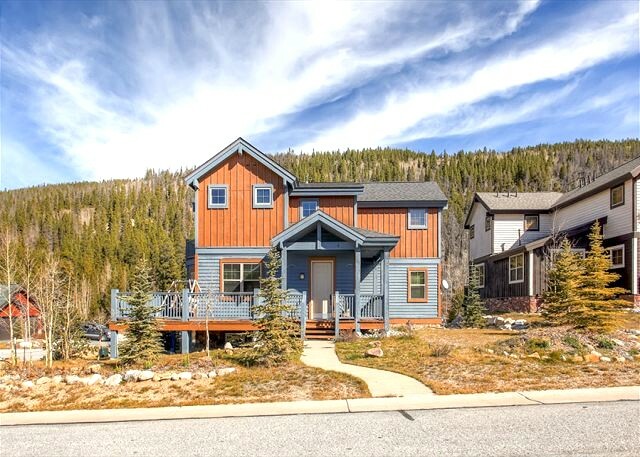 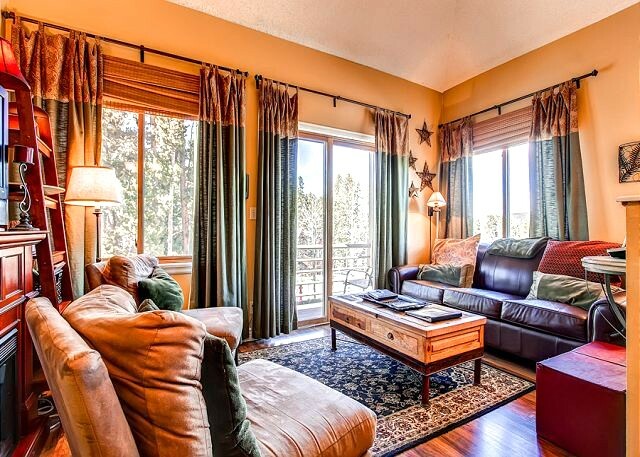 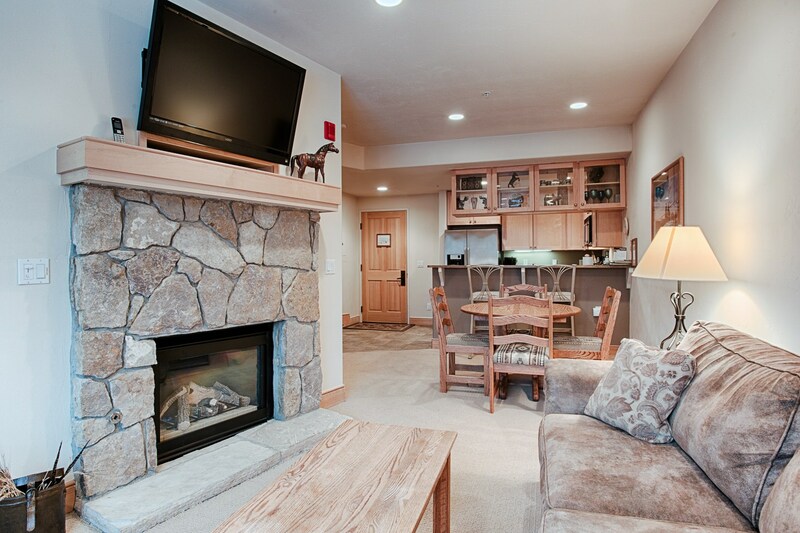 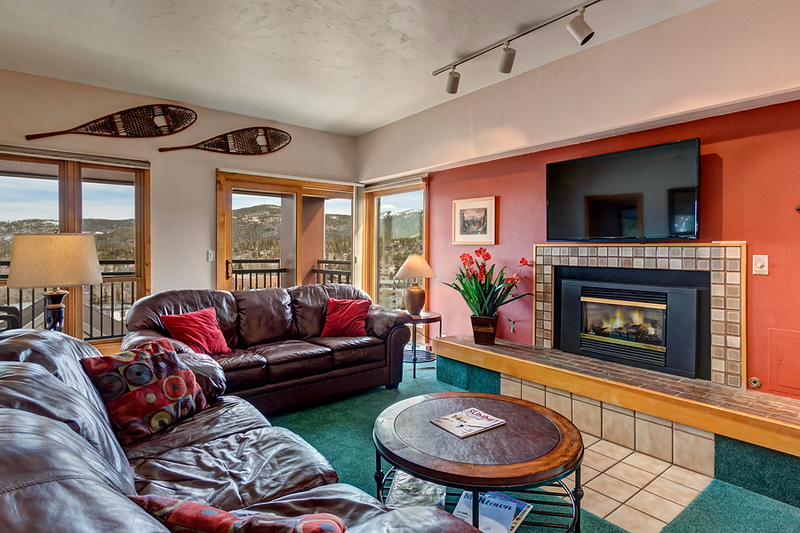 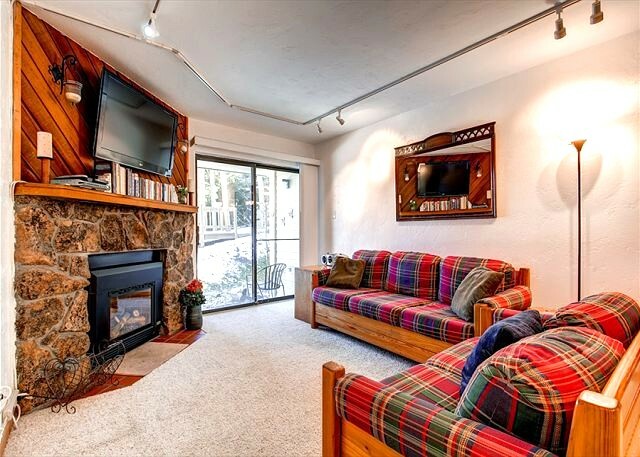 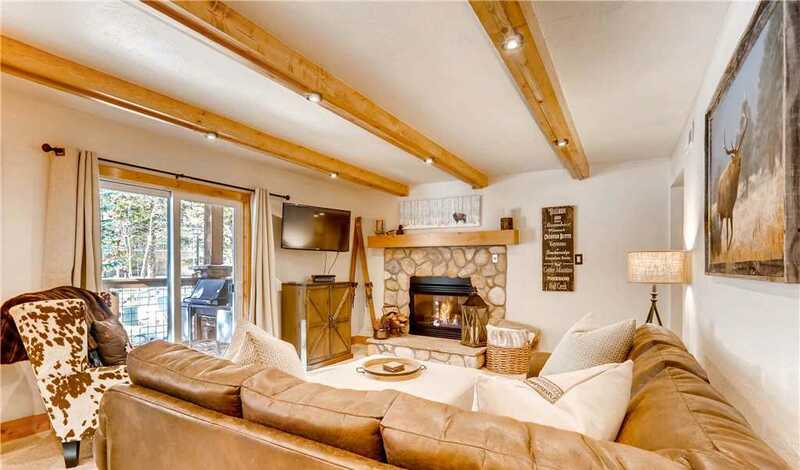 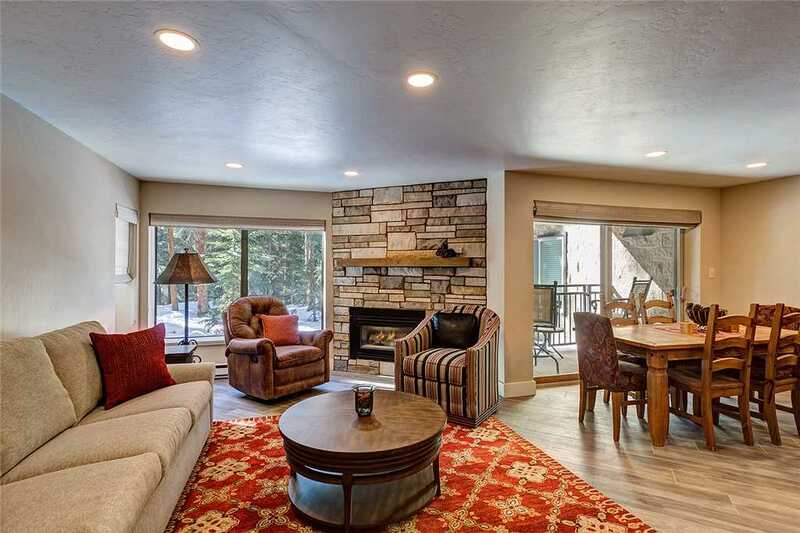 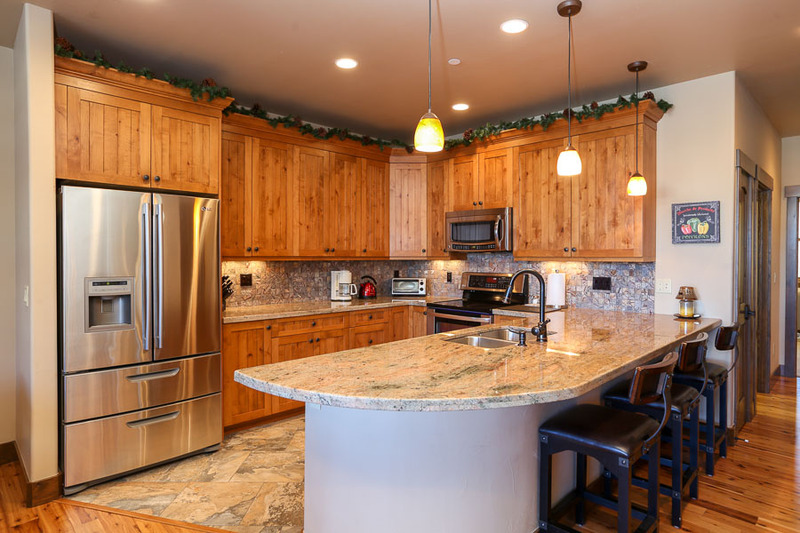 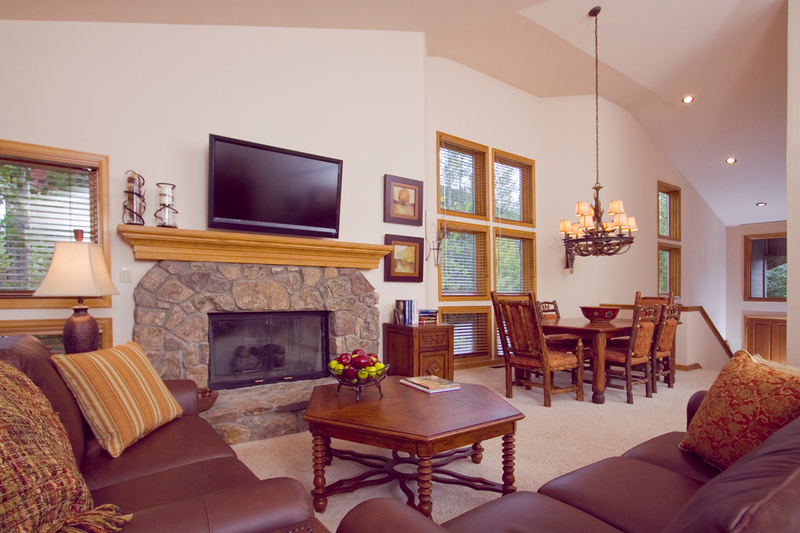 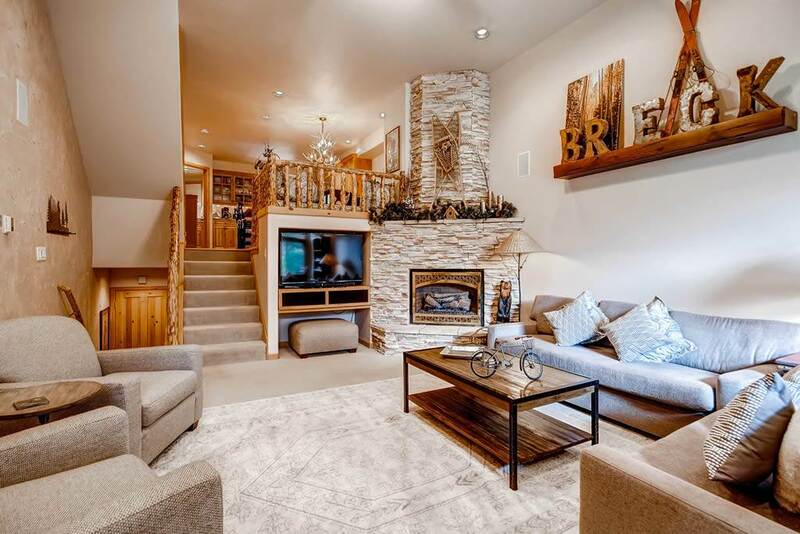 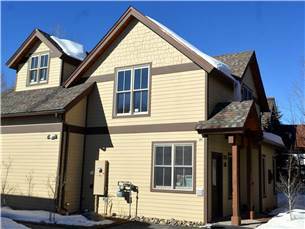 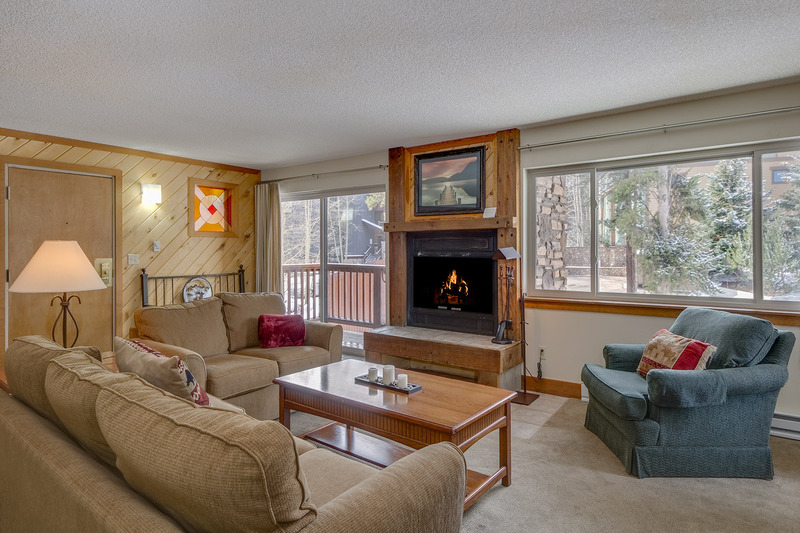 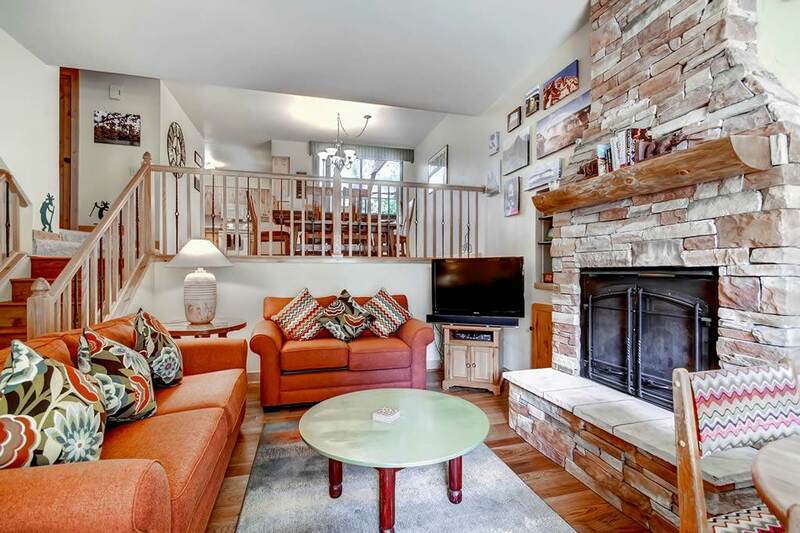 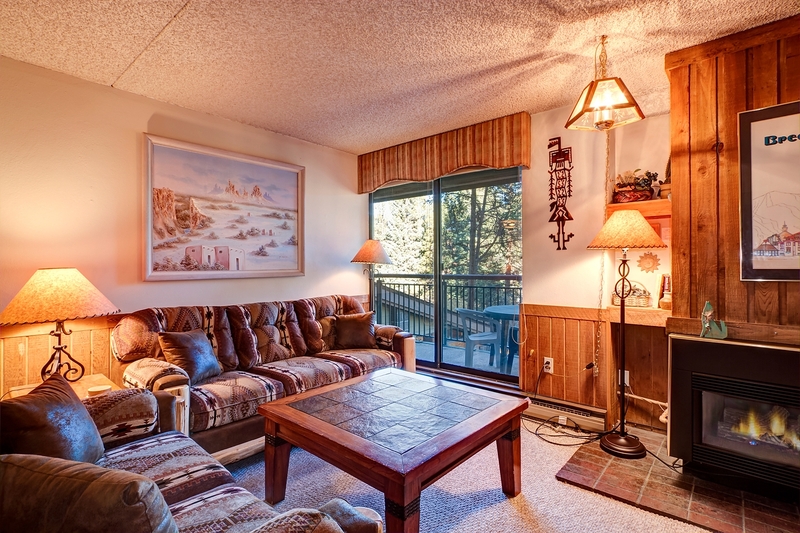 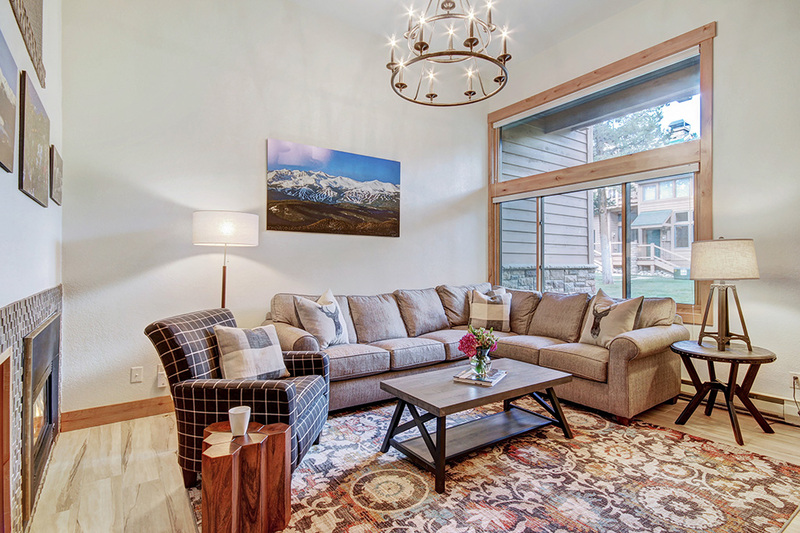 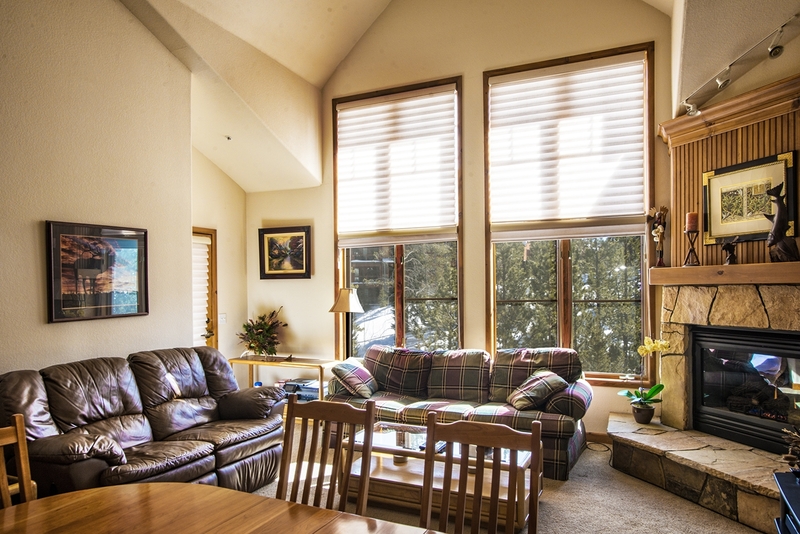 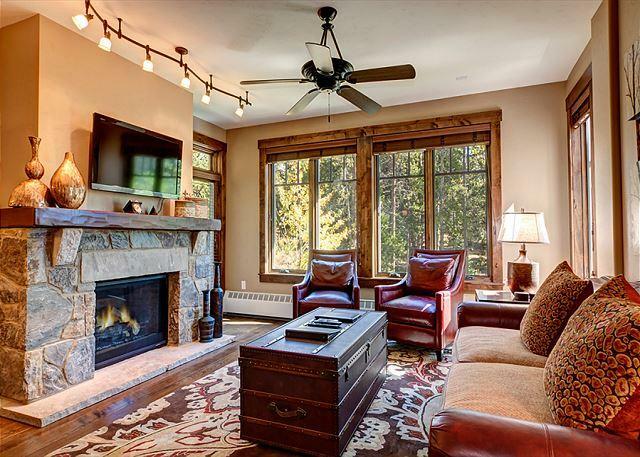 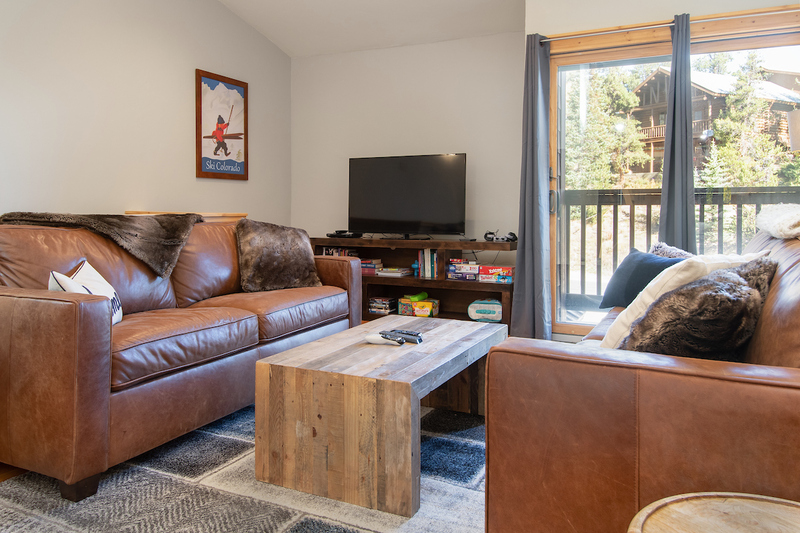 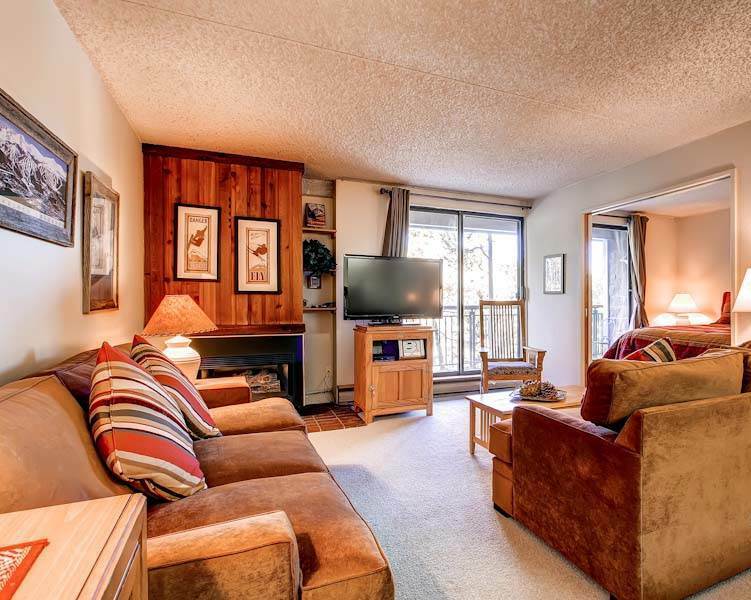 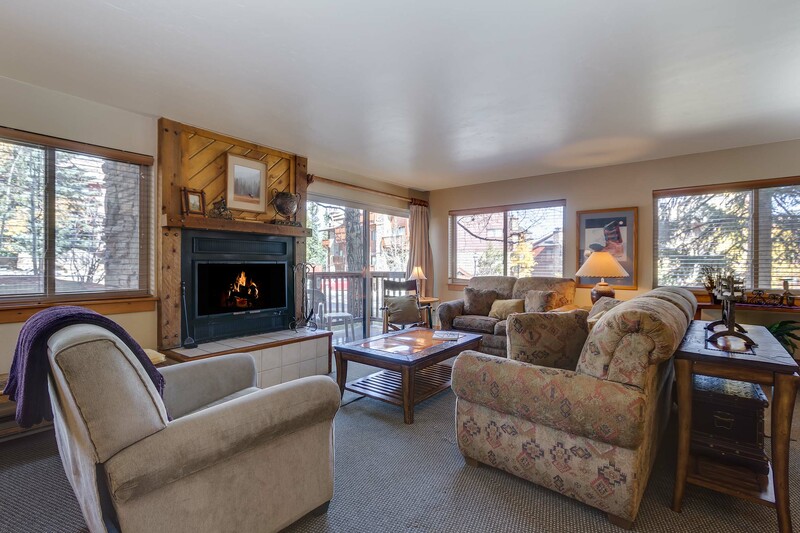 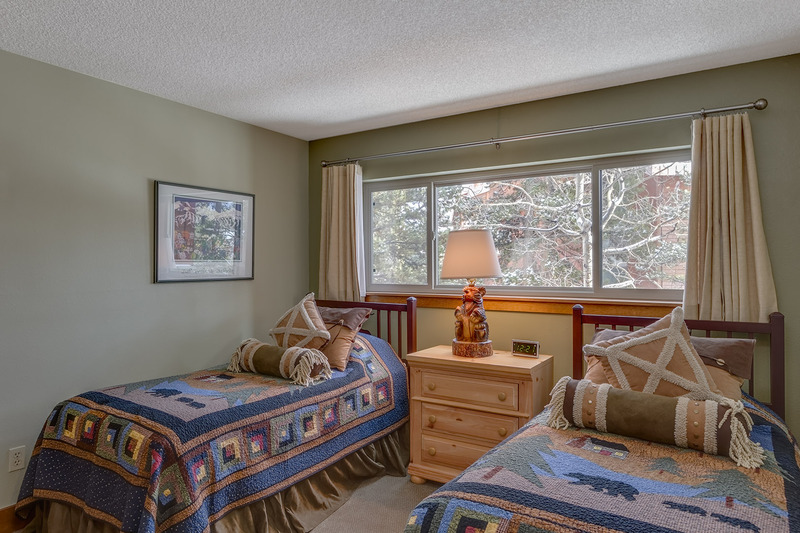 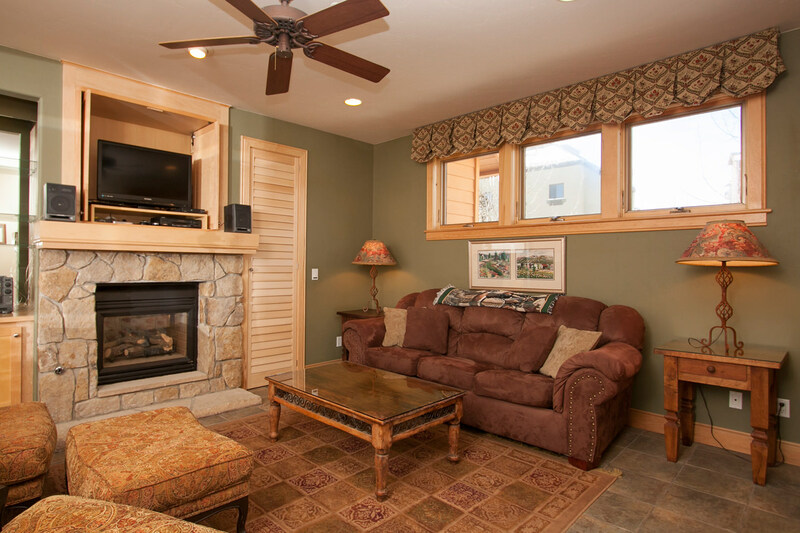 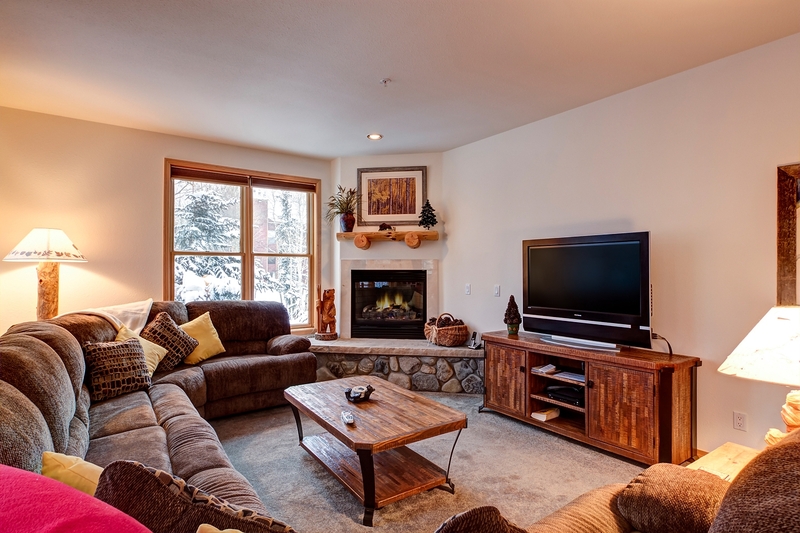 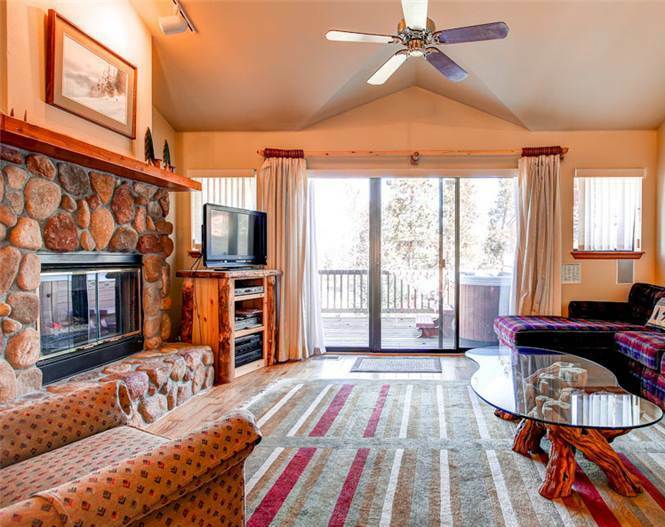 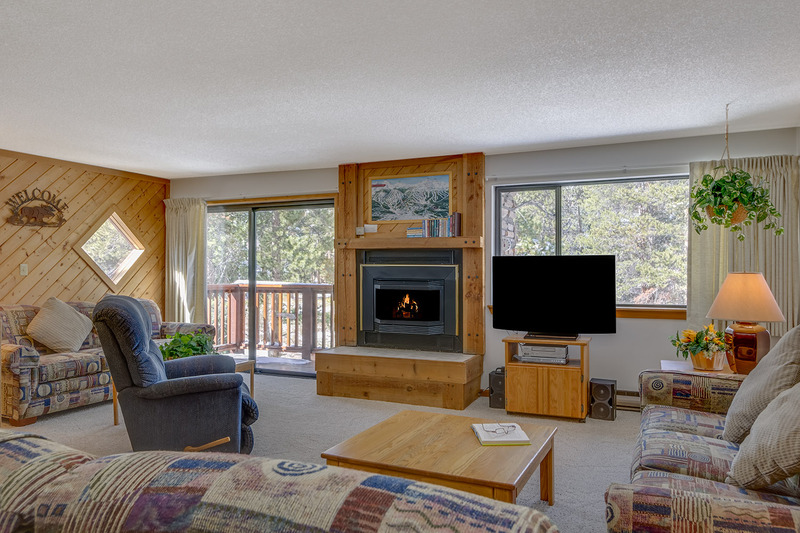 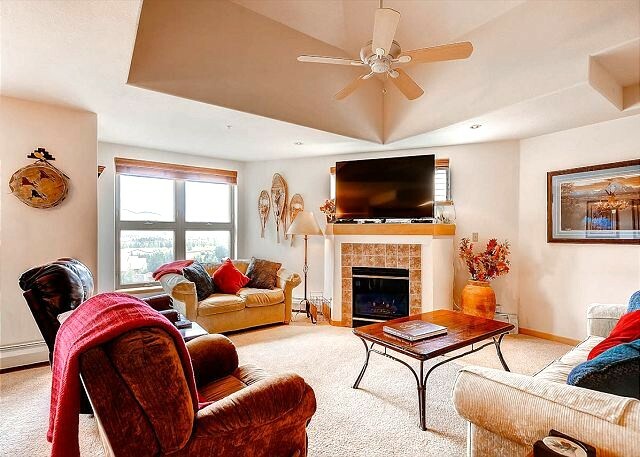 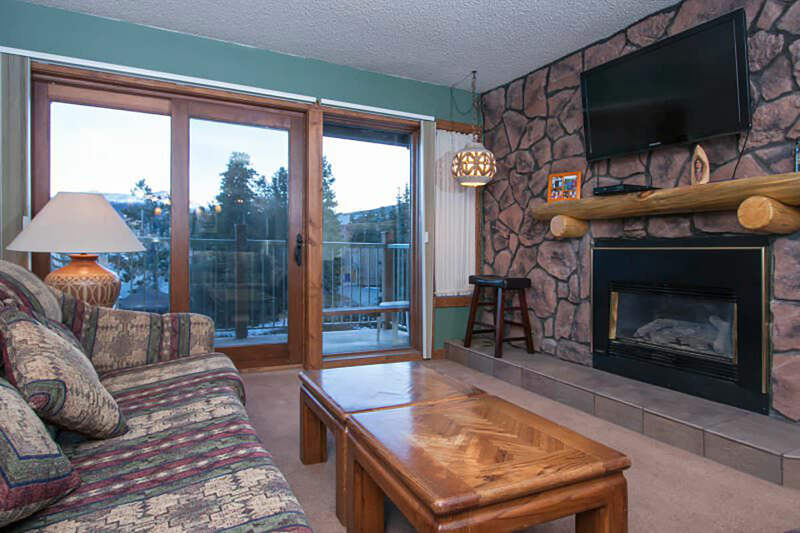 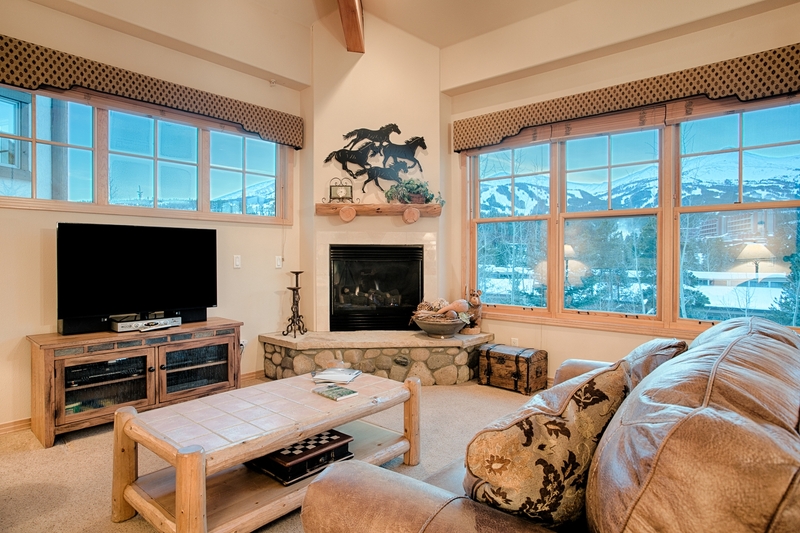 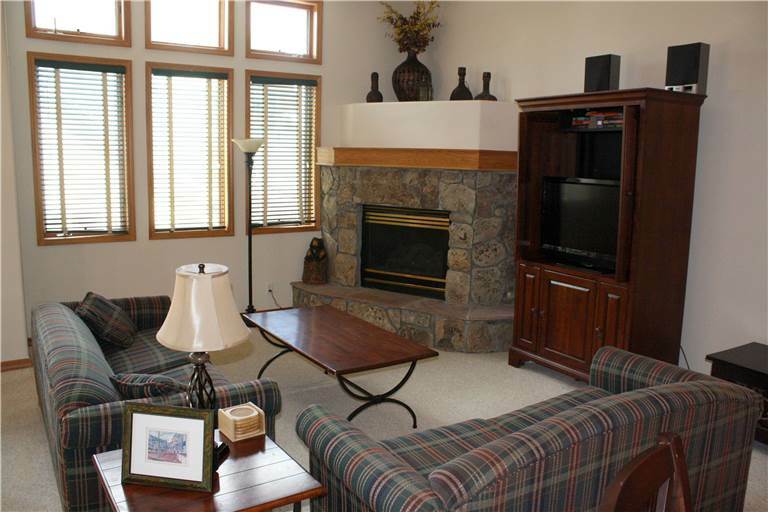 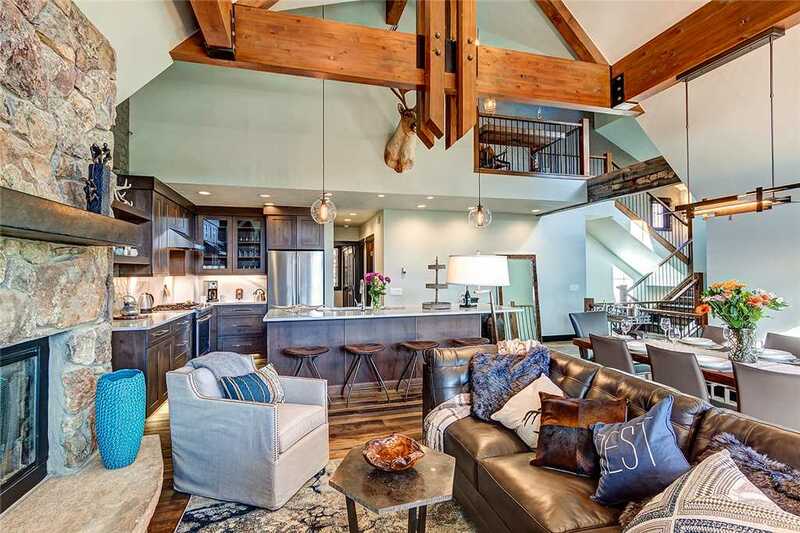 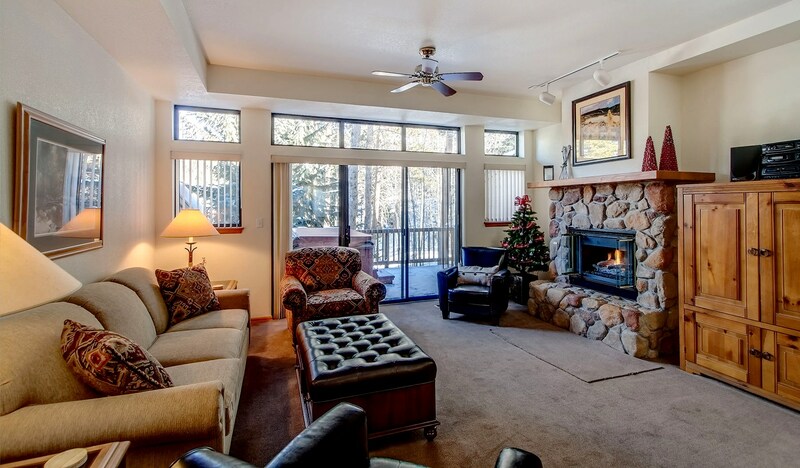 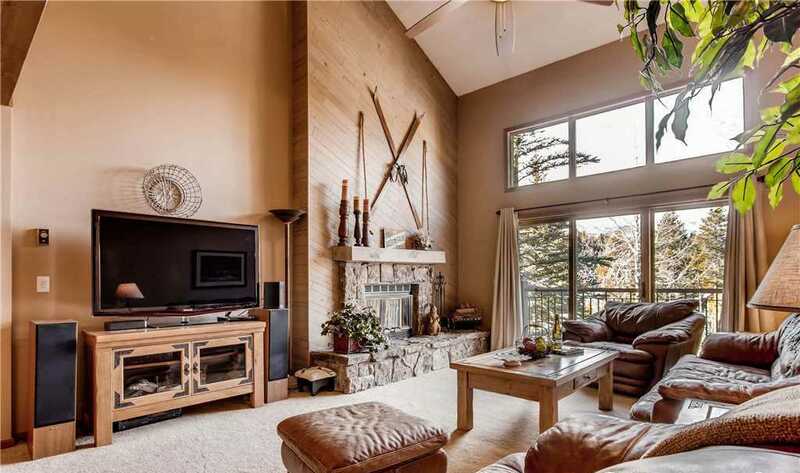 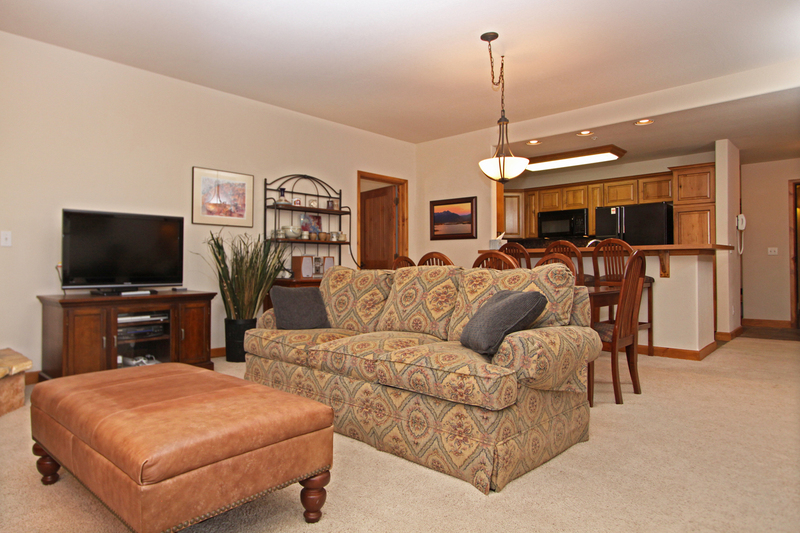 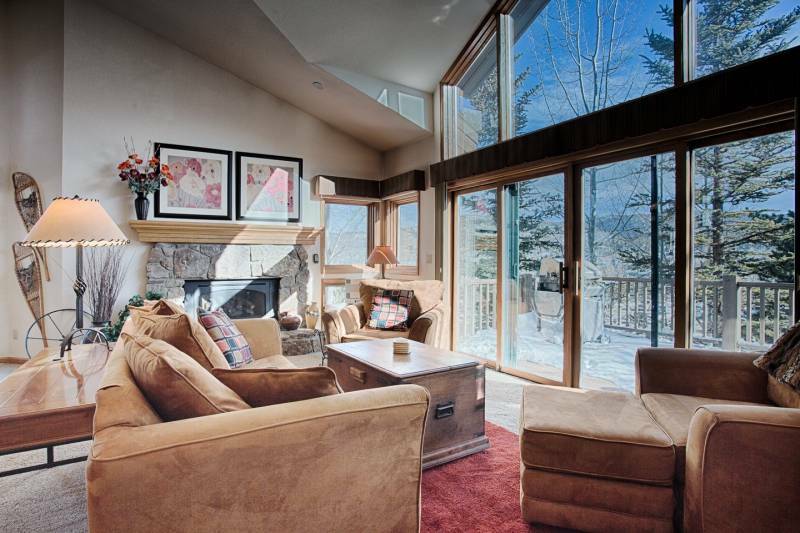 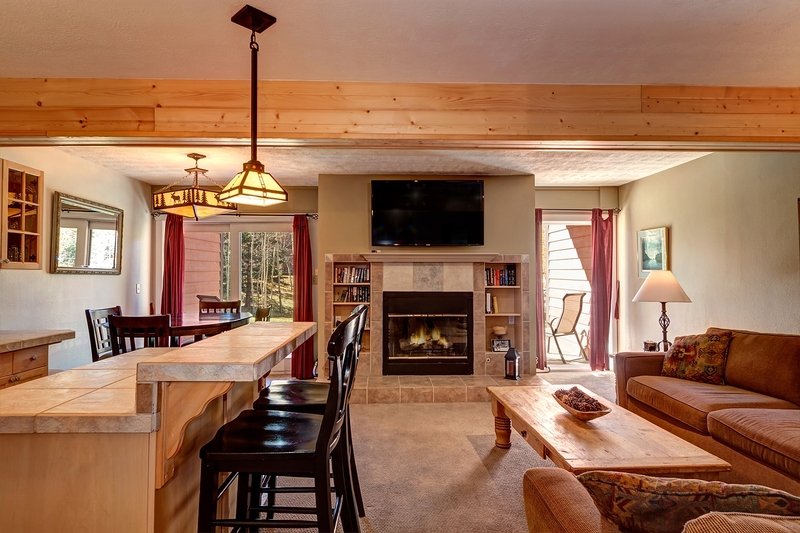 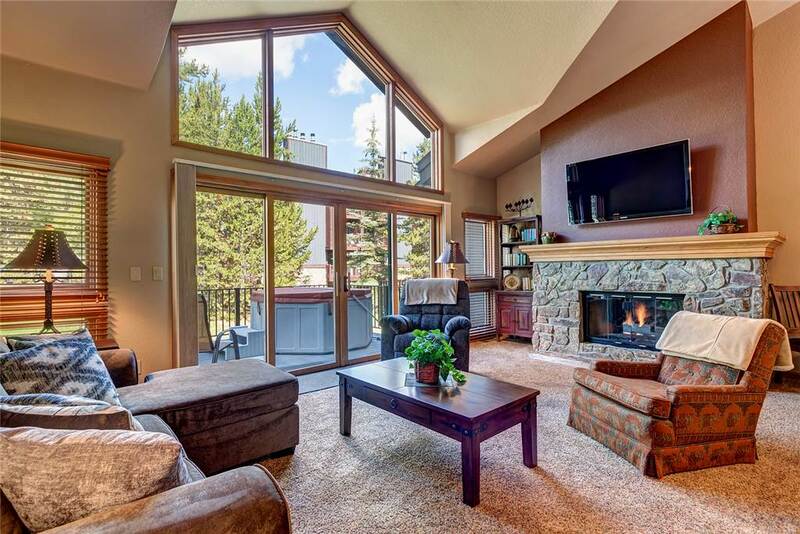 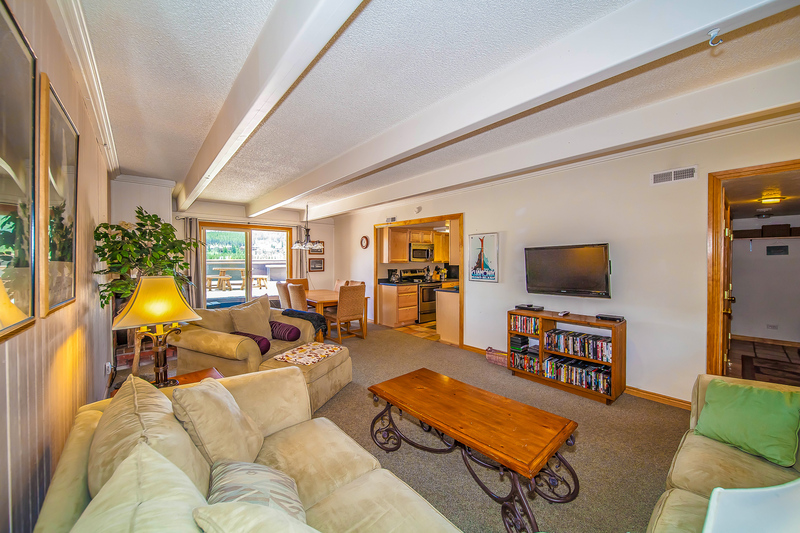 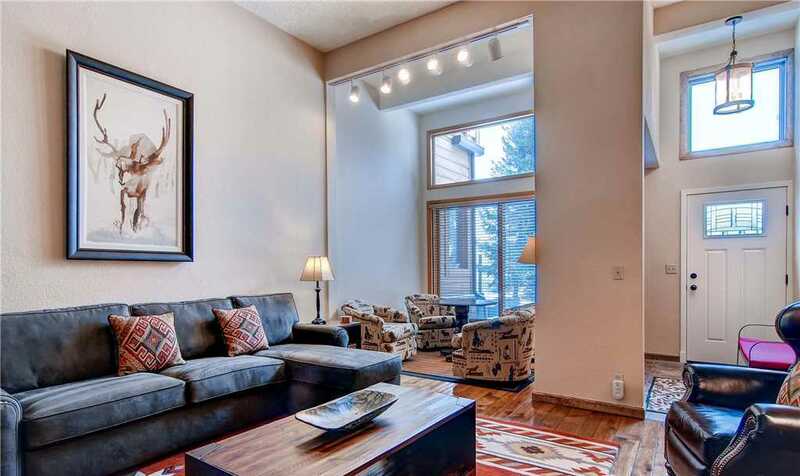 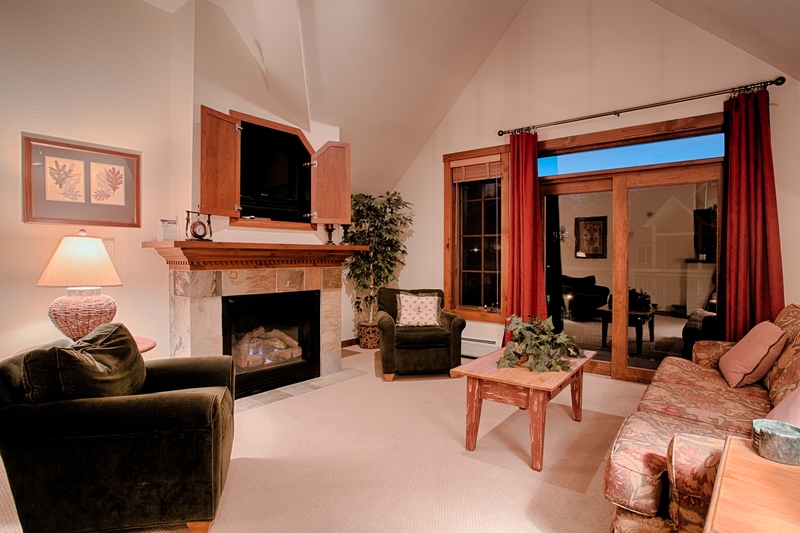 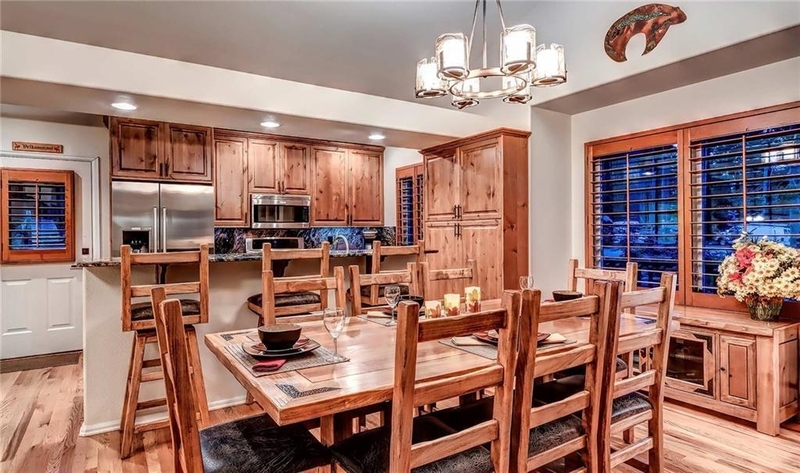 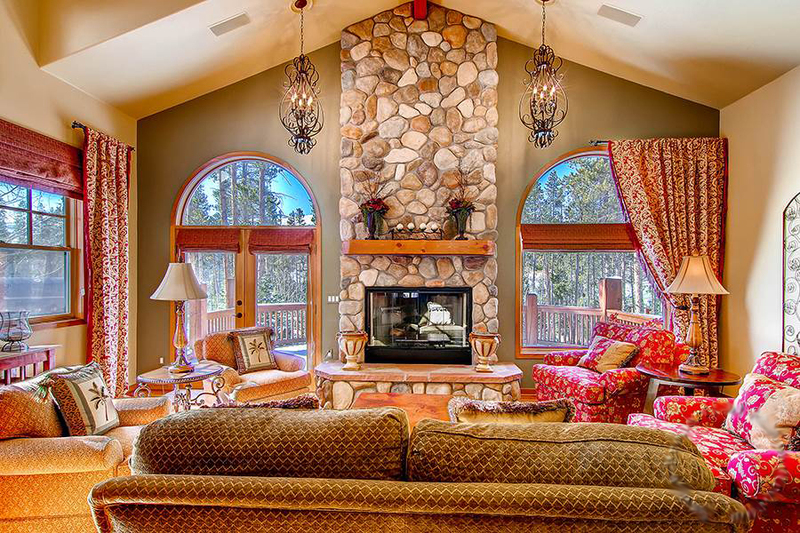 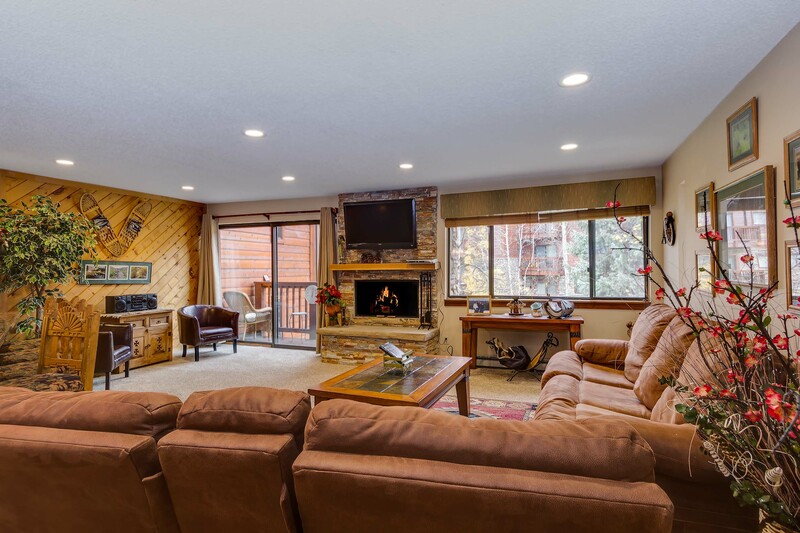 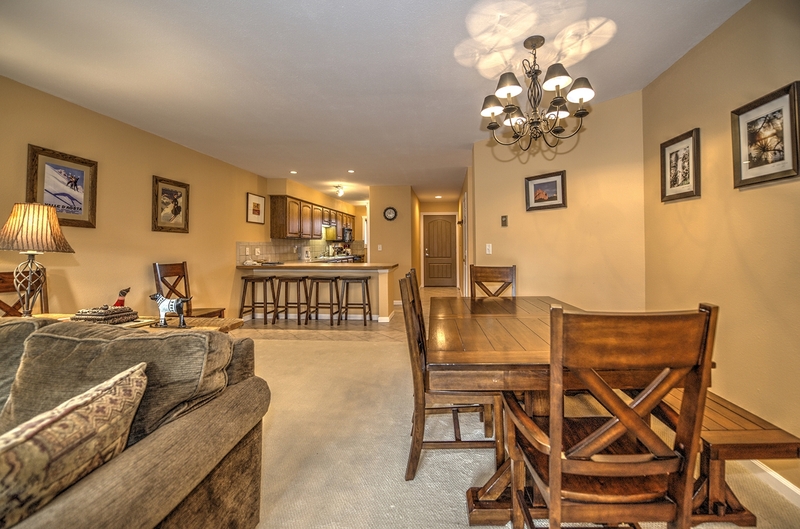 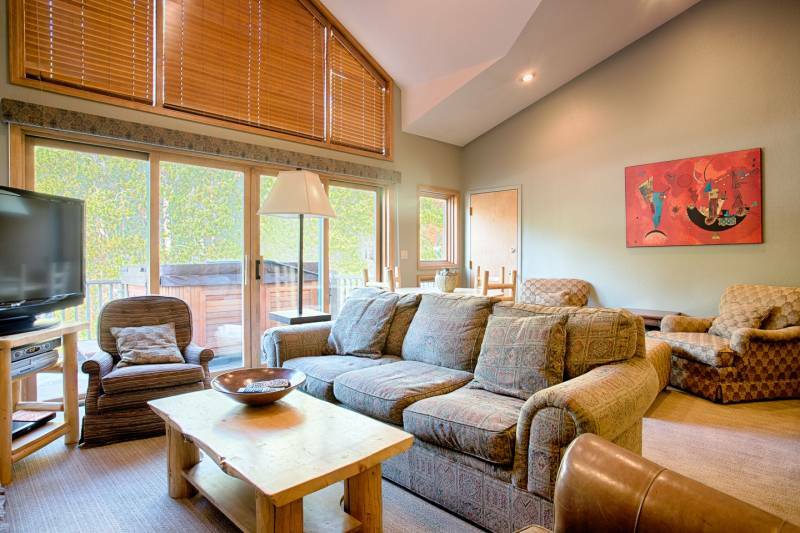 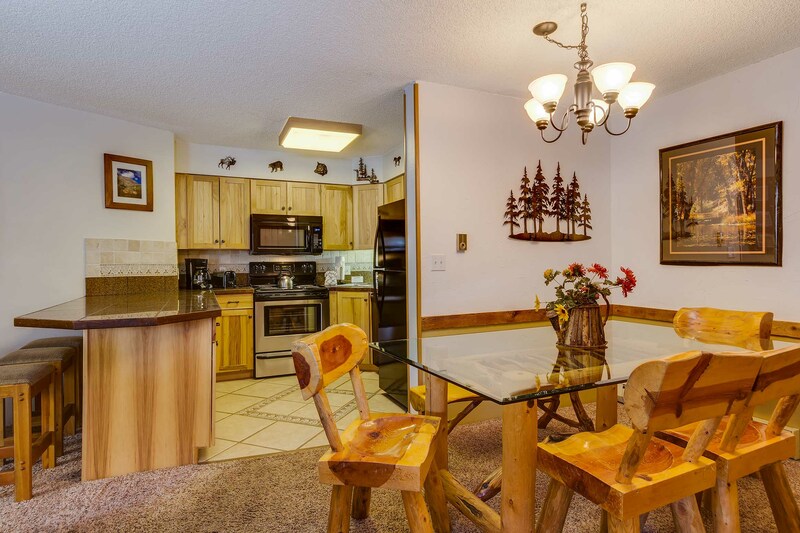 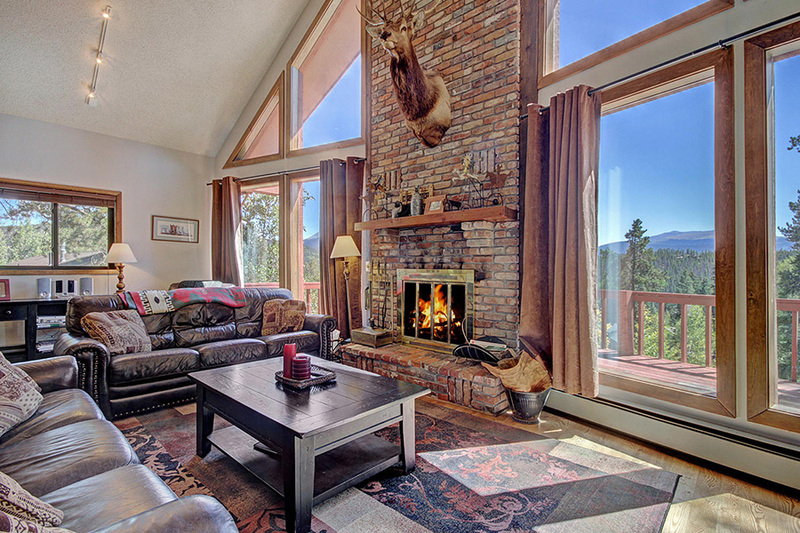 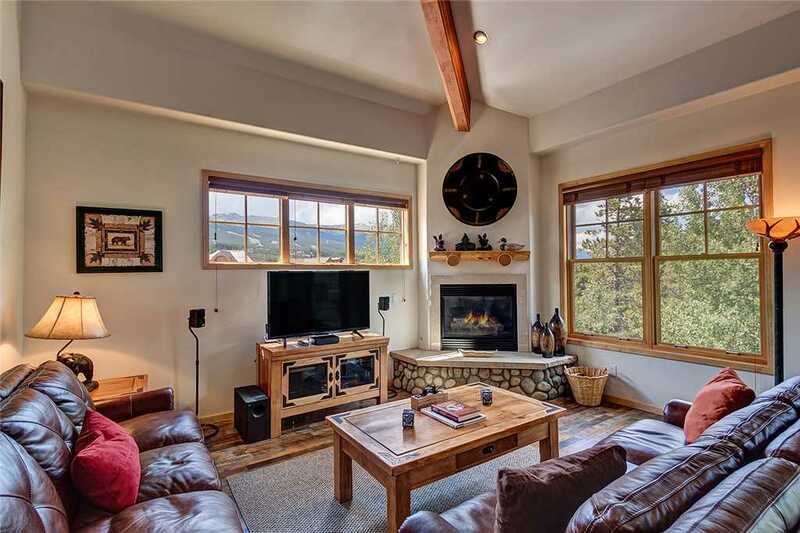 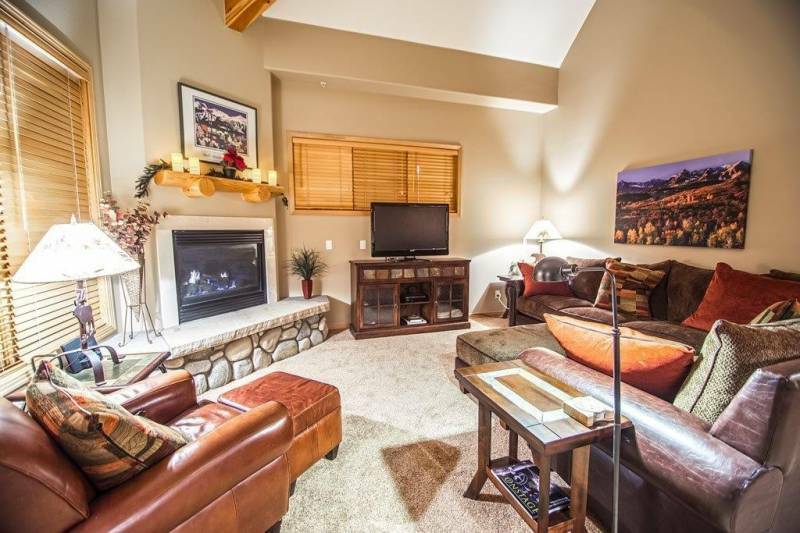 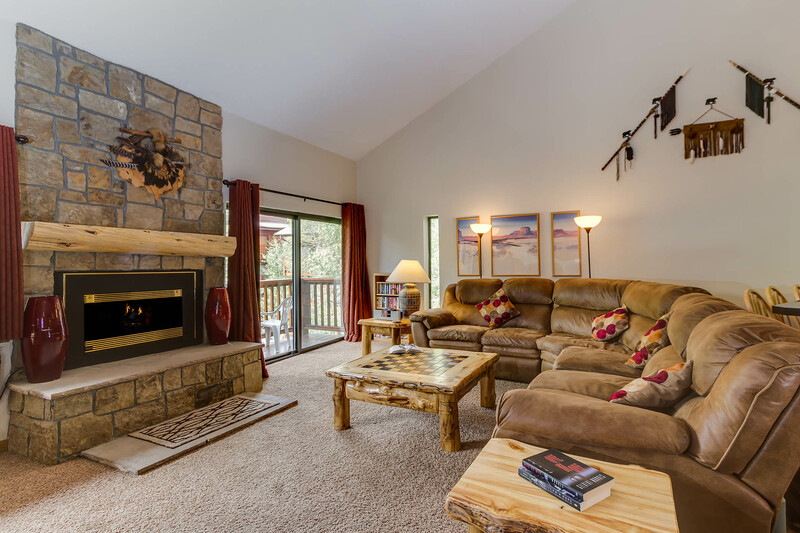 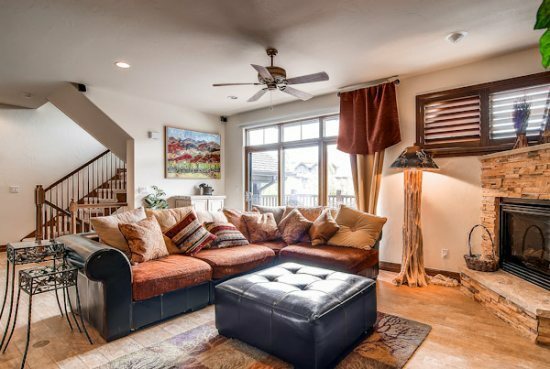 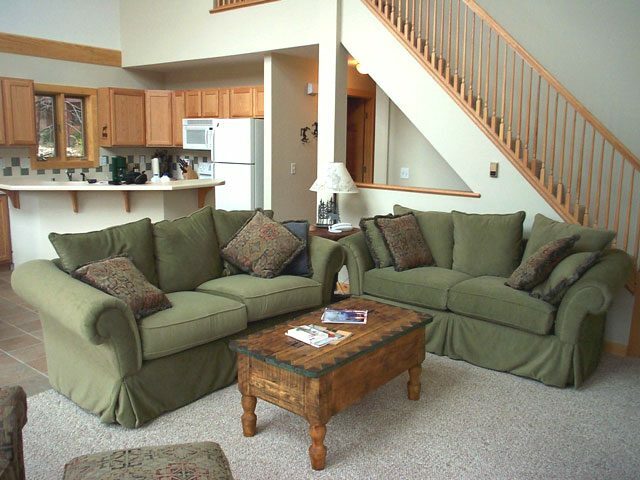 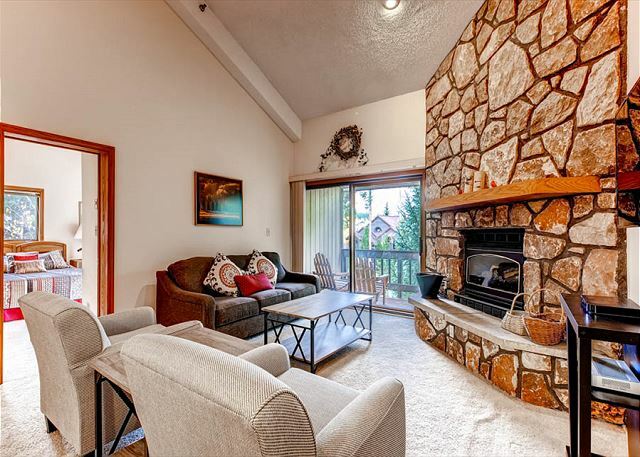 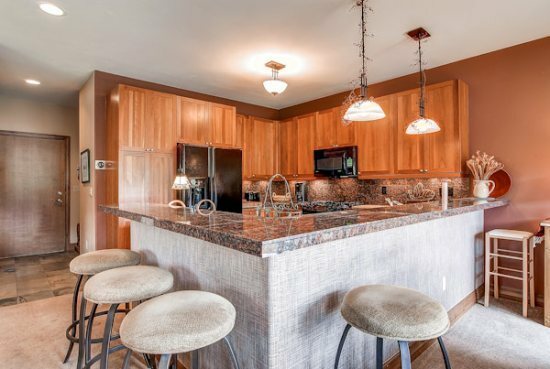 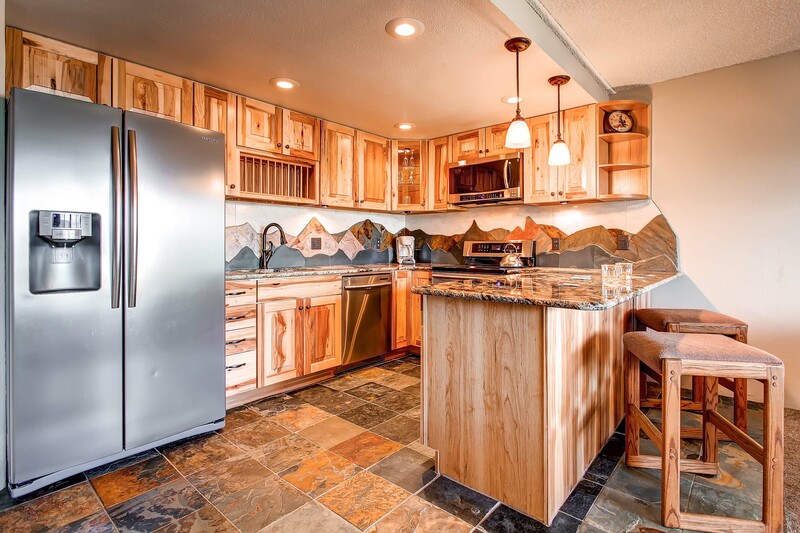 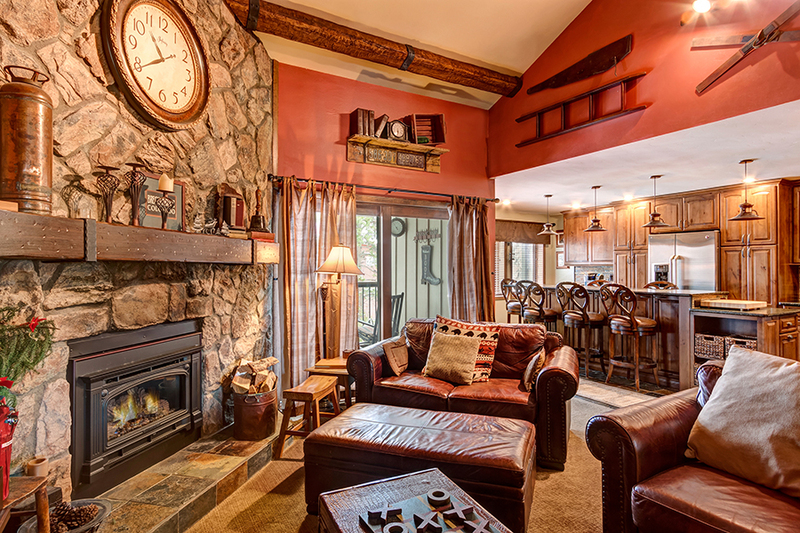 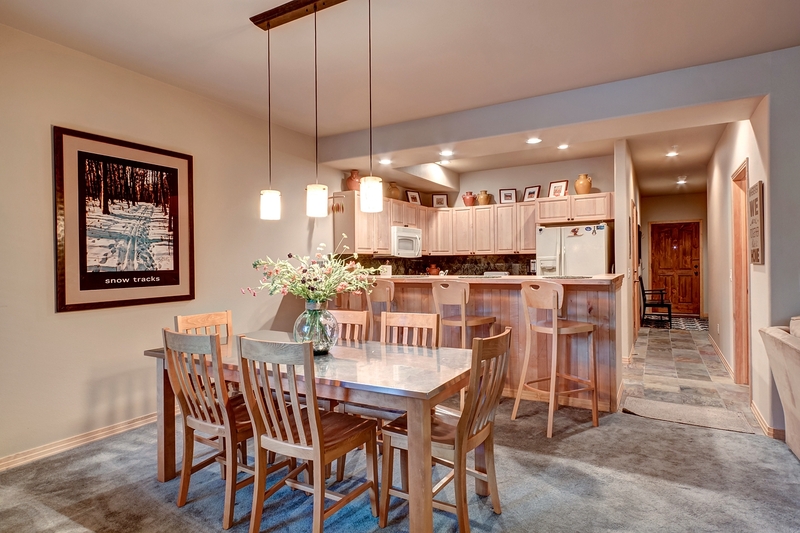 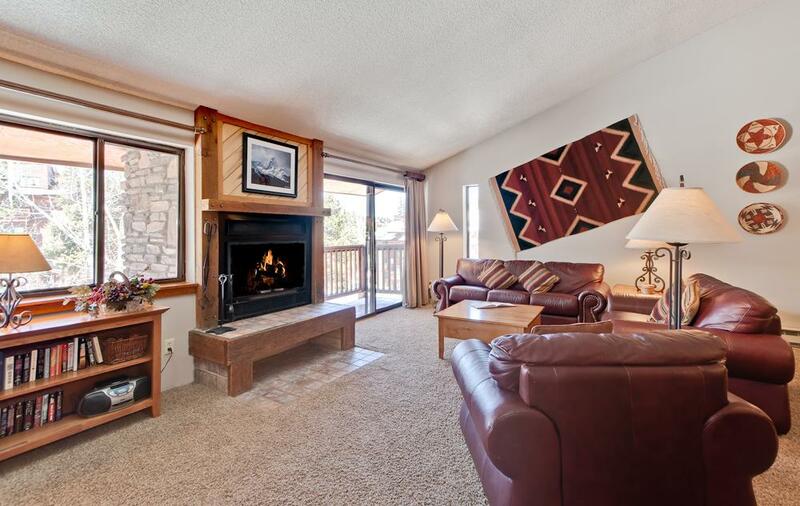 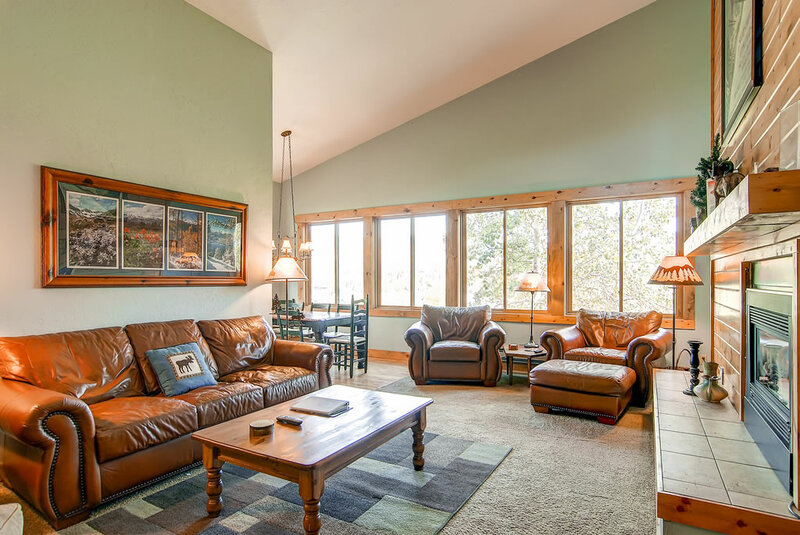 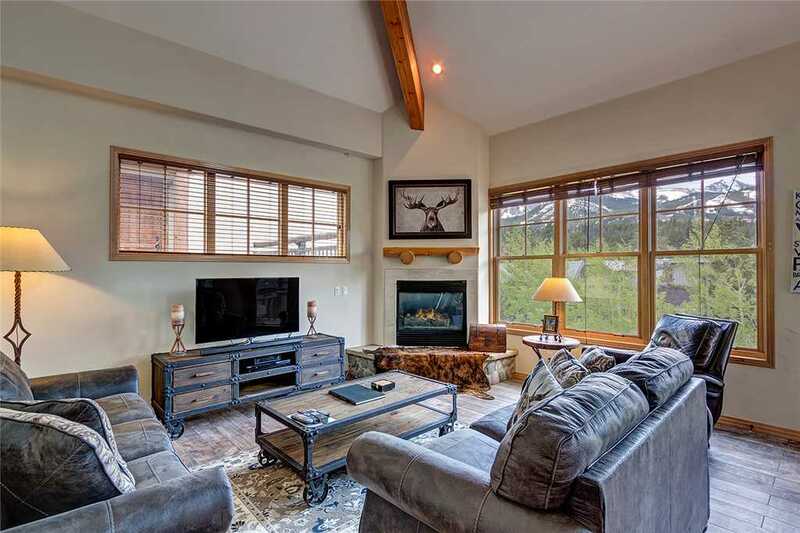 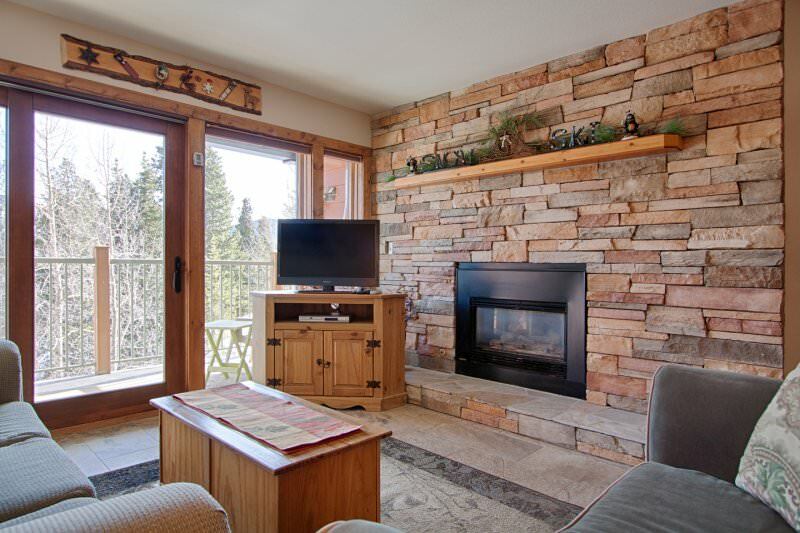 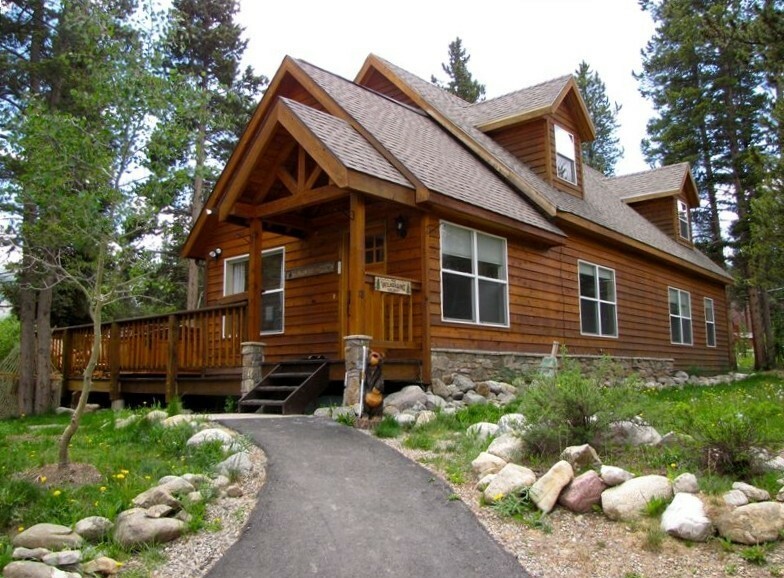 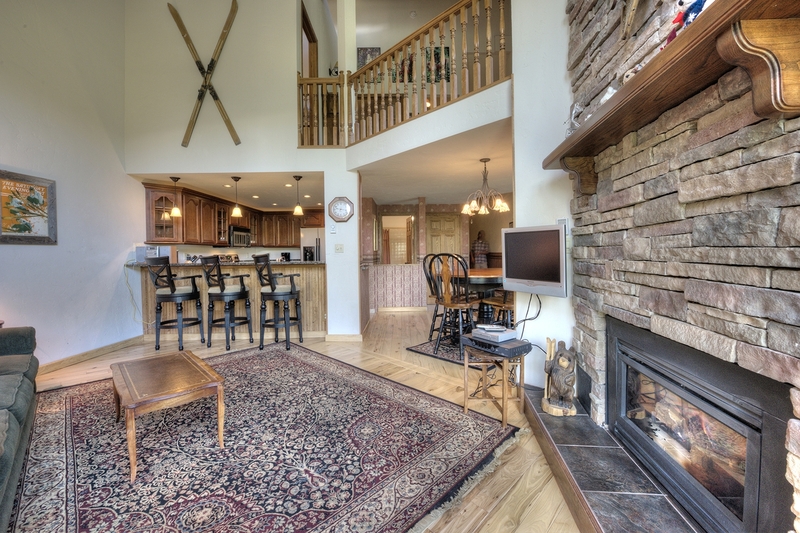 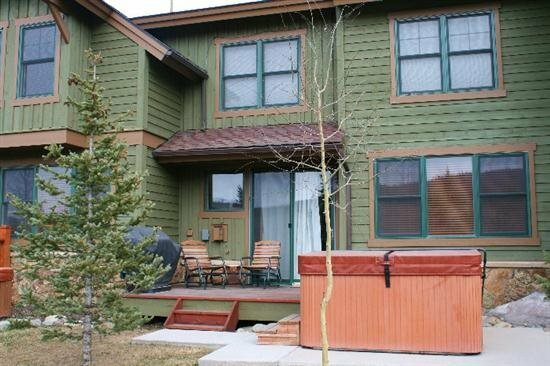 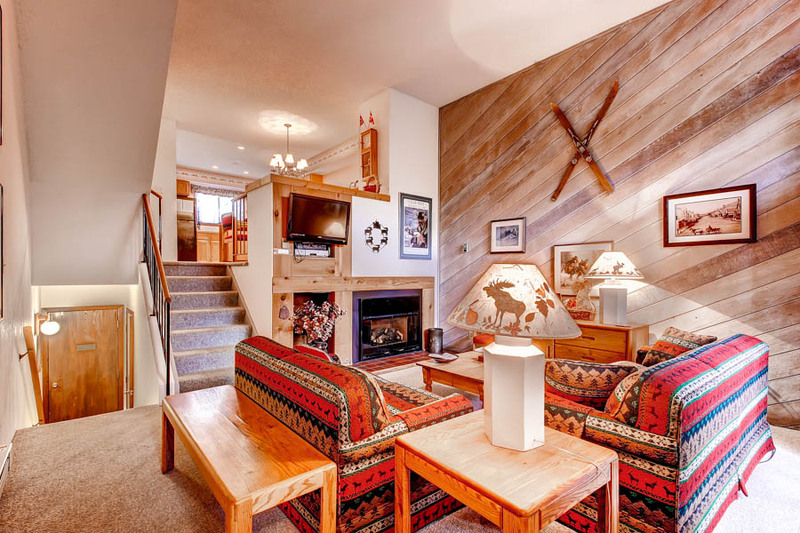 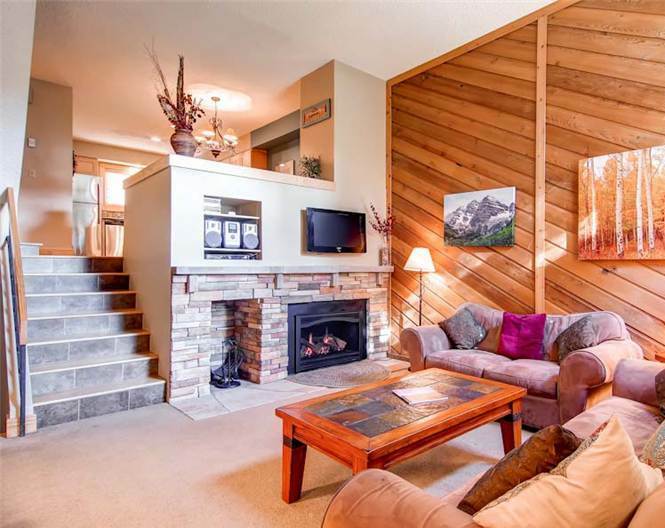 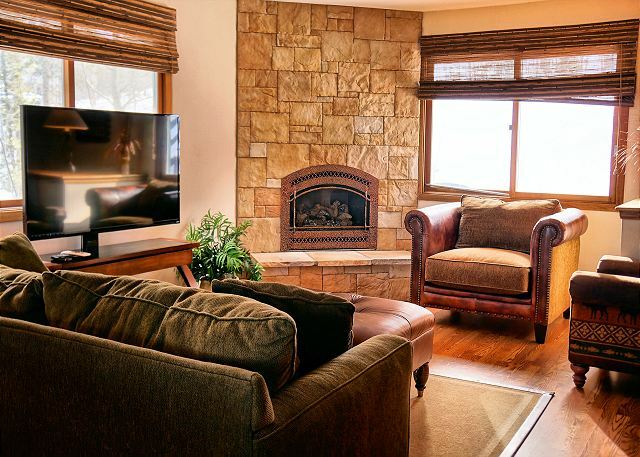 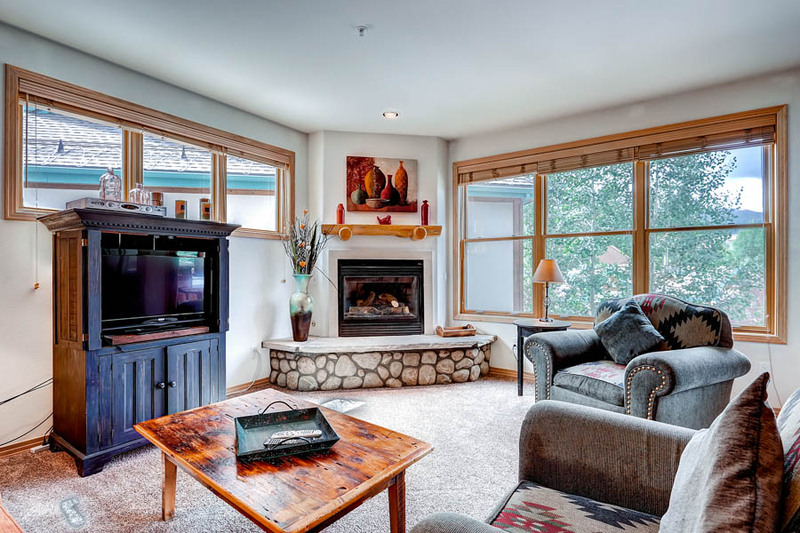 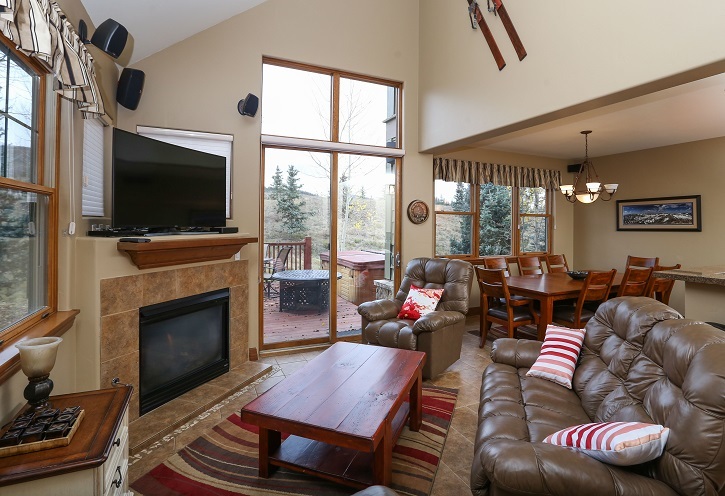 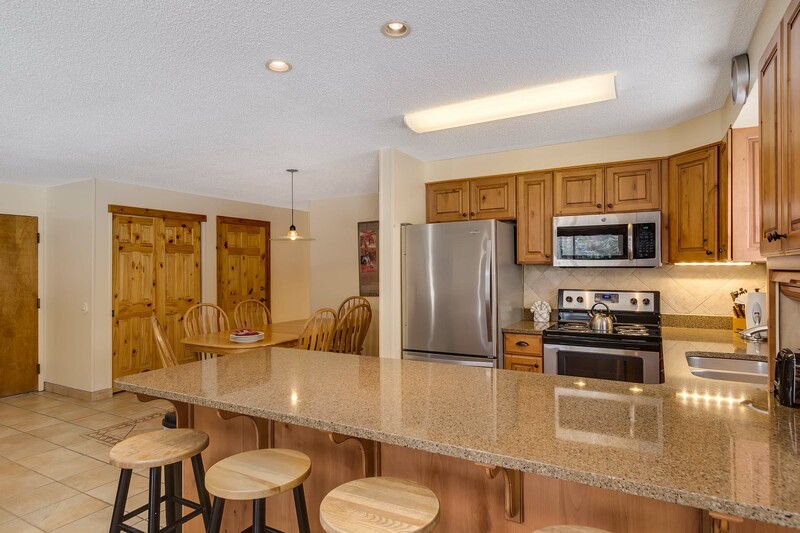 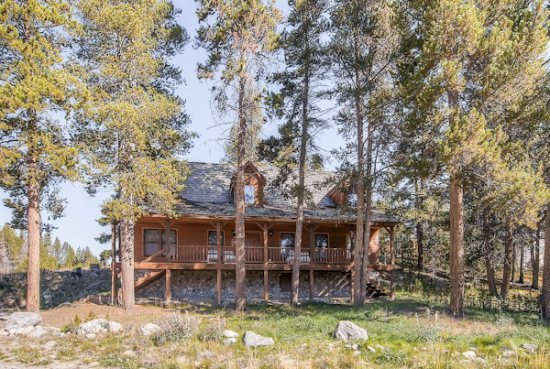 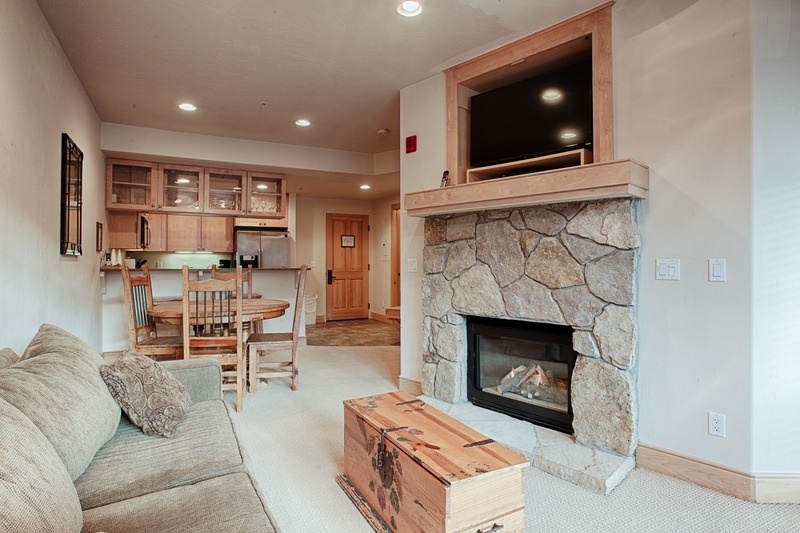 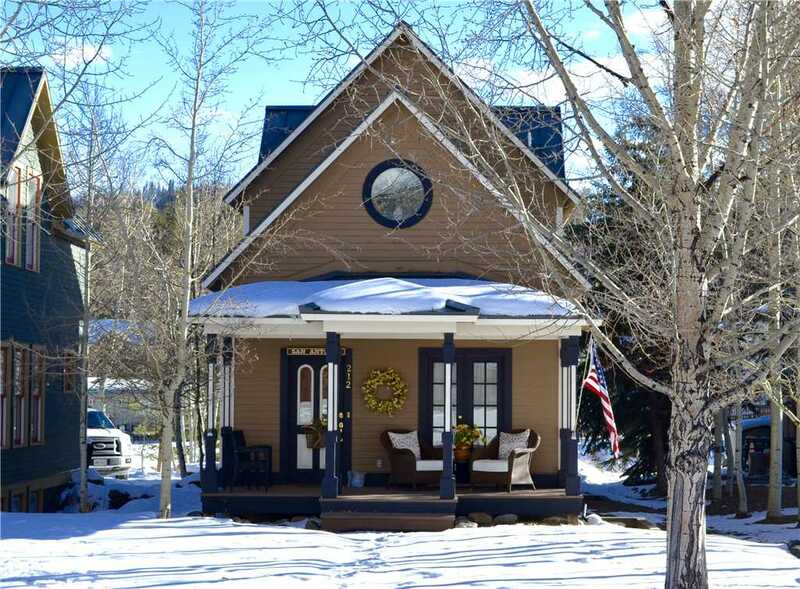 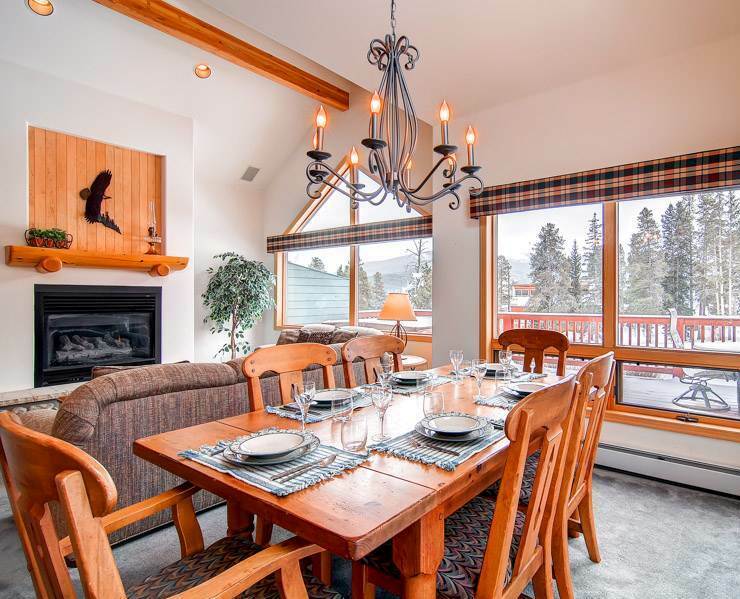 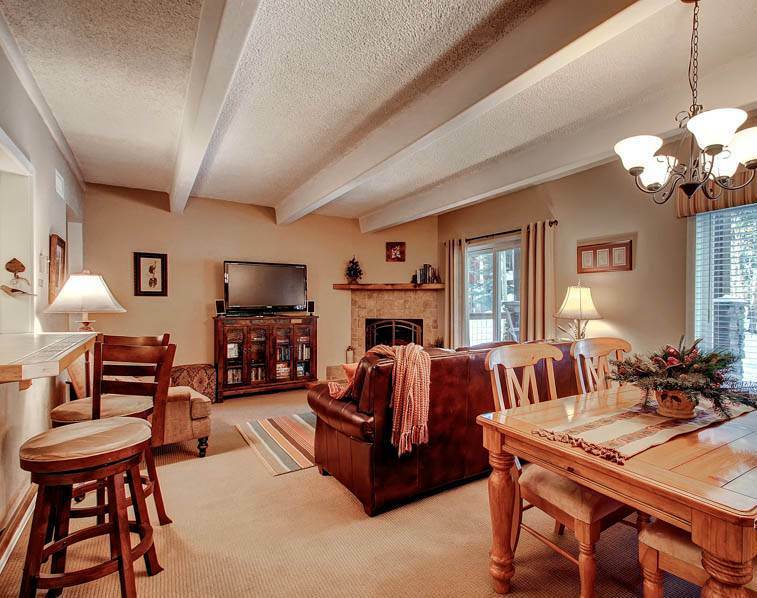 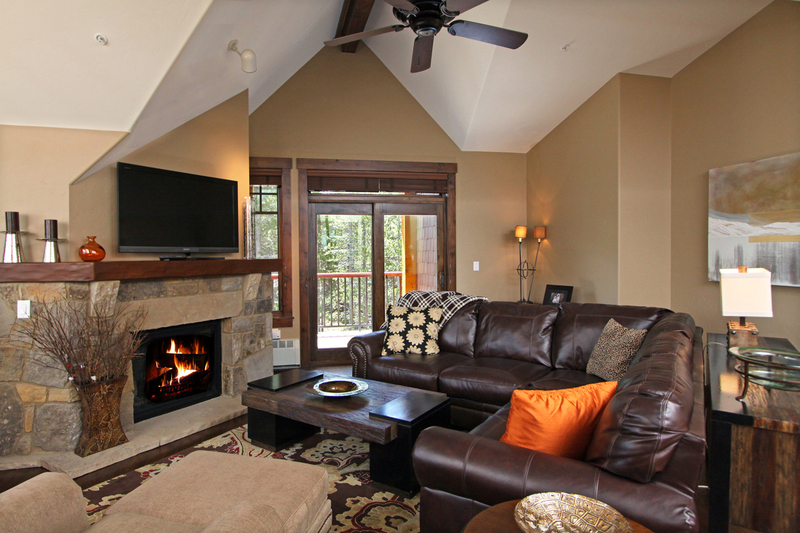 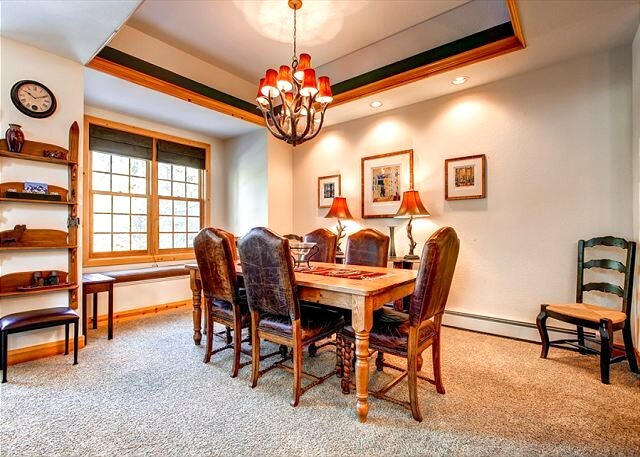 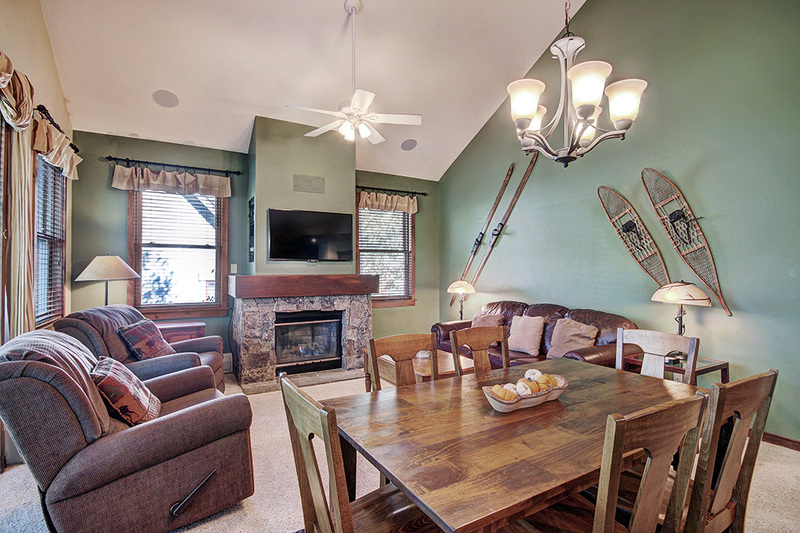 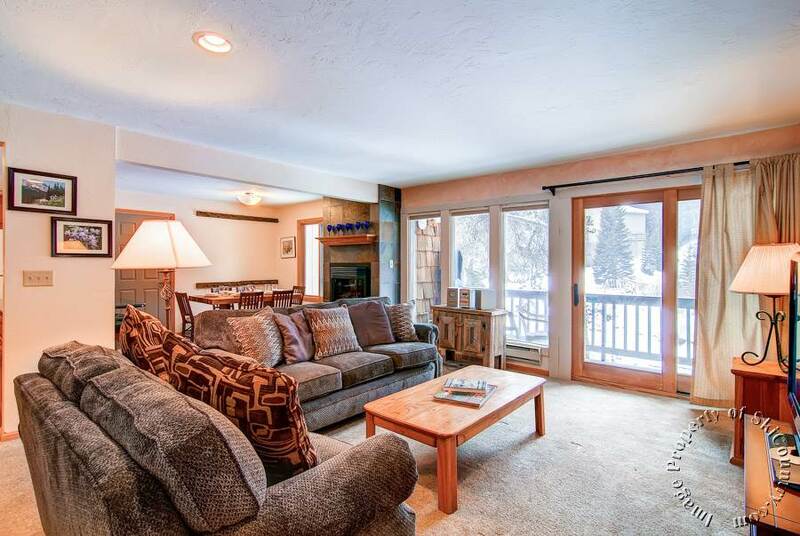 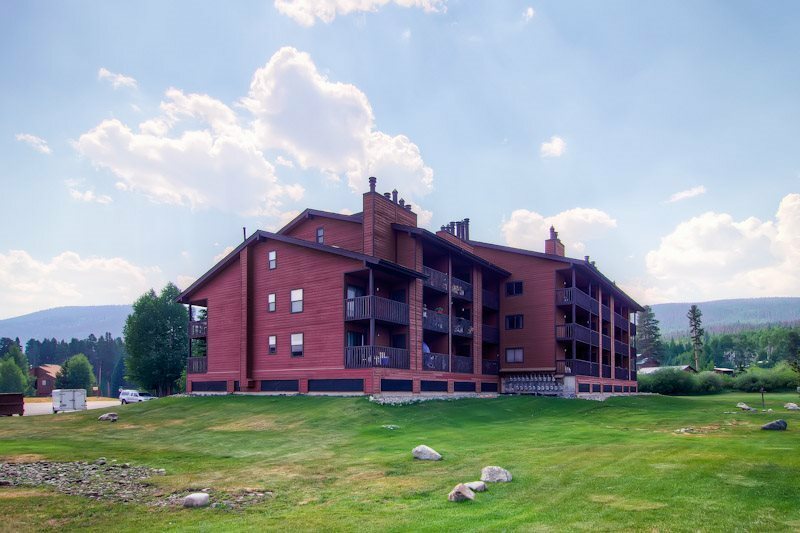 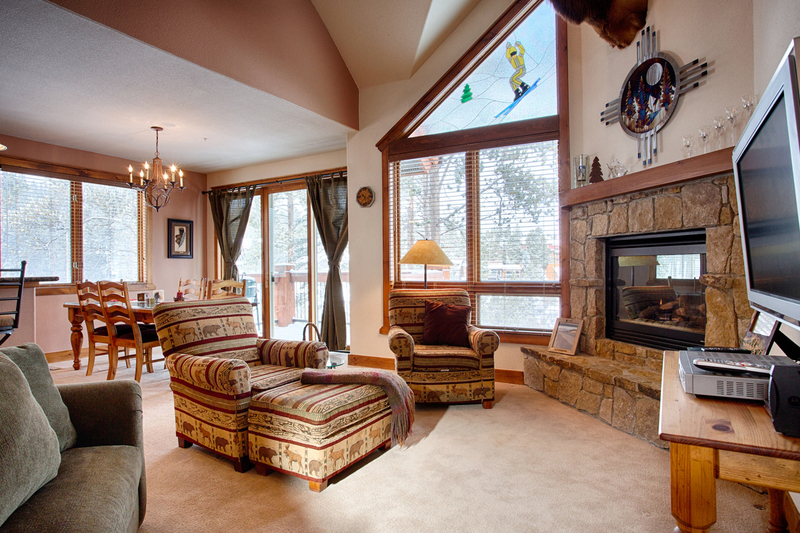 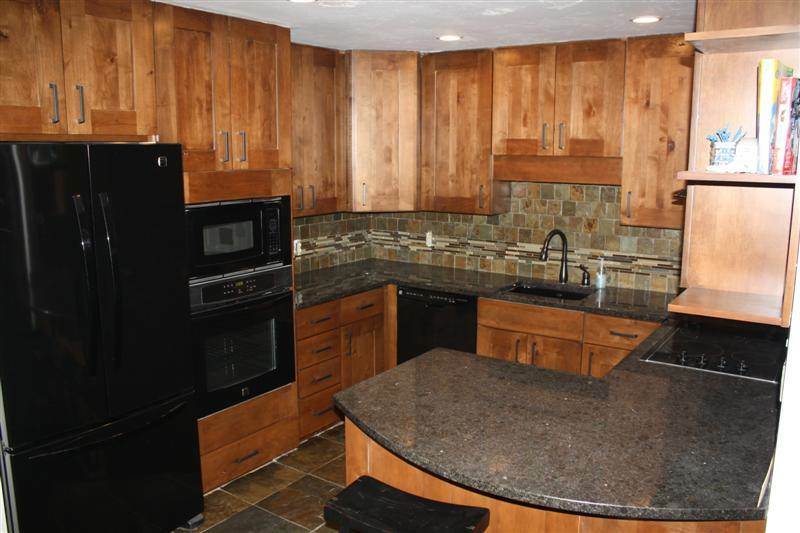 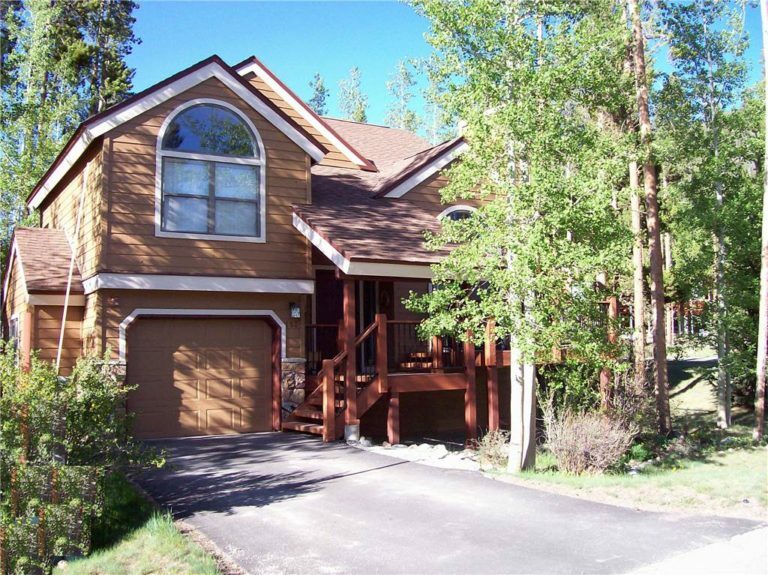 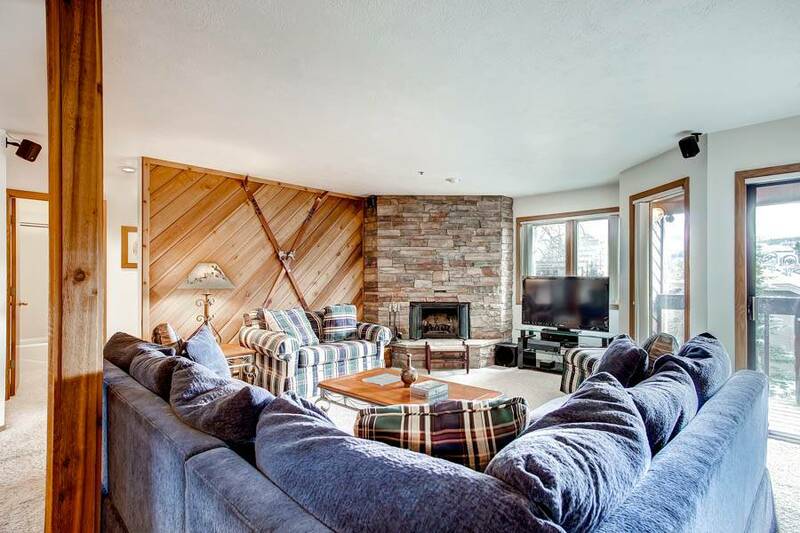 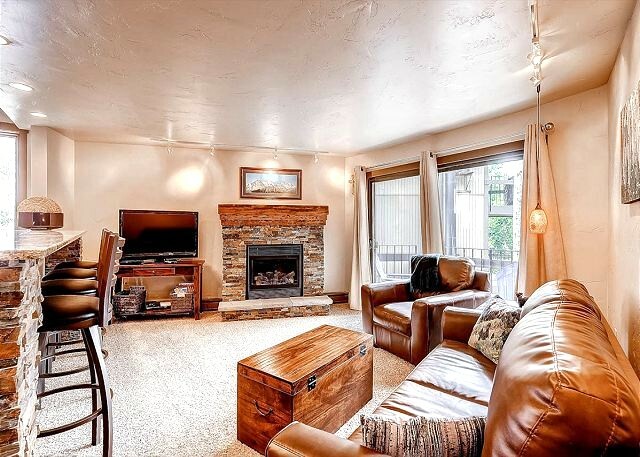 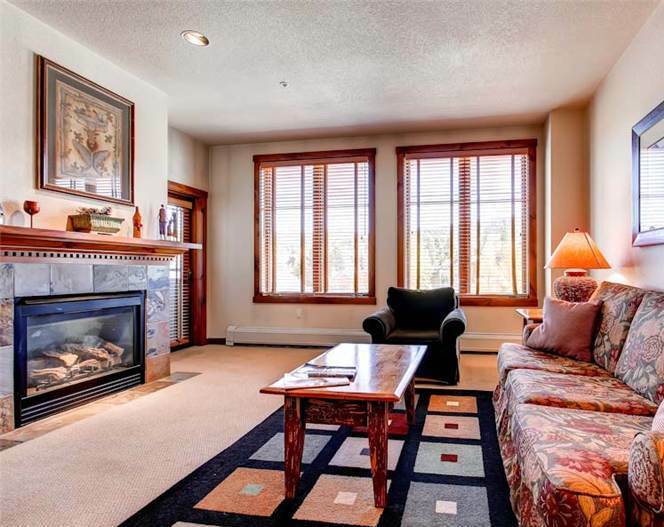 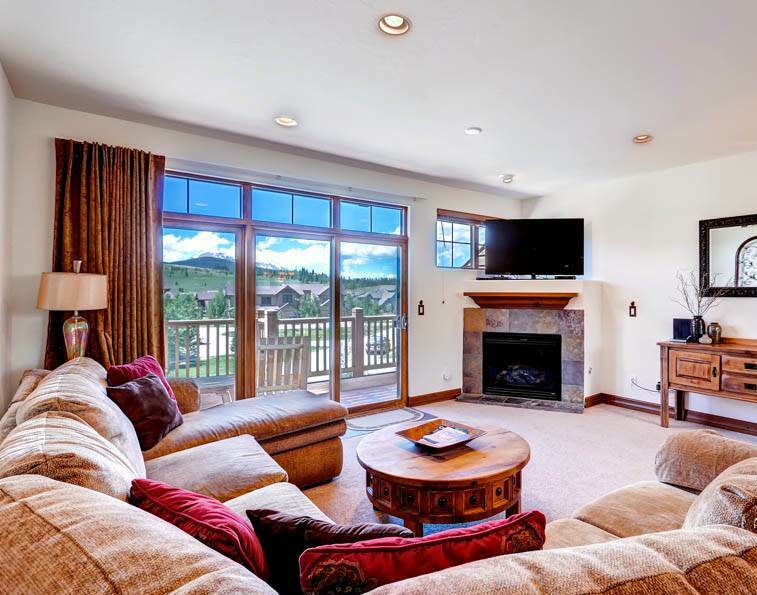 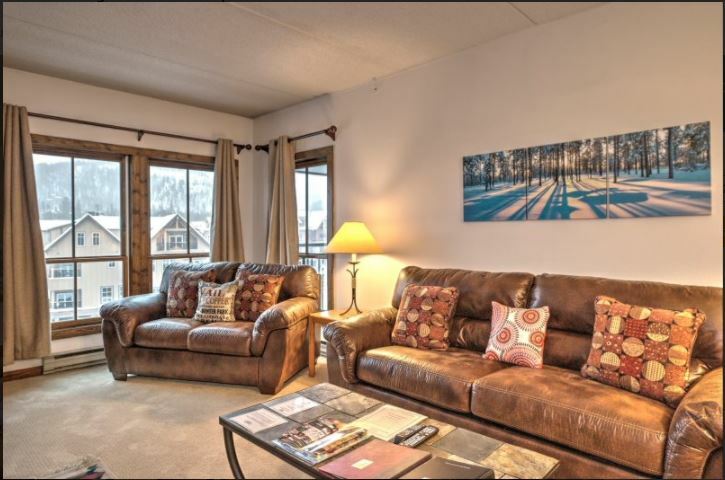 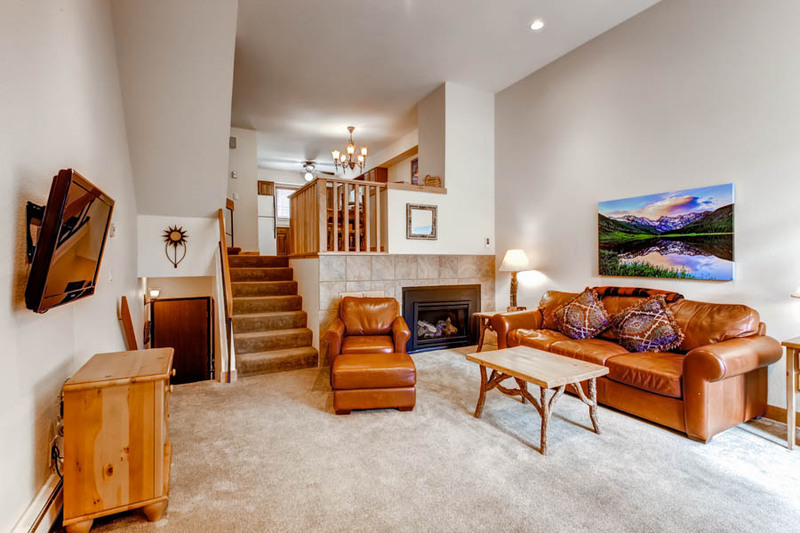 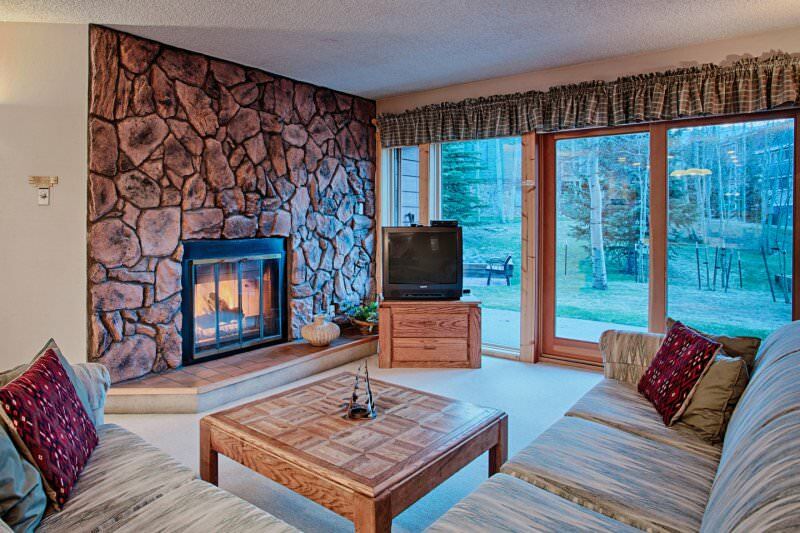 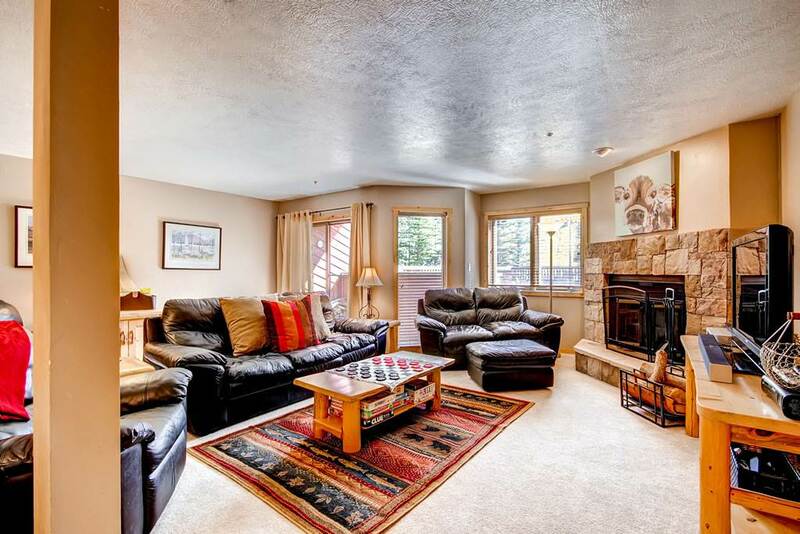 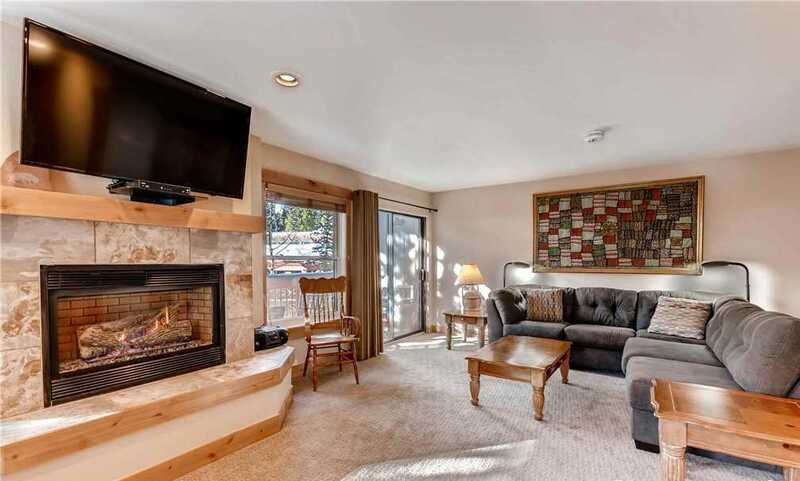 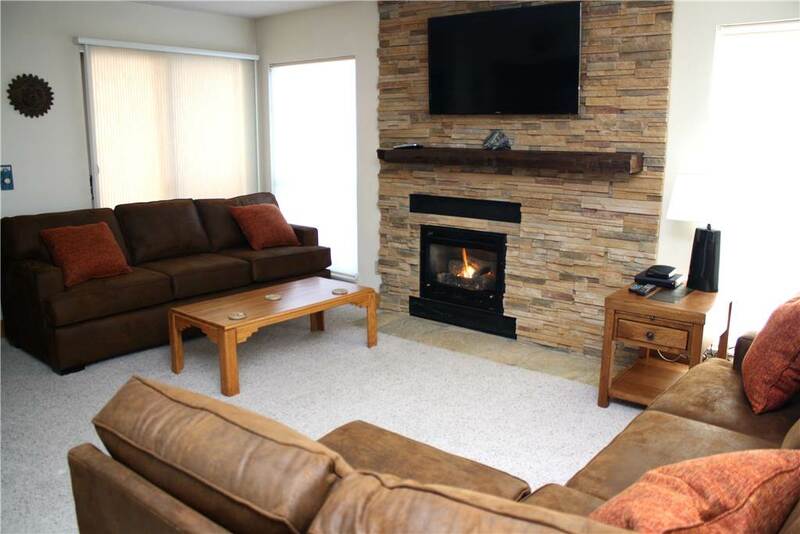 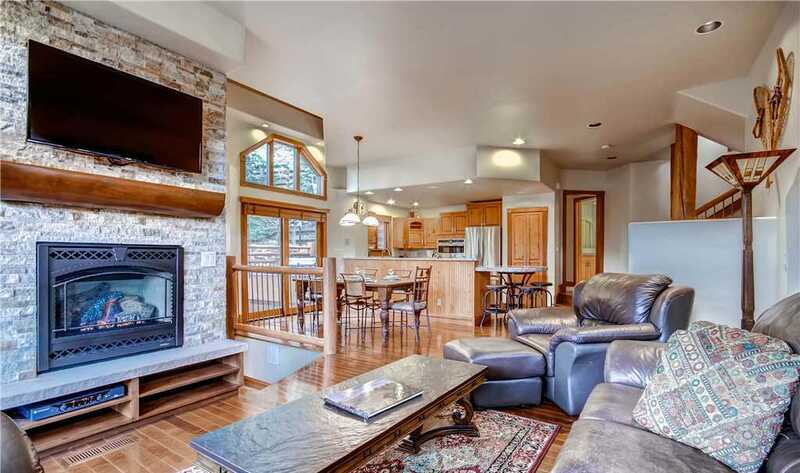 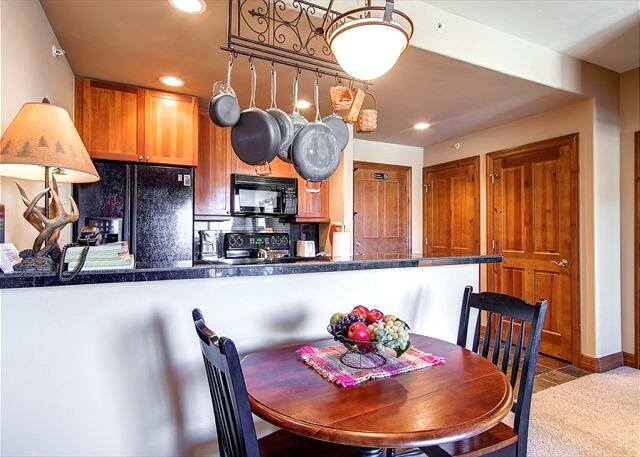 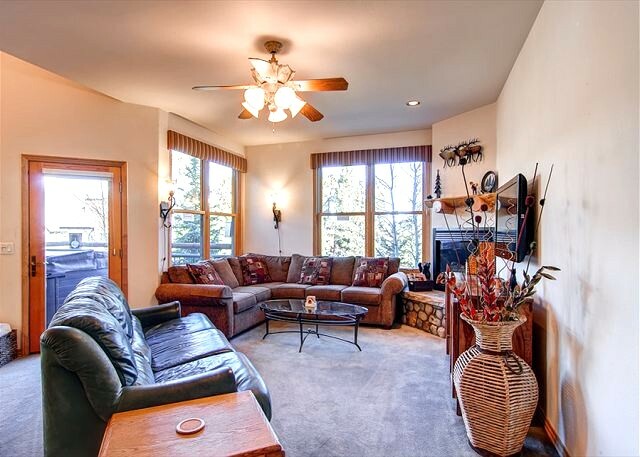 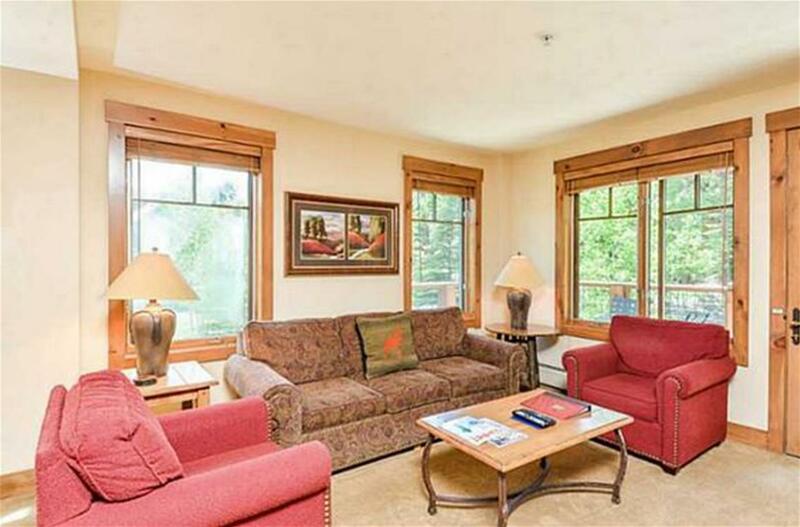 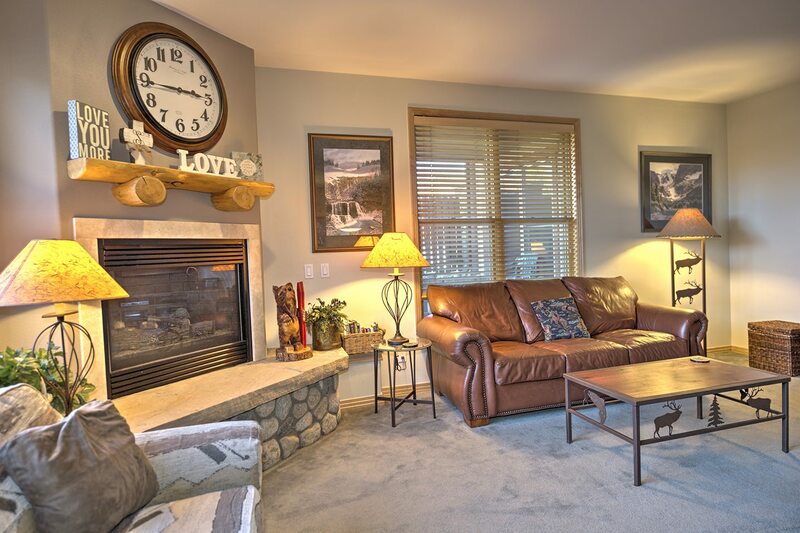 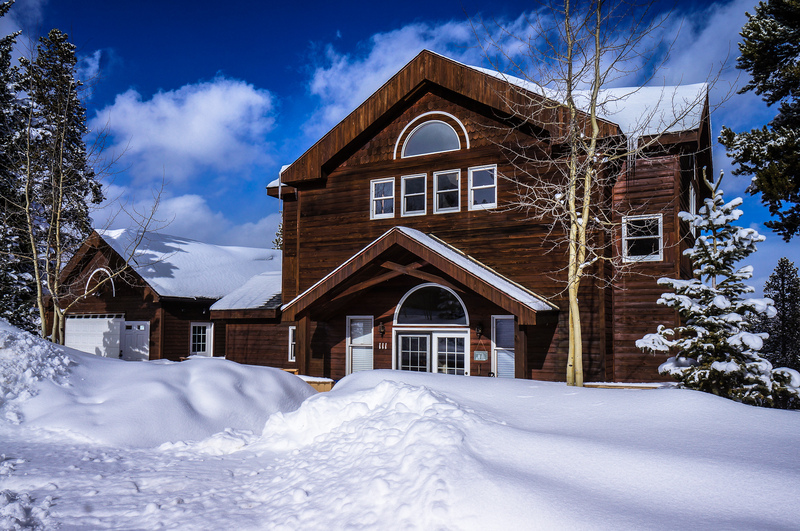 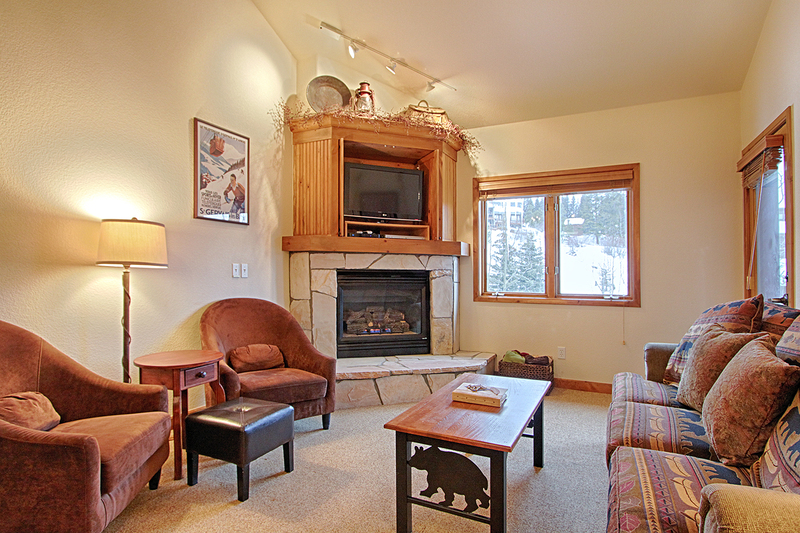 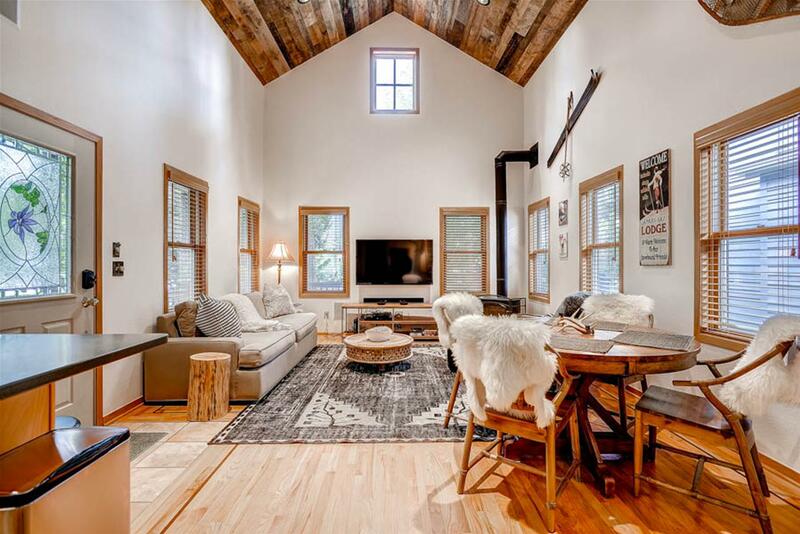 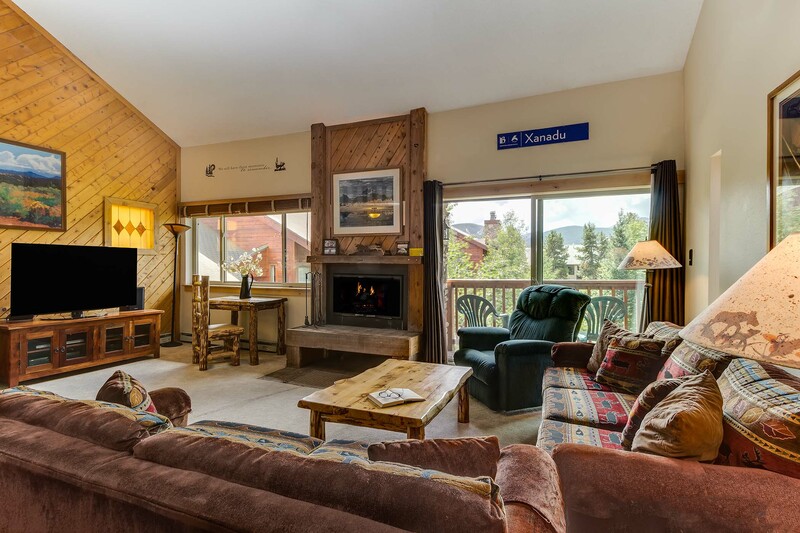 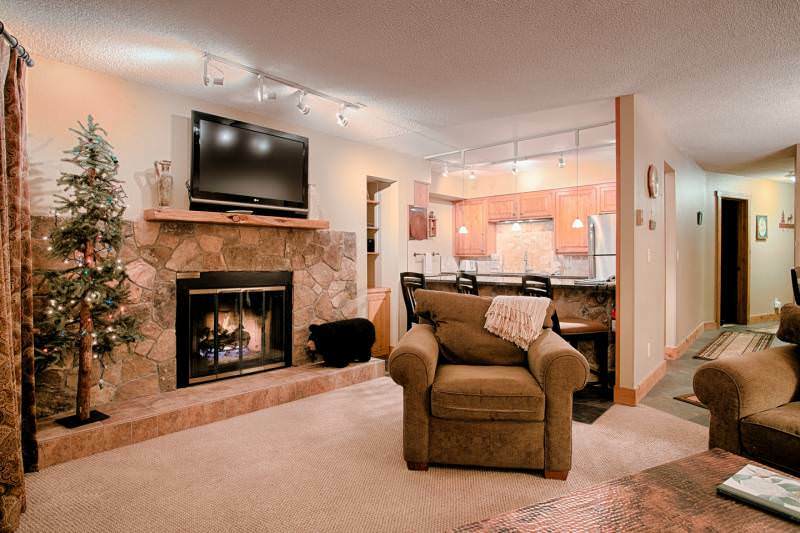 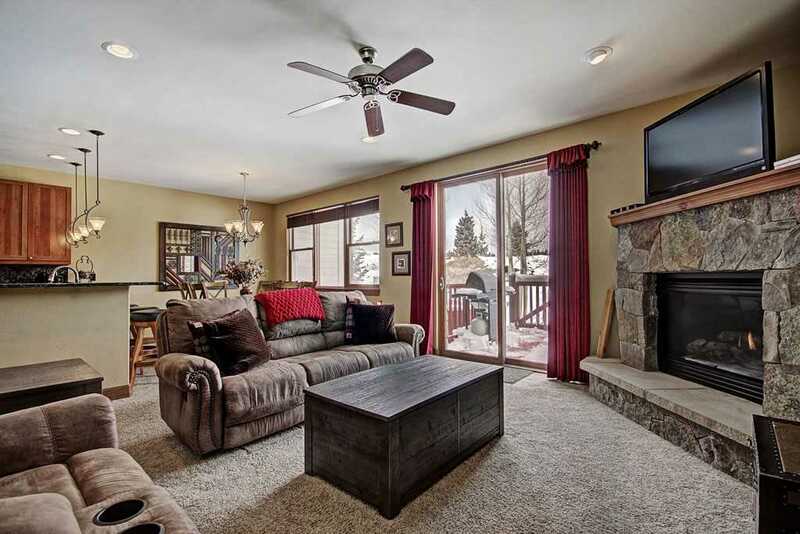 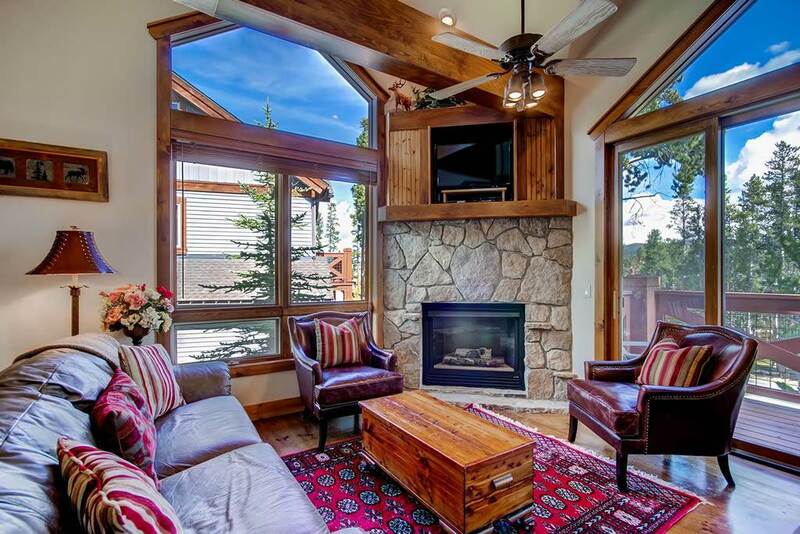 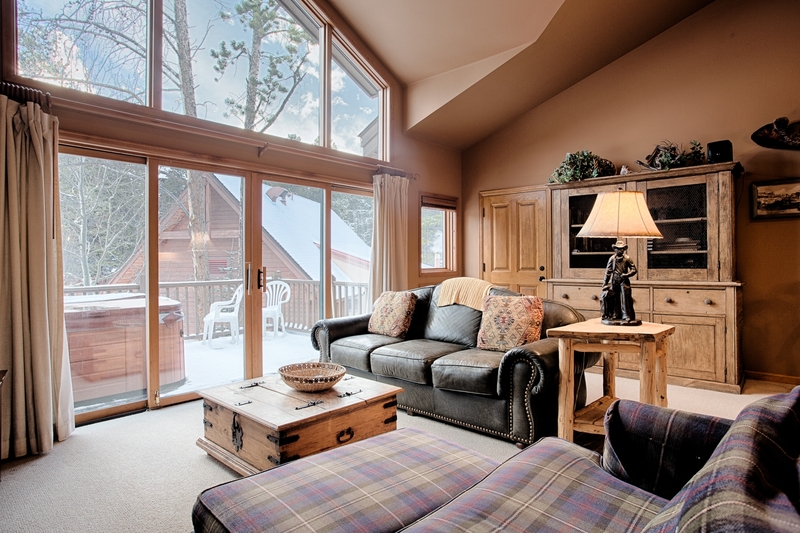 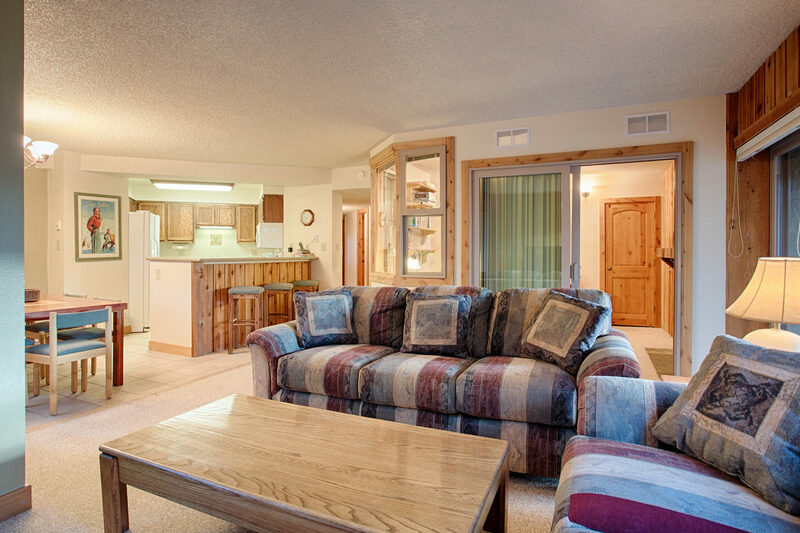 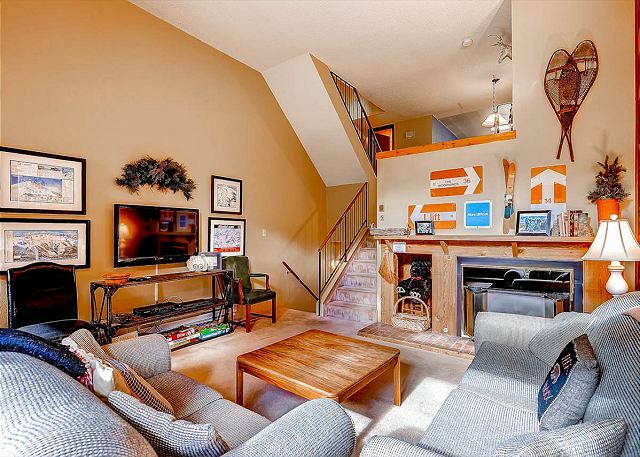 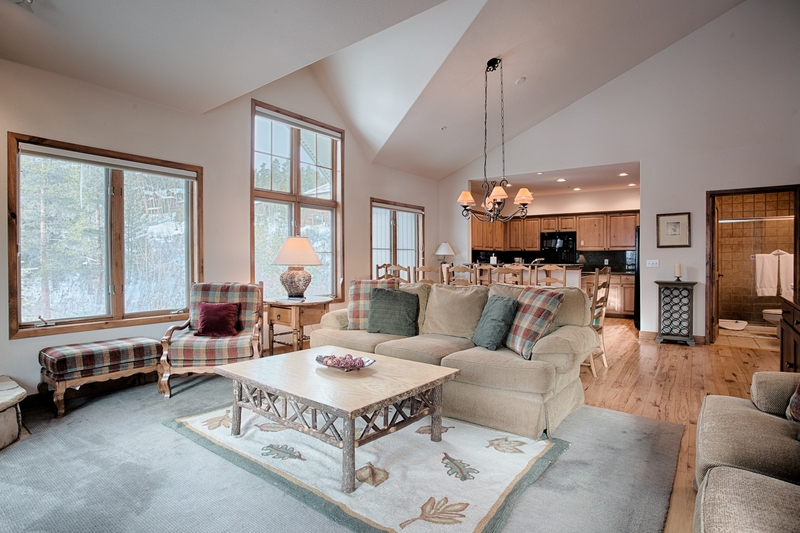 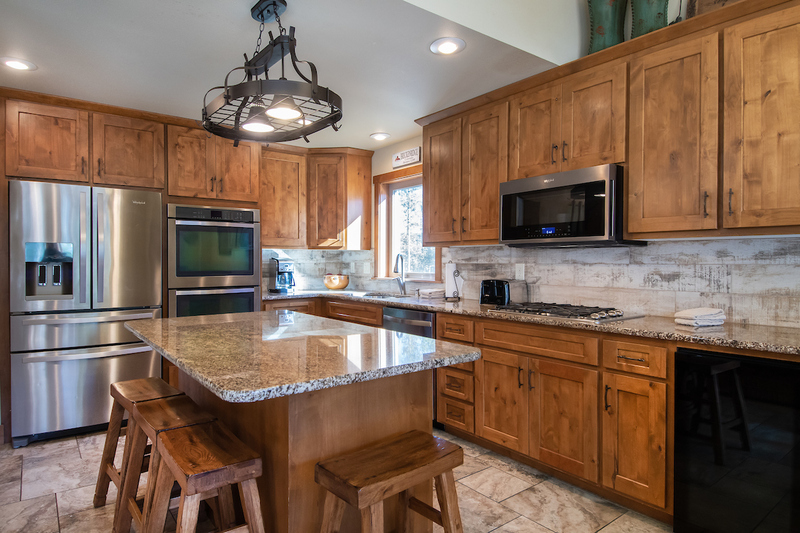 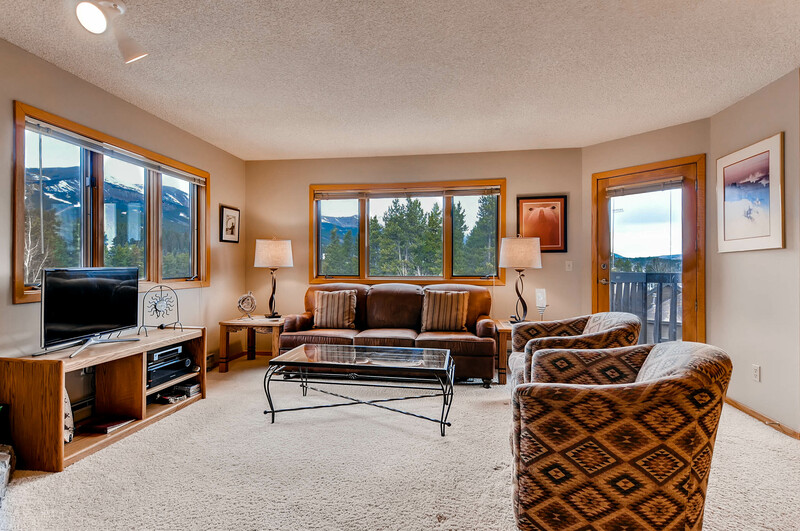 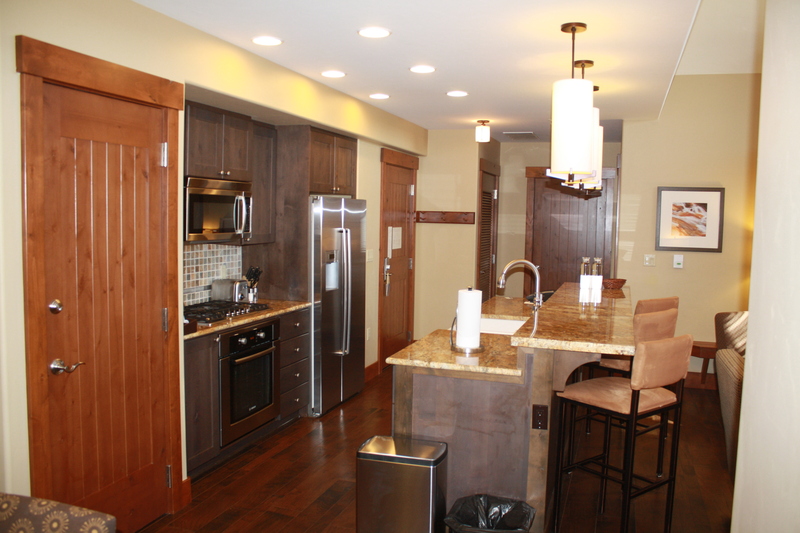 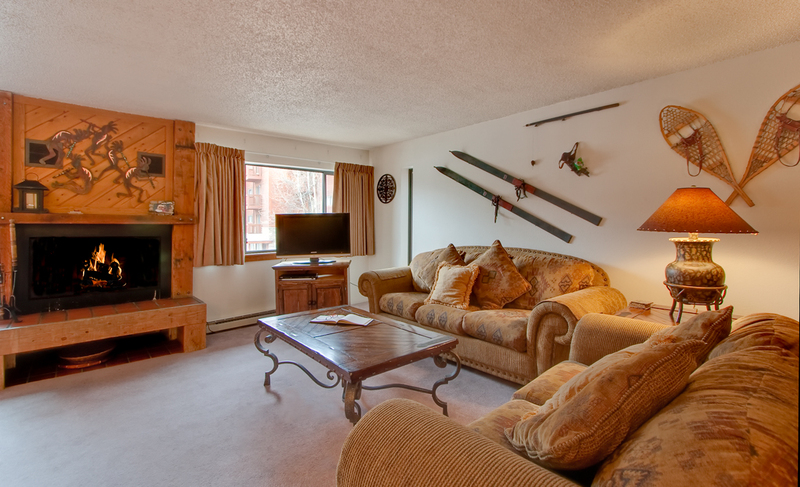 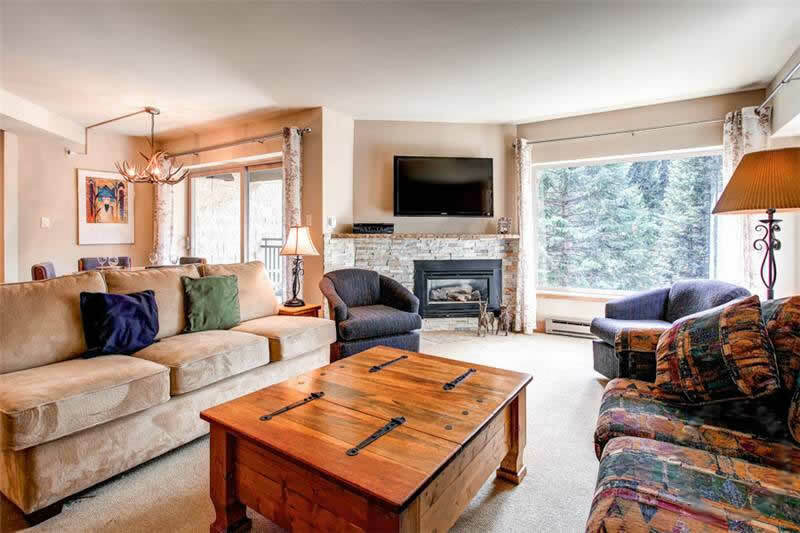 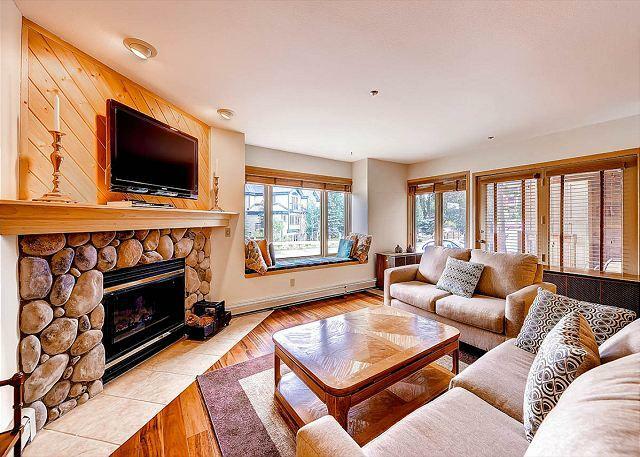 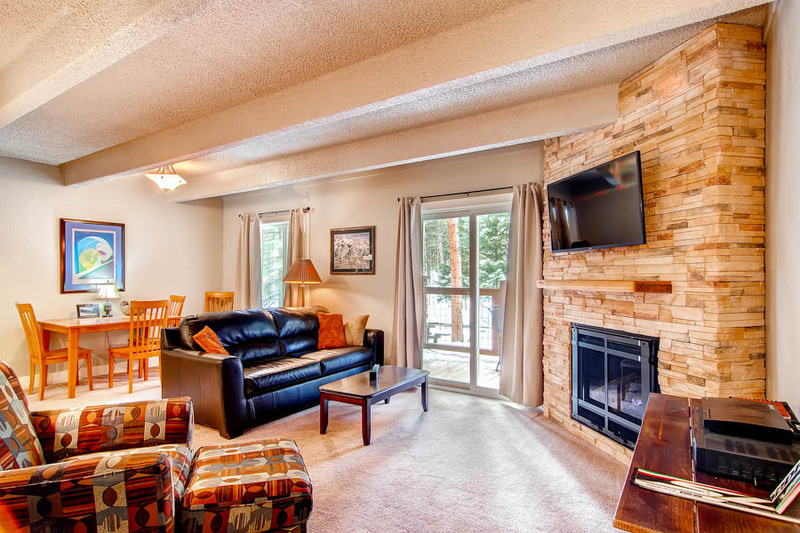 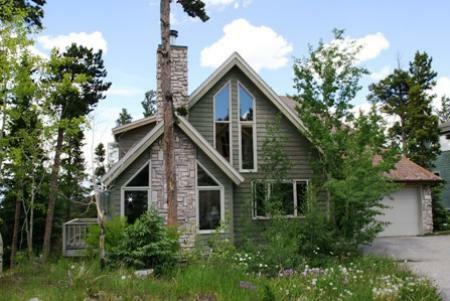 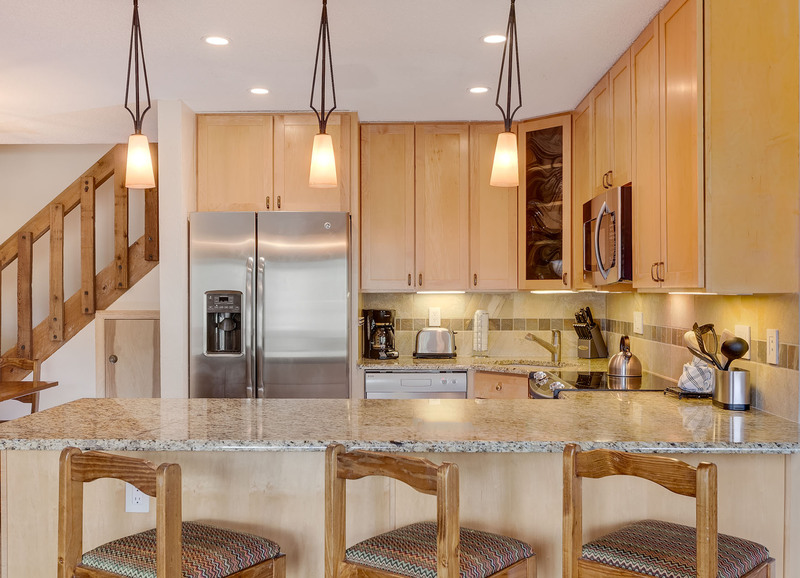 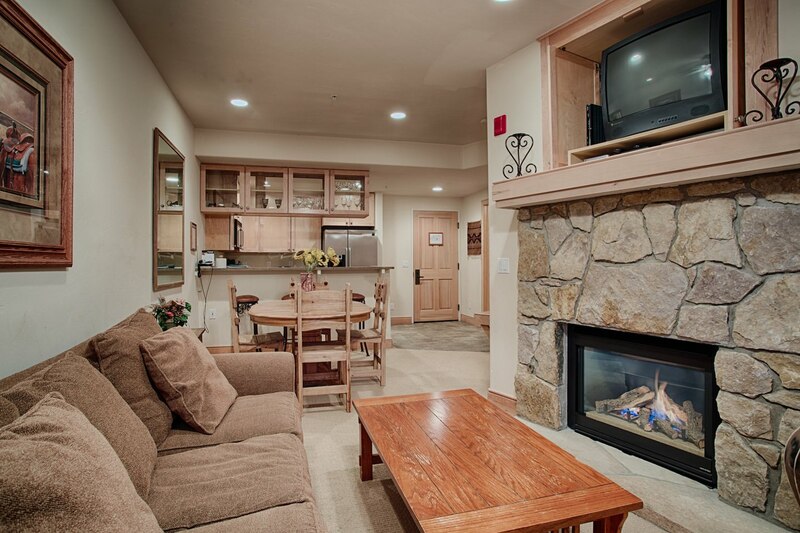 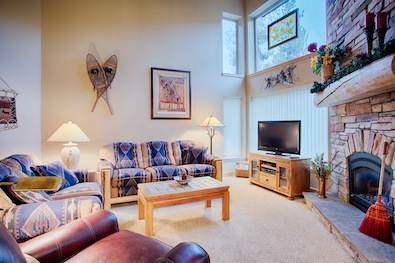 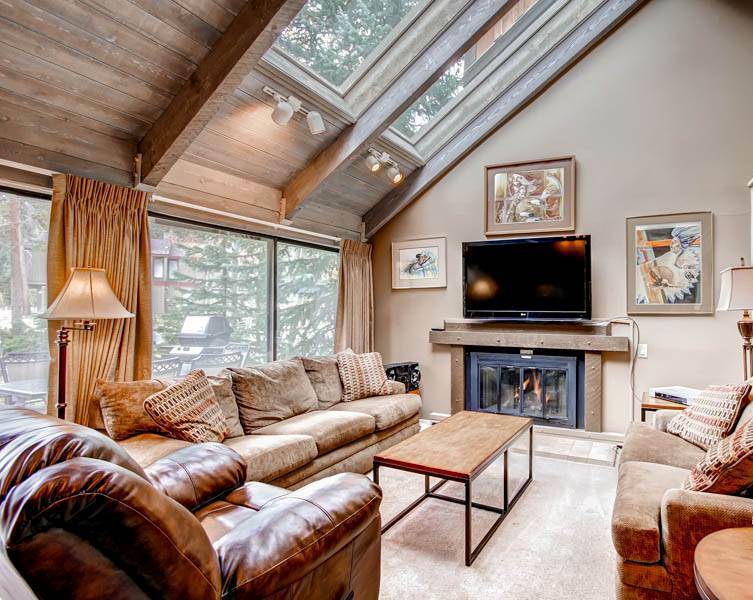 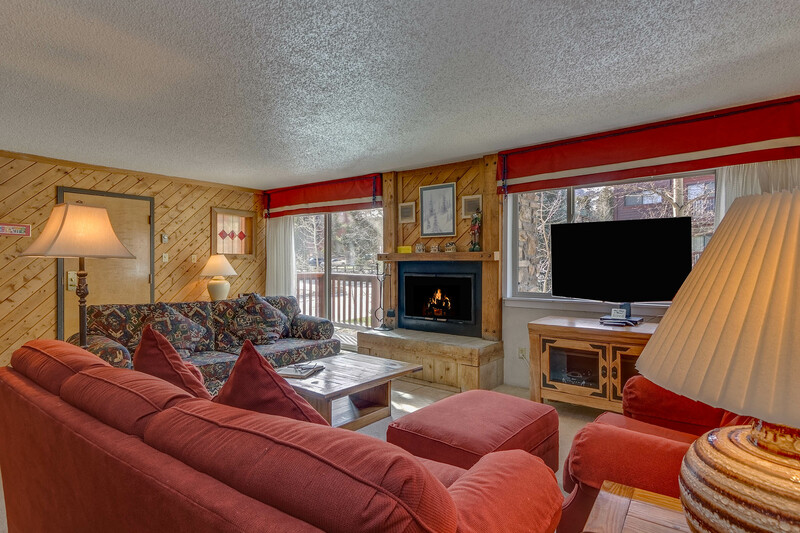 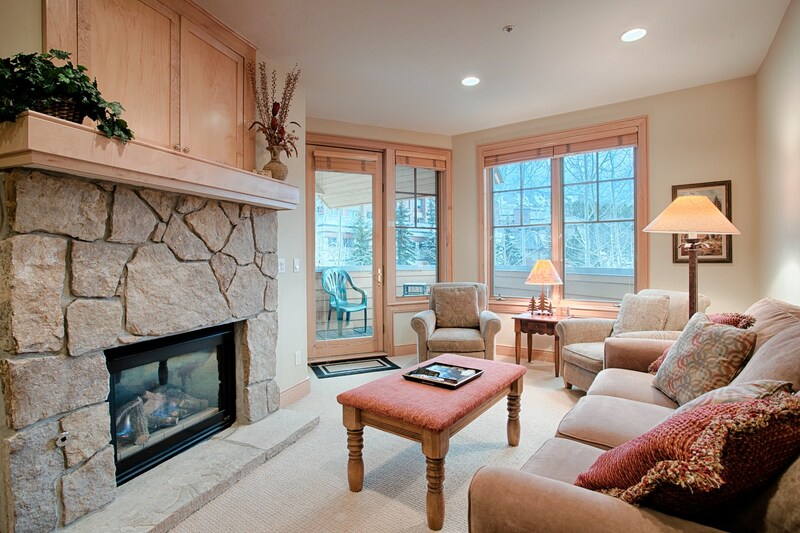 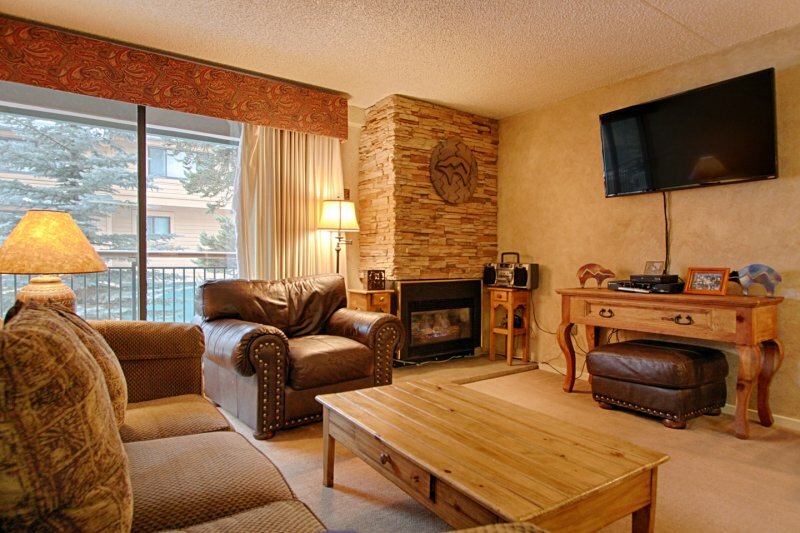 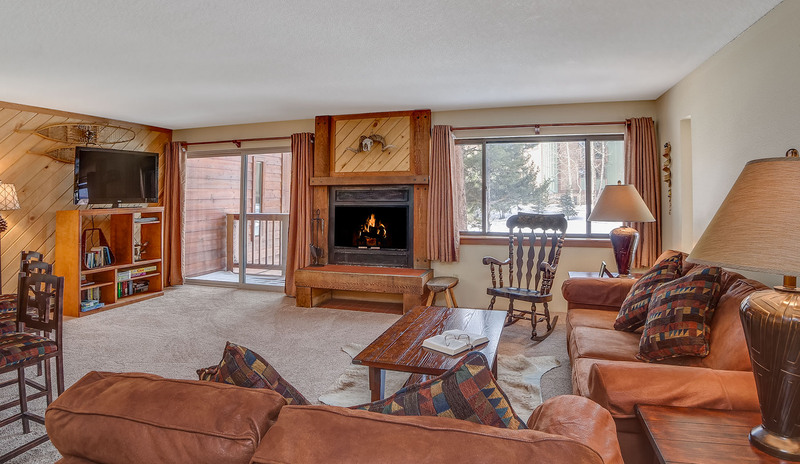 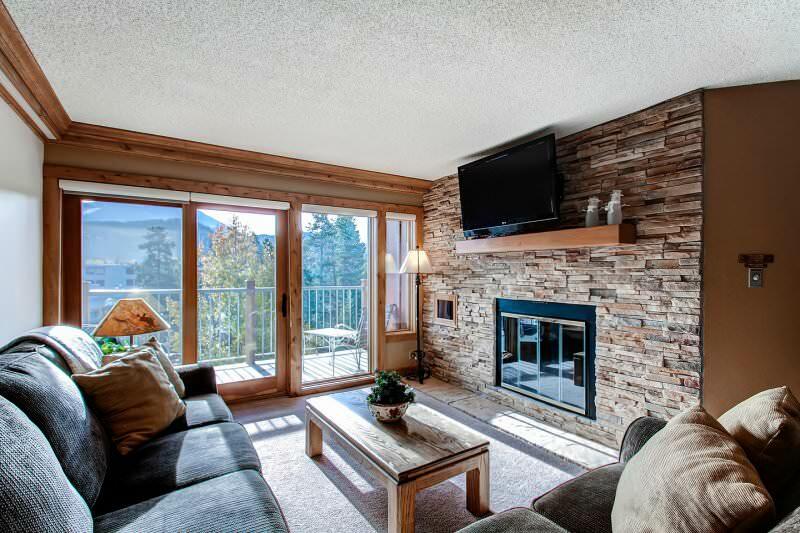 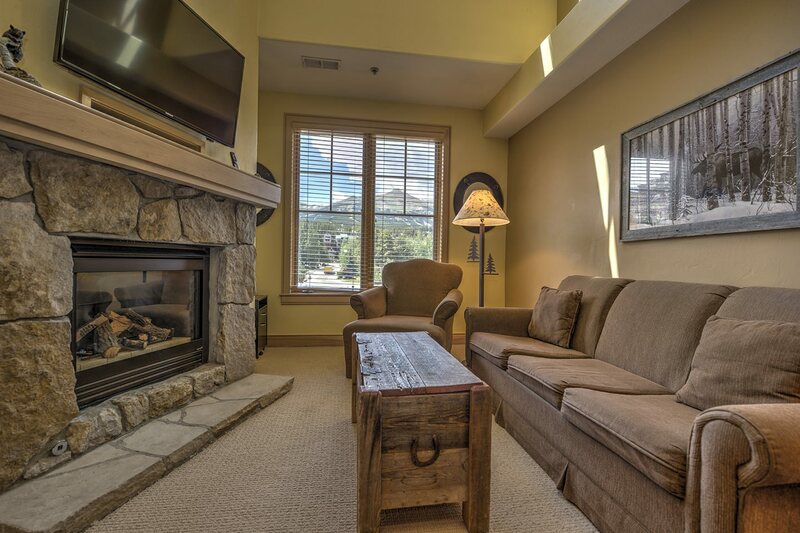 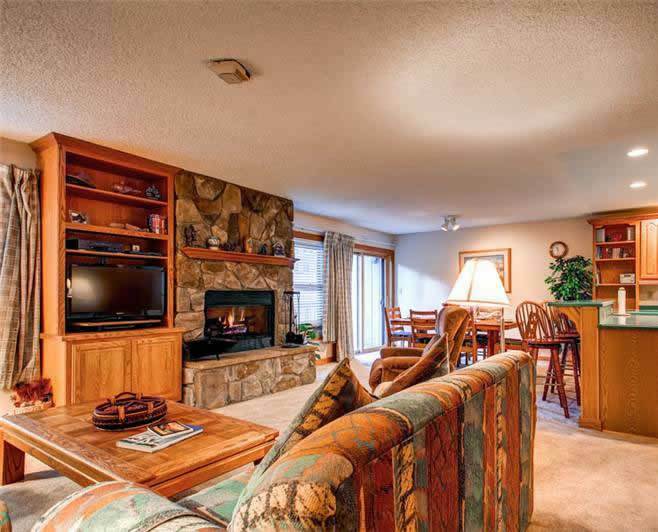 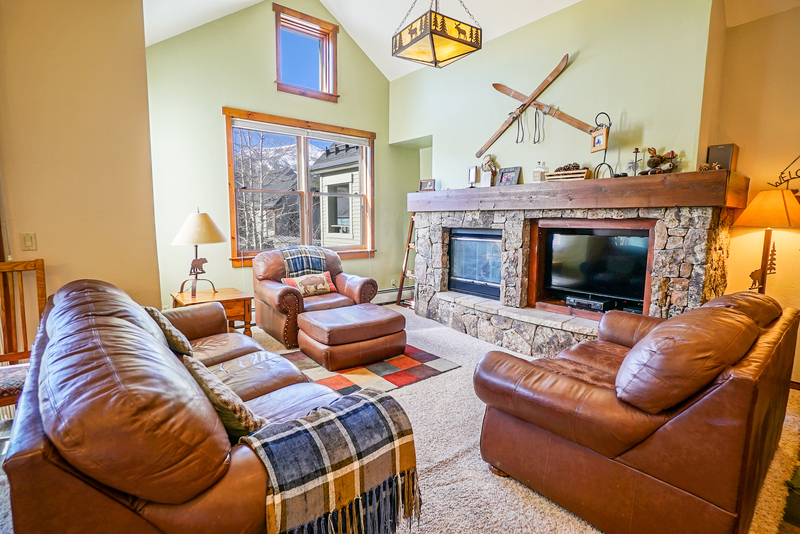 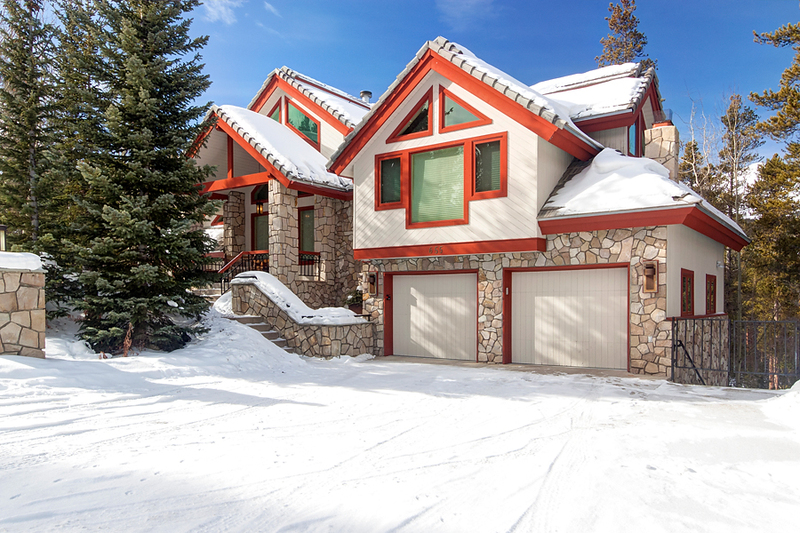 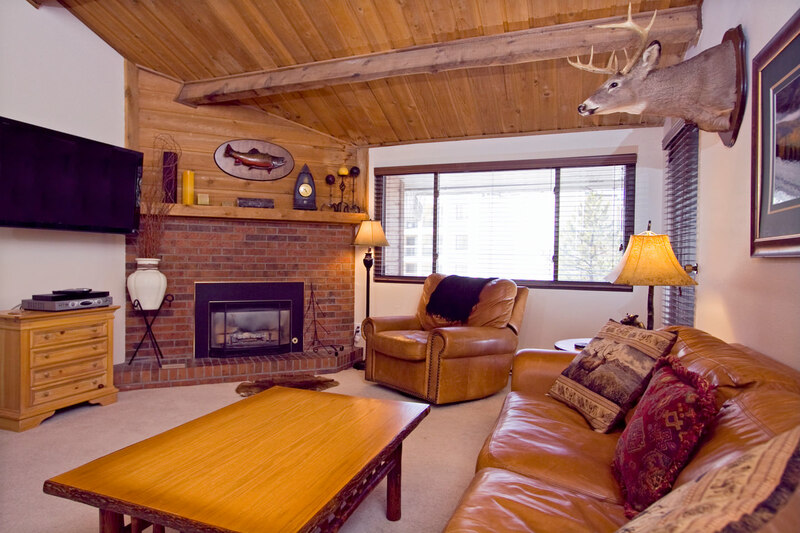 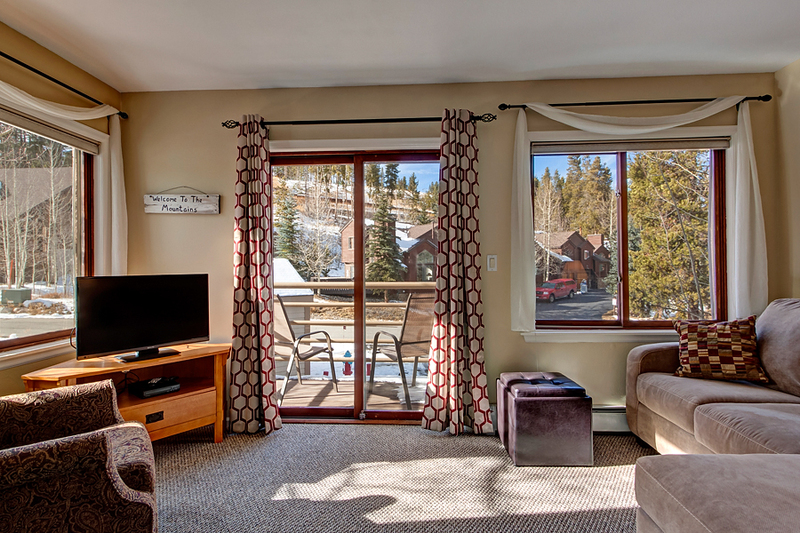 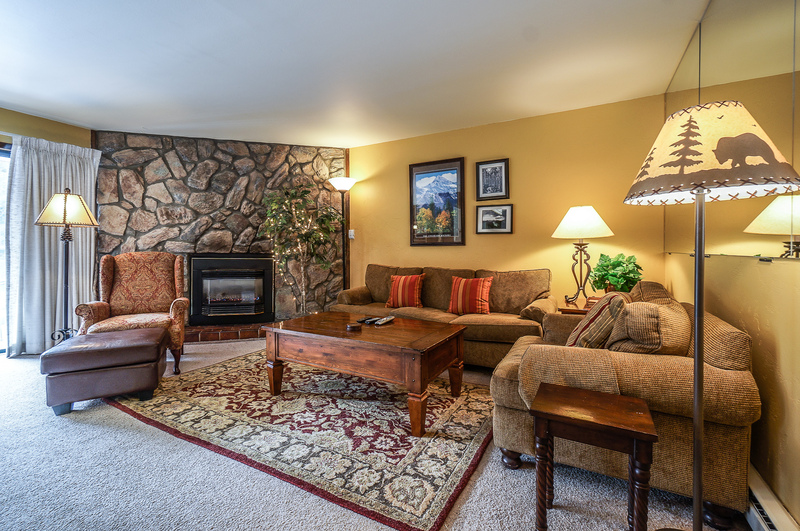 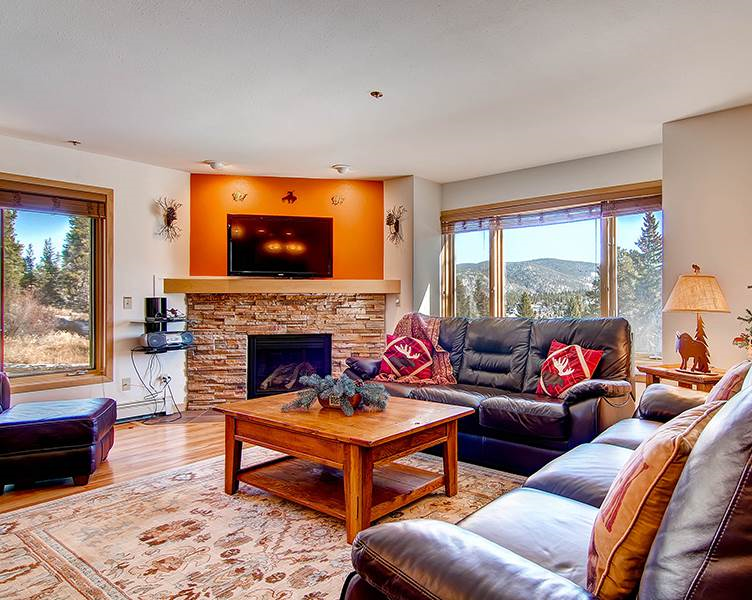 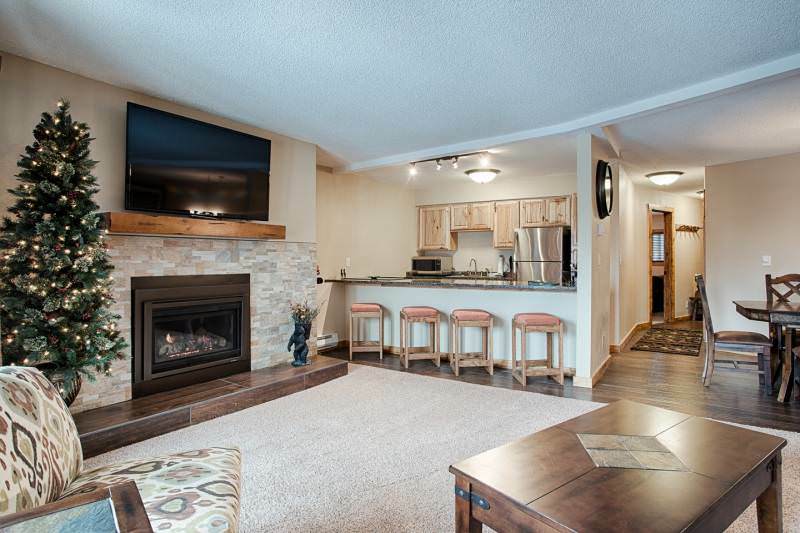 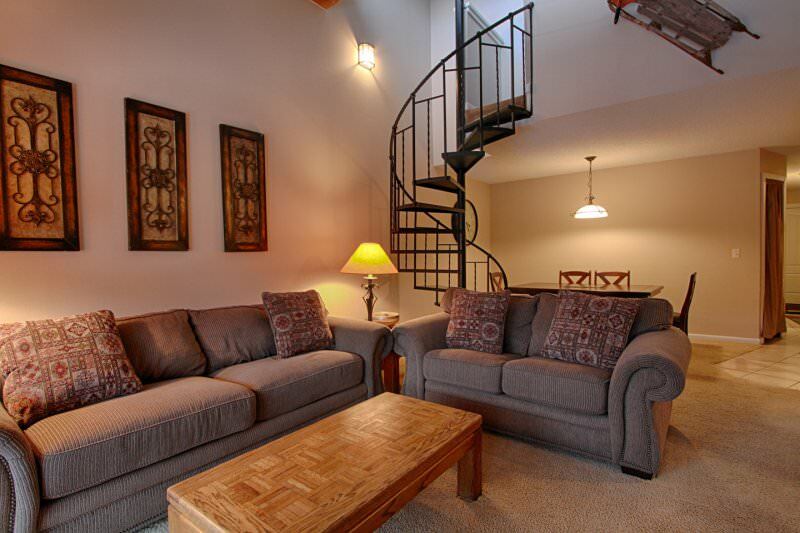 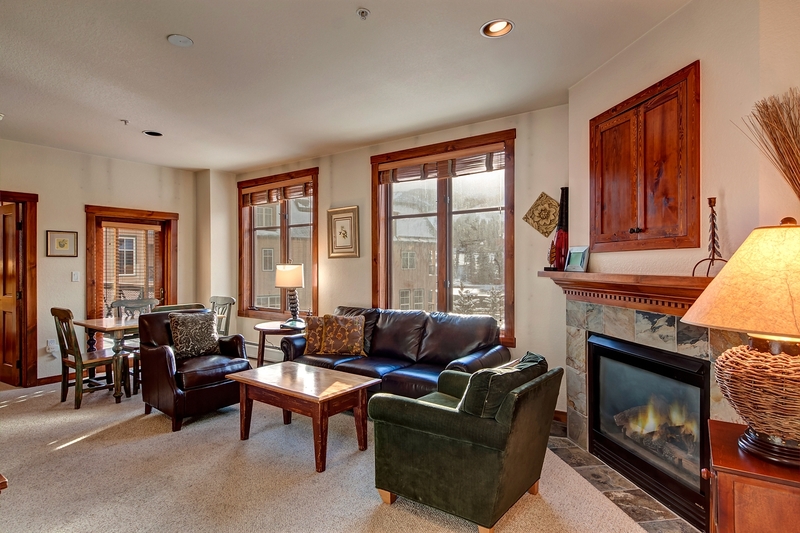 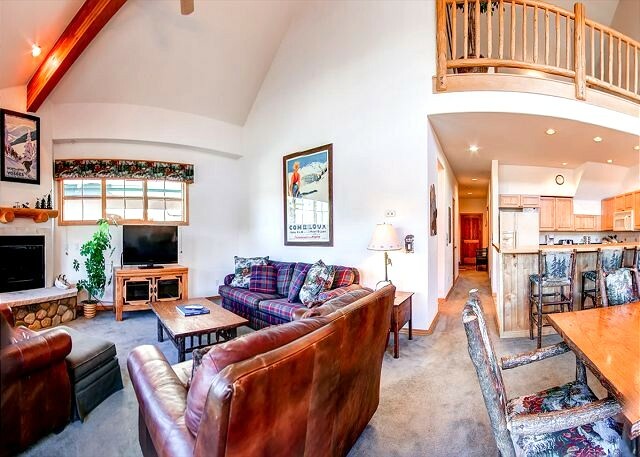 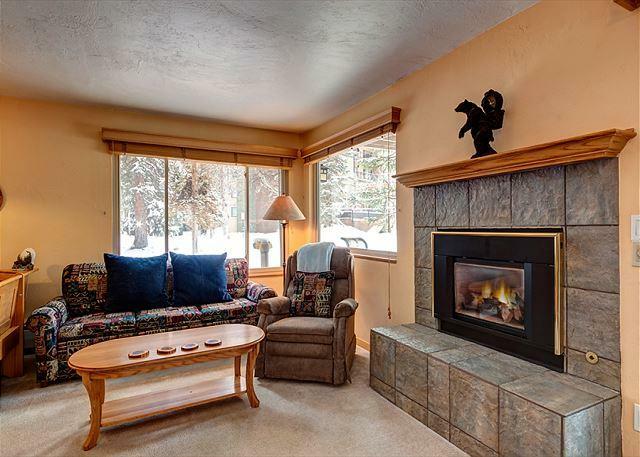 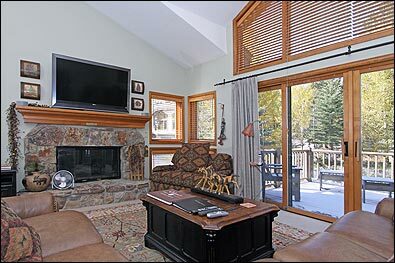 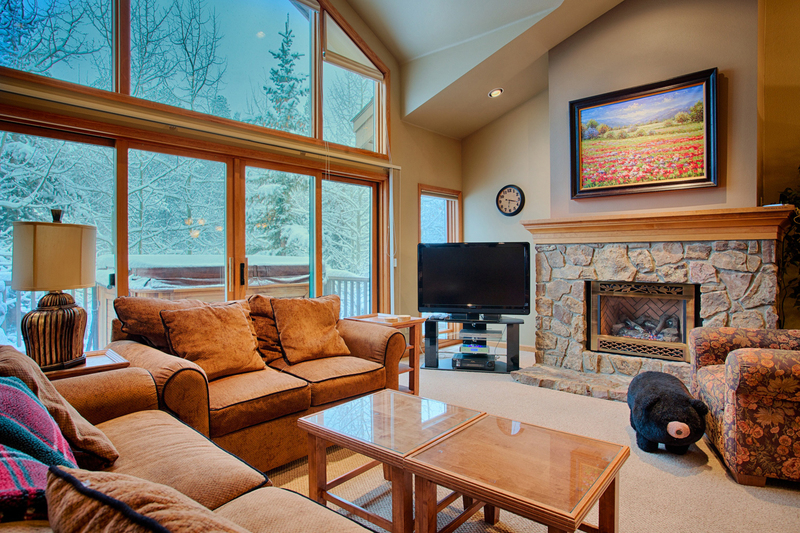 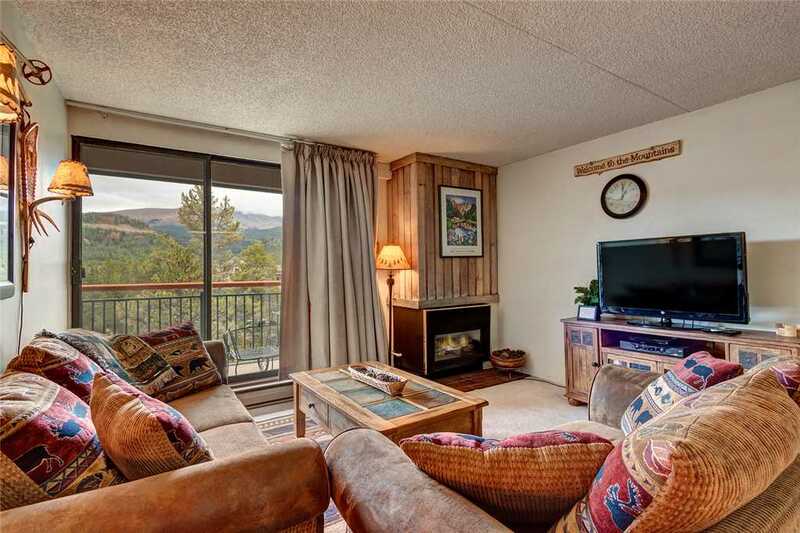 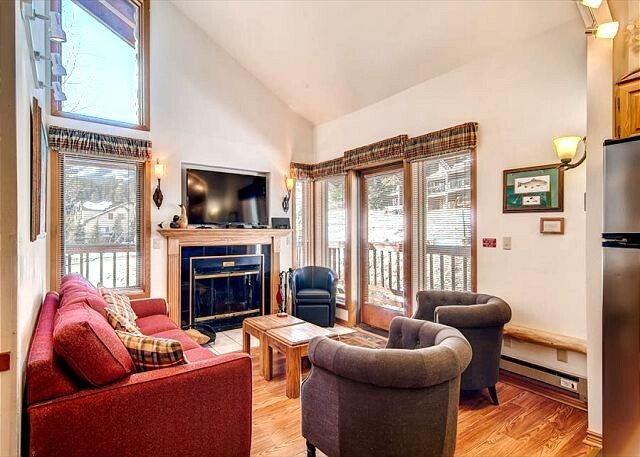 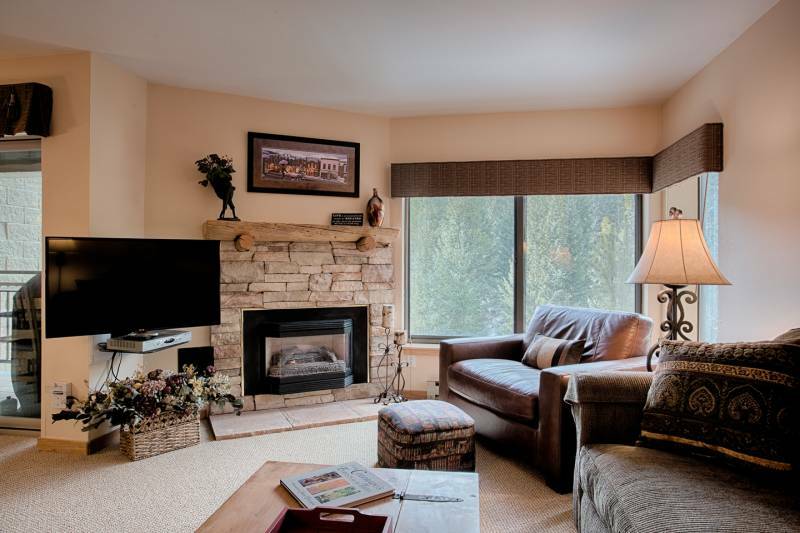 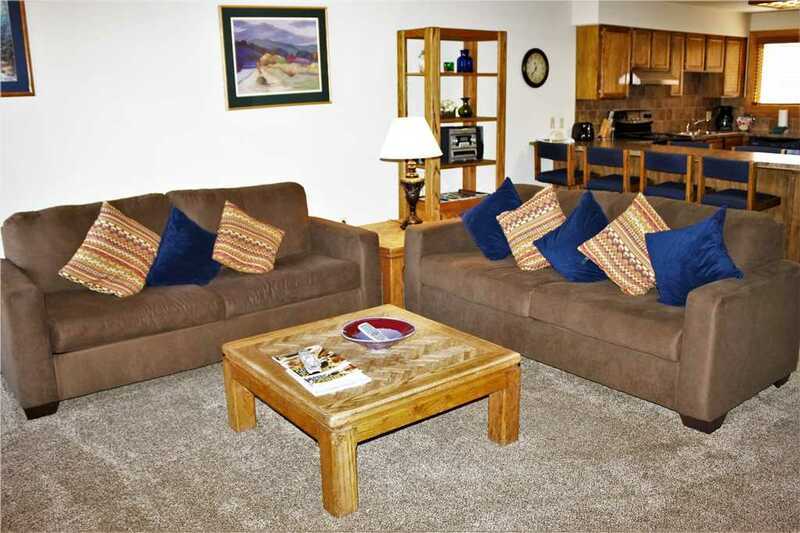 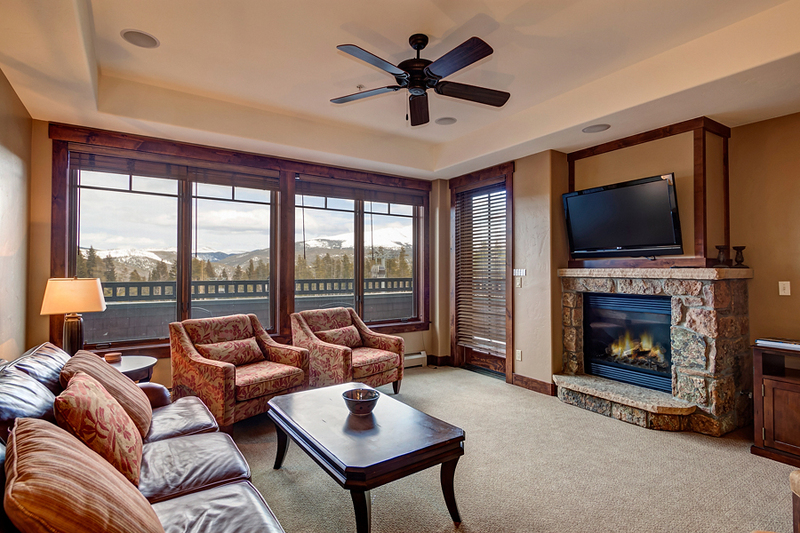 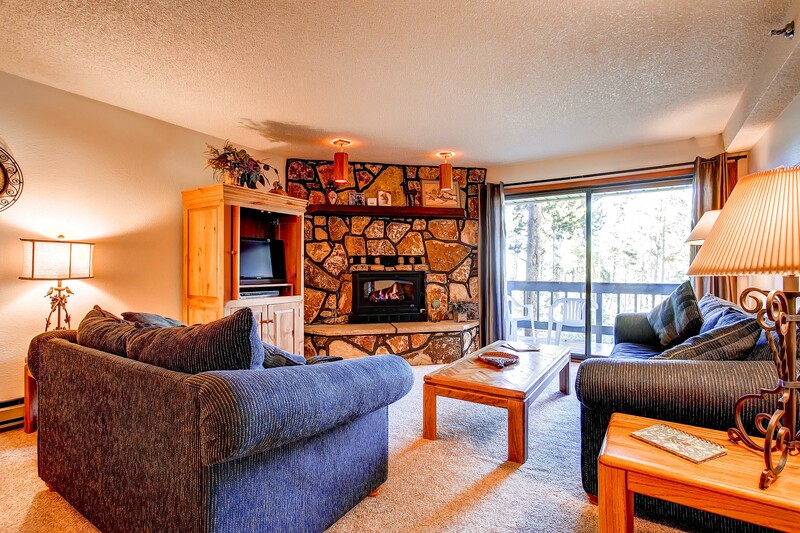 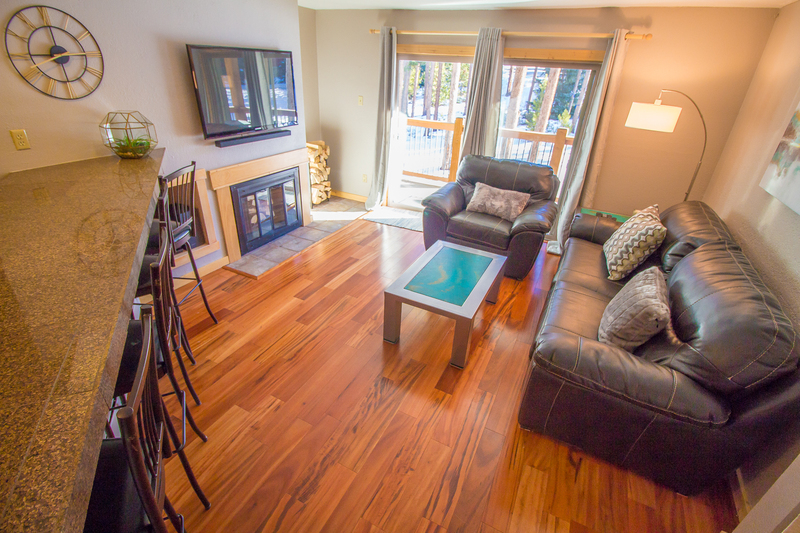 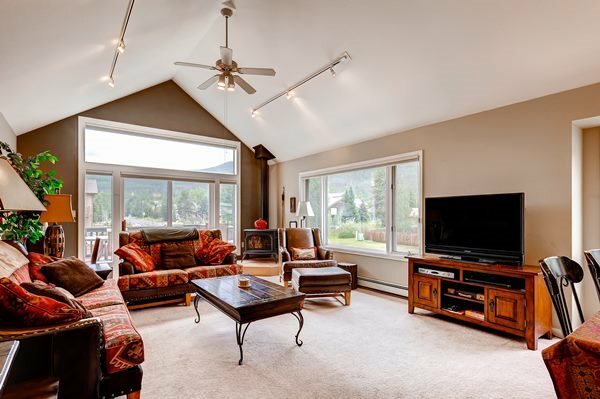 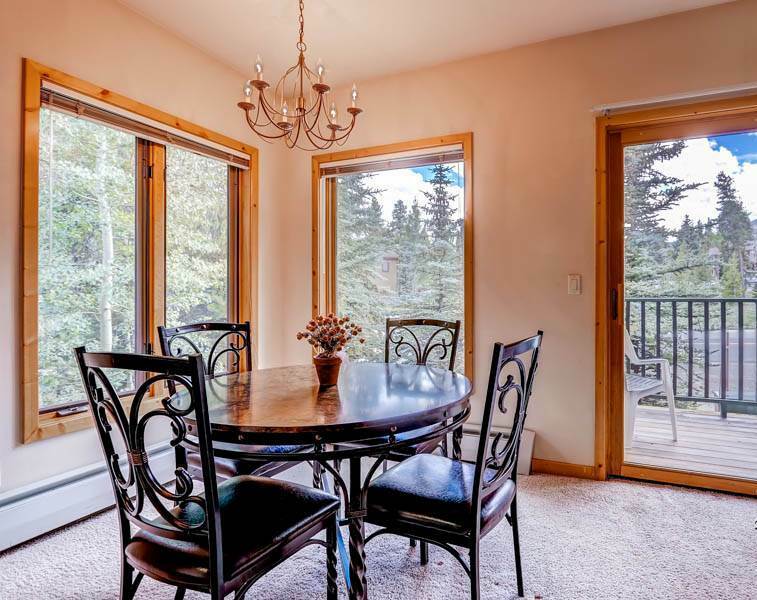 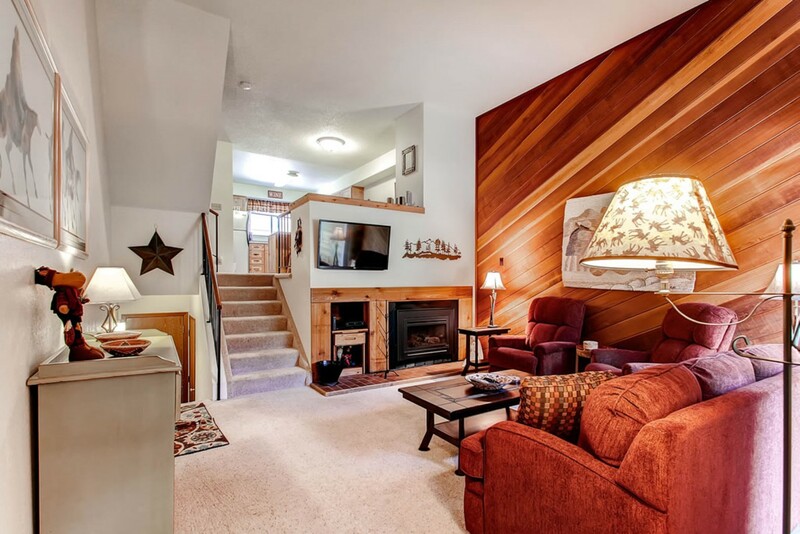 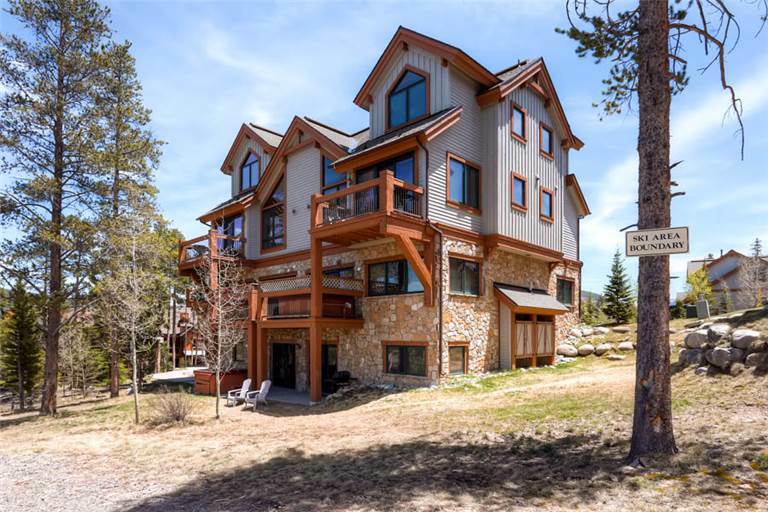 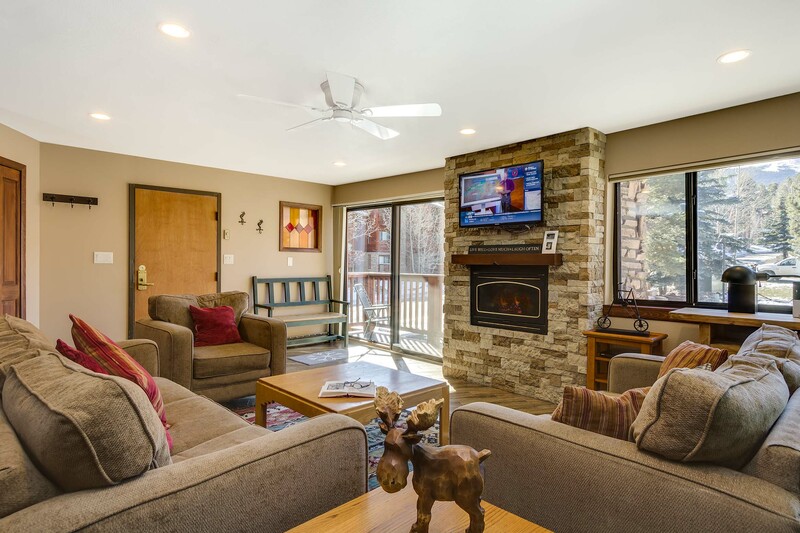 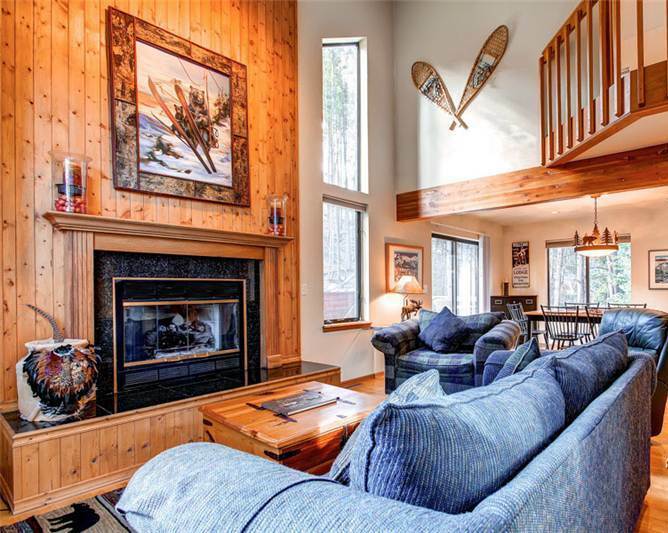 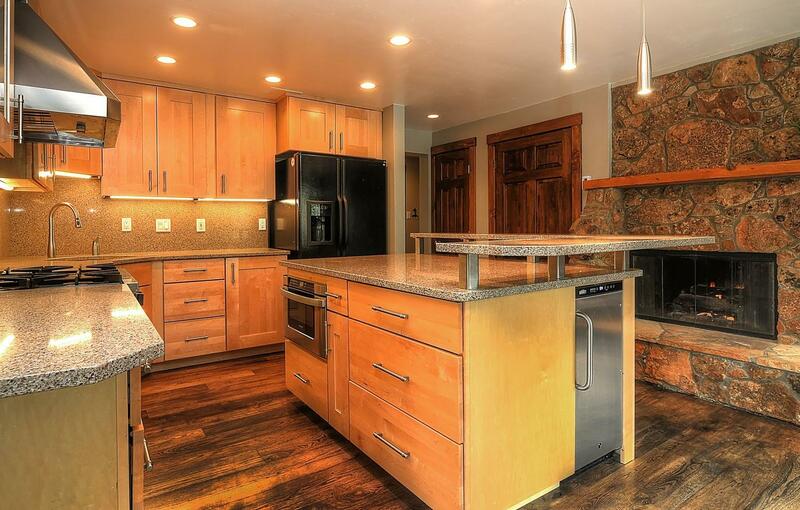 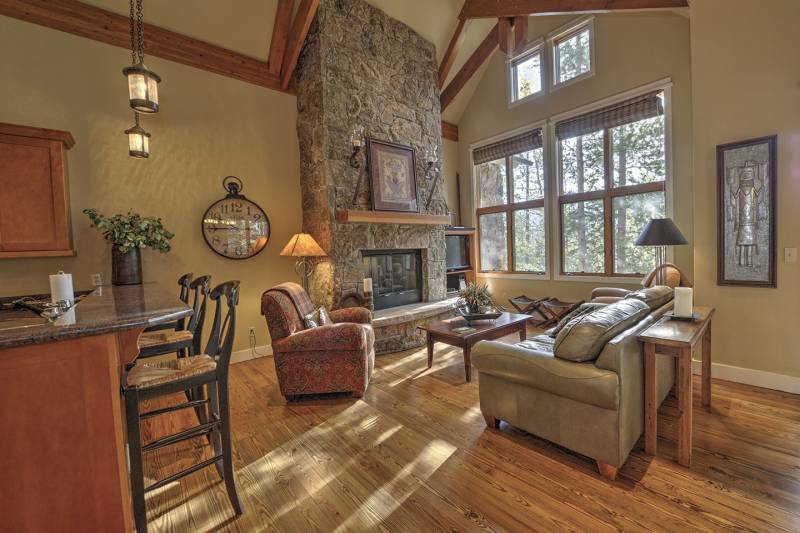 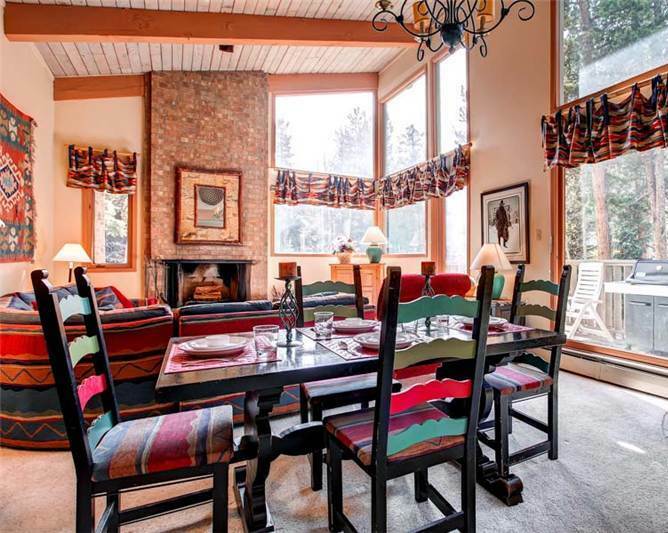 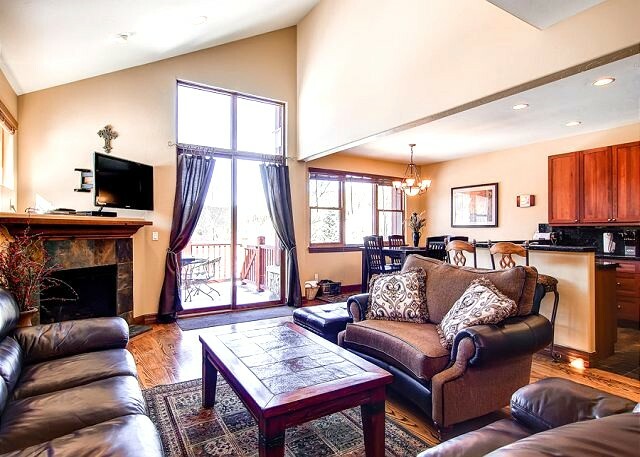 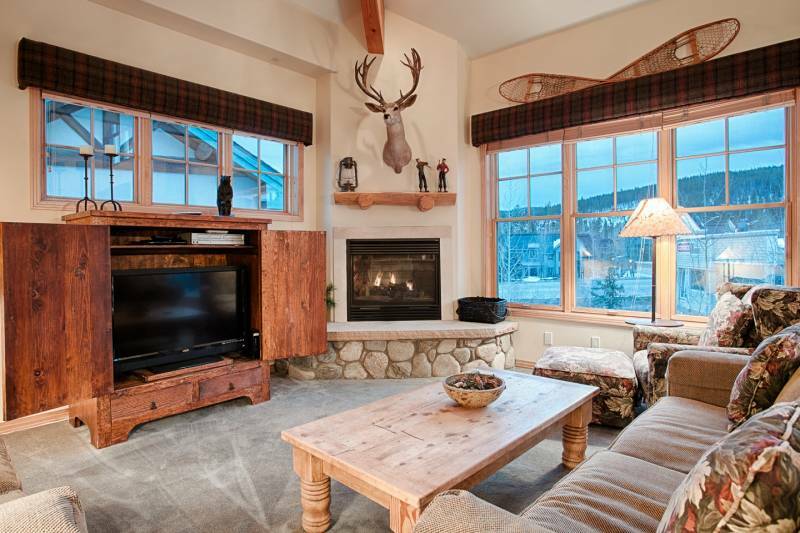 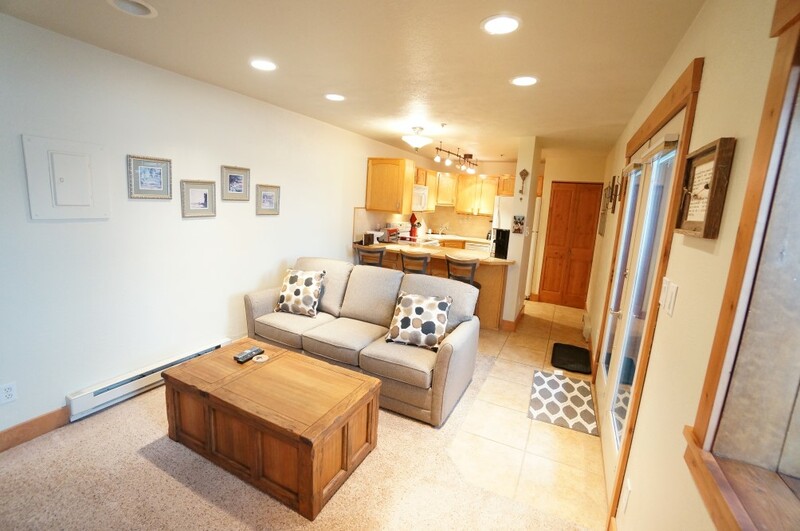 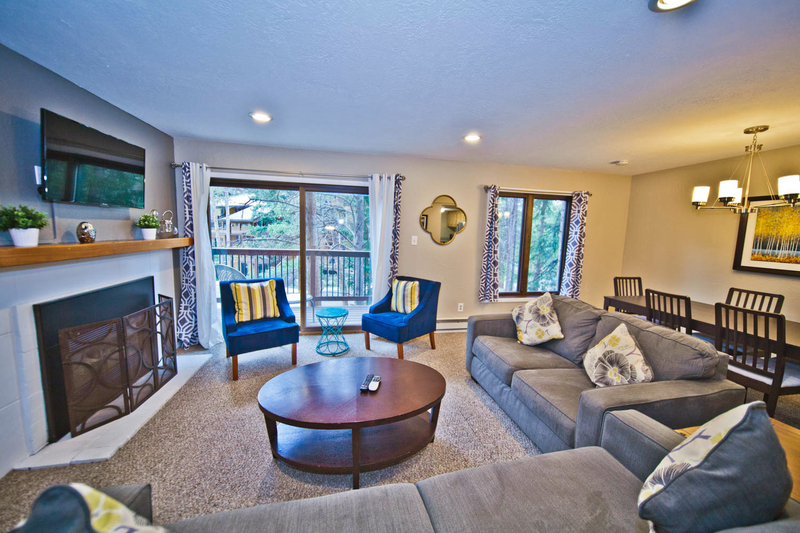 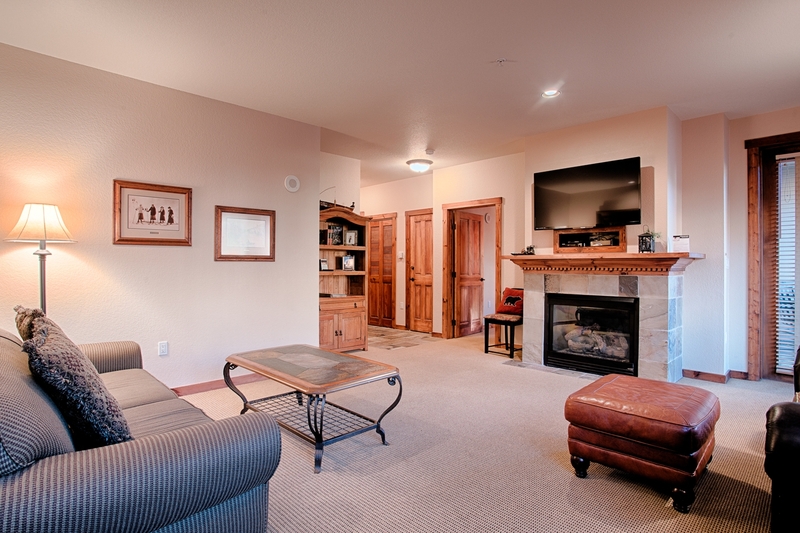 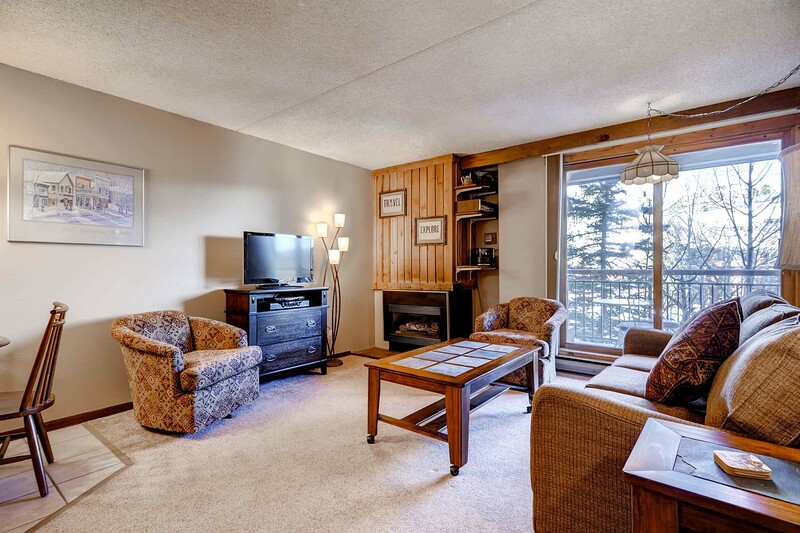 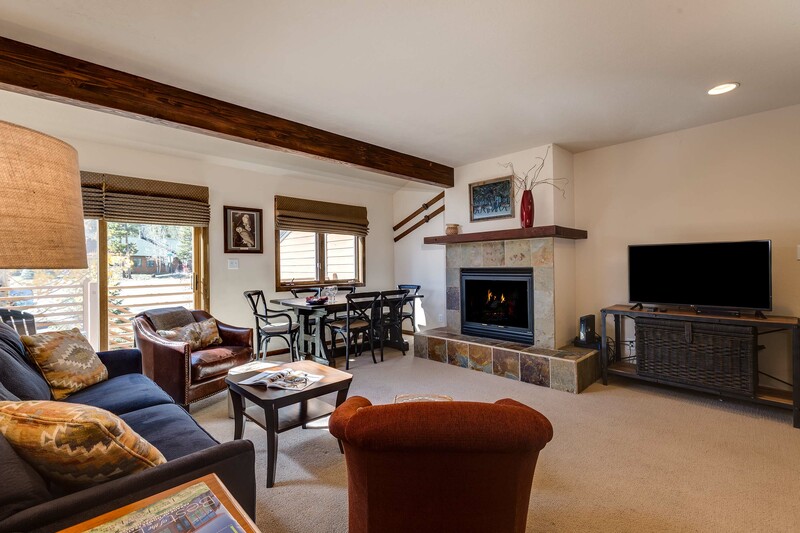 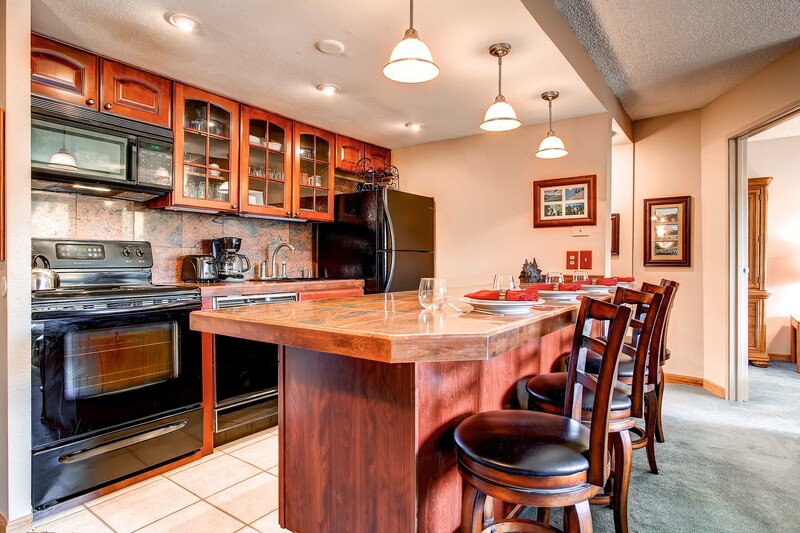 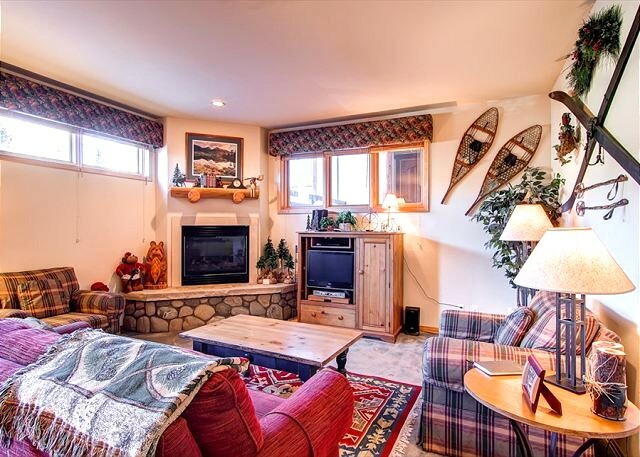 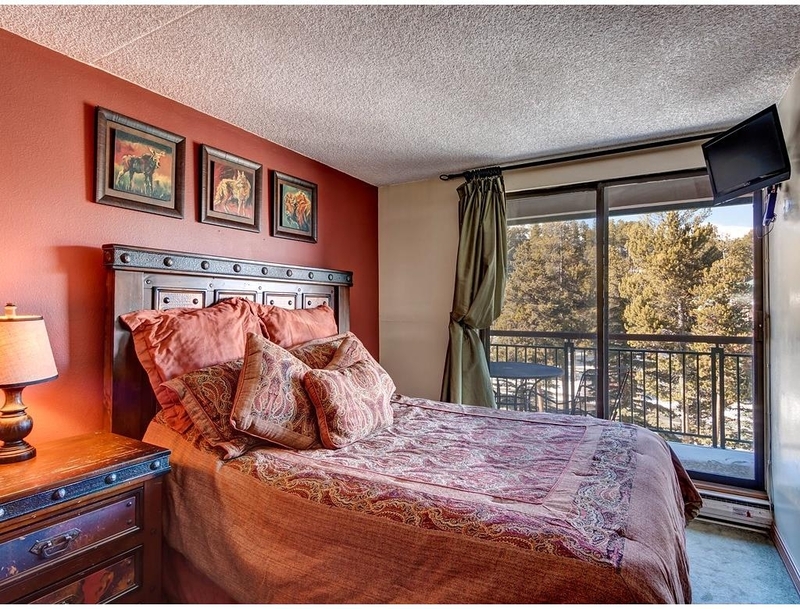 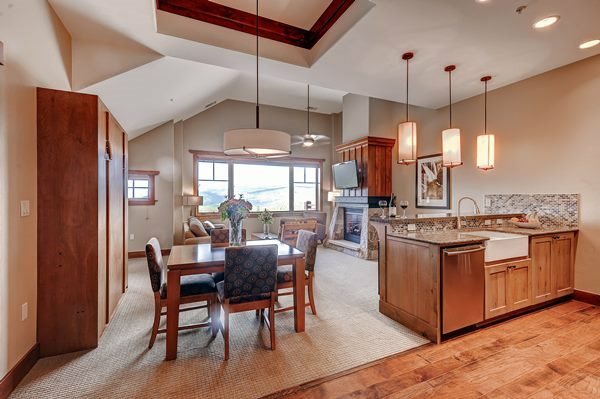 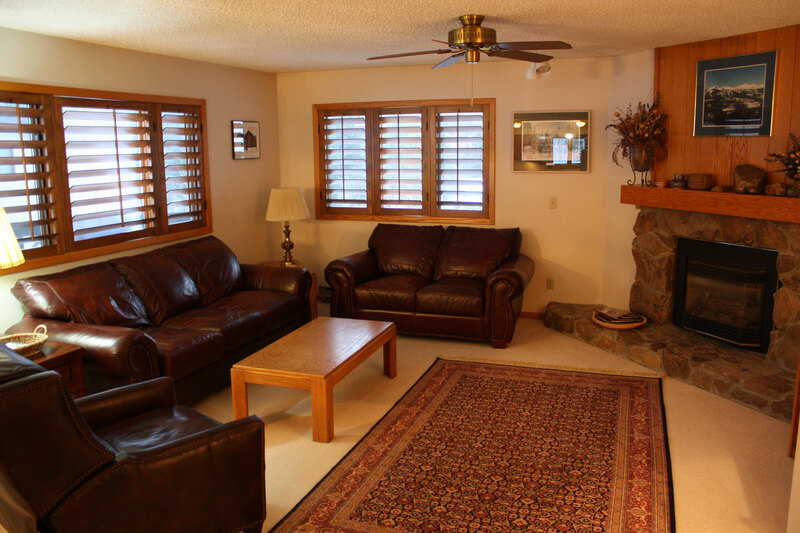 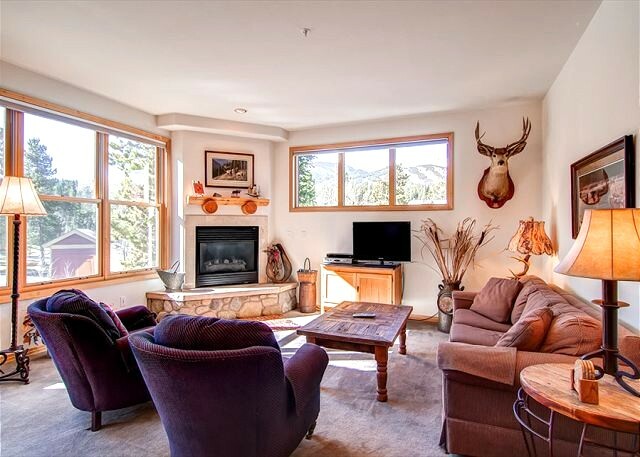 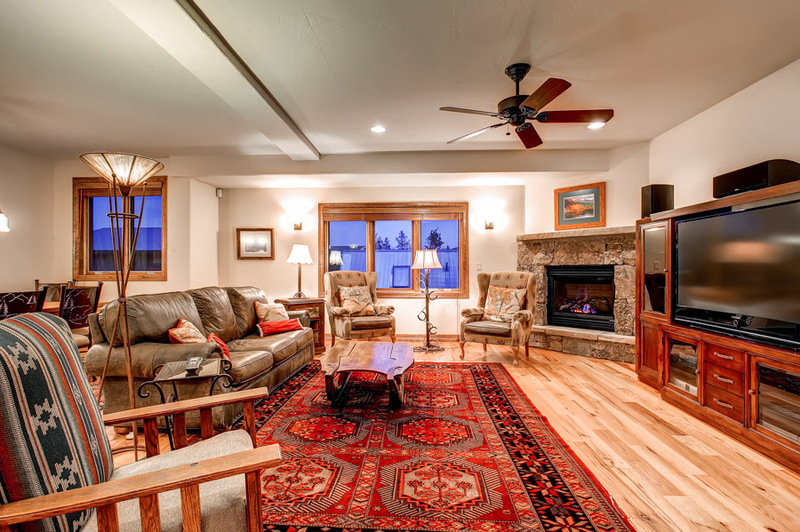 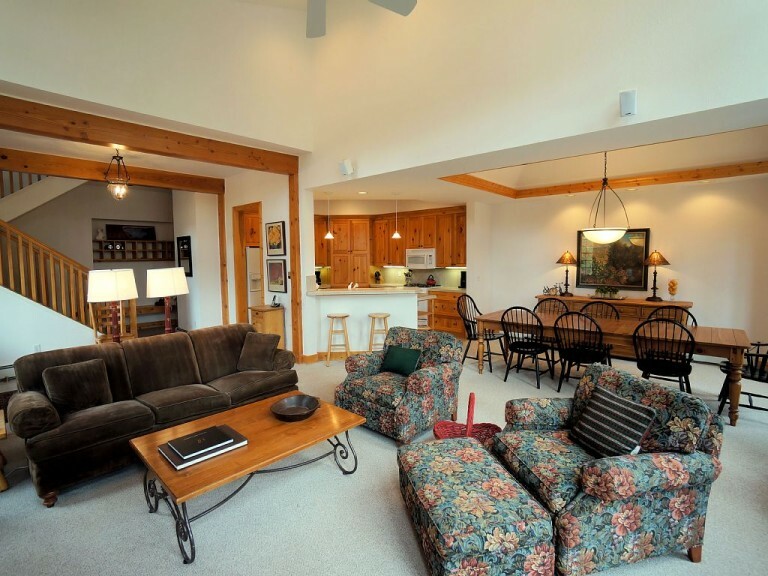 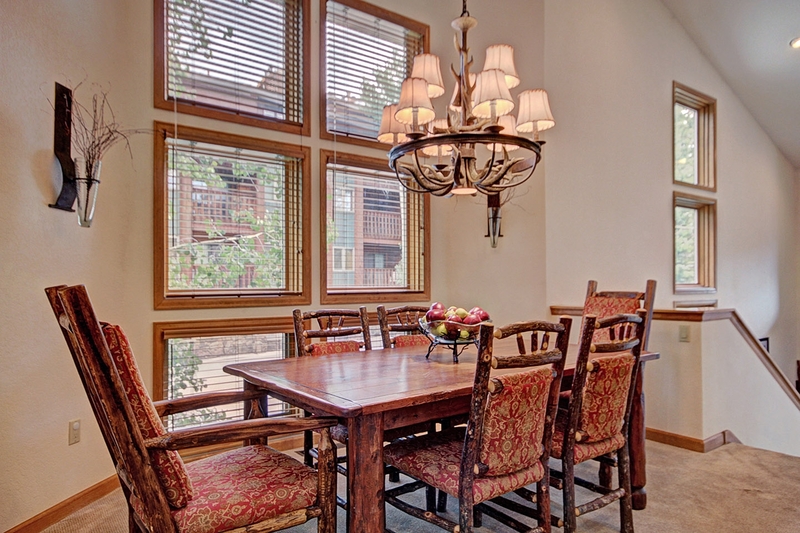 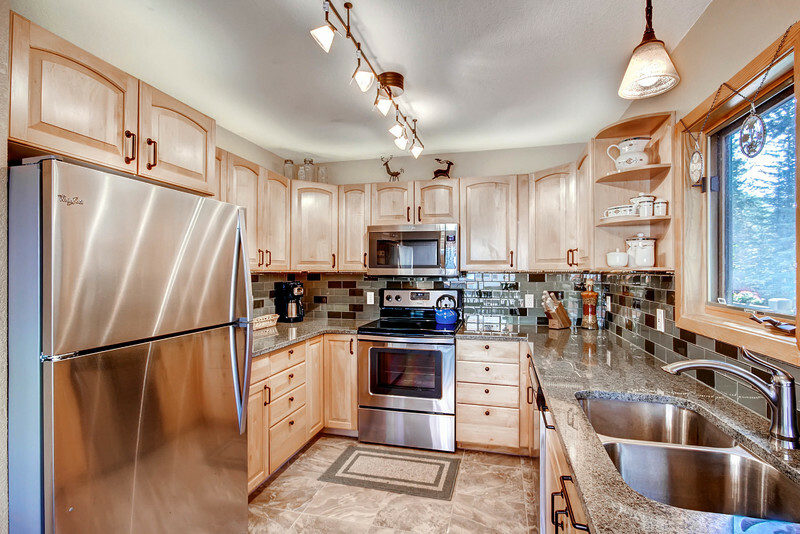 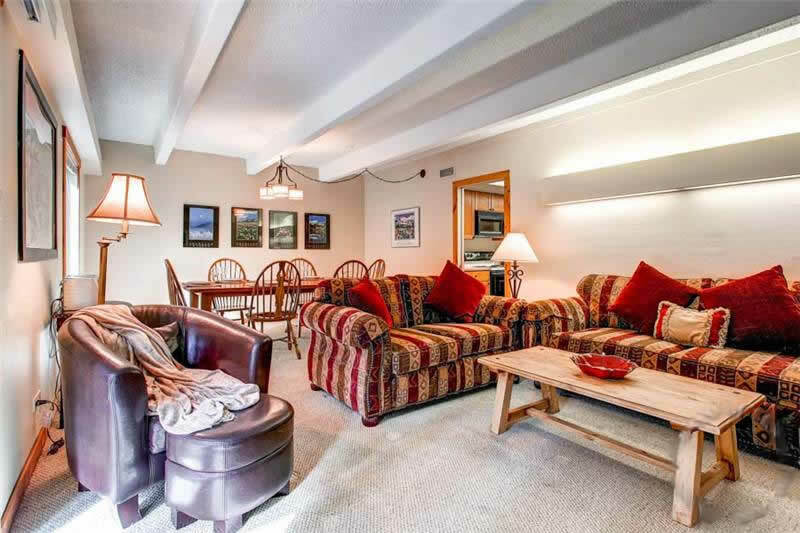 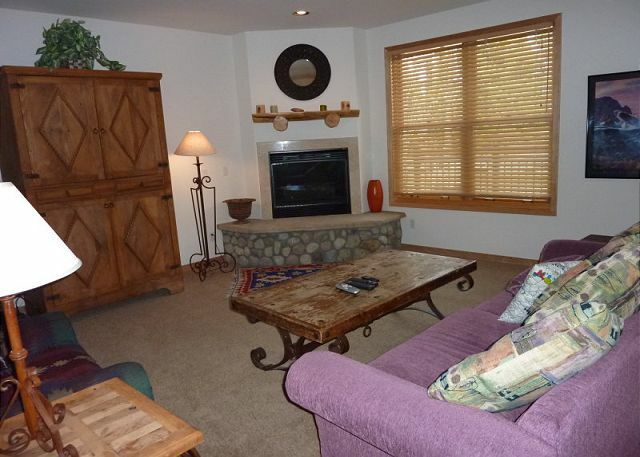 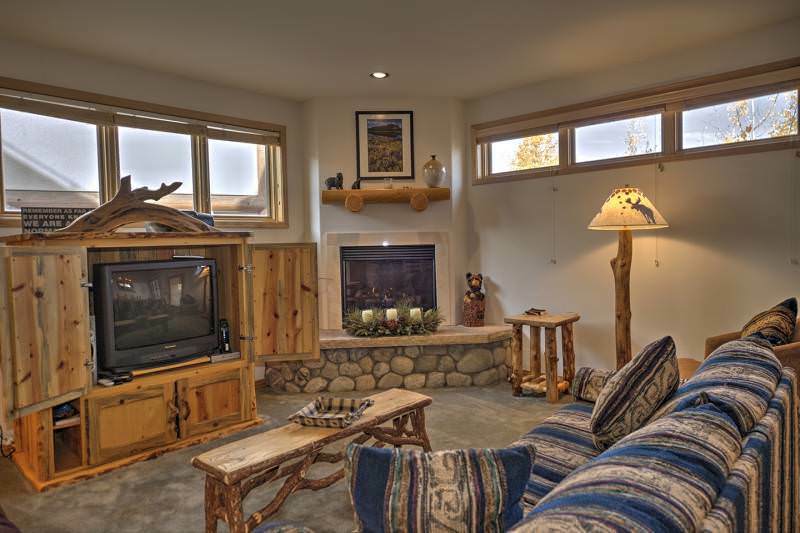 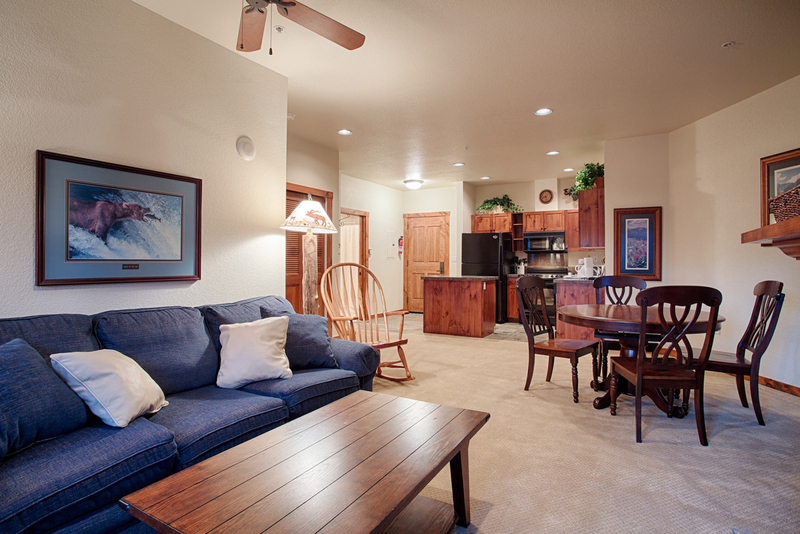 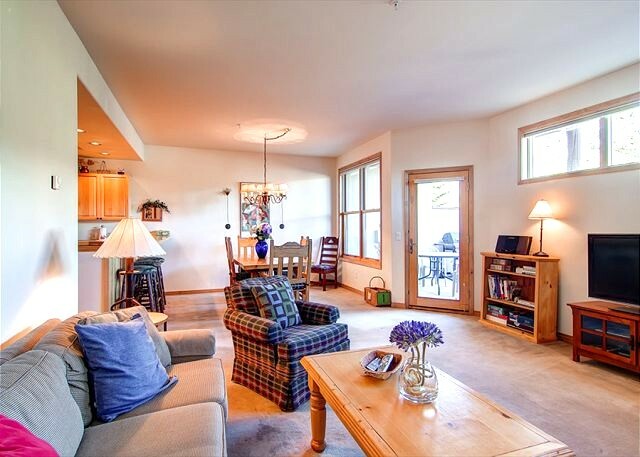 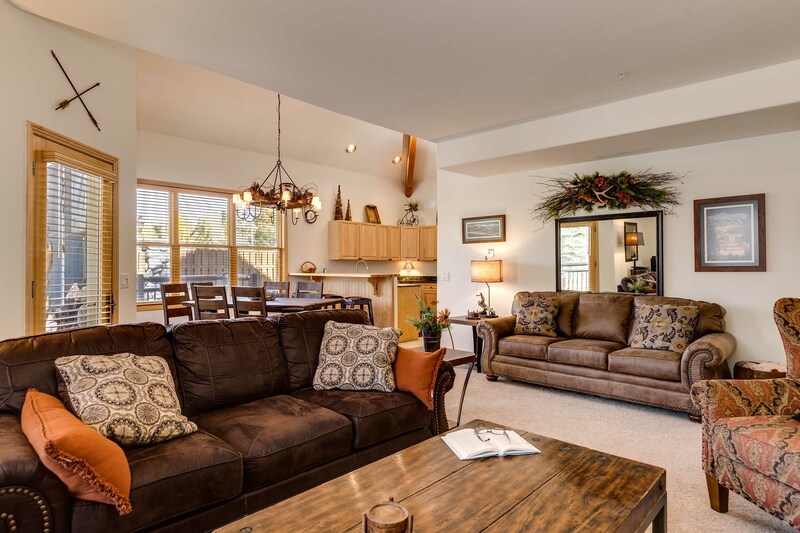 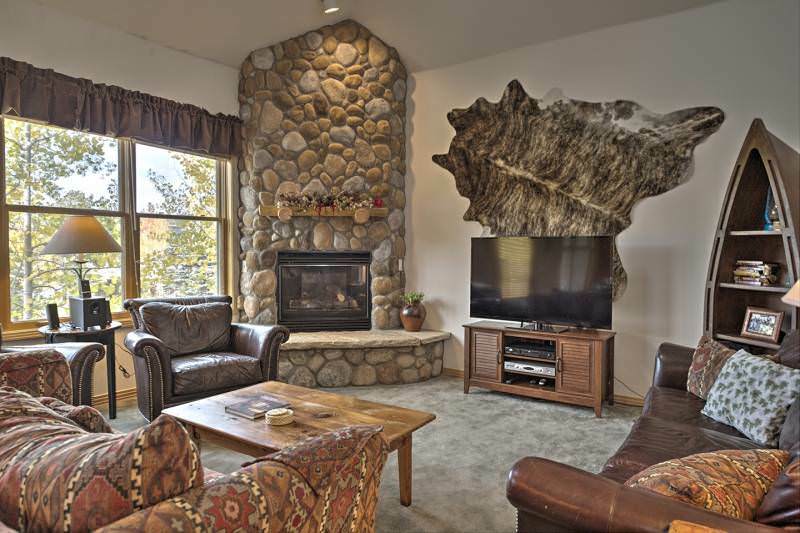 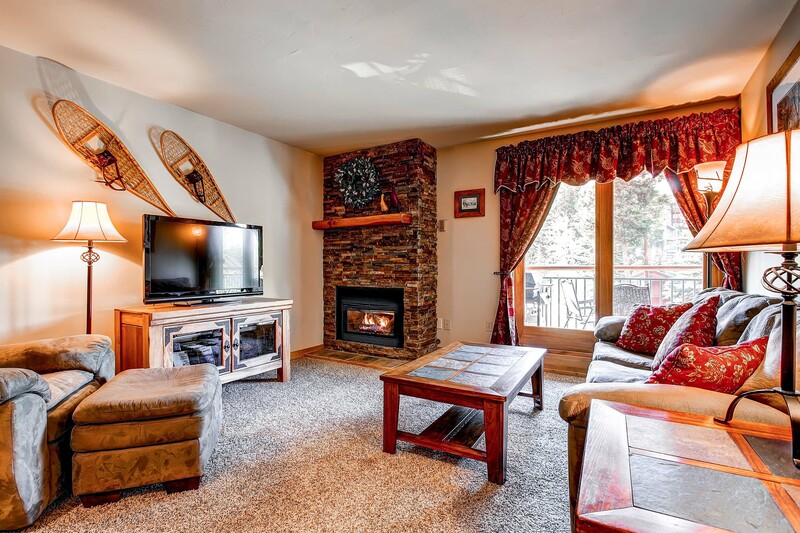 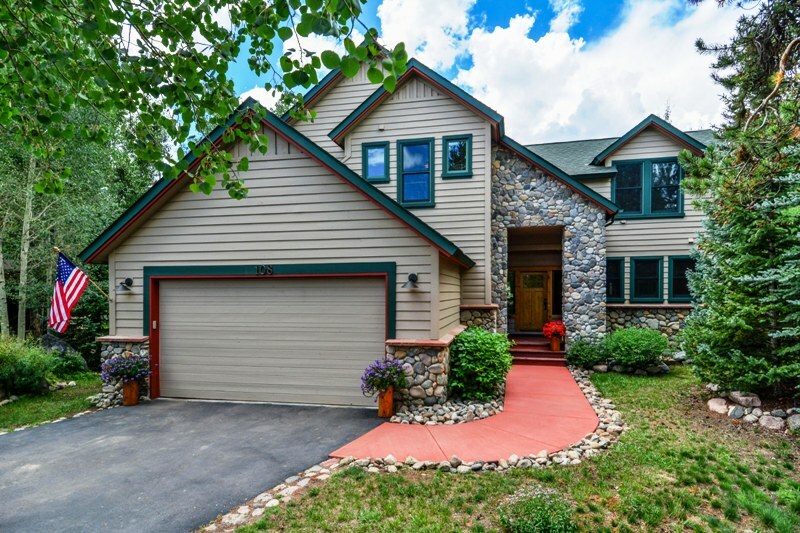 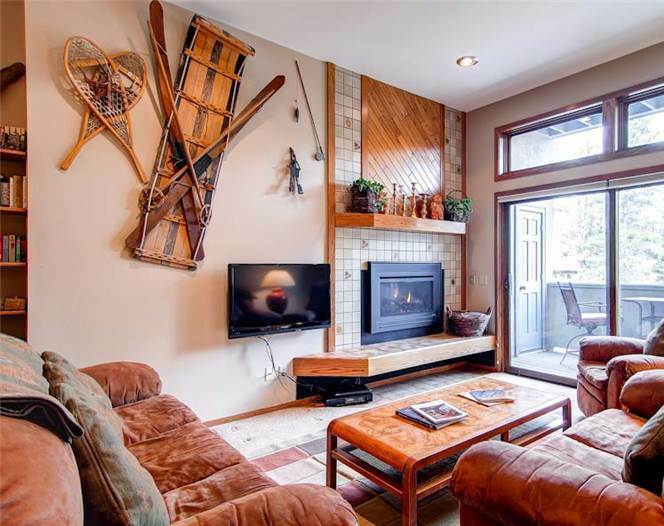 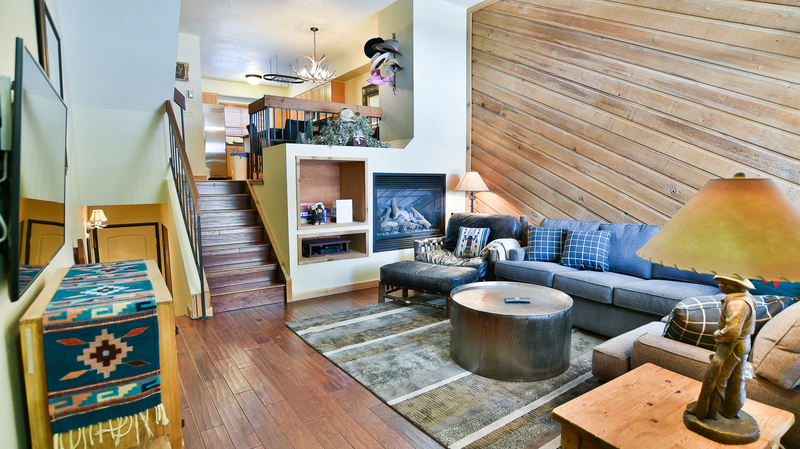 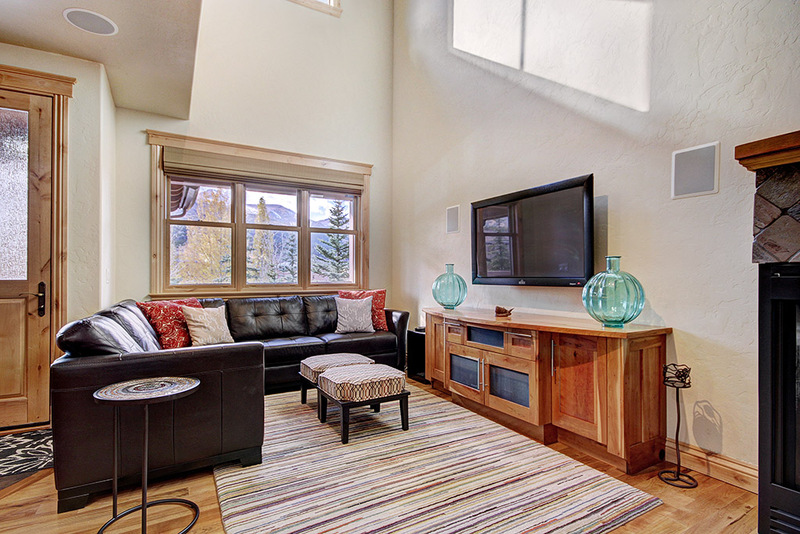 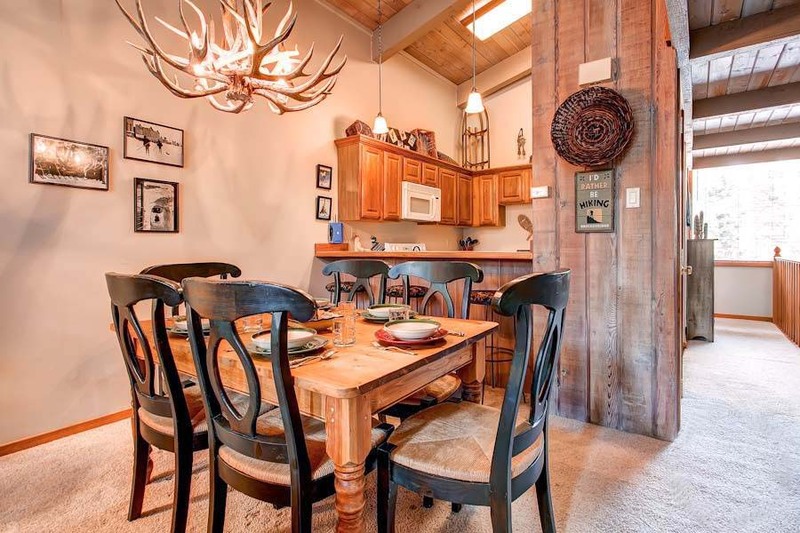 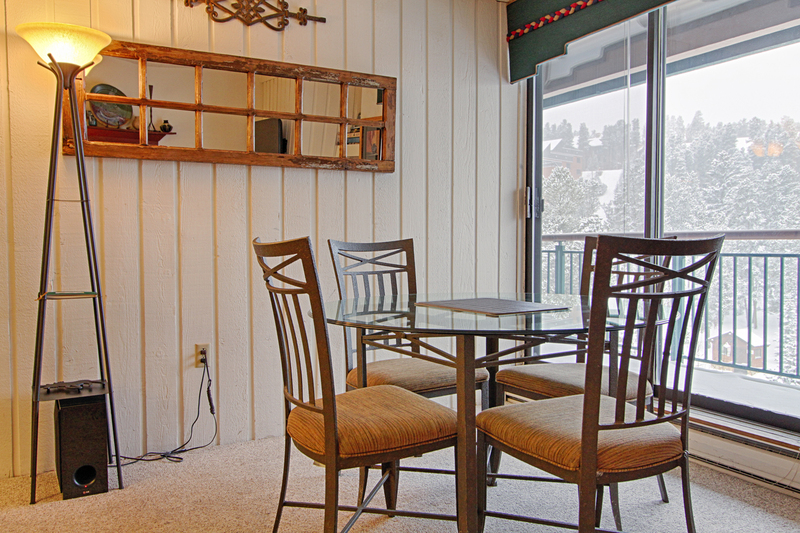 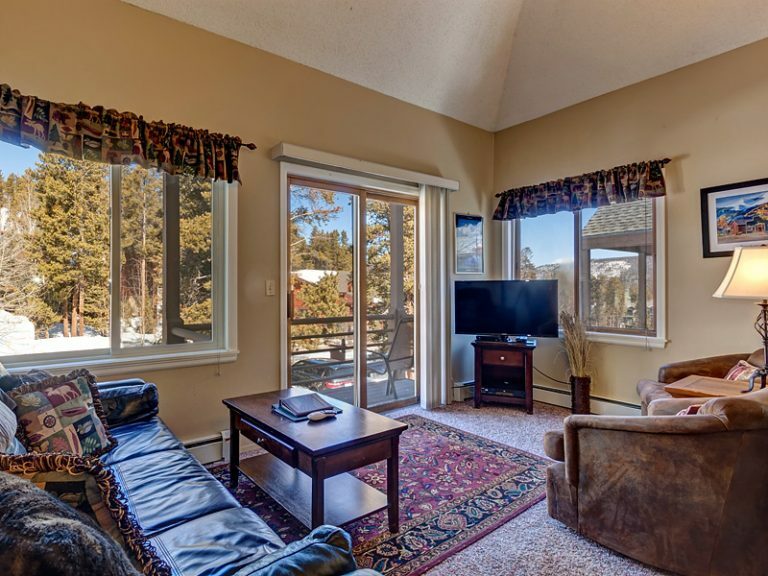 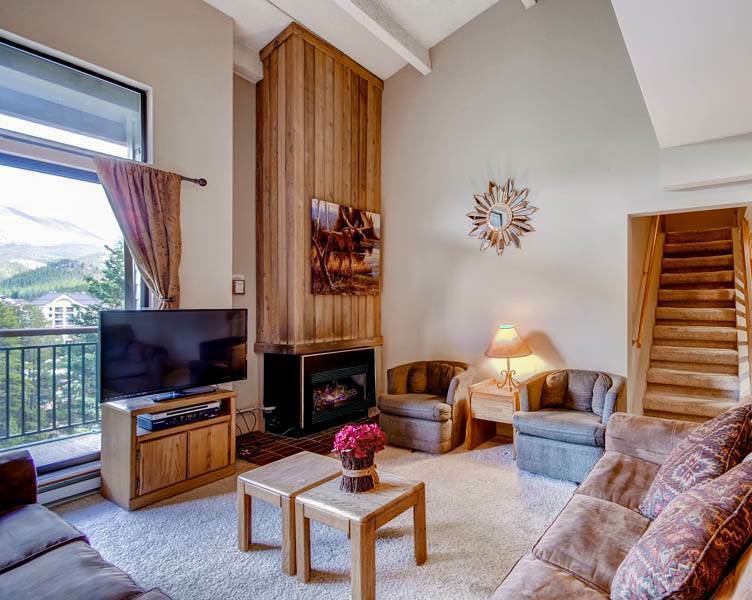 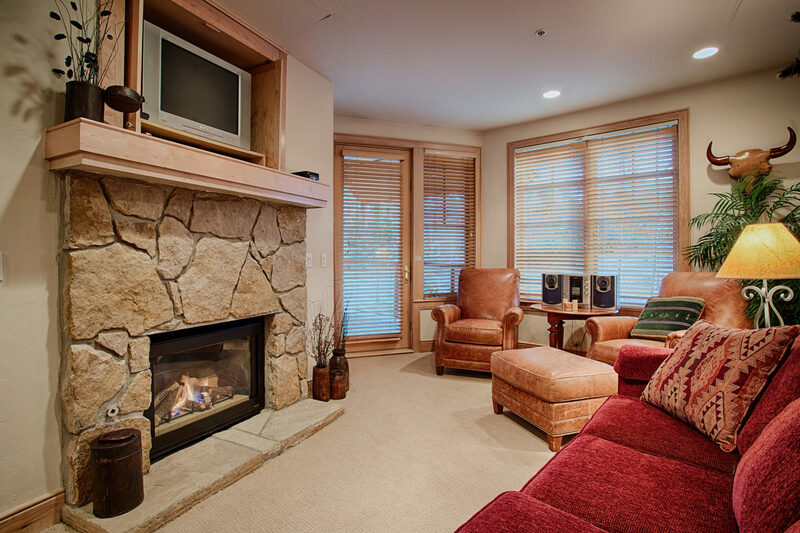 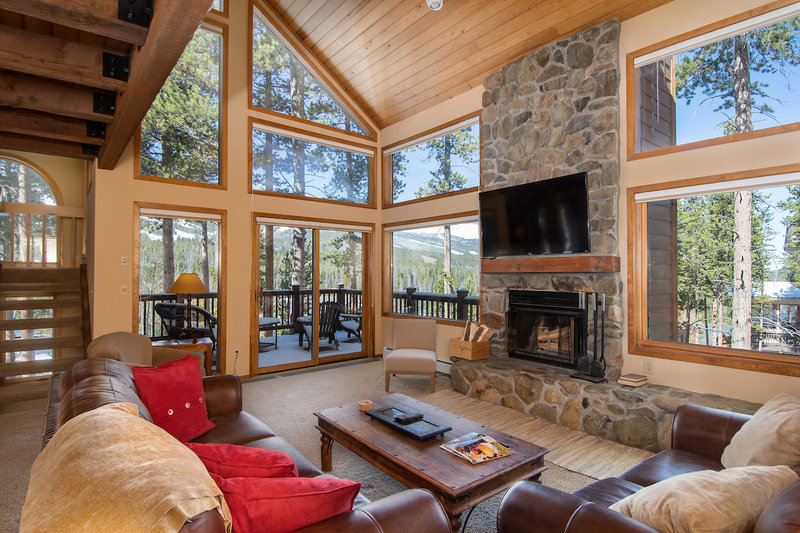 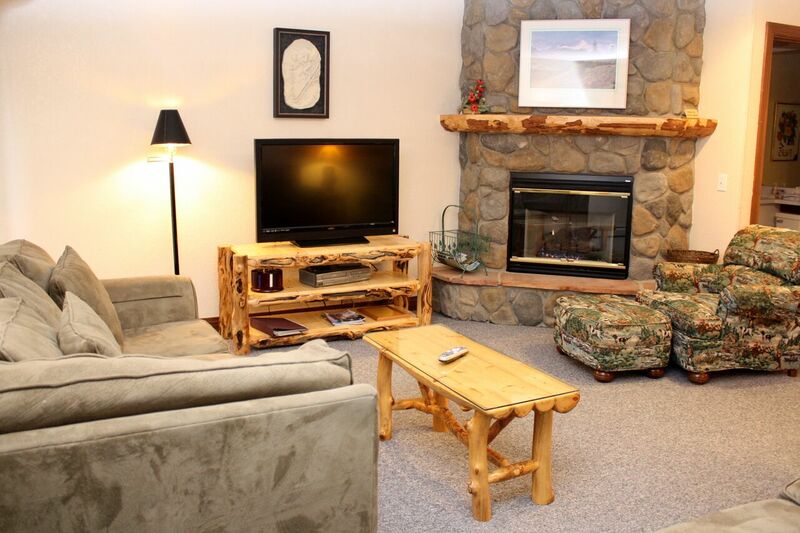 Located just north of Breckenridge, the Highland Greens Townhomes and Lodge offer luxury, space and one of the best year-round vacation locations in Summit County! 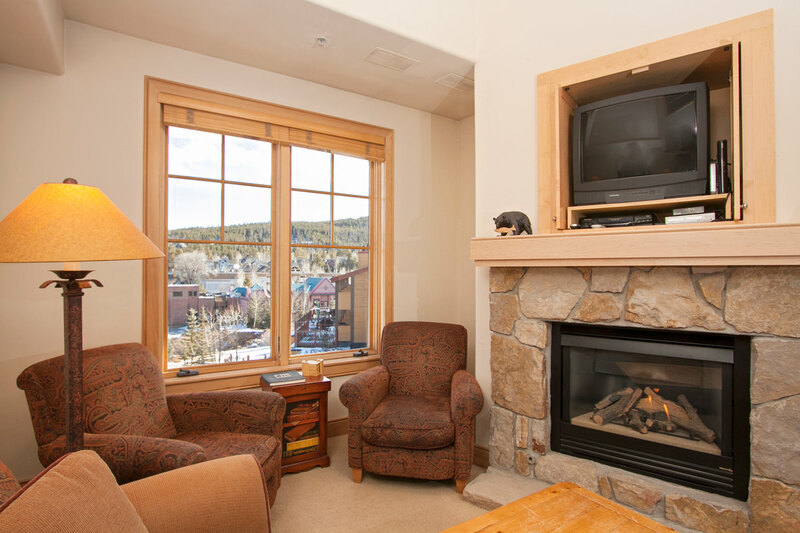 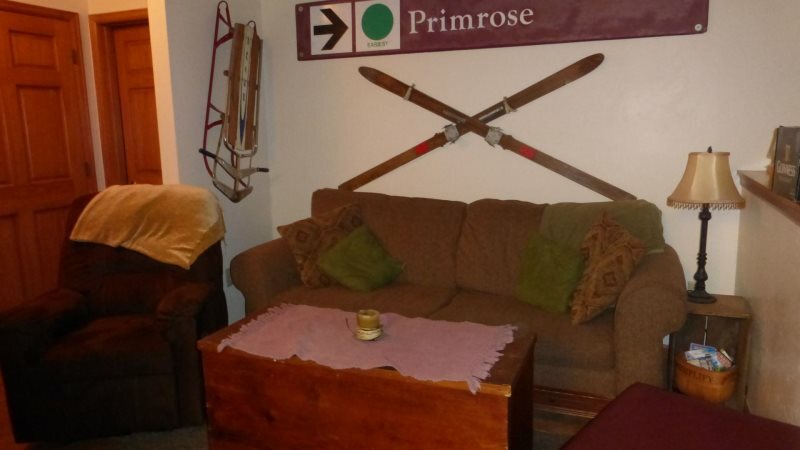 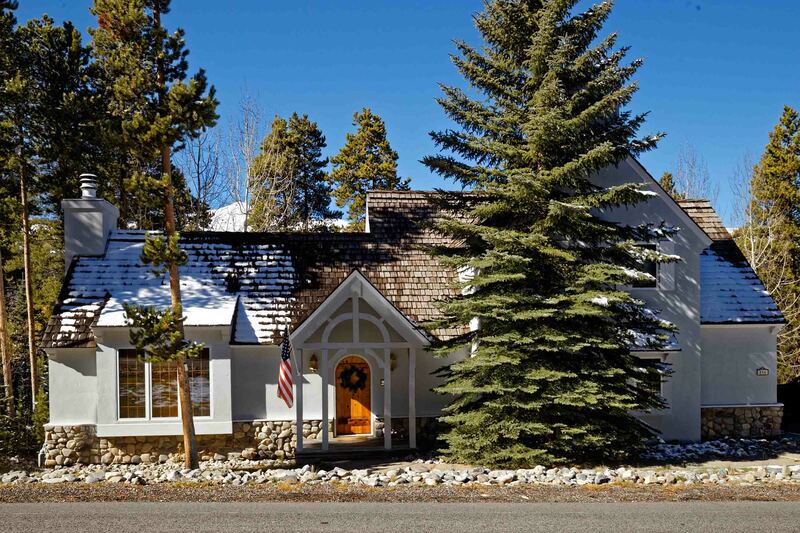 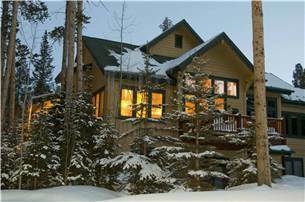 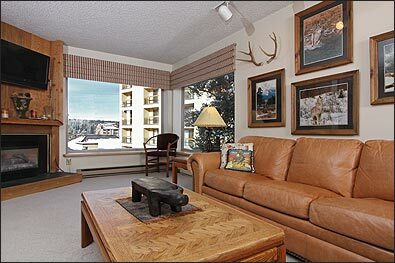 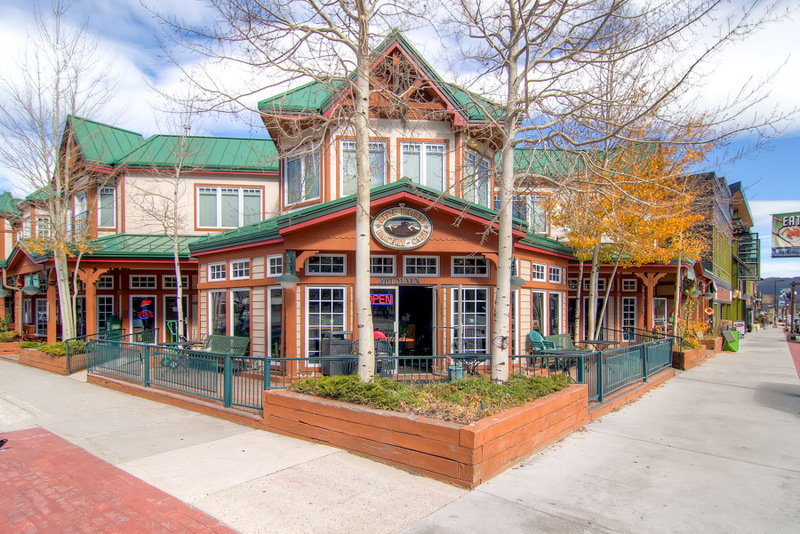 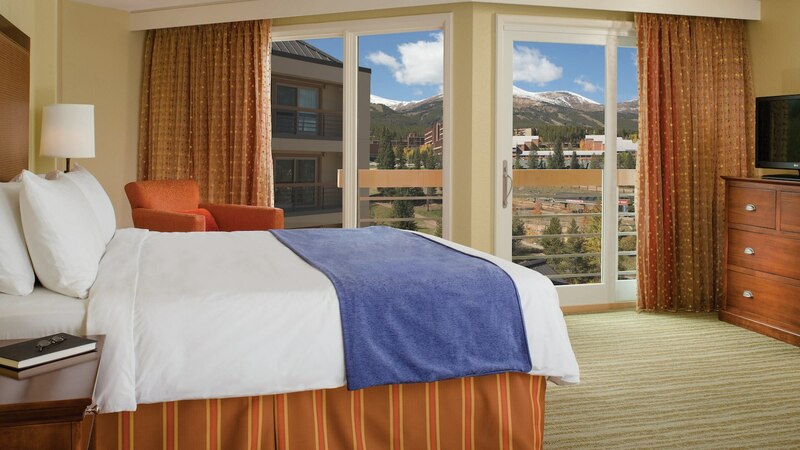 In the winter, free private shuttles whisk you to Breckenridge Ski Resort in just minutes, or take advantage of the Gold Run Nordic Center for cross-country skiing, ice skating and sleigh-ride dinners. 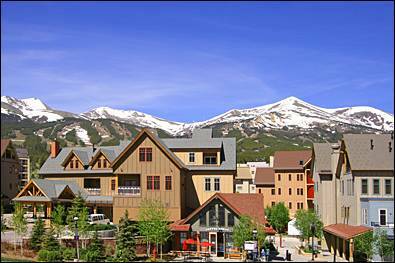 In the summer, there’s the Jack Nicklaus-designed, 27-hole Breckenridge Golf Club, bike paths and hiking trails galore. 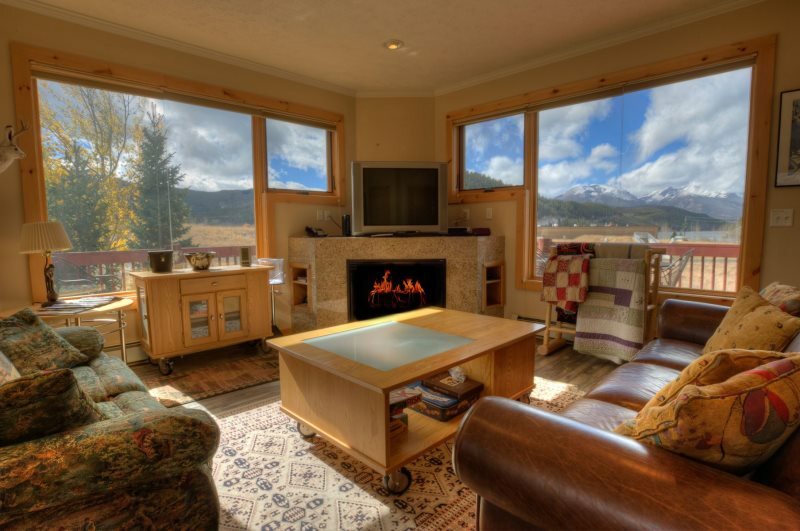 And the views of the Tenmile Range are fantastic. 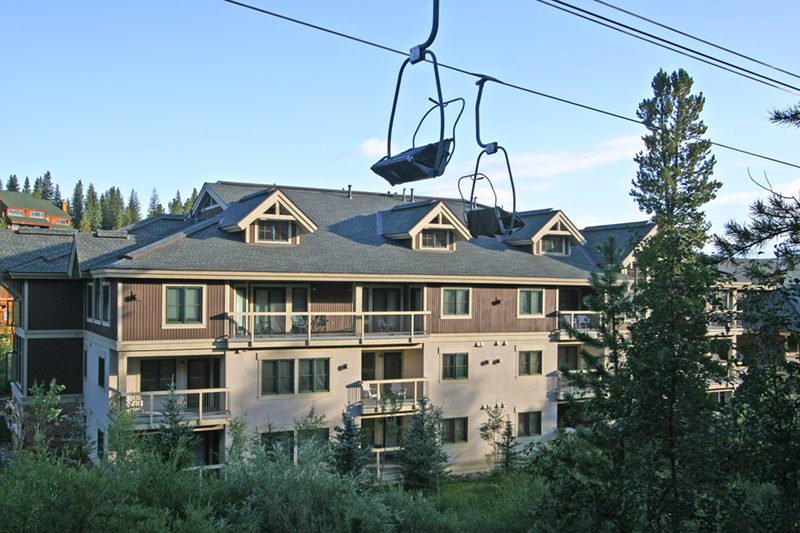 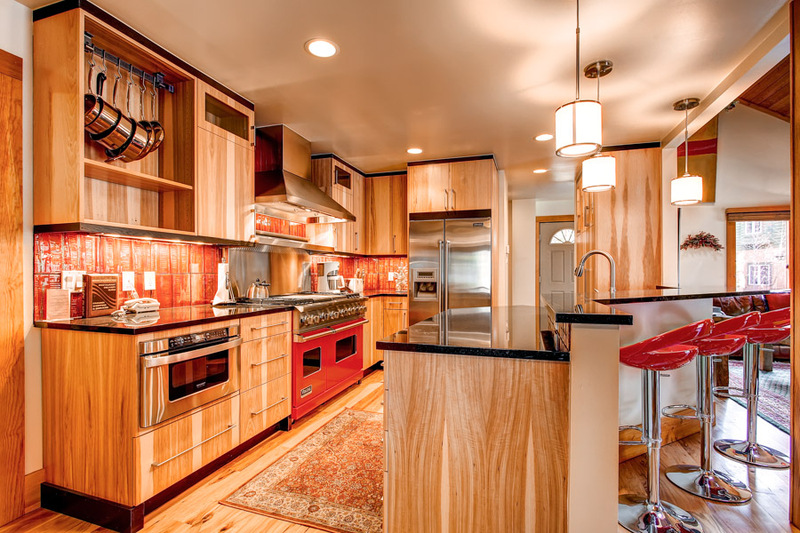 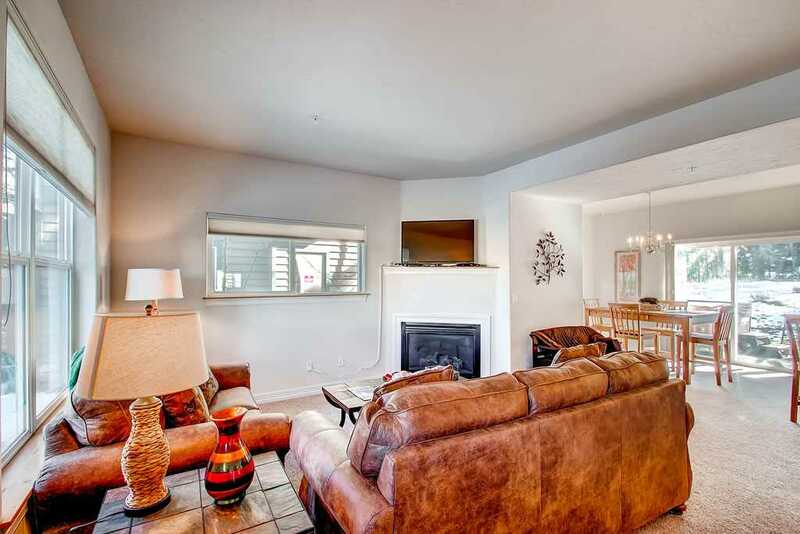 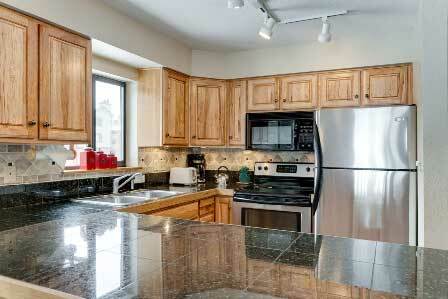 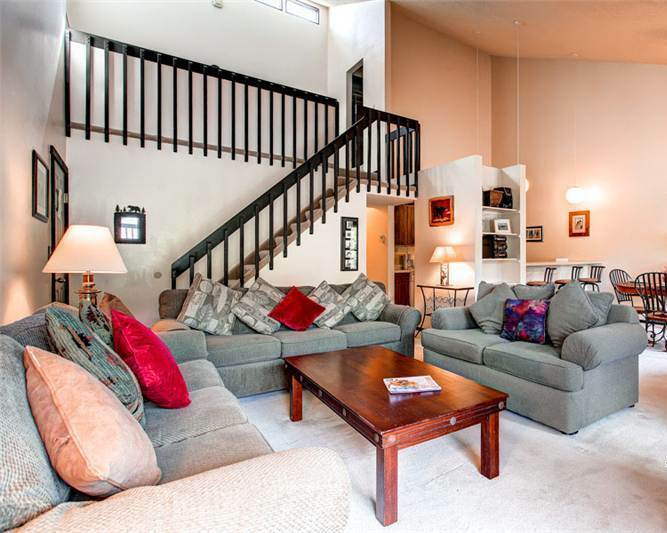 Highland Greens TH84 is the largest townhome (2,128 square feet, sleeps ten) in Highland Greens. 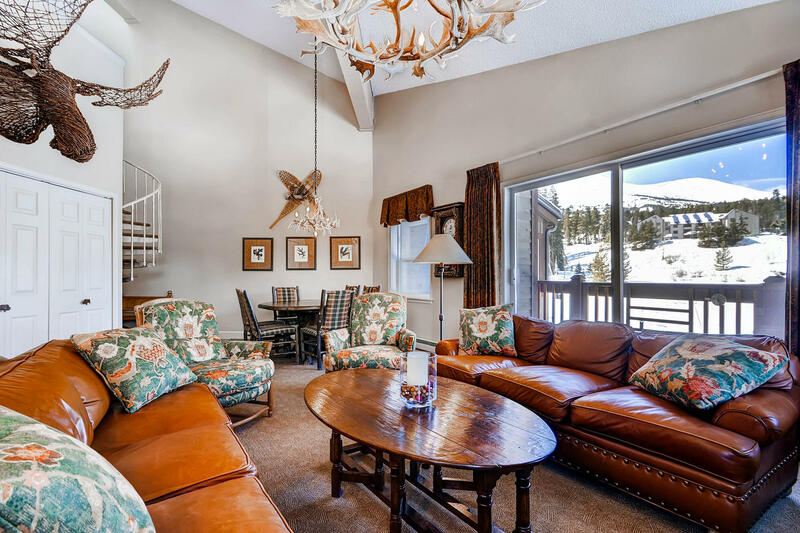 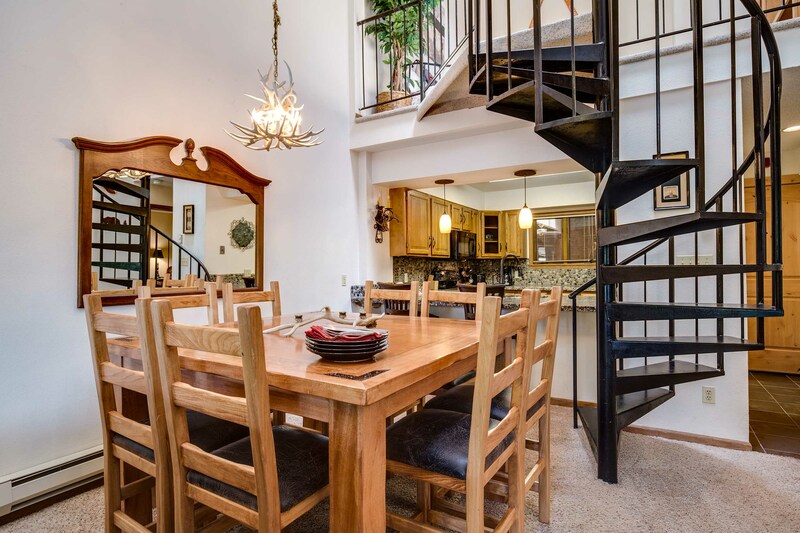 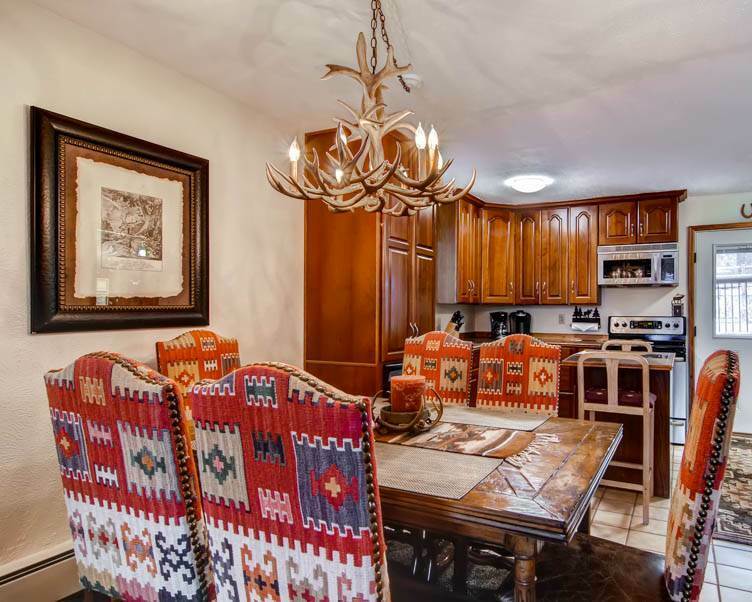 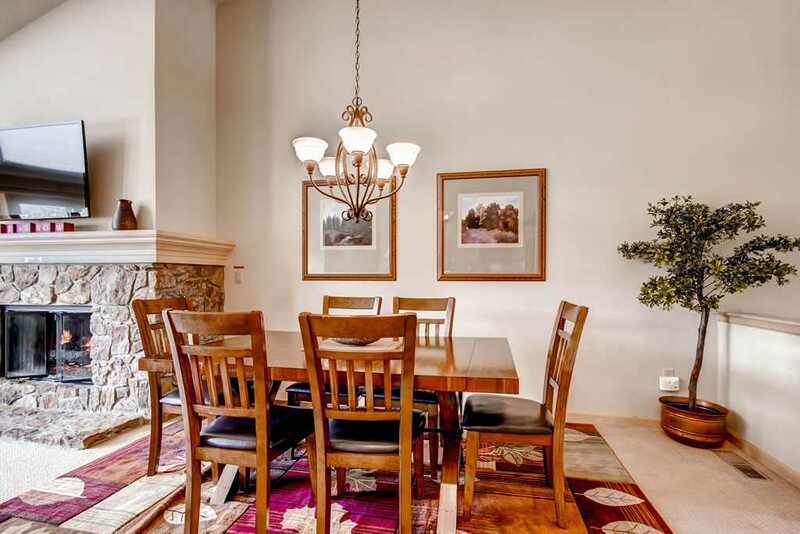 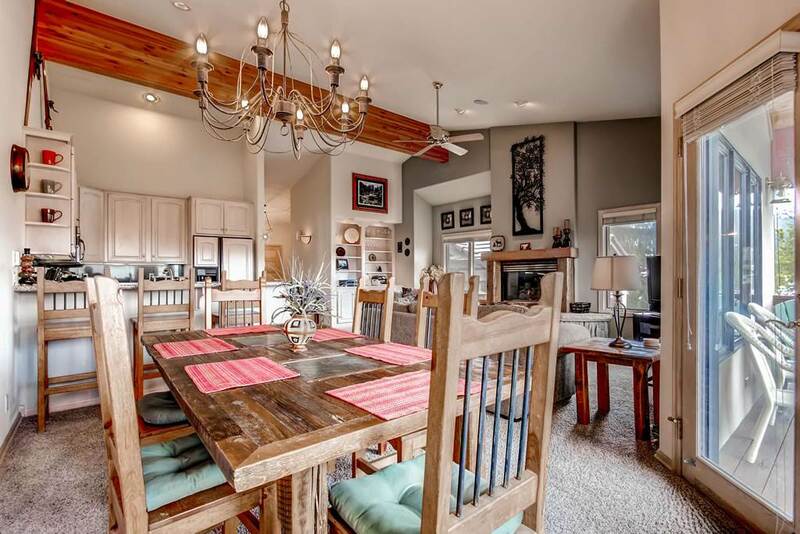 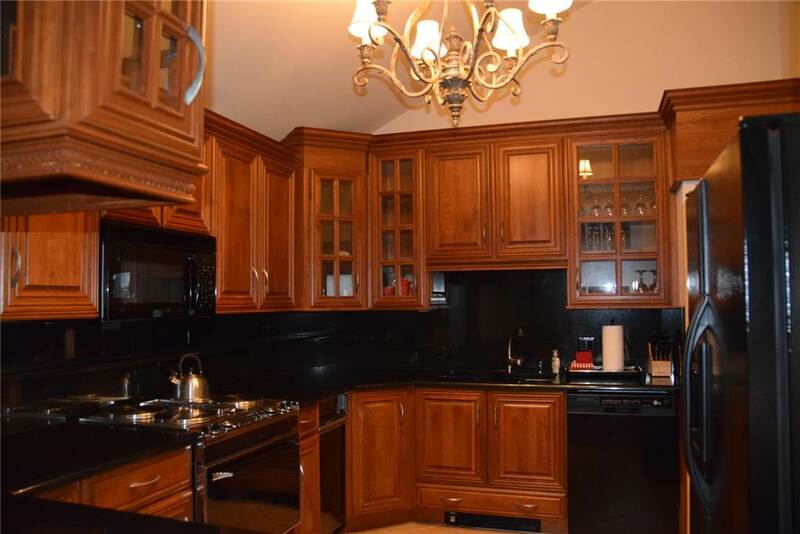 Luxurious furnishings and appointments abound, and the open floor plan with vaulted ceilings, large granite-adorned kitchen with GE appliances, and dining room with seating for eight provide a great venue for entertaining. 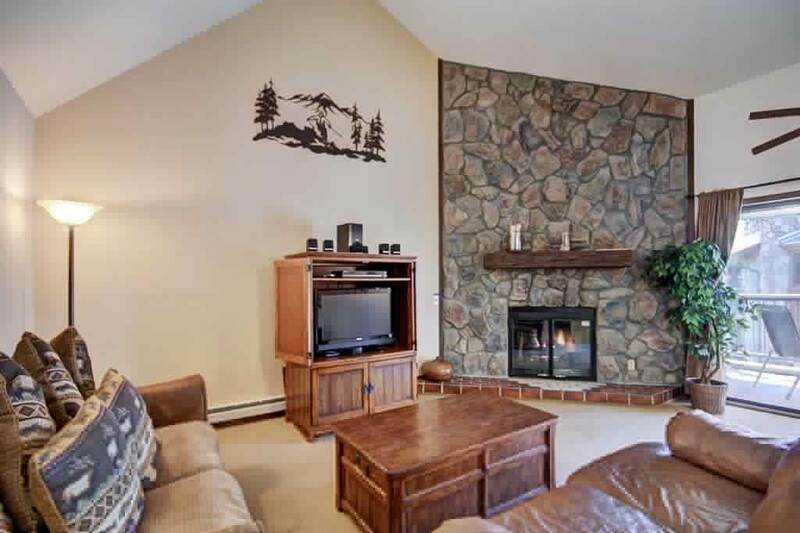 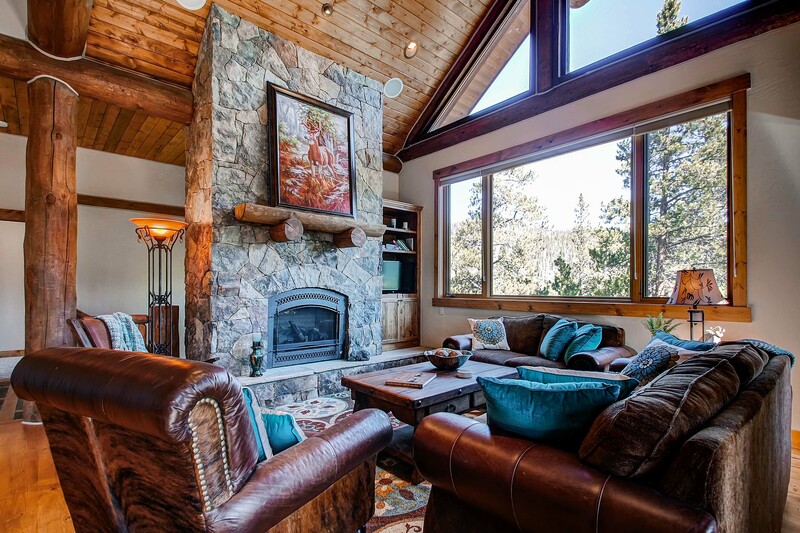 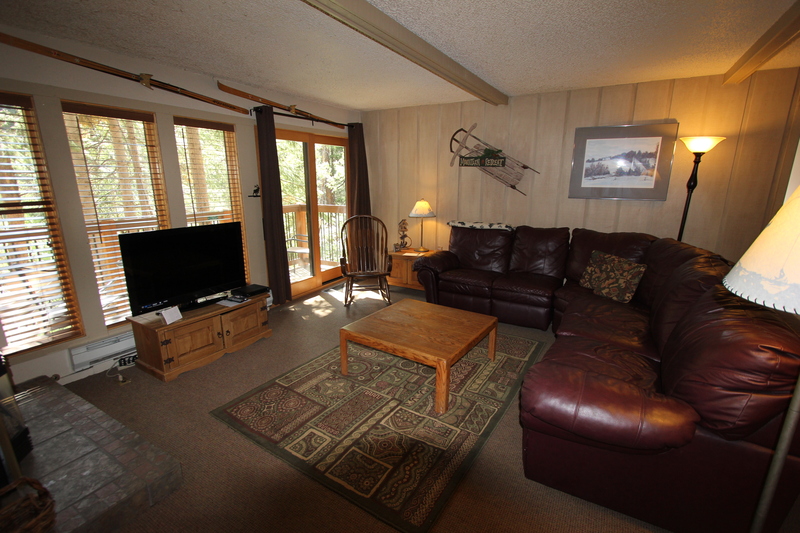 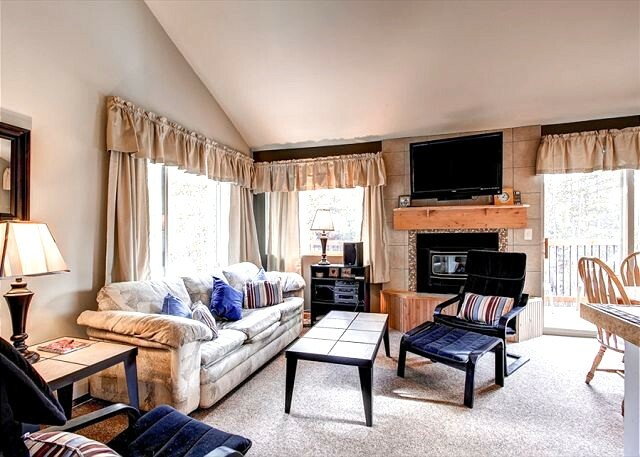 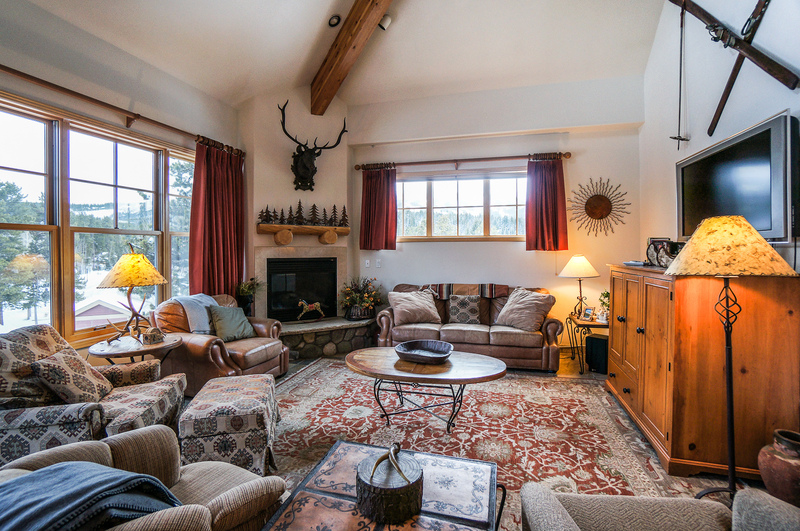 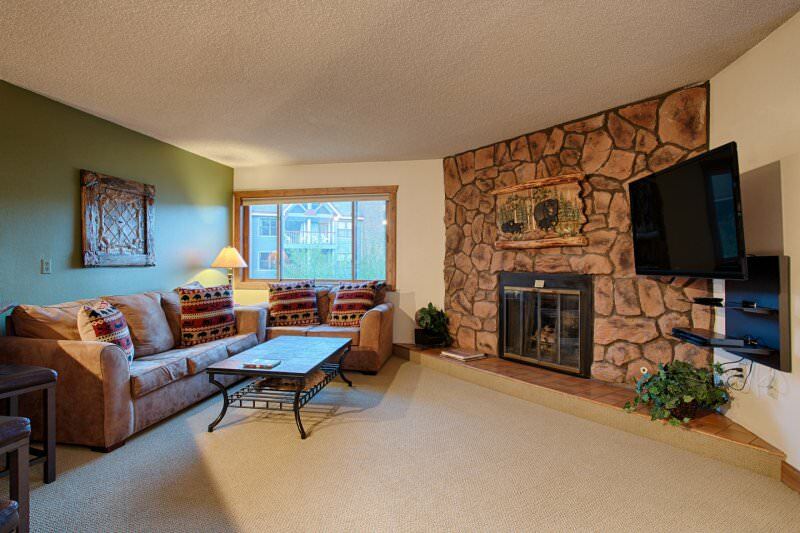 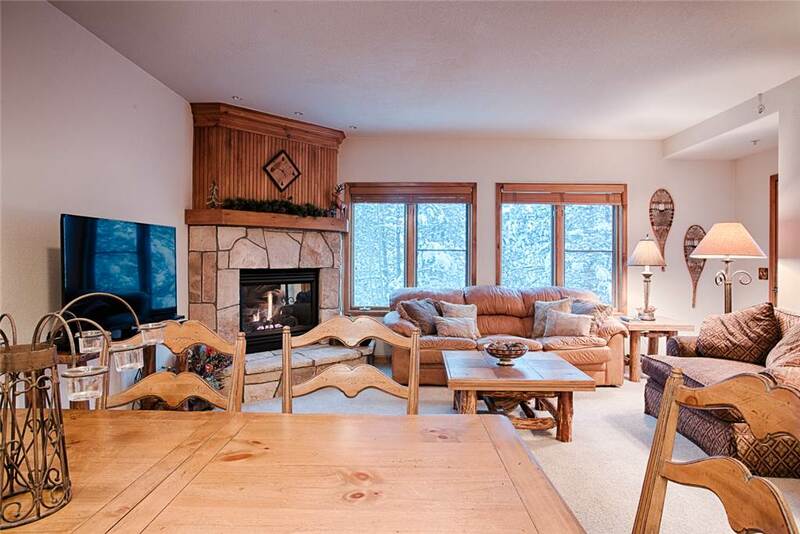 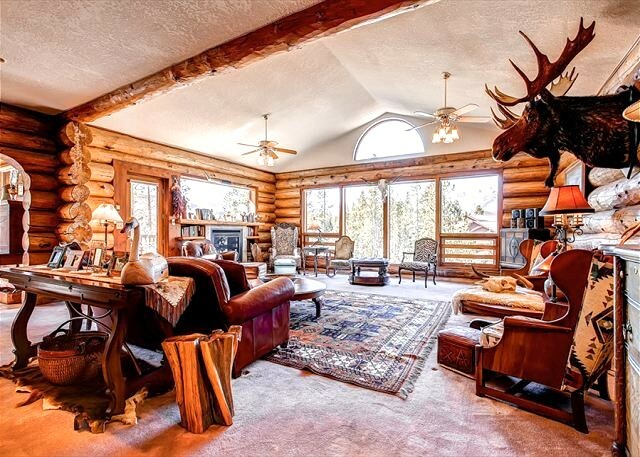 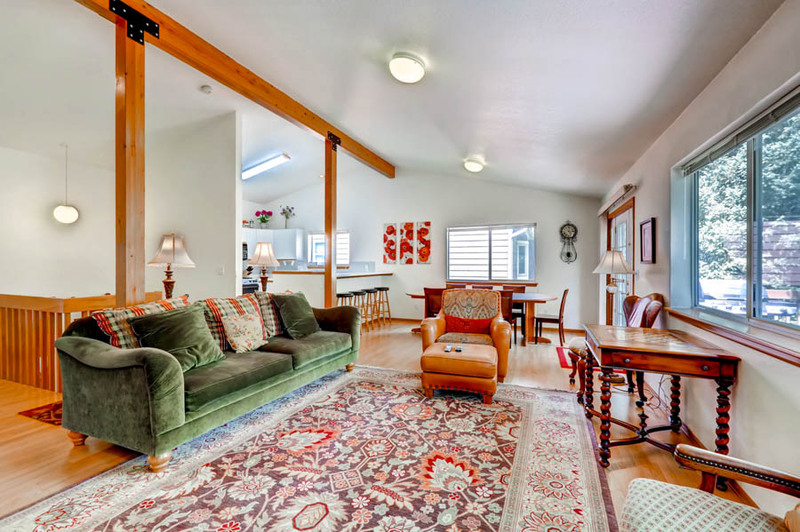 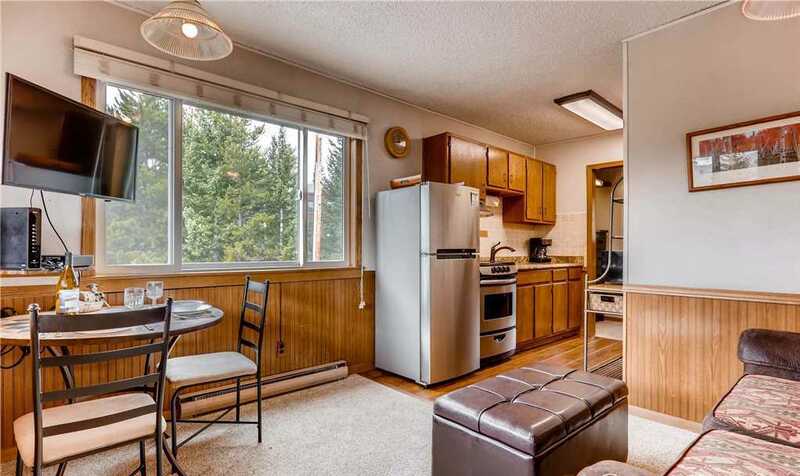 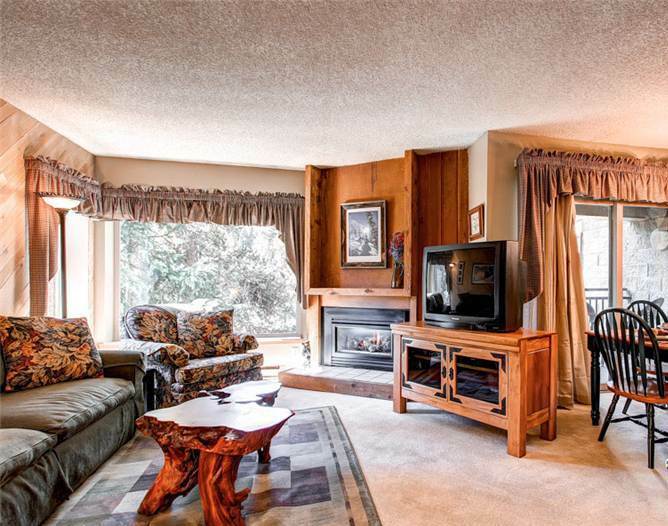 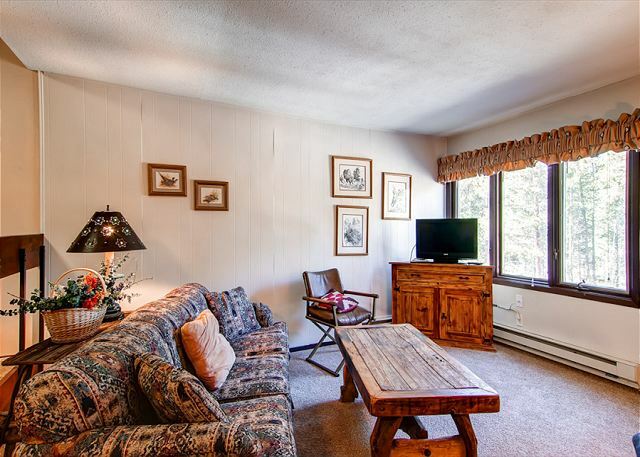 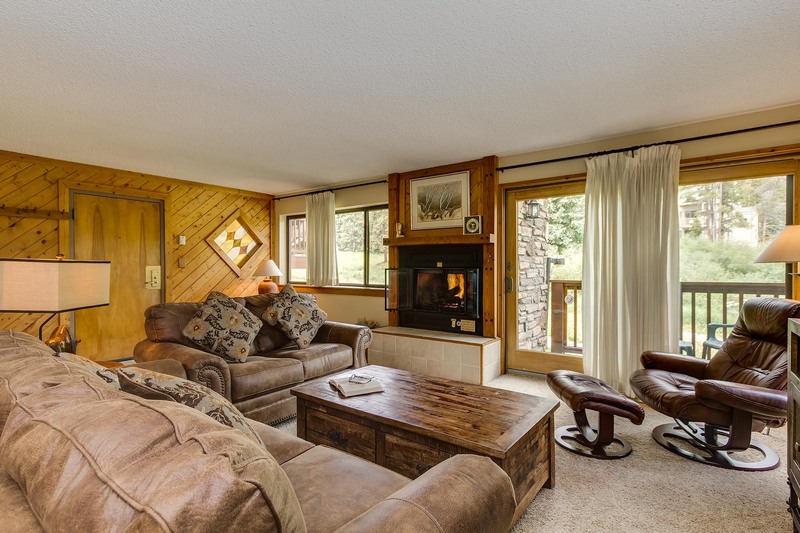 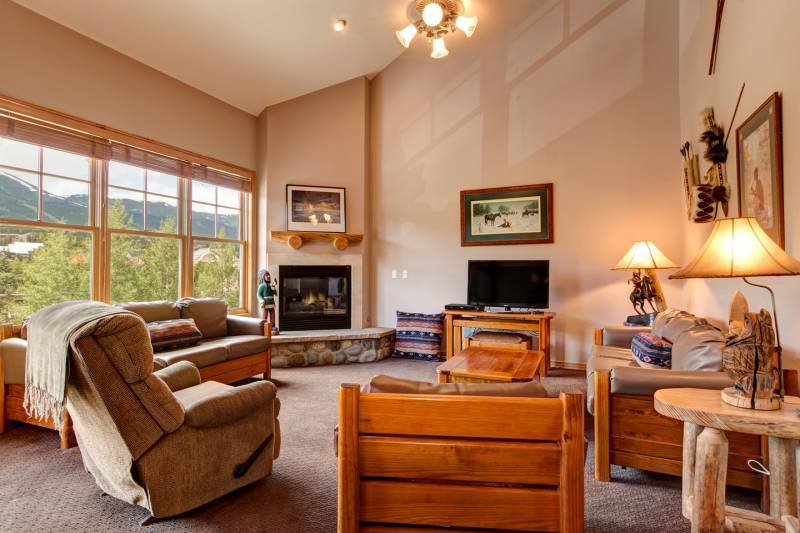 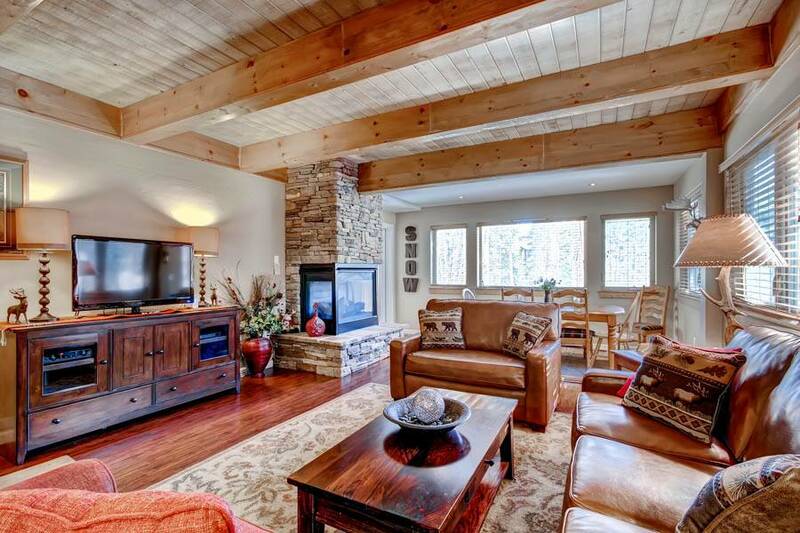 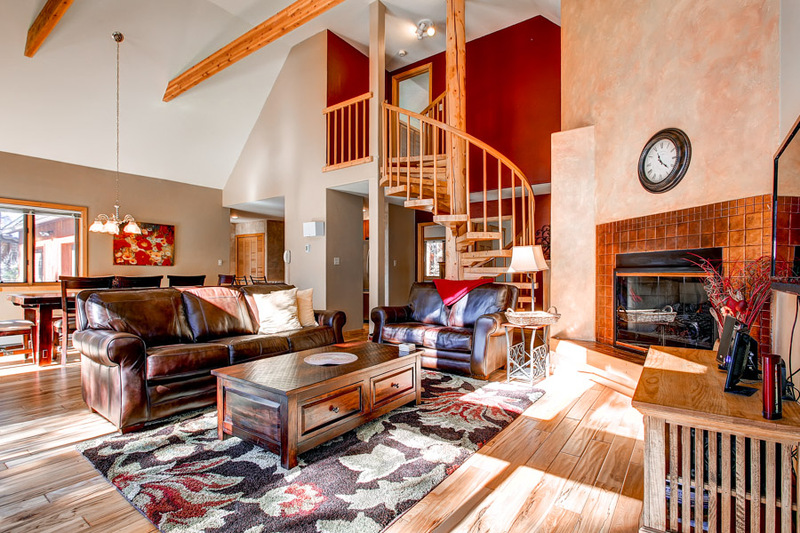 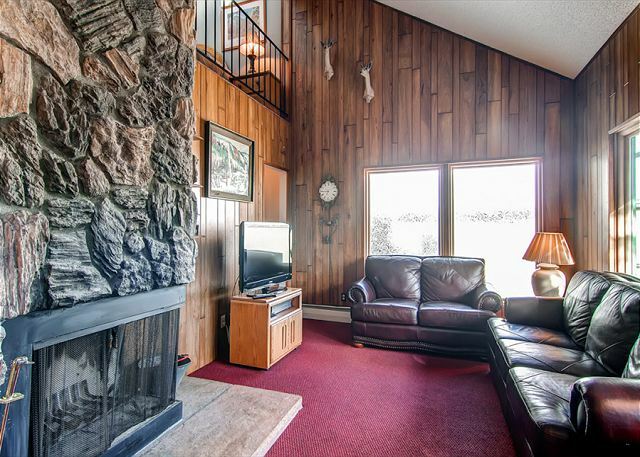 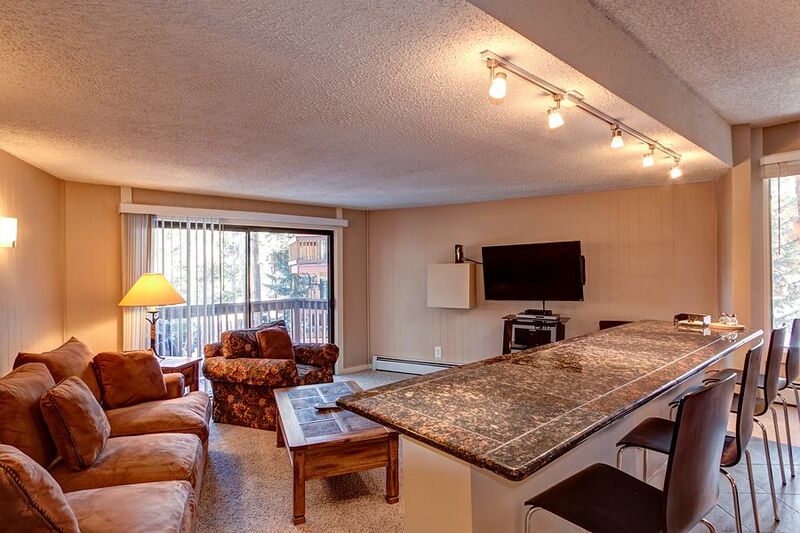 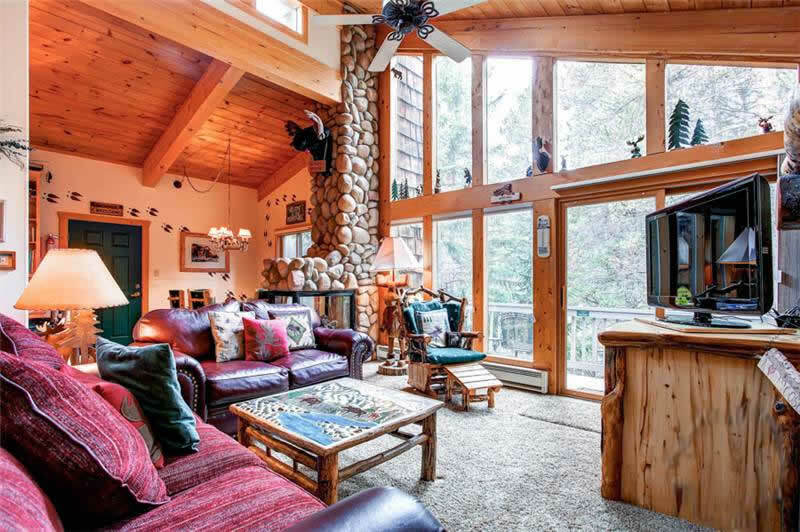 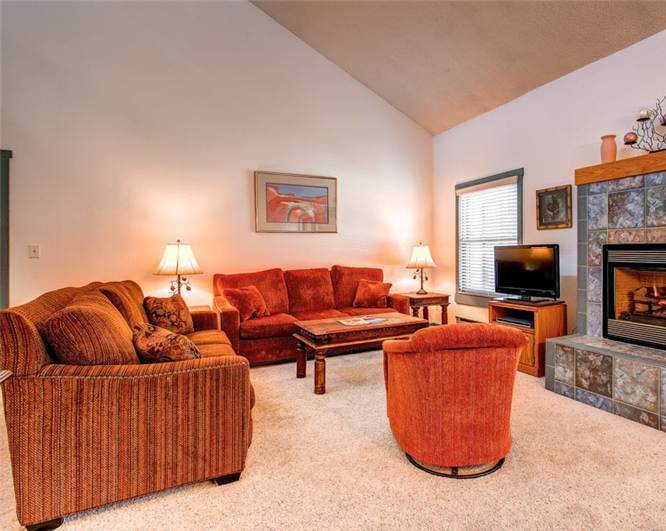 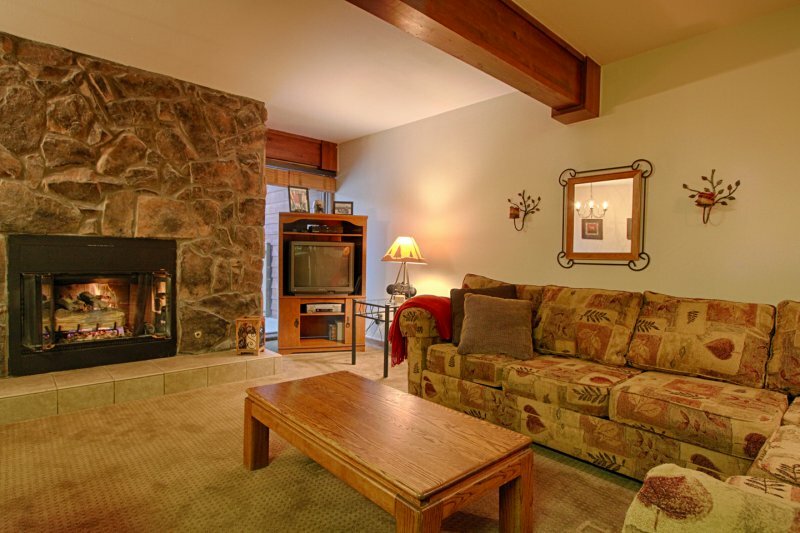 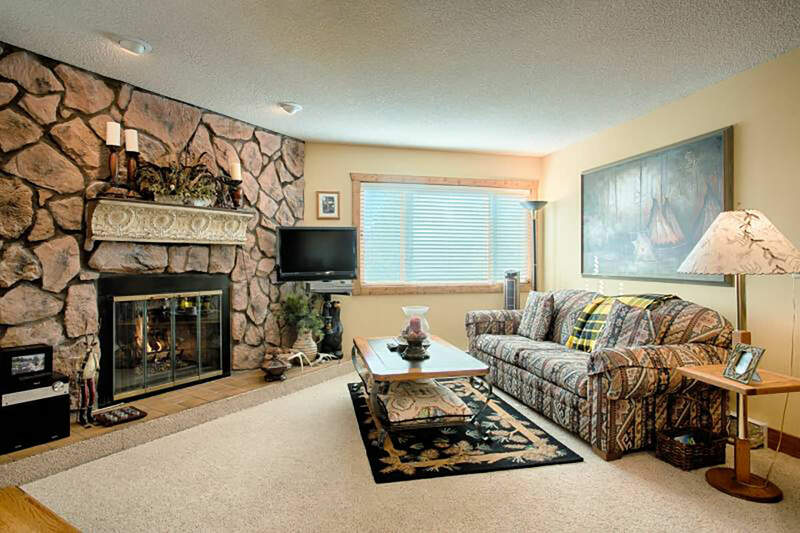 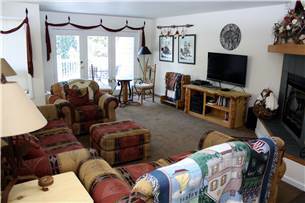 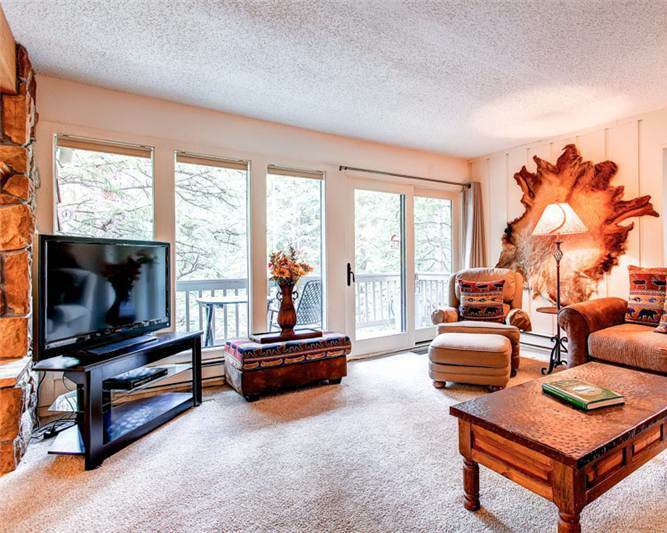 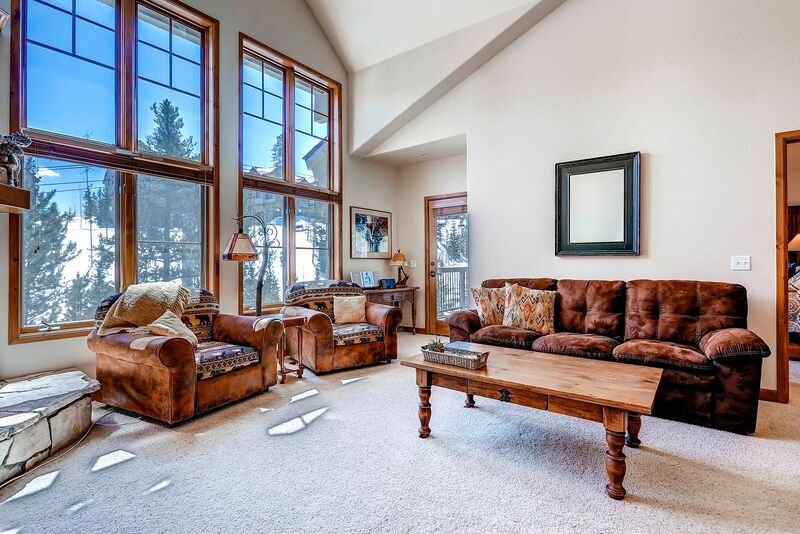 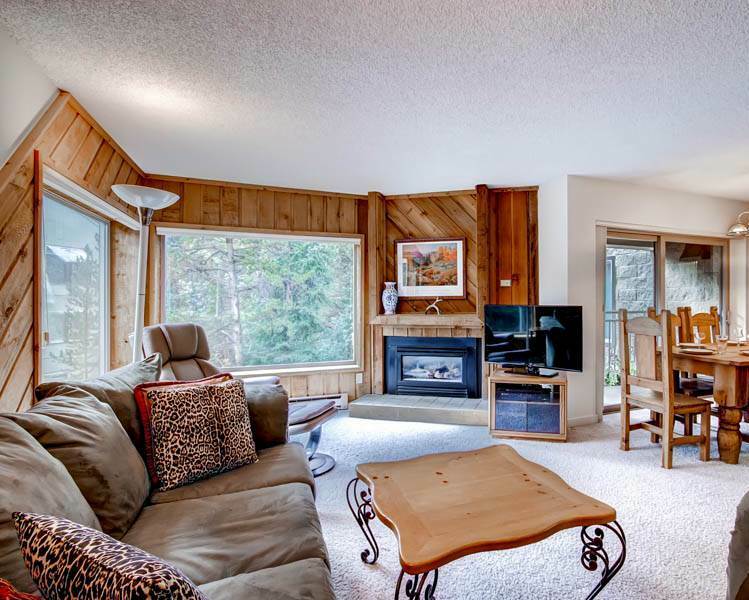 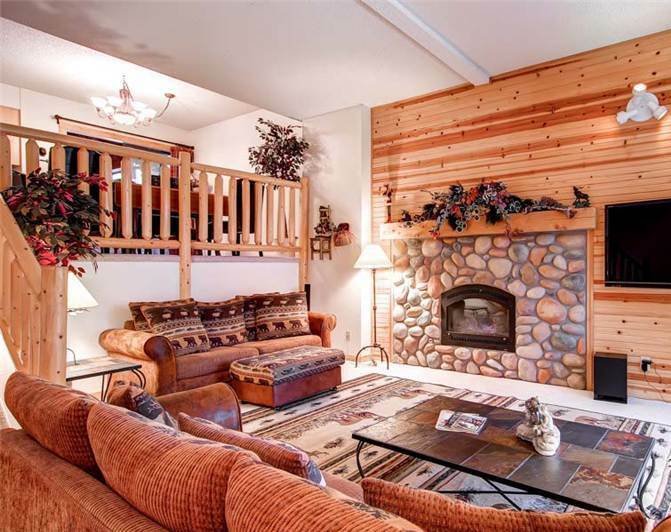 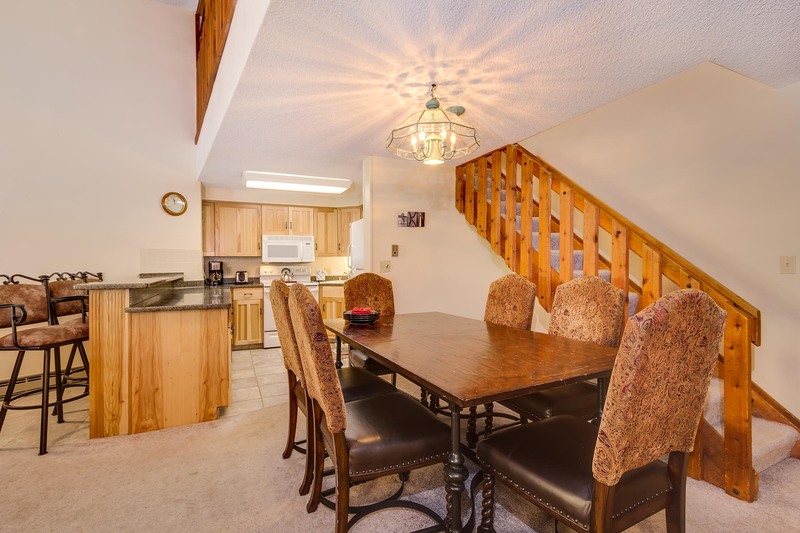 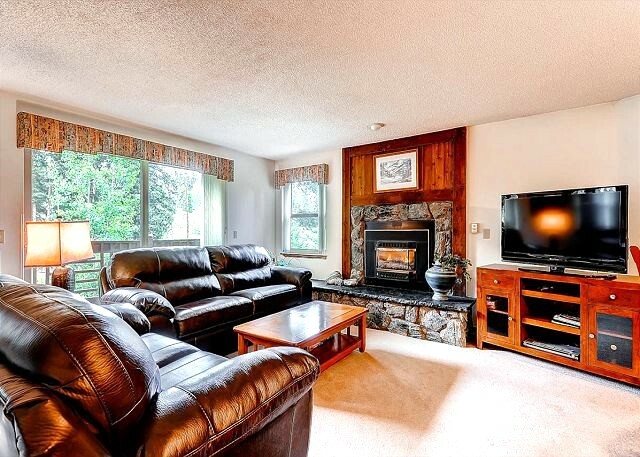 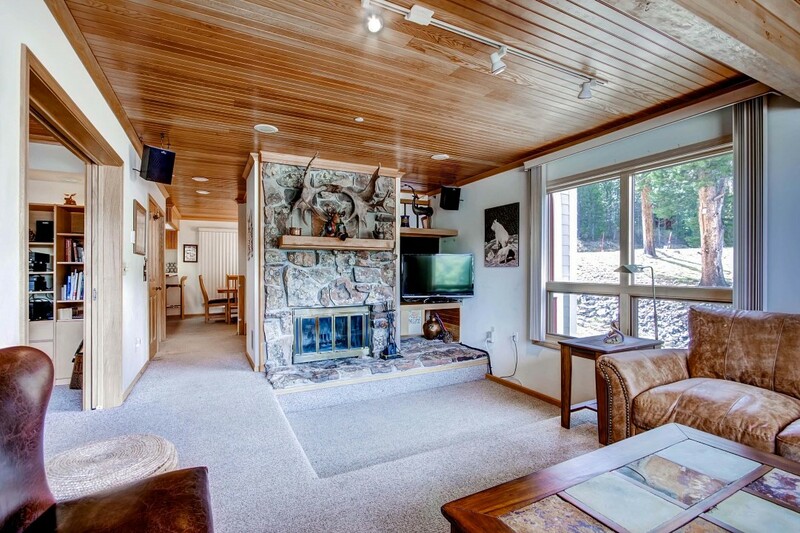 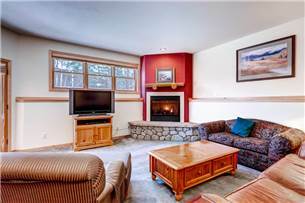 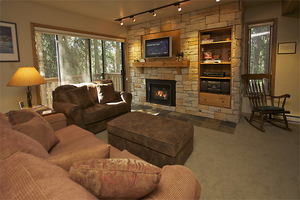 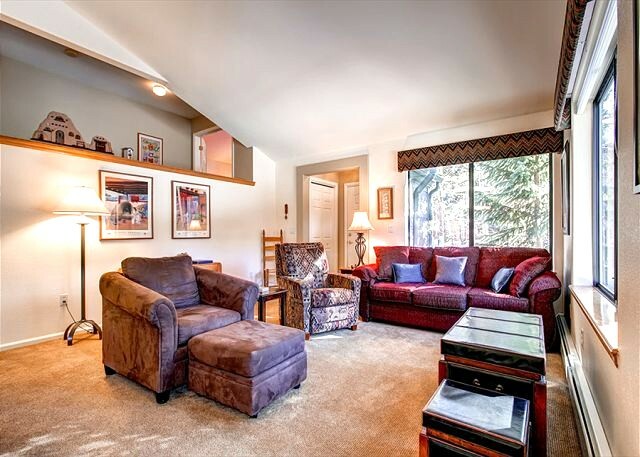 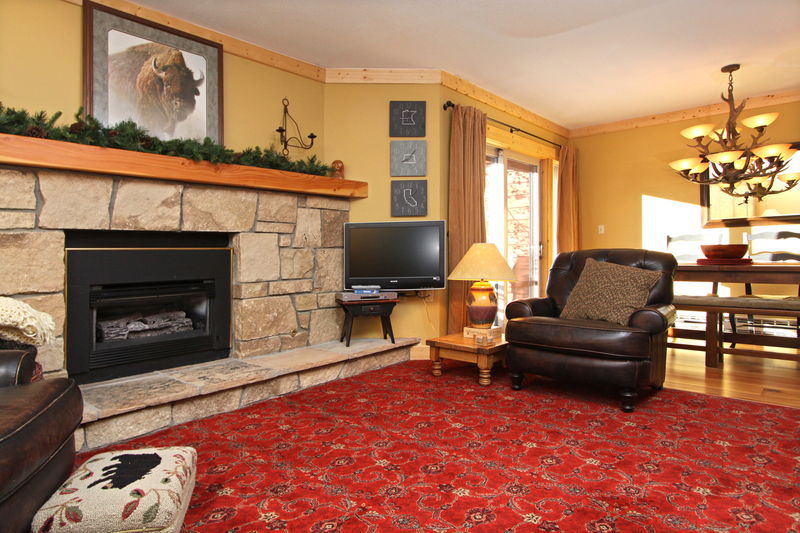 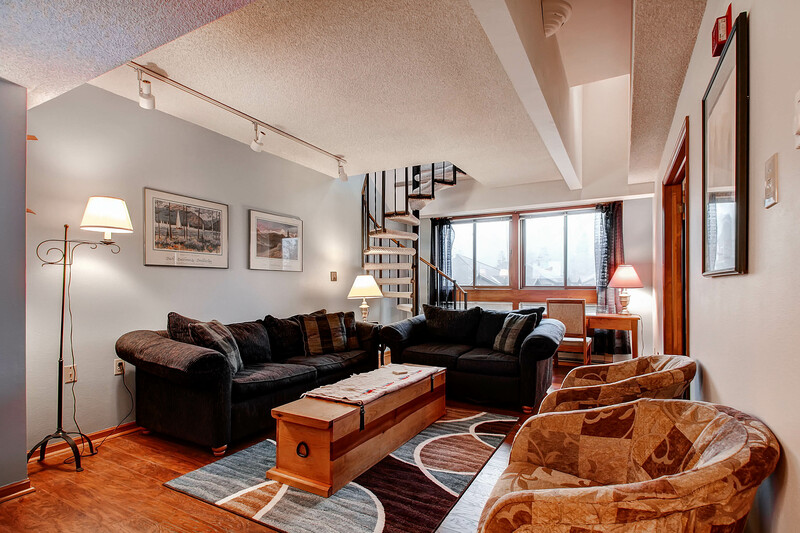 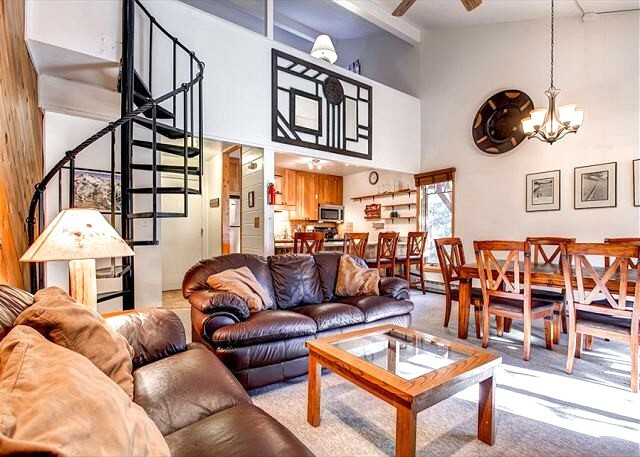 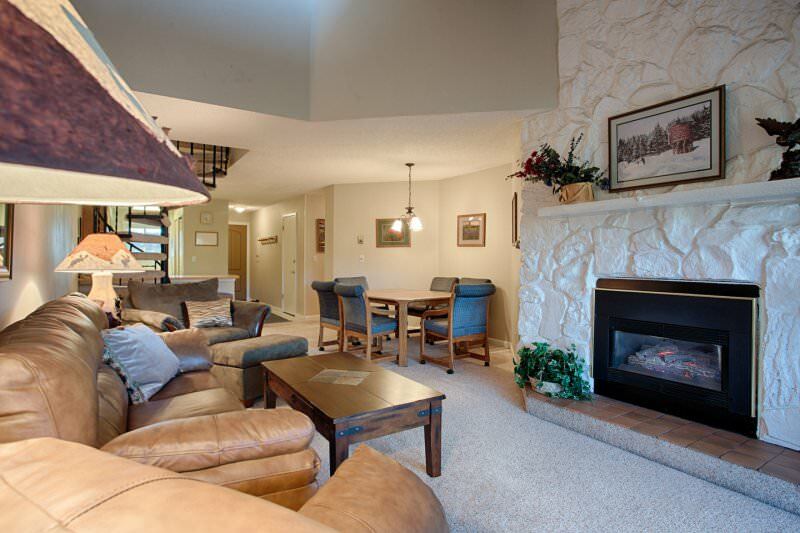 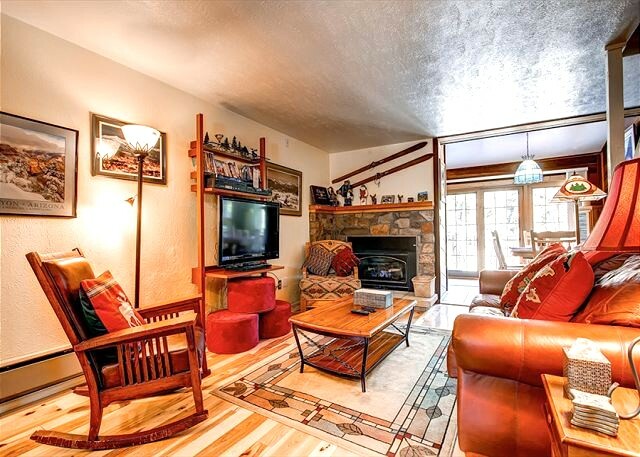 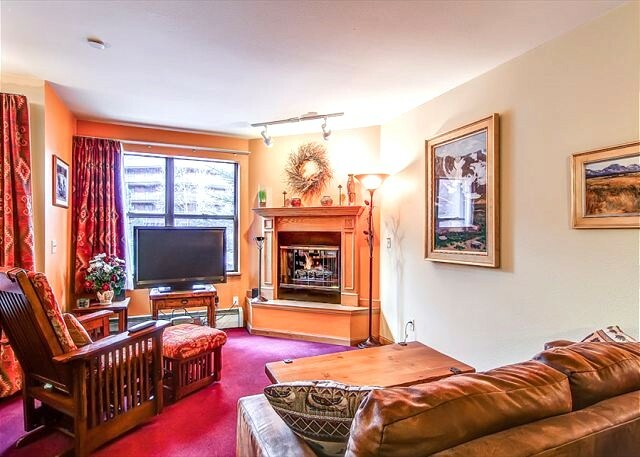 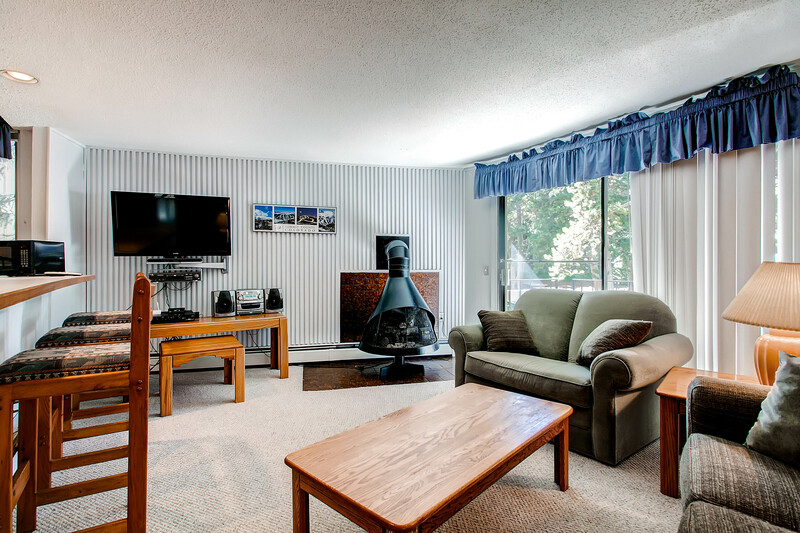 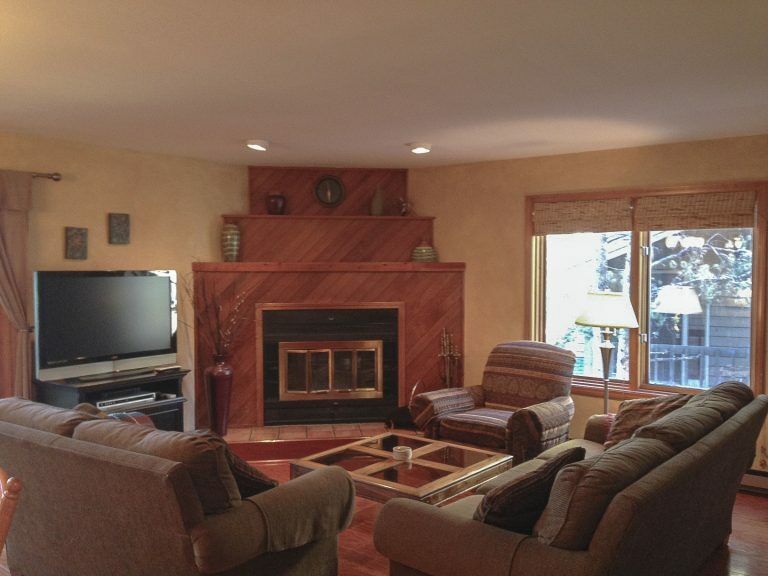 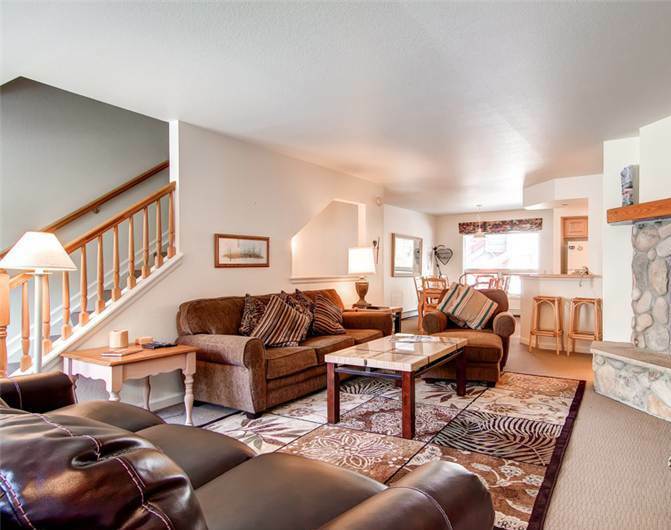 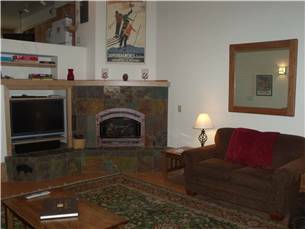 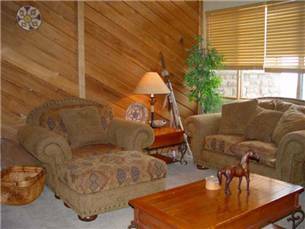 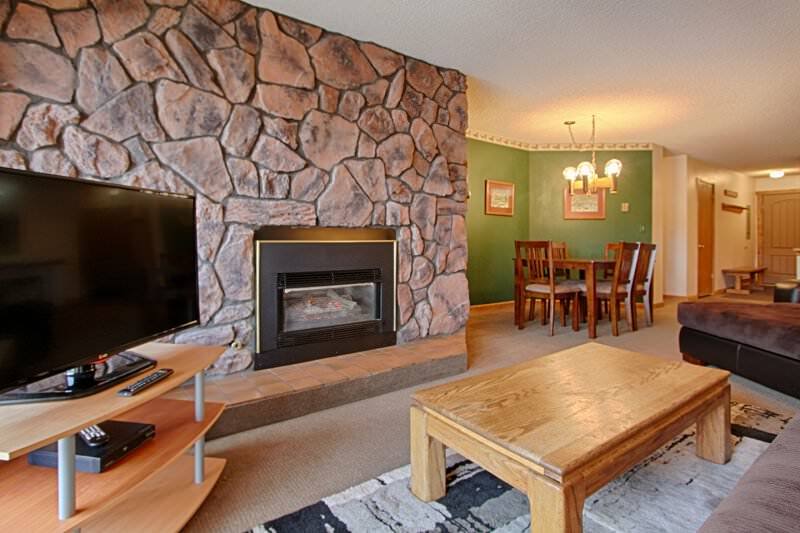 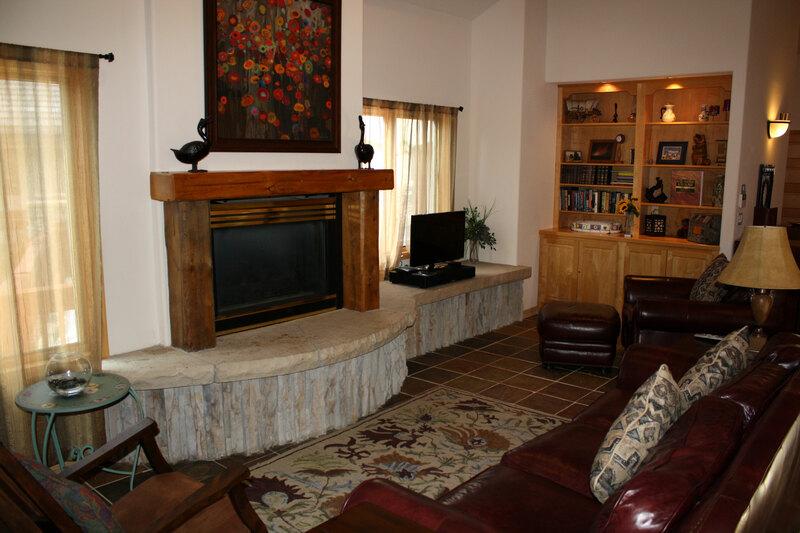 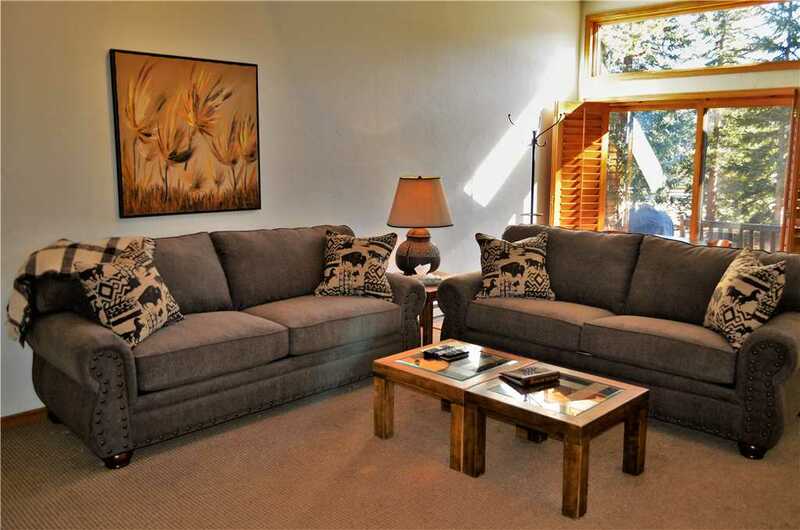 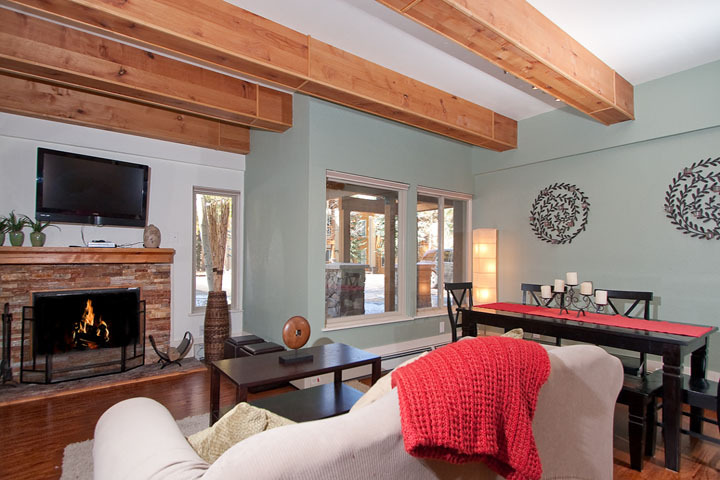 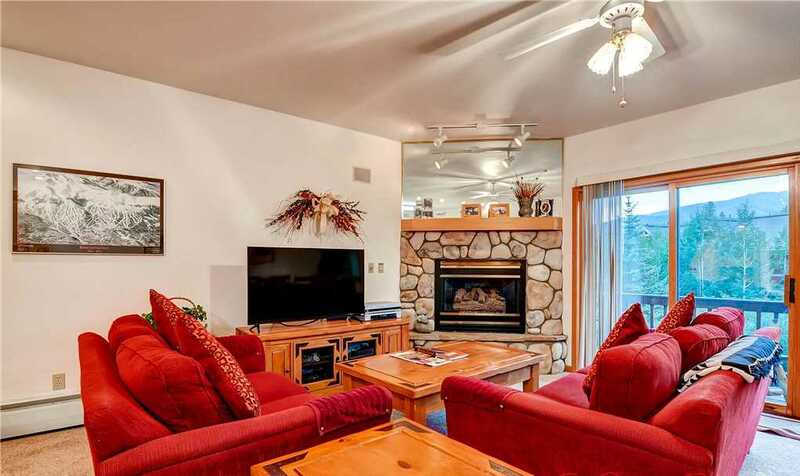 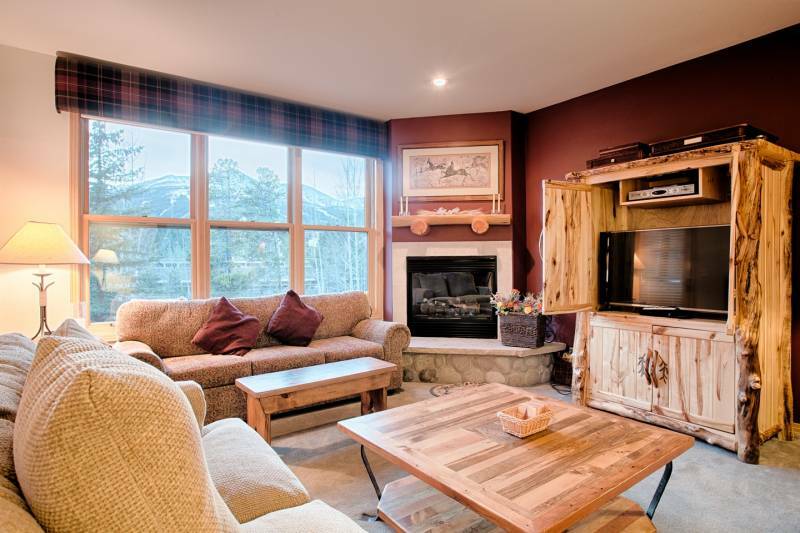 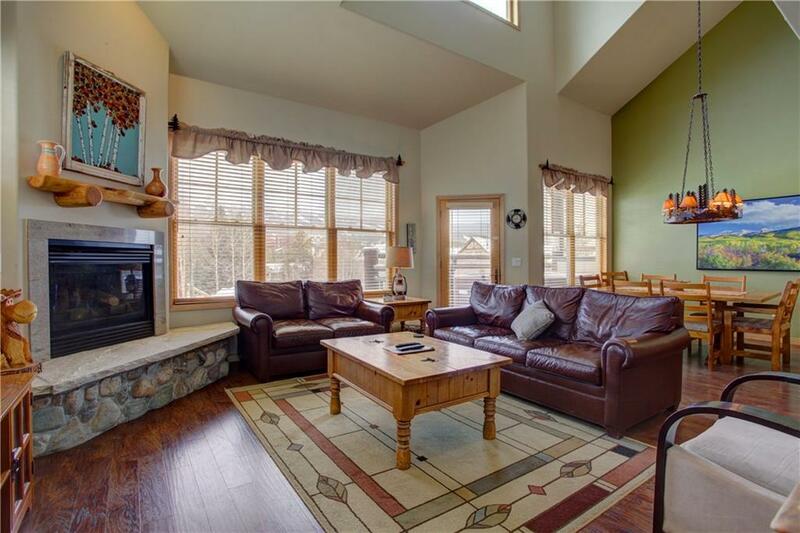 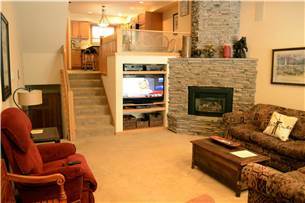 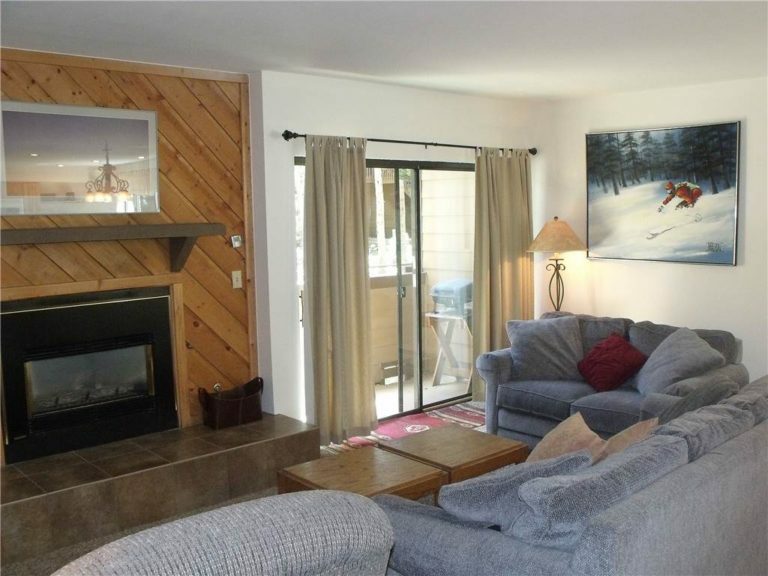 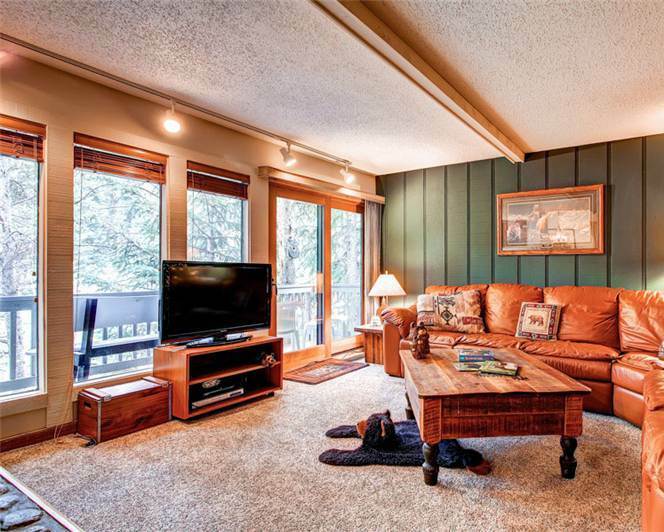 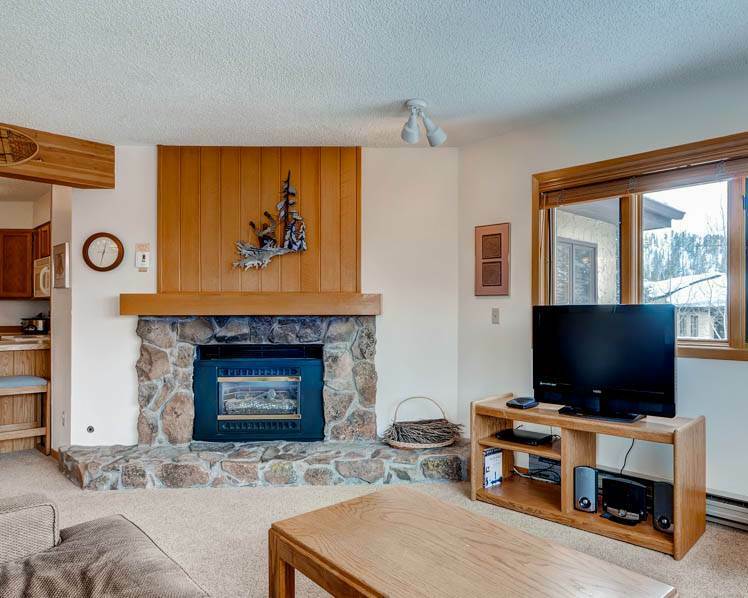 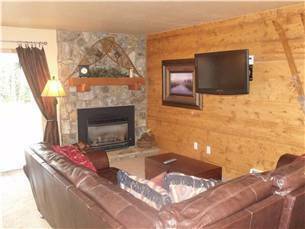 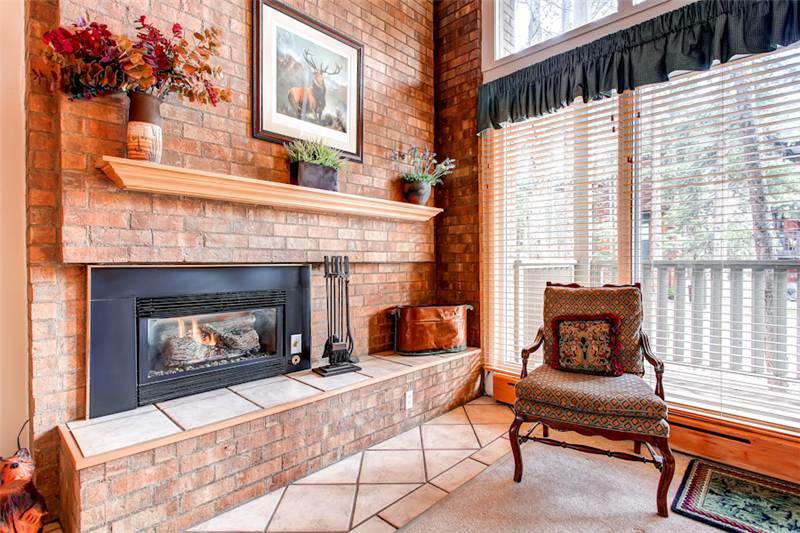 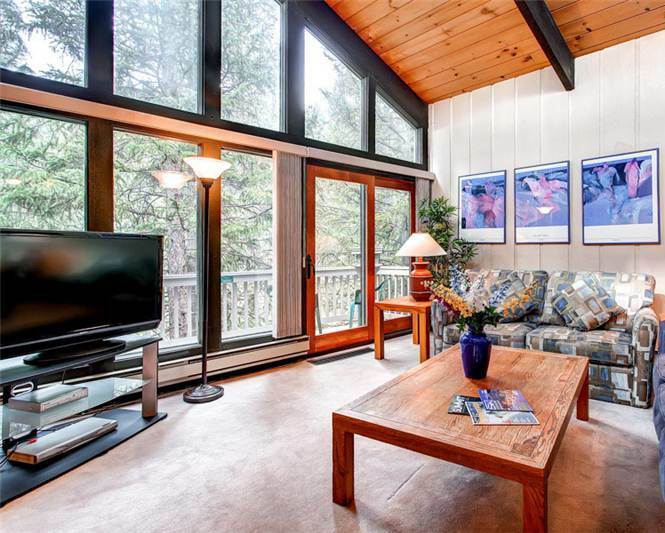 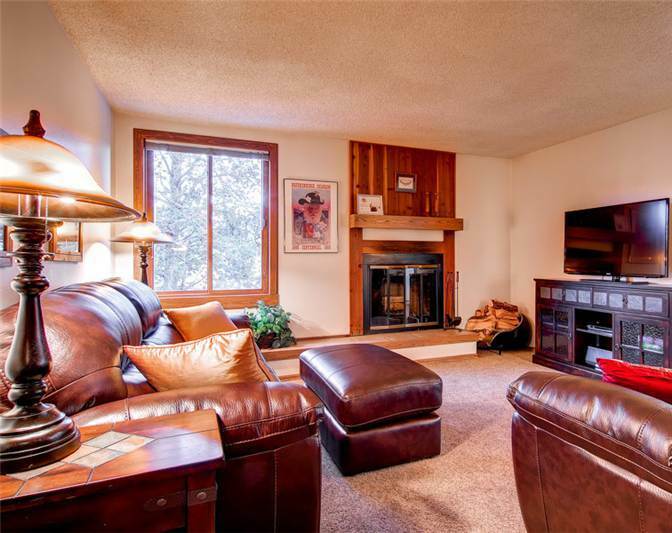 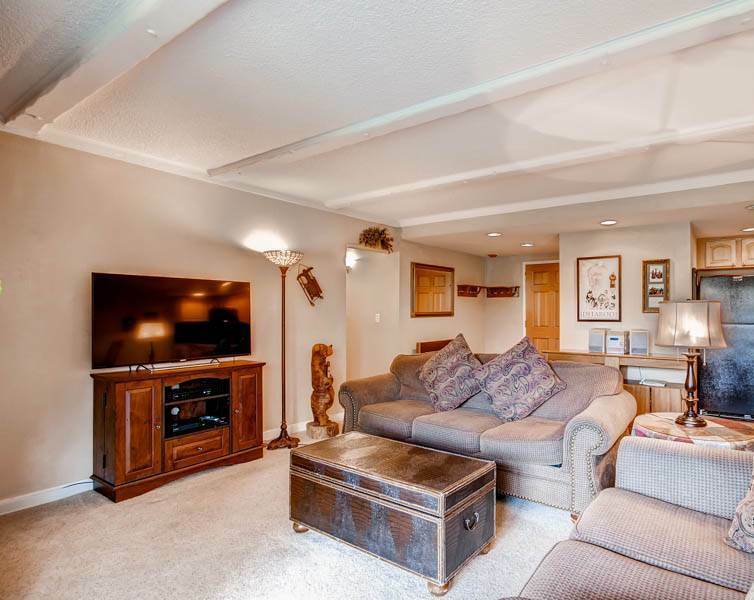 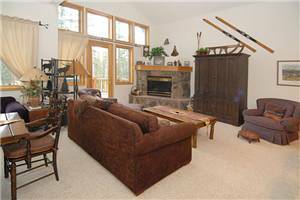 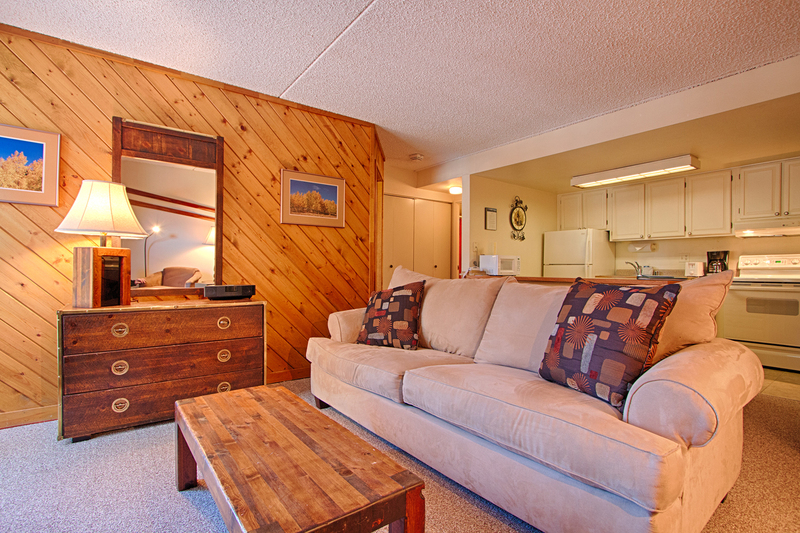 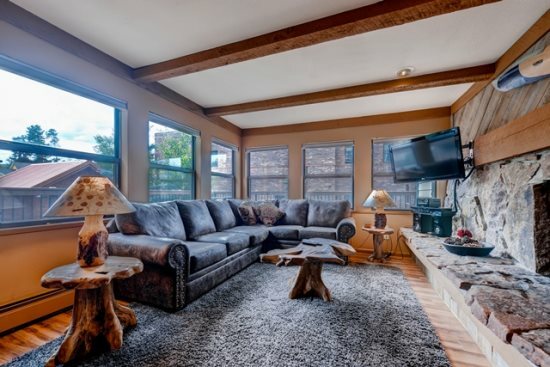 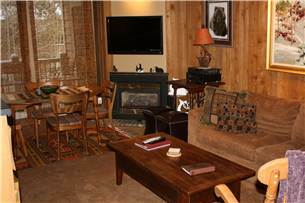 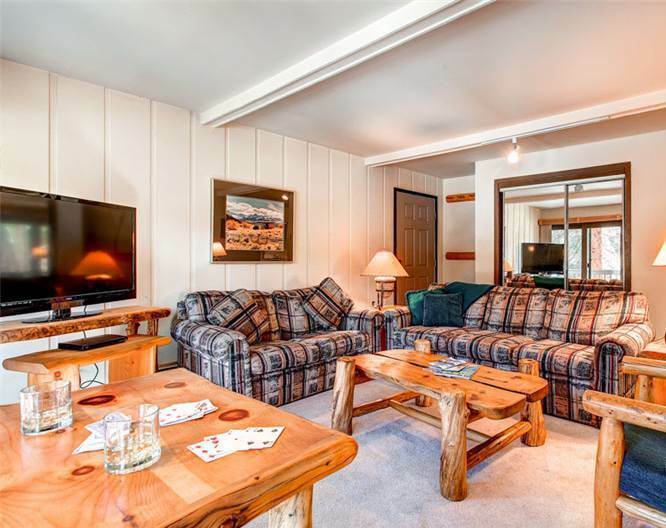 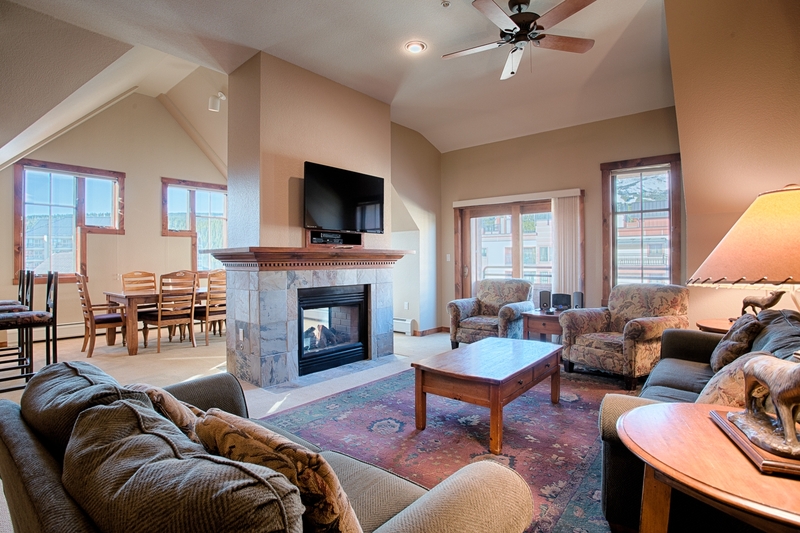 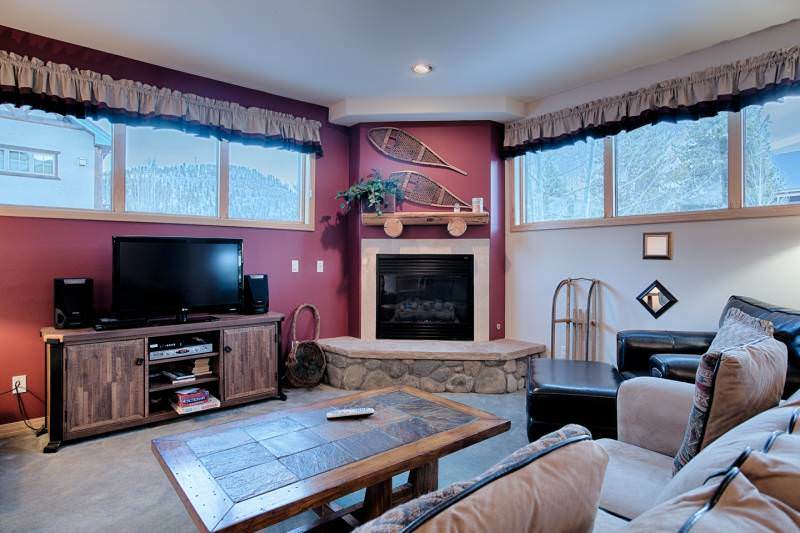 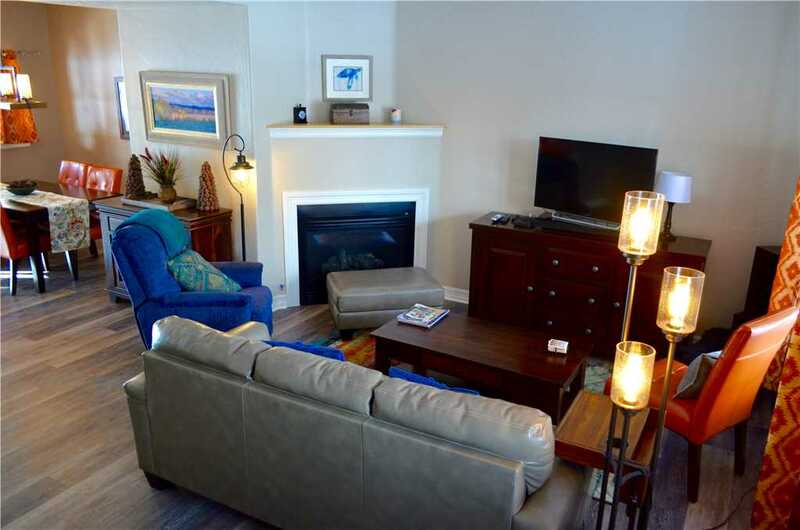 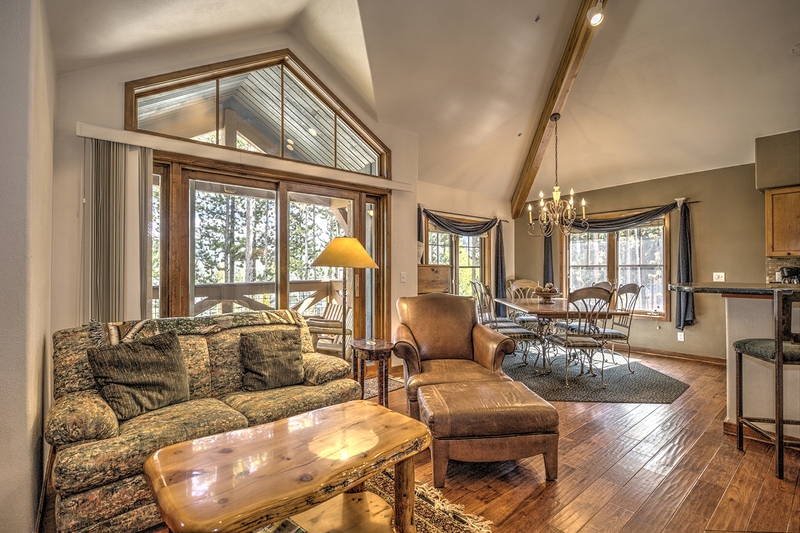 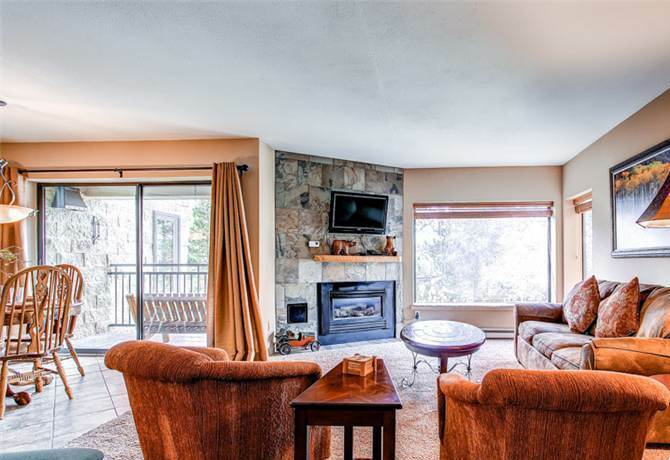 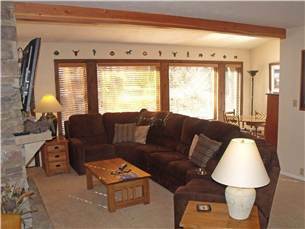 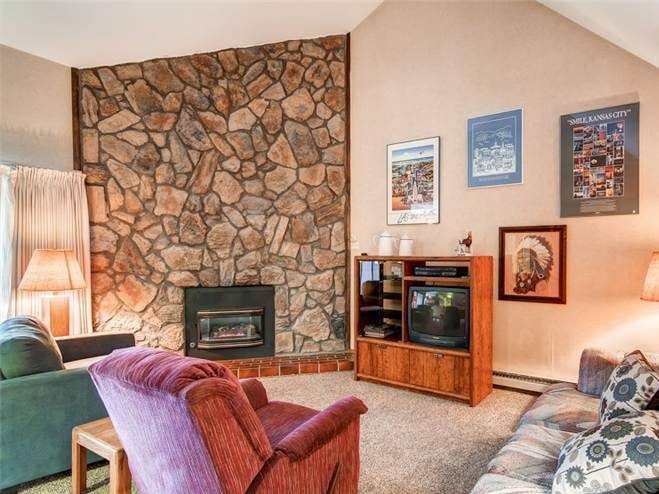 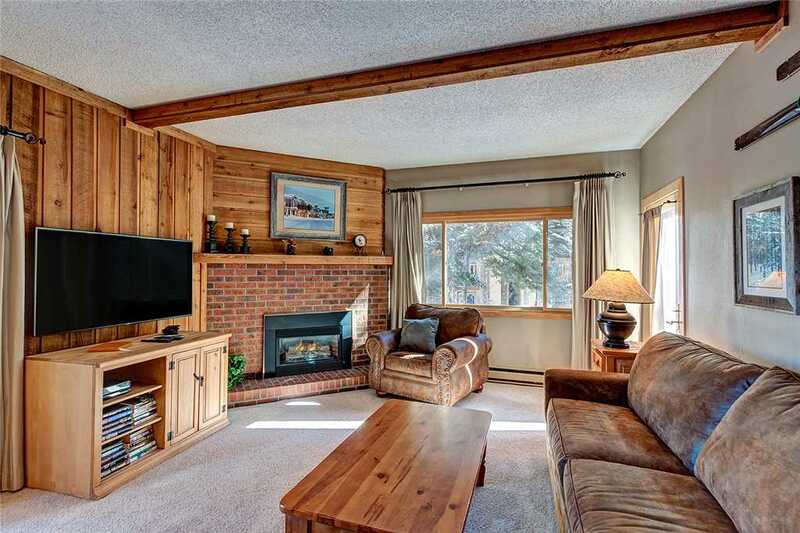 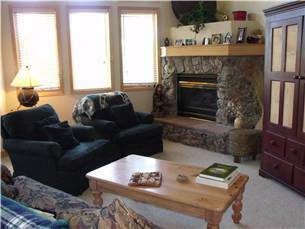 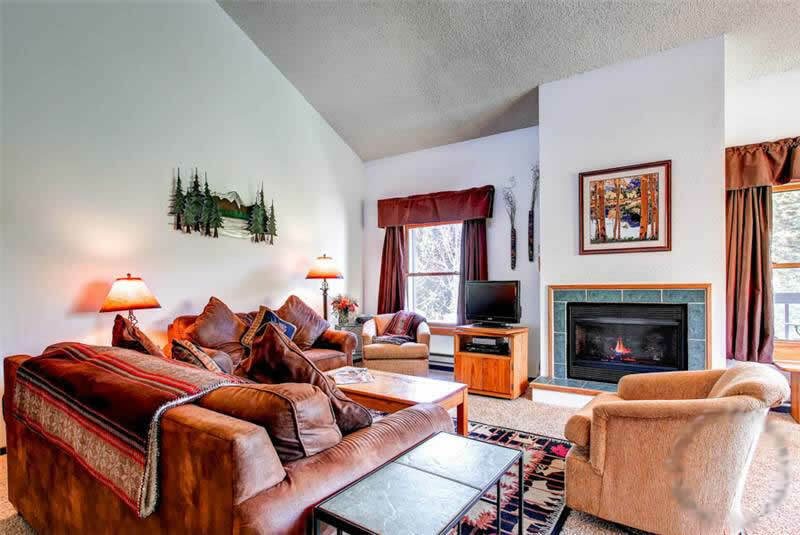 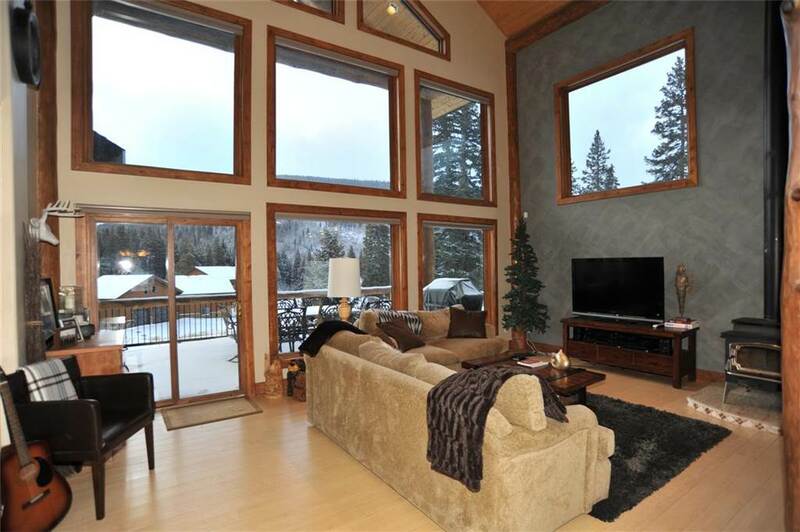 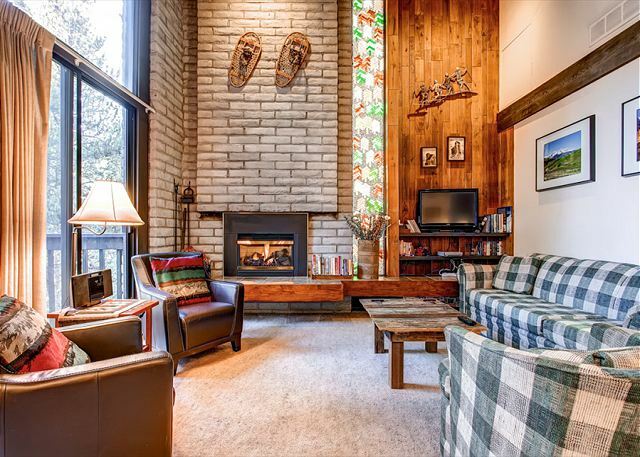 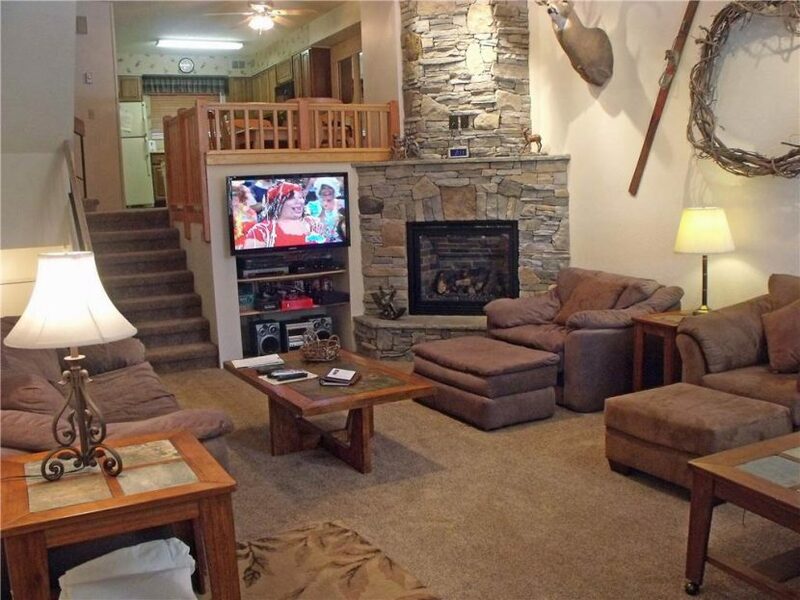 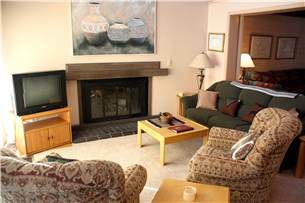 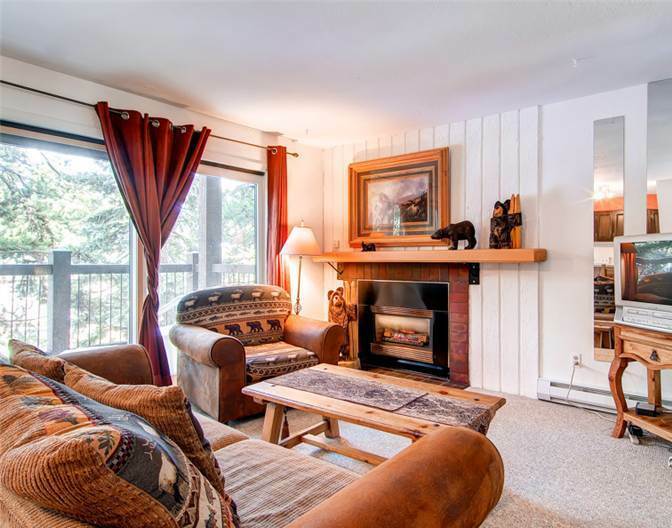 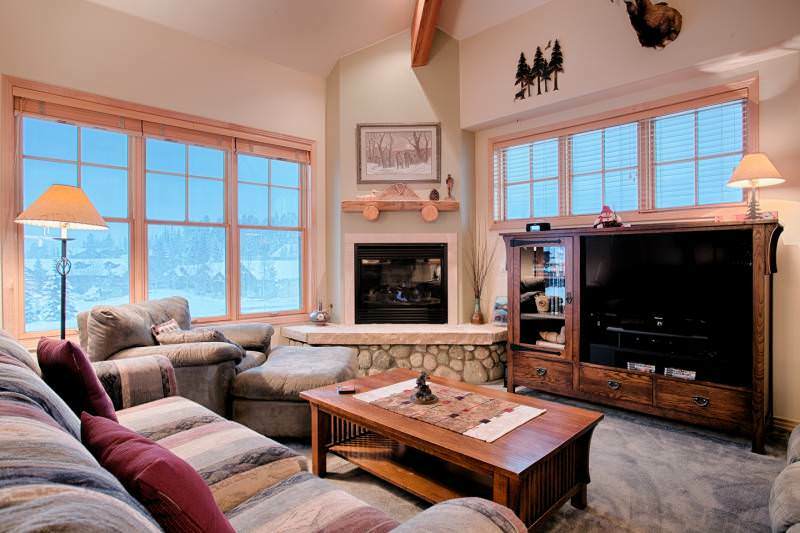 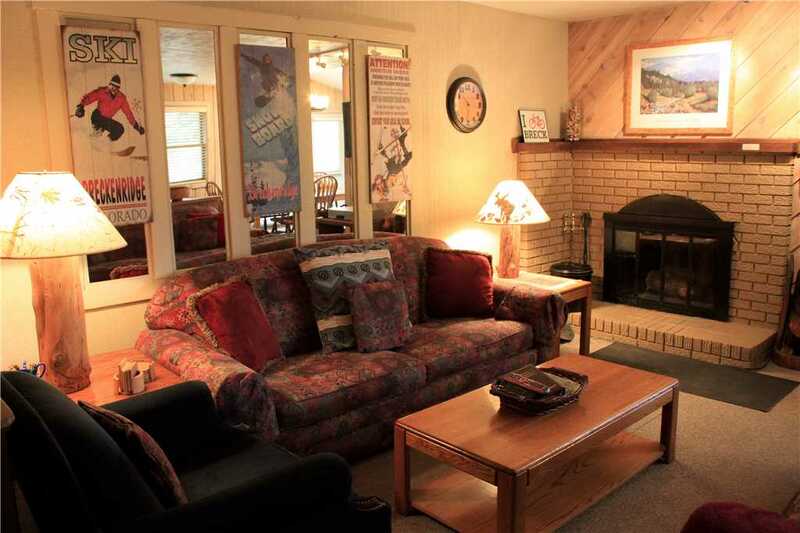 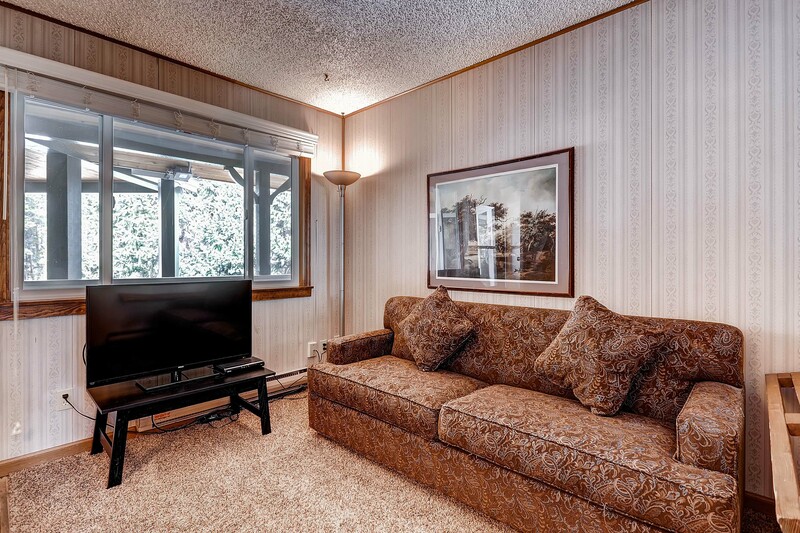 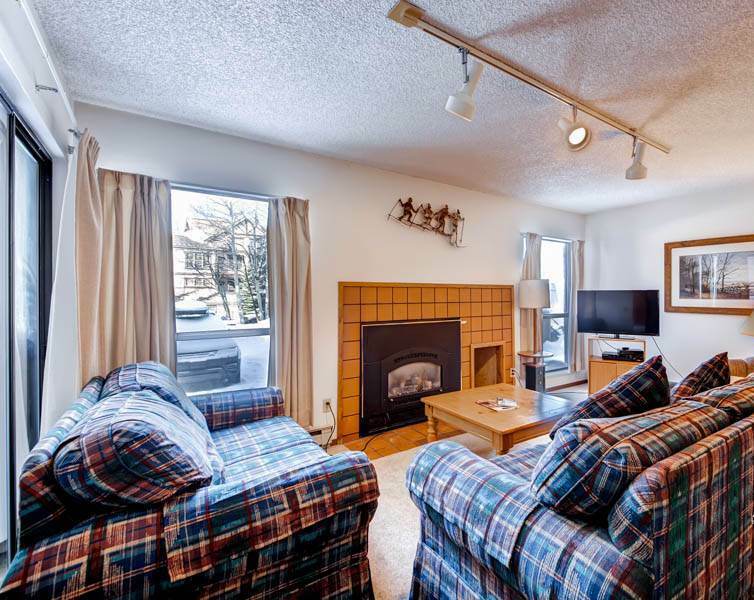 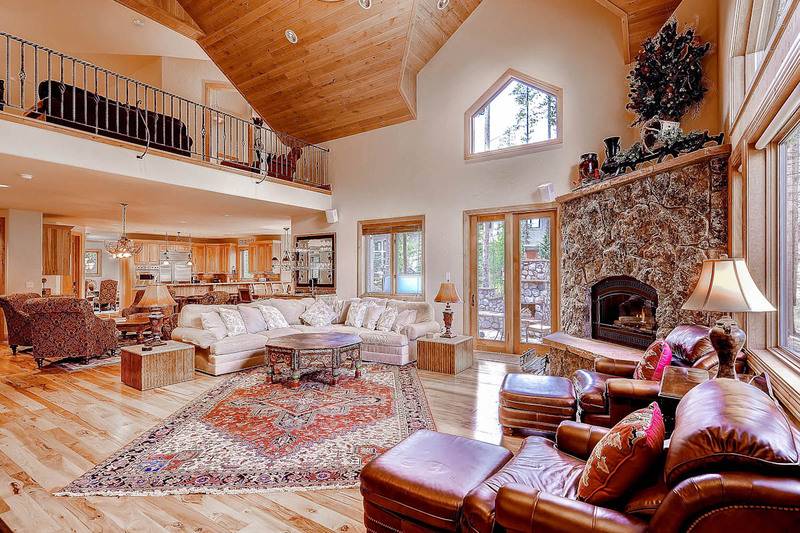 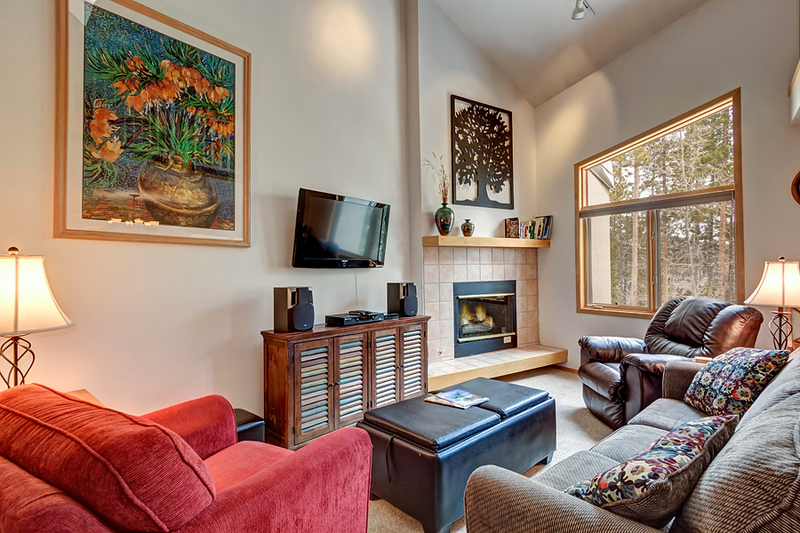 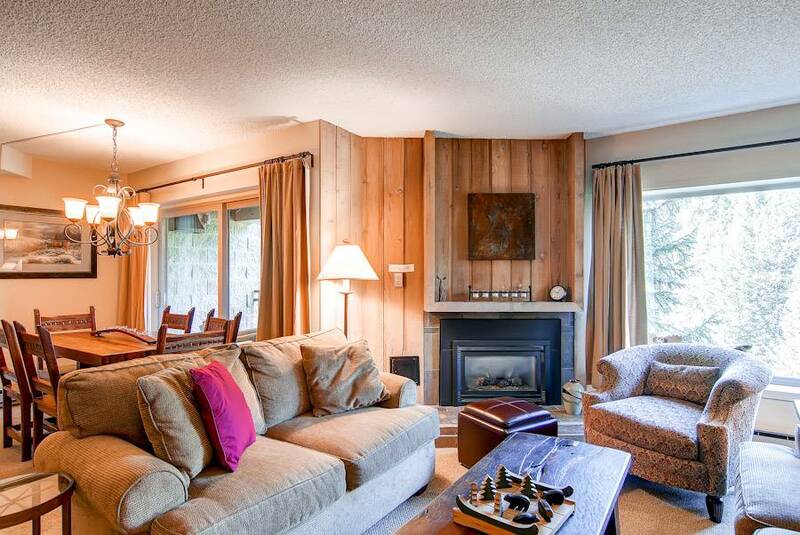 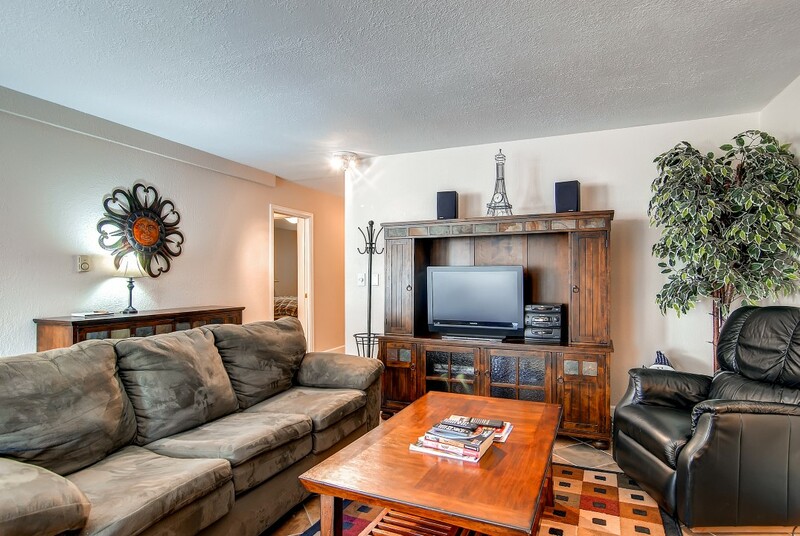 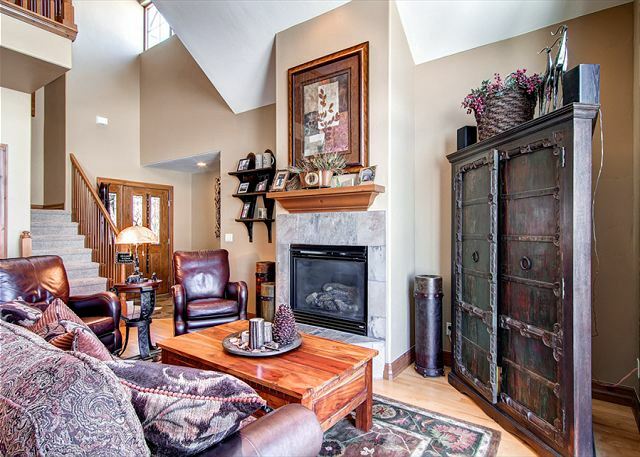 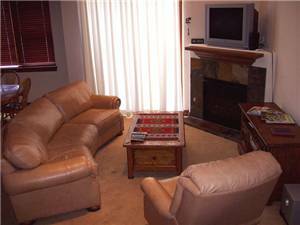 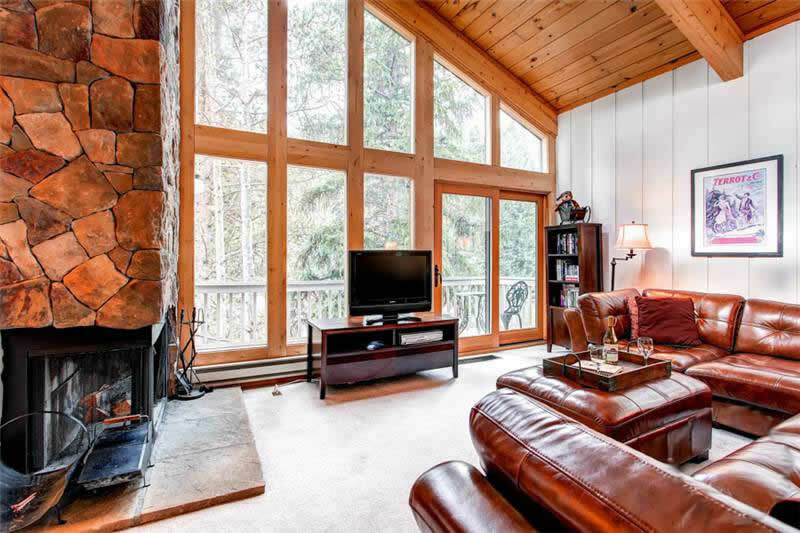 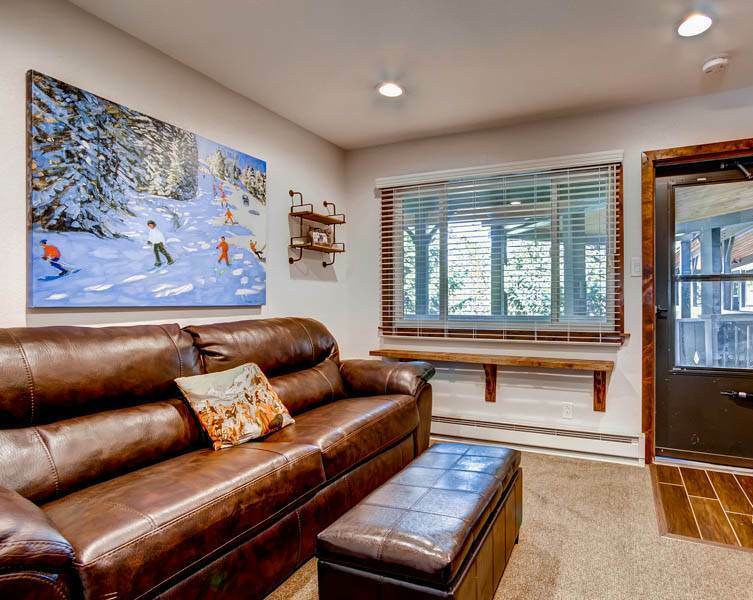 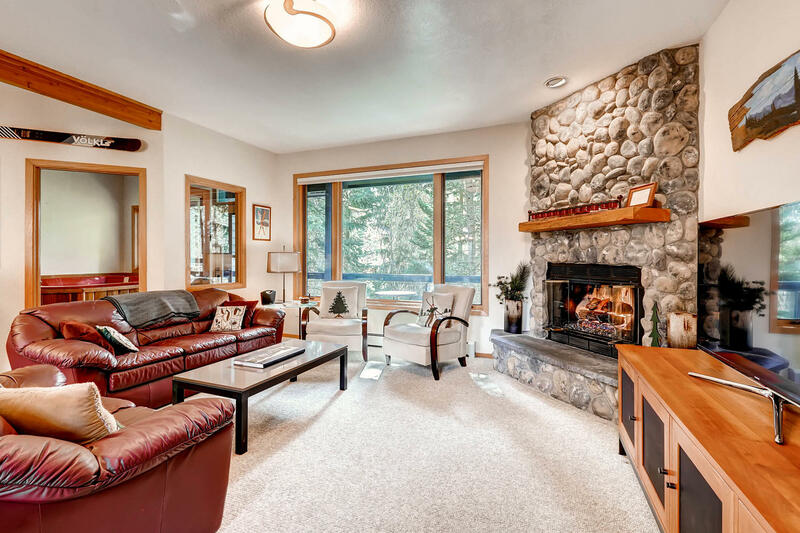 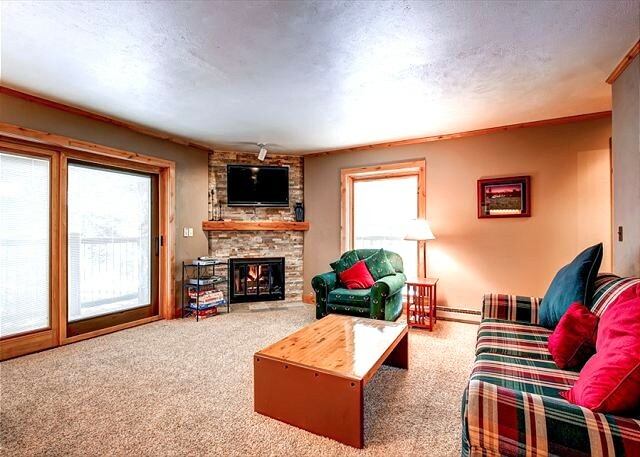 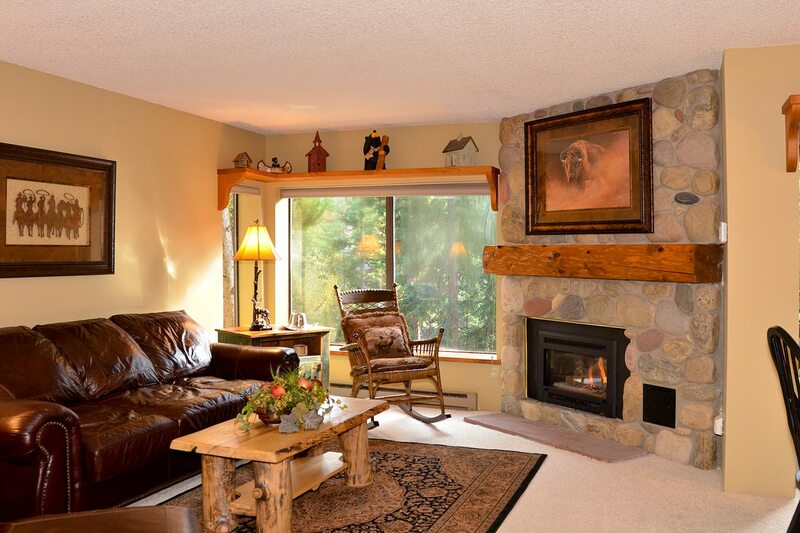 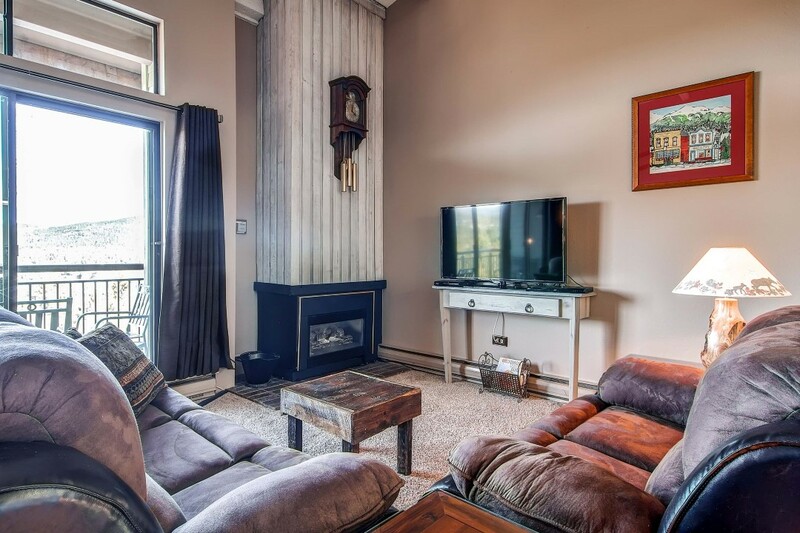 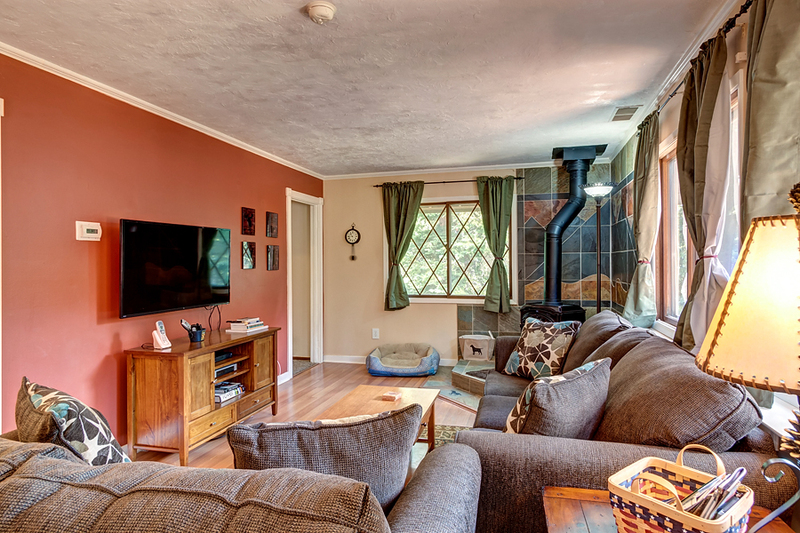 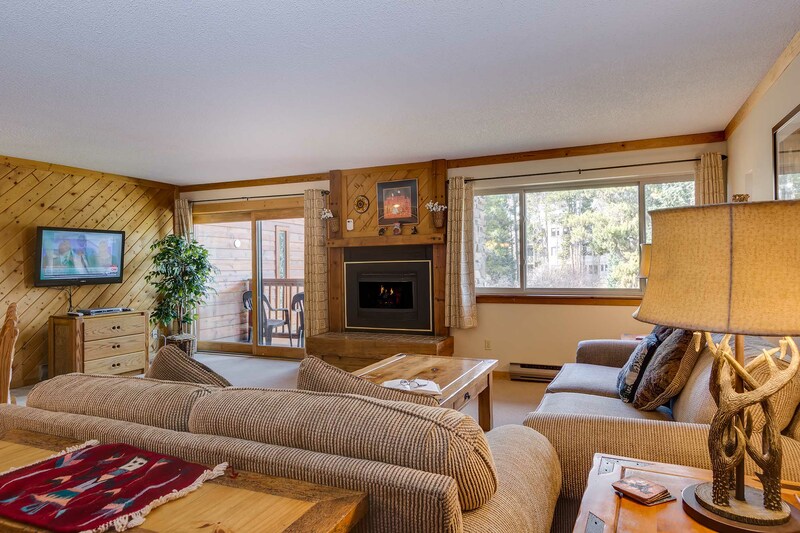 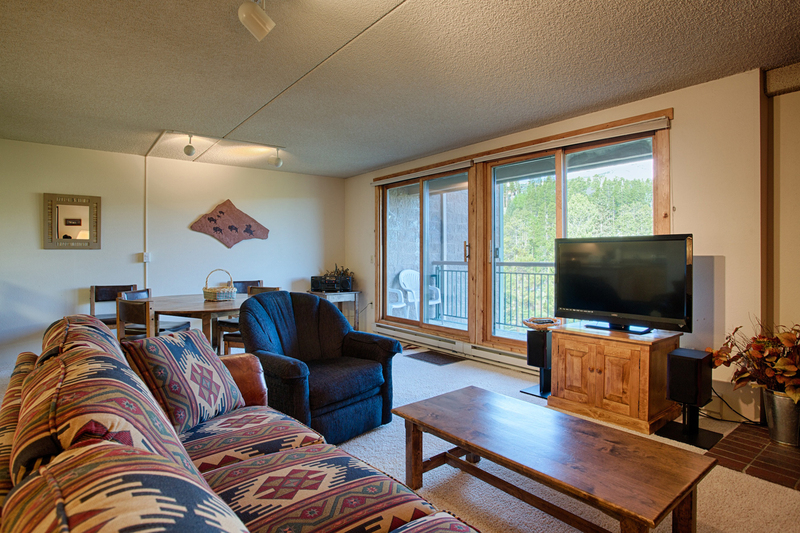 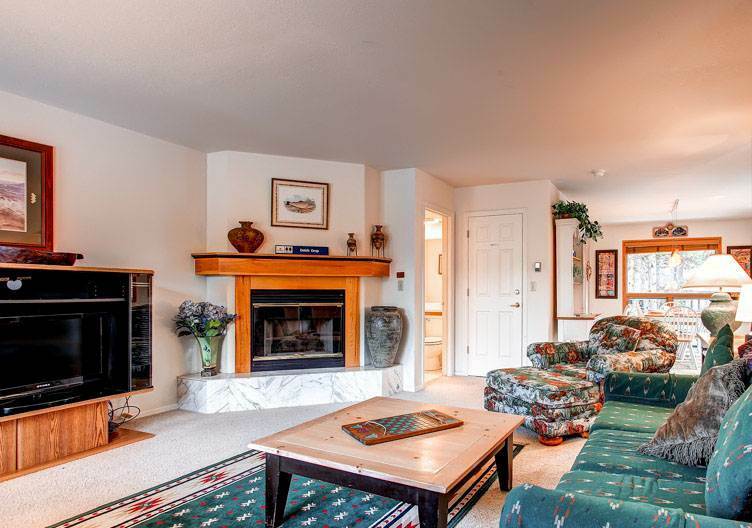 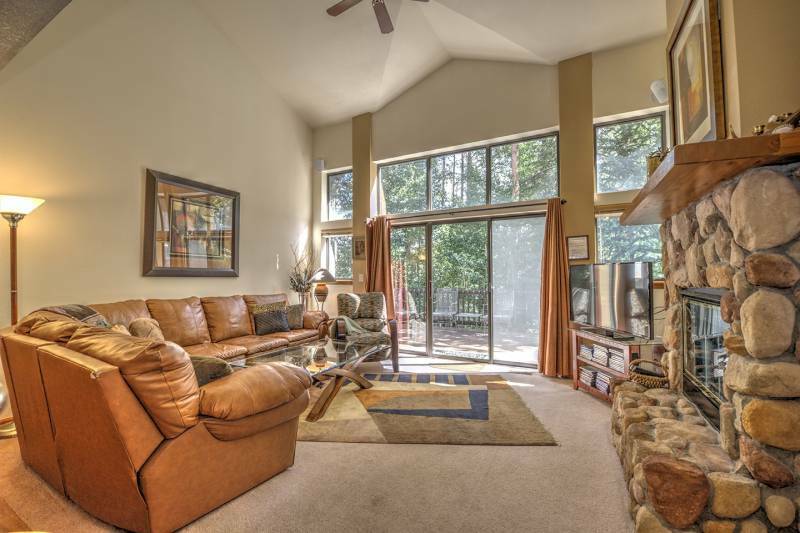 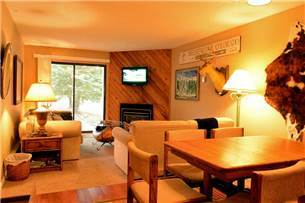 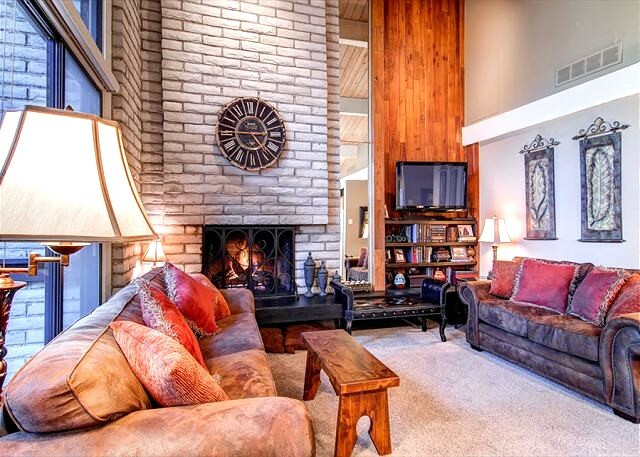 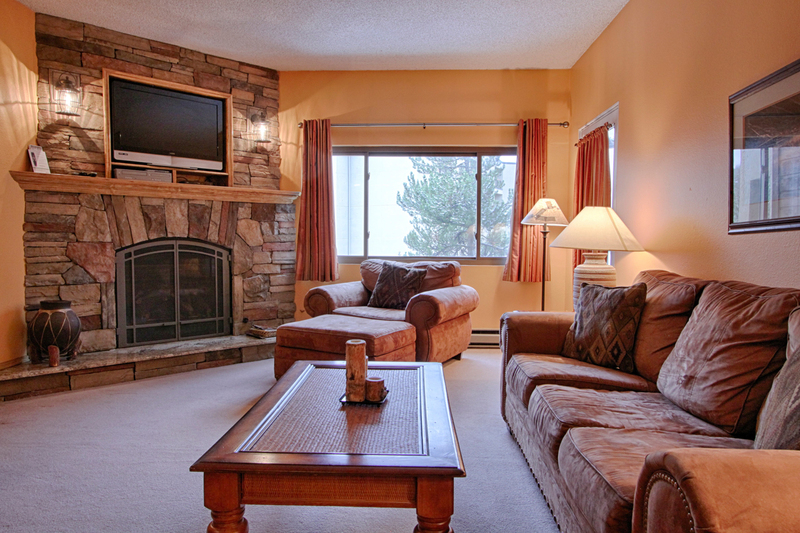 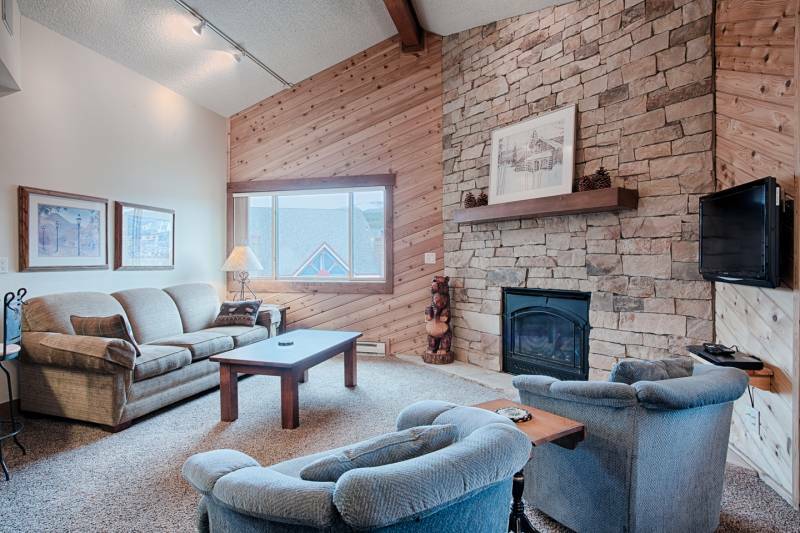 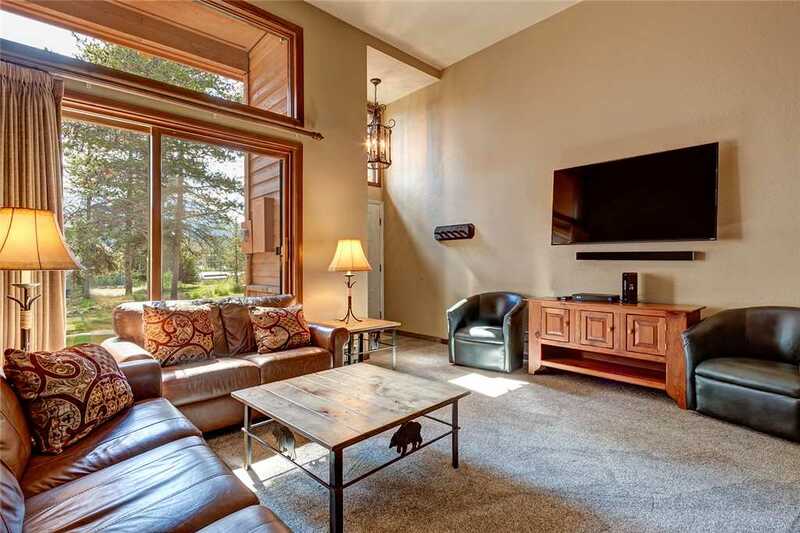 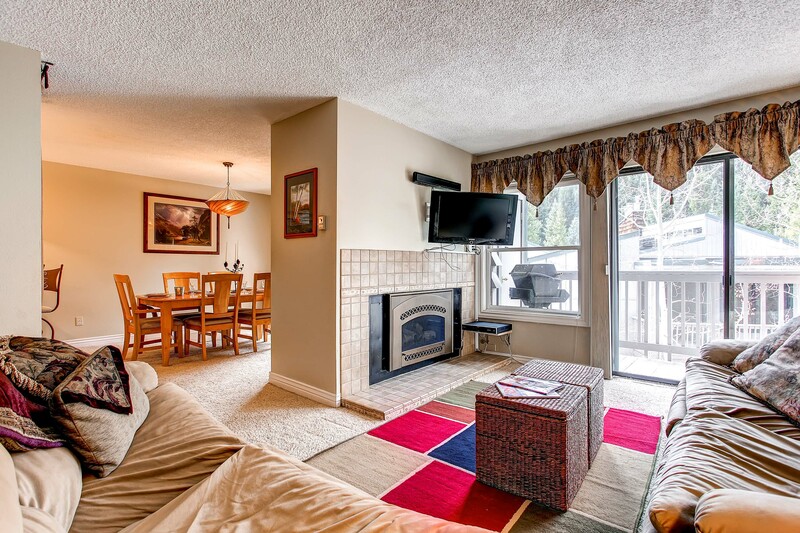 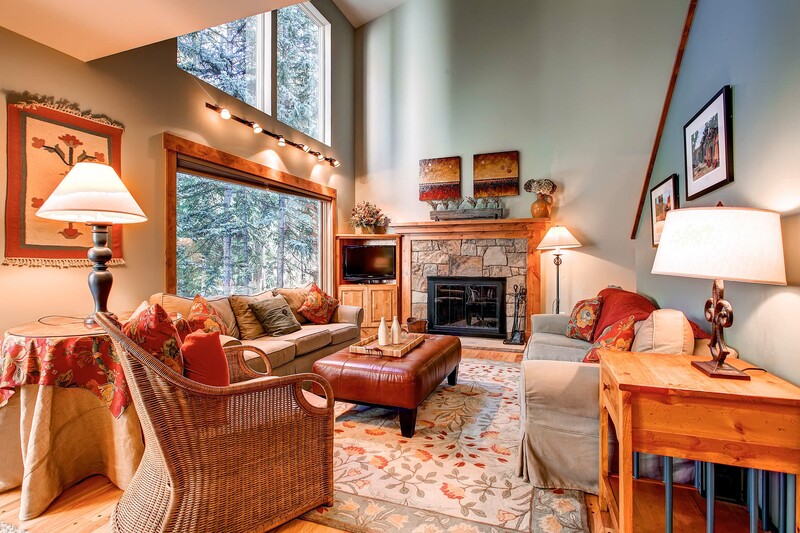 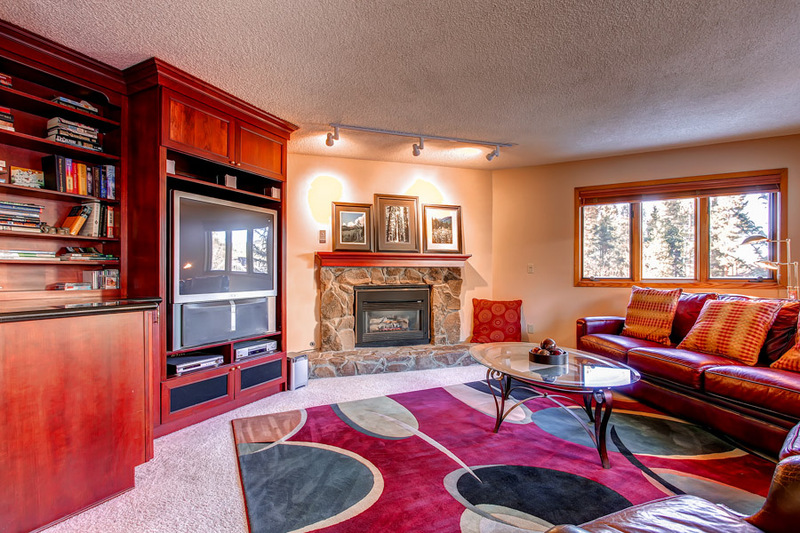 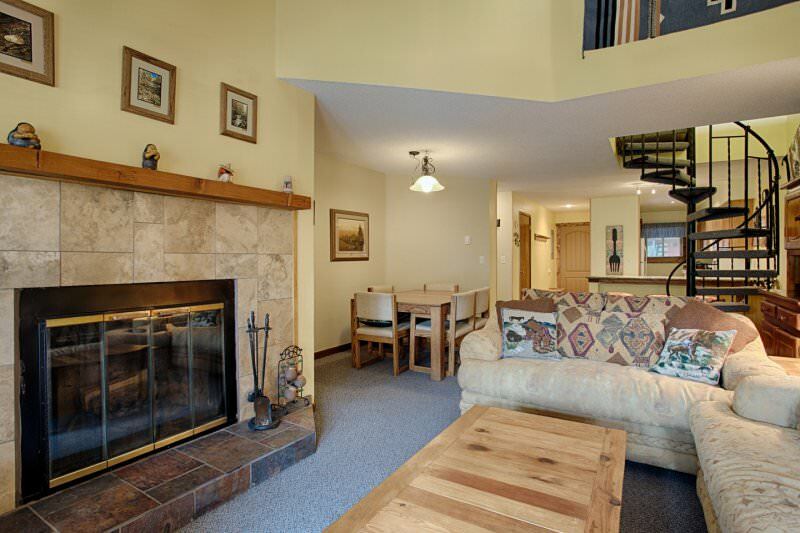 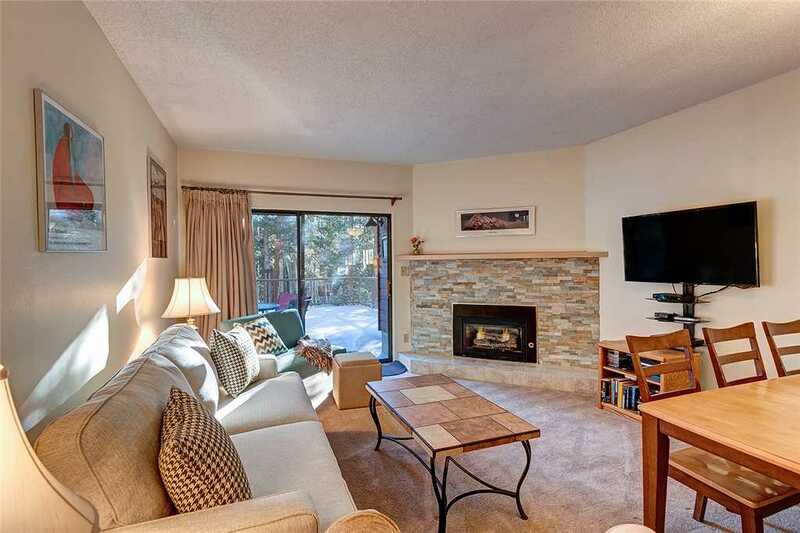 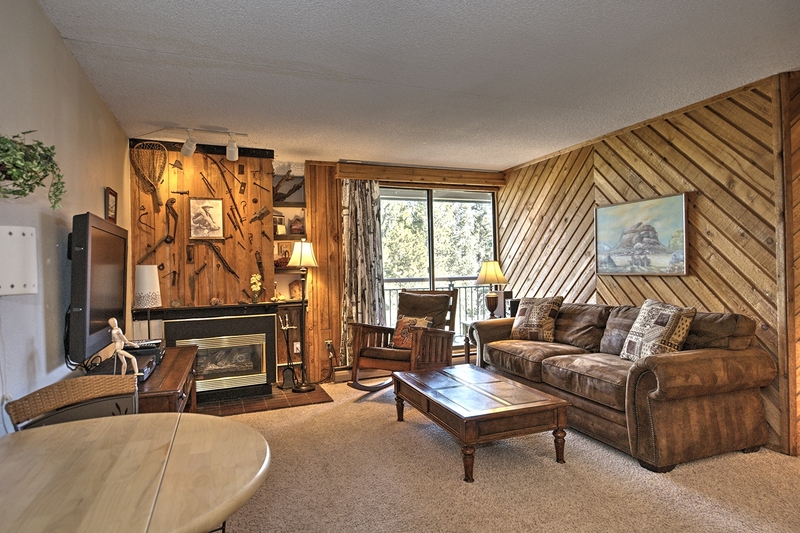 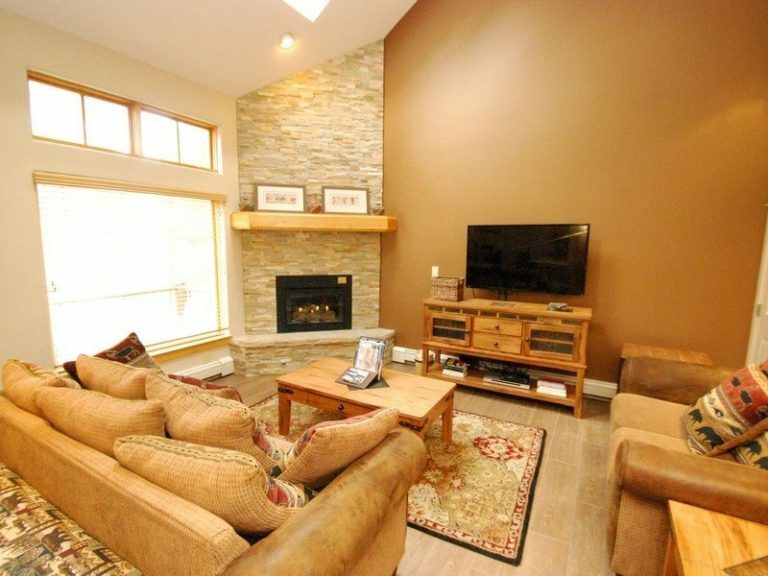 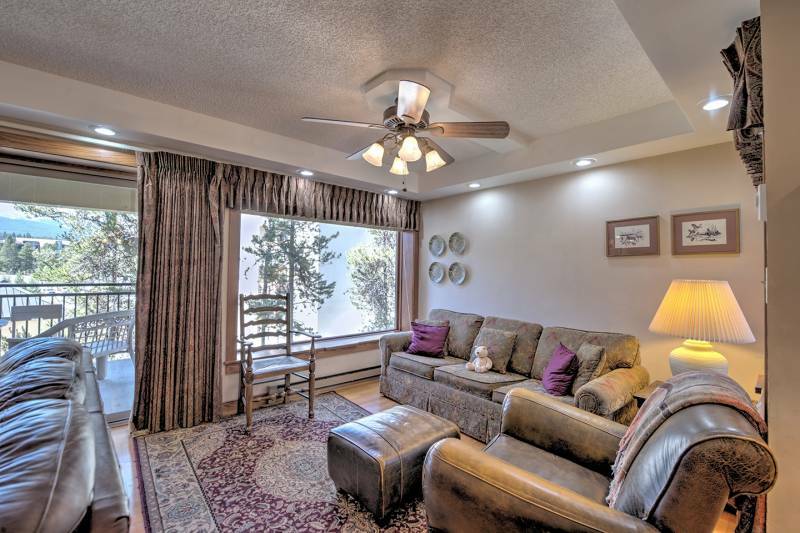 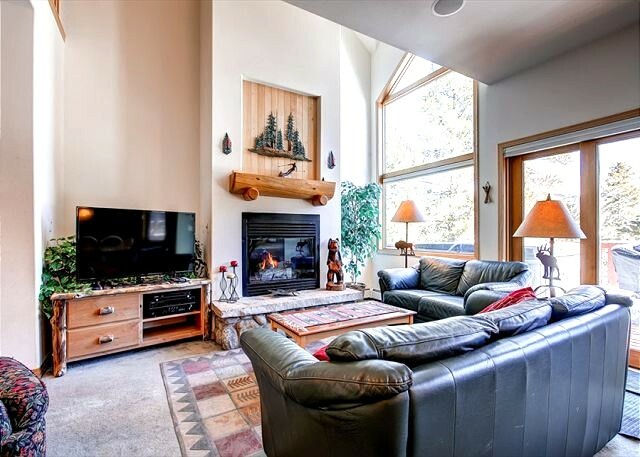 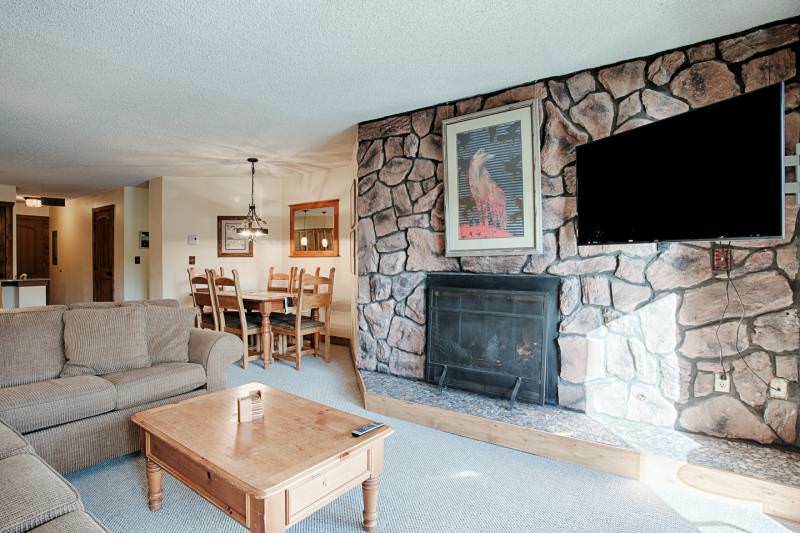 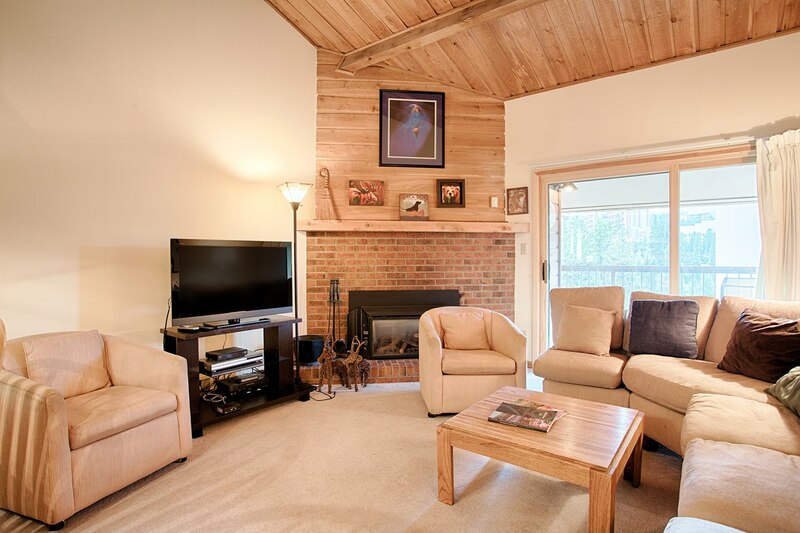 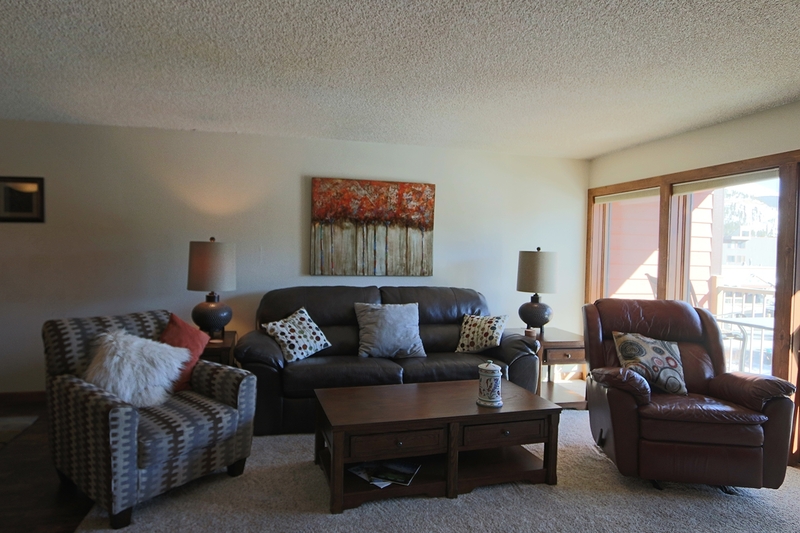 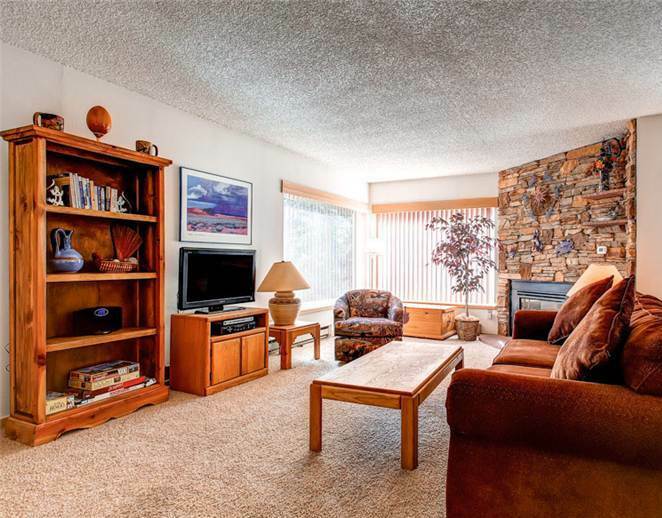 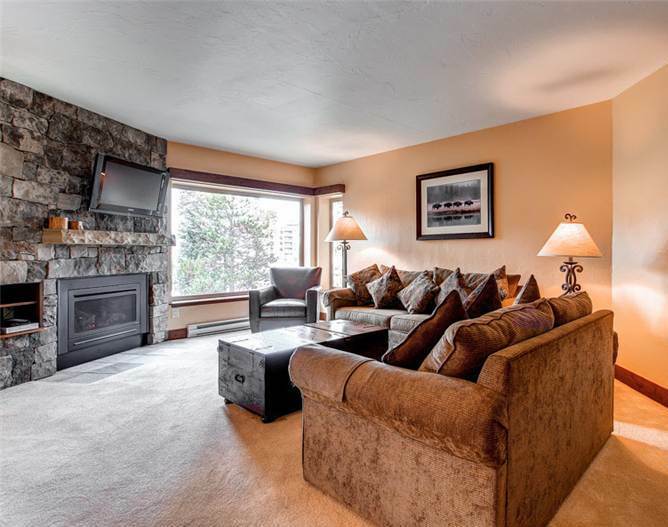 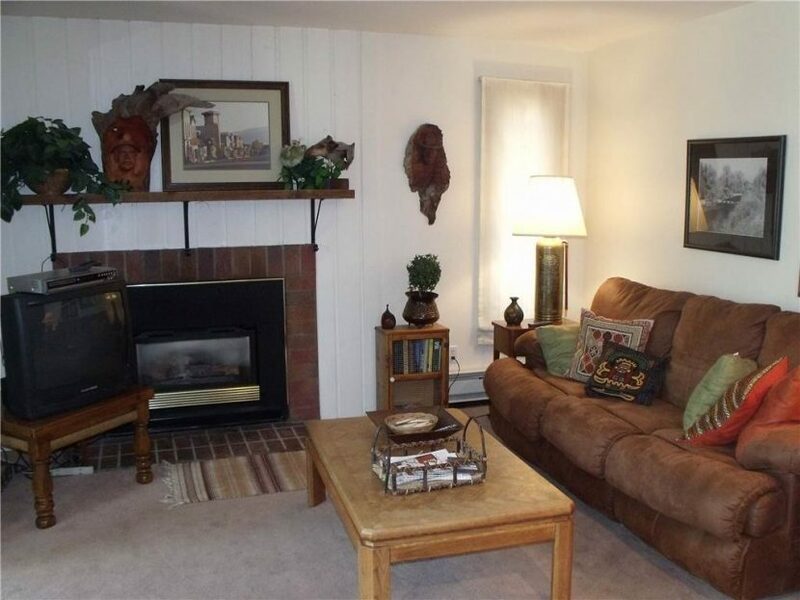 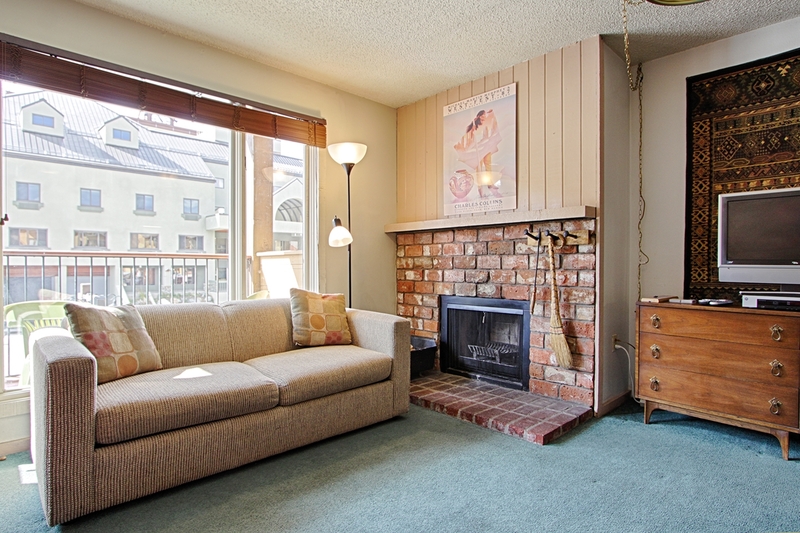 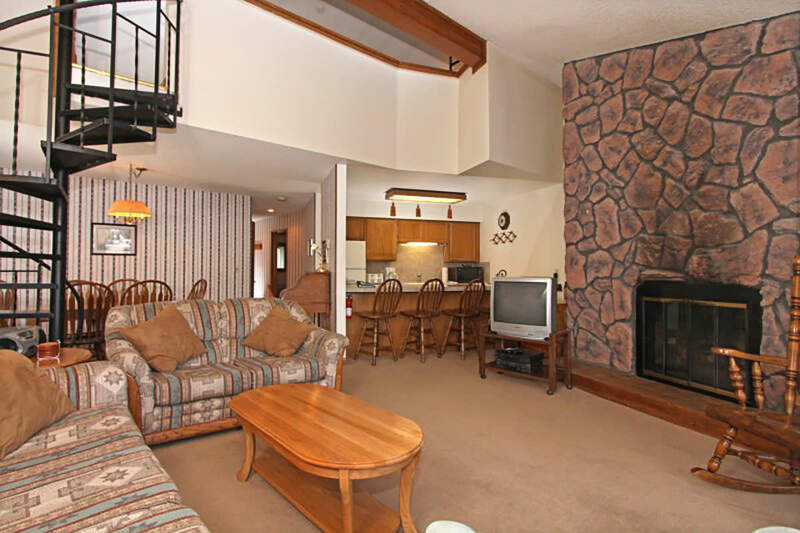 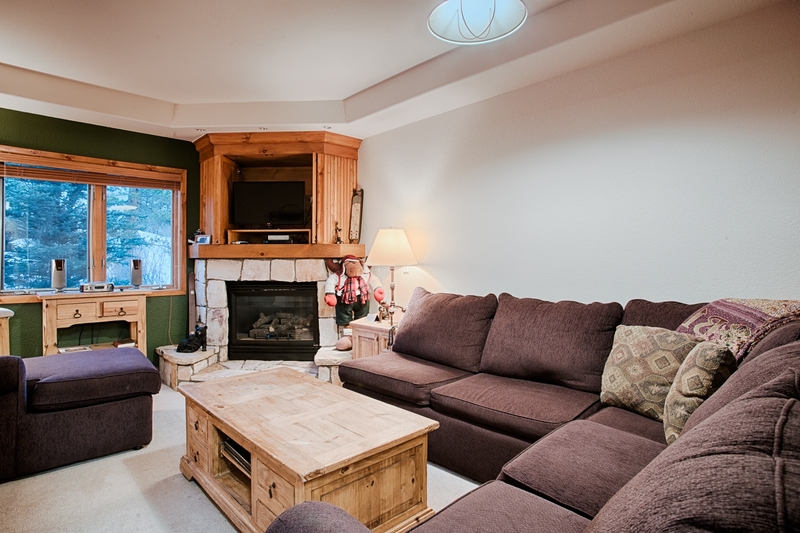 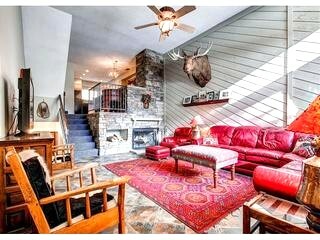 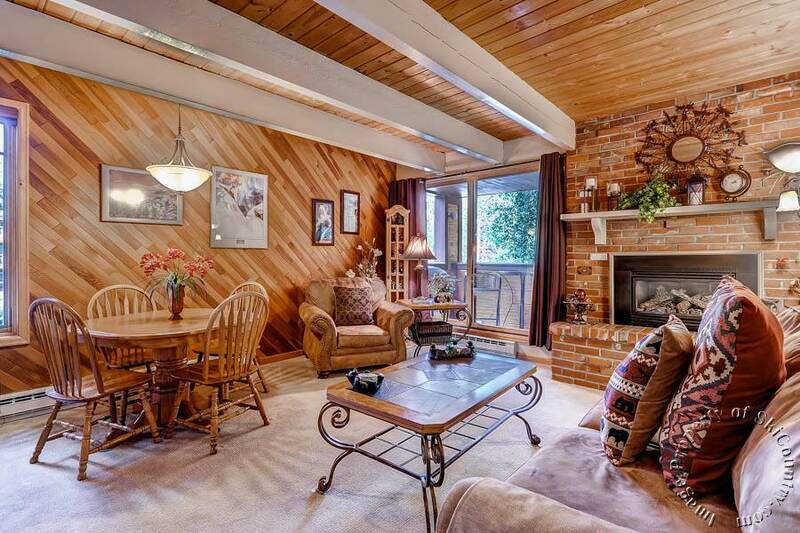 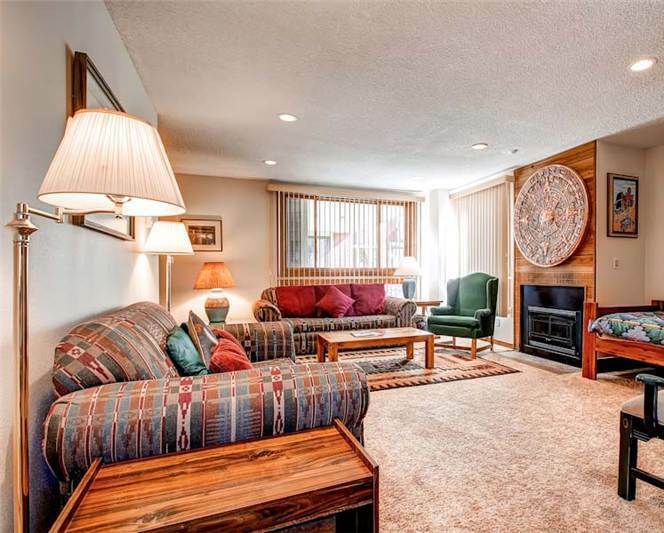 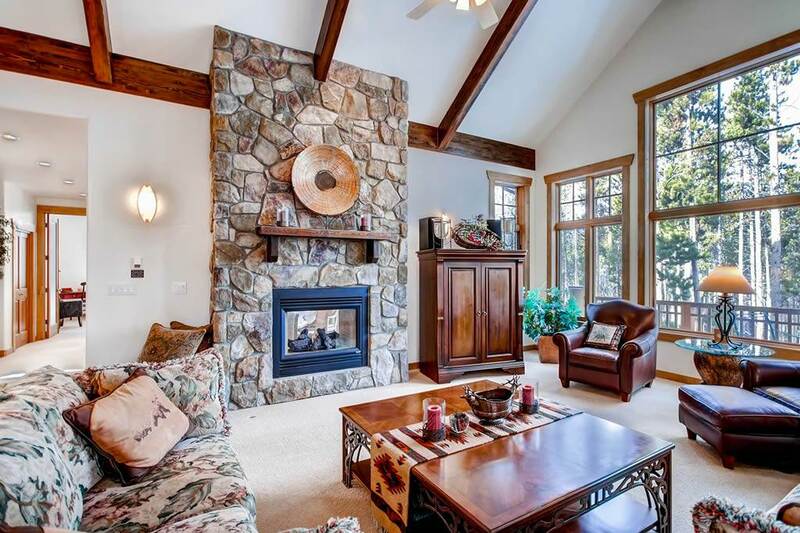 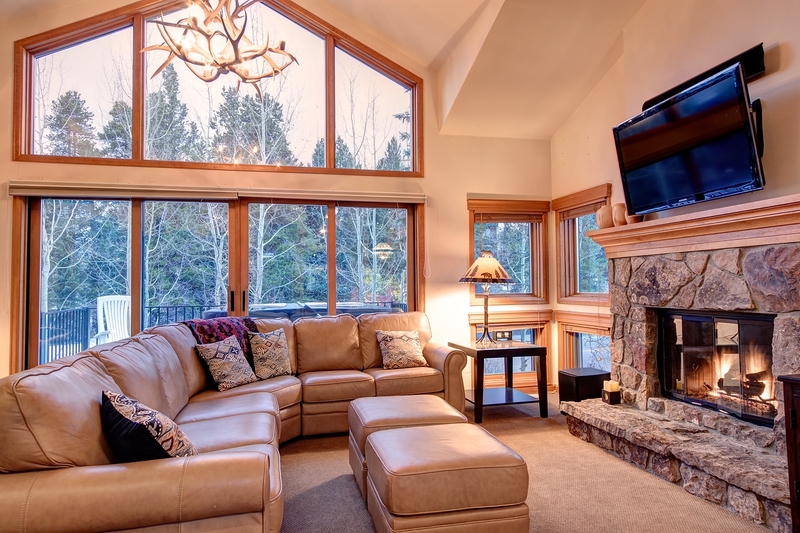 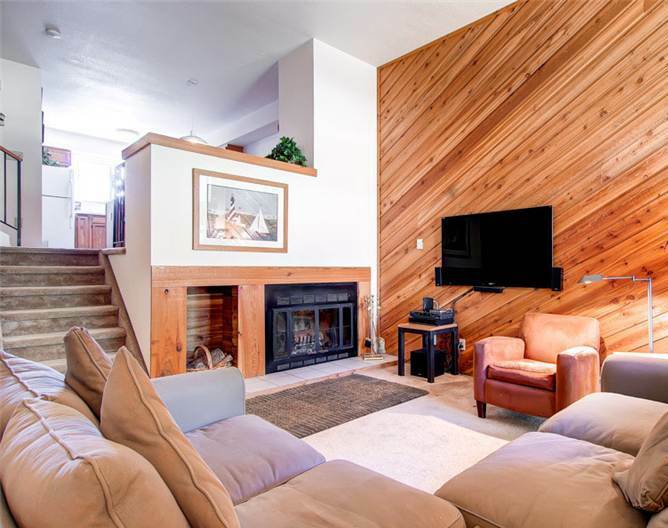 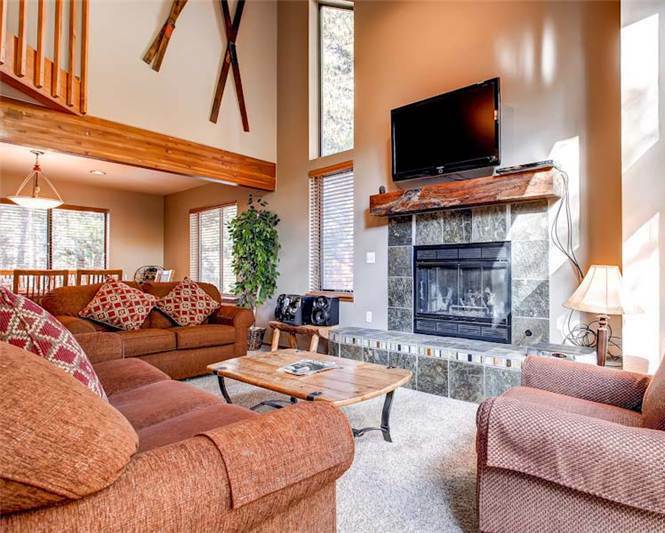 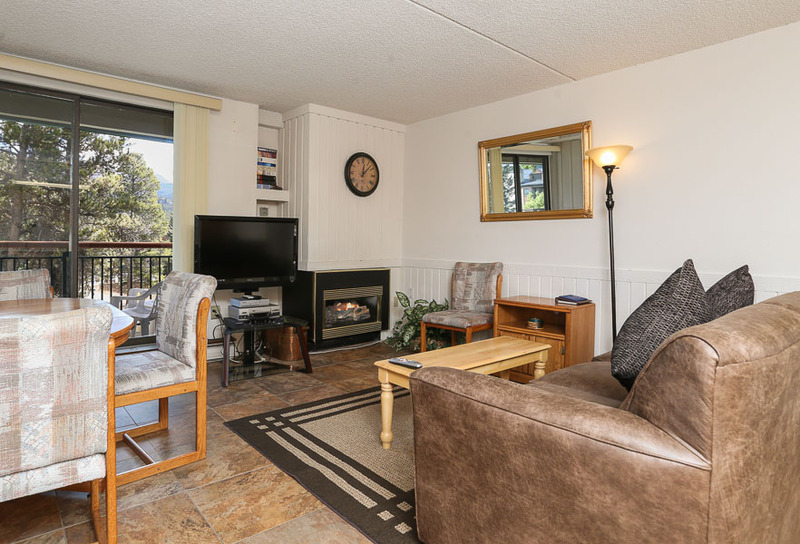 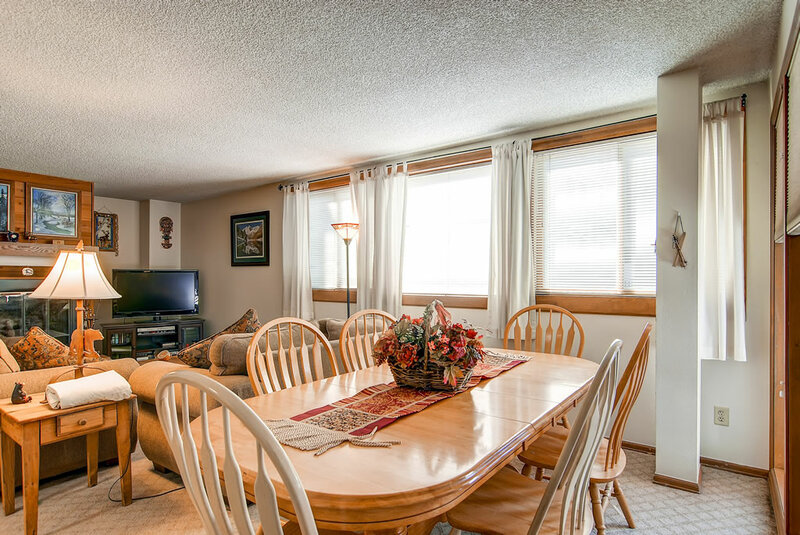 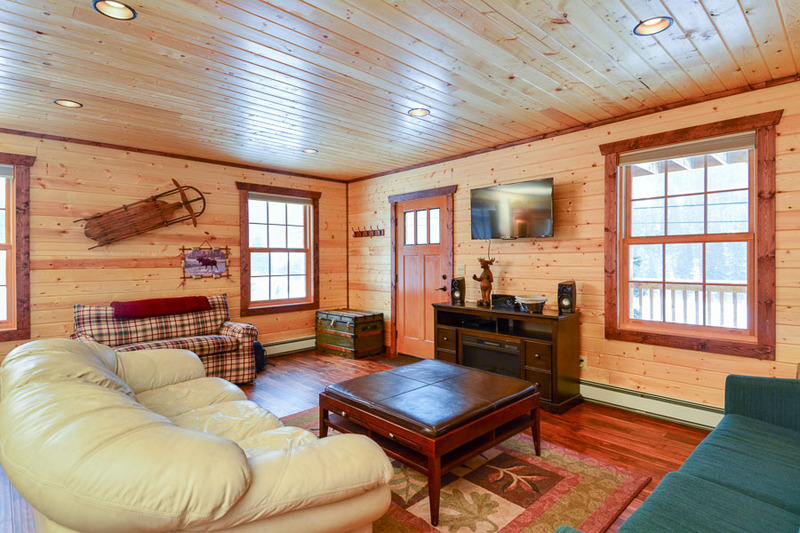 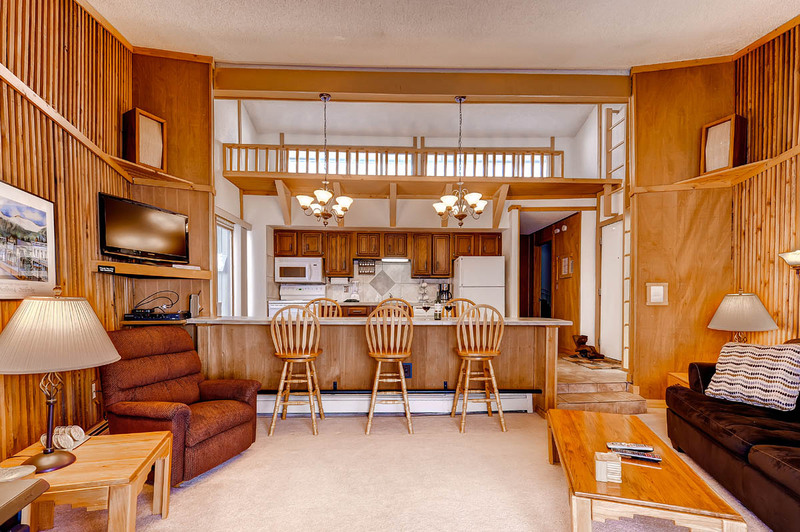 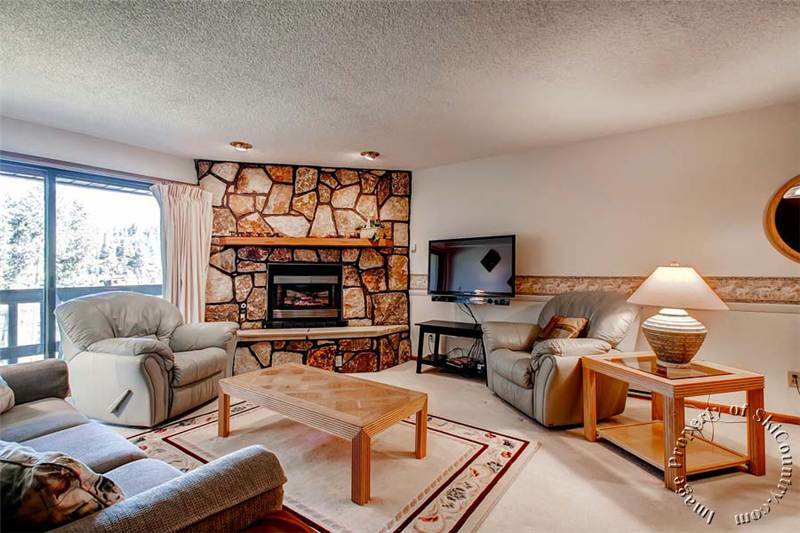 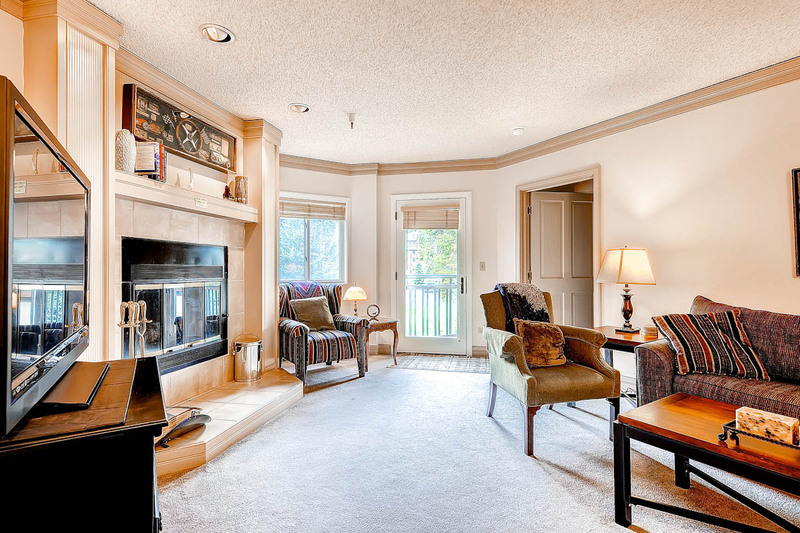 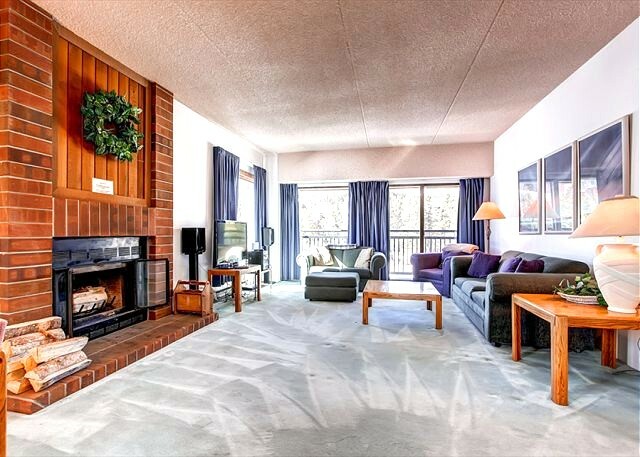 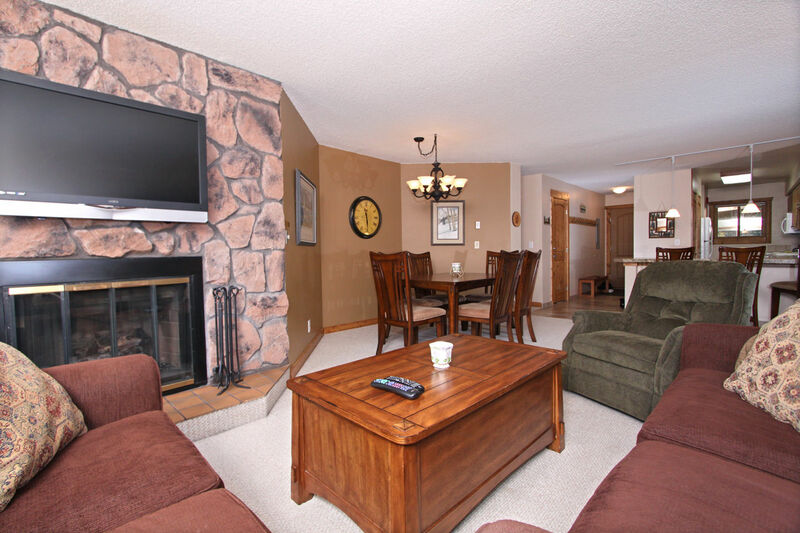 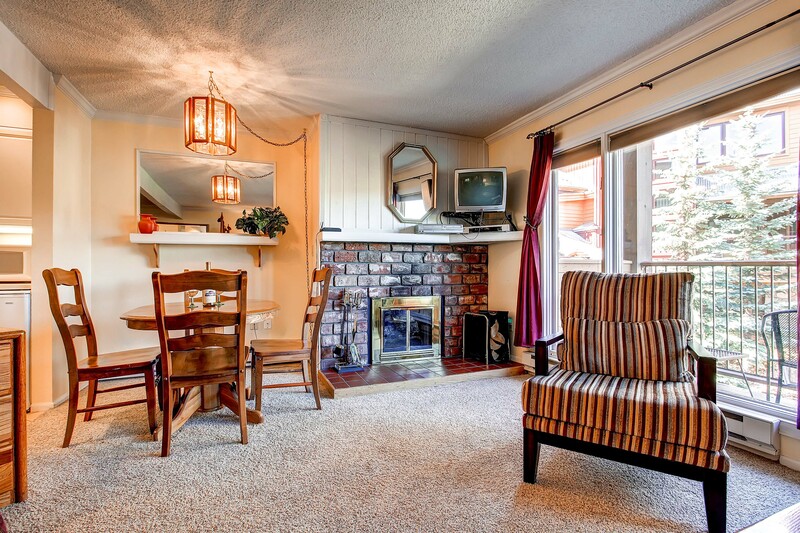 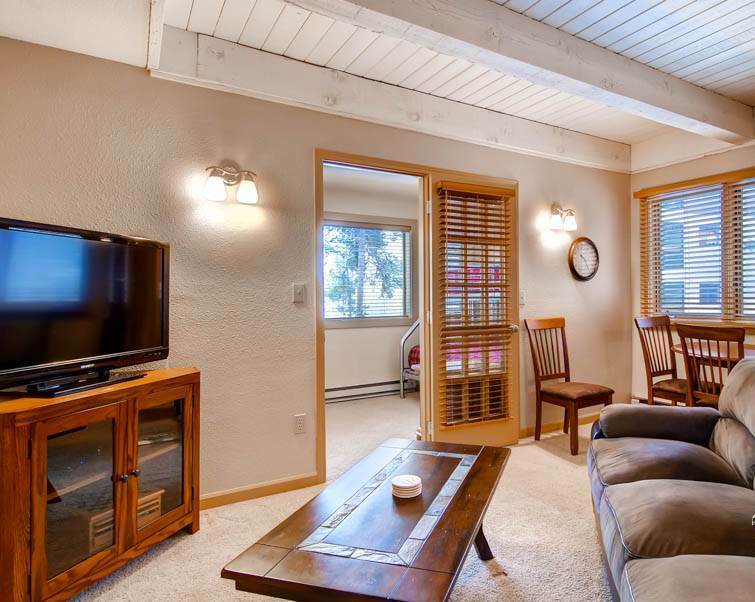 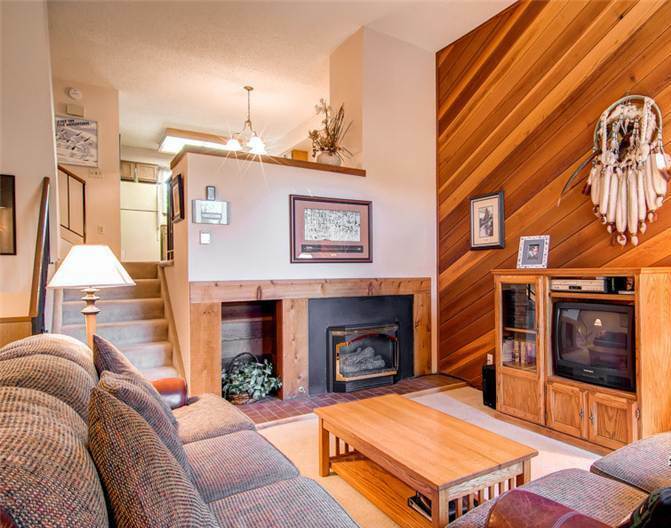 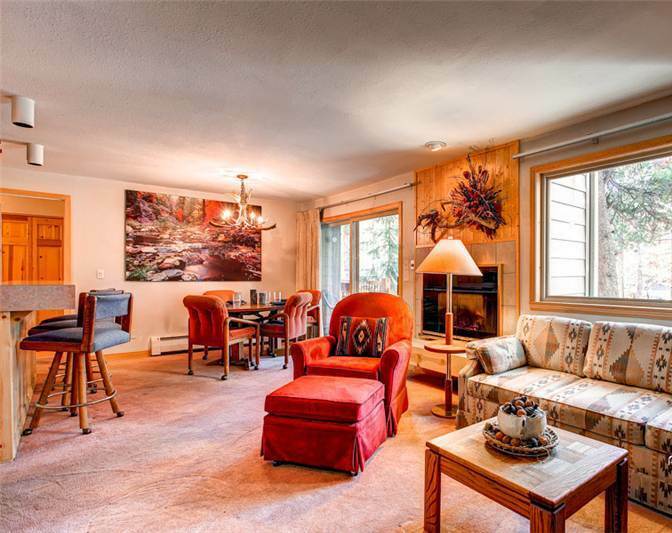 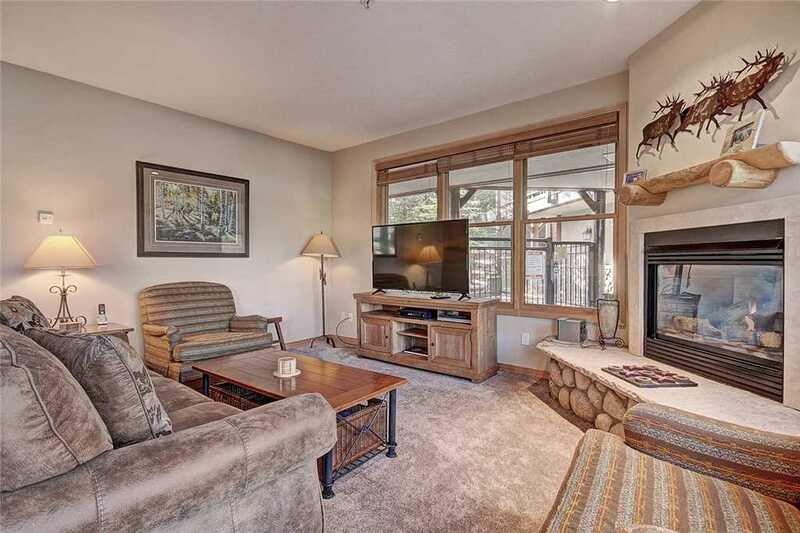 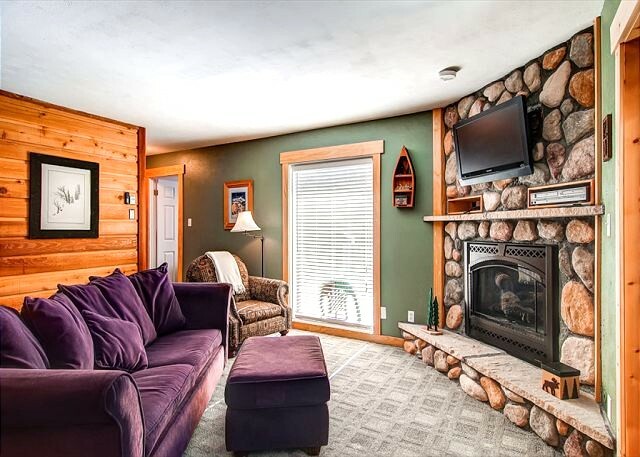 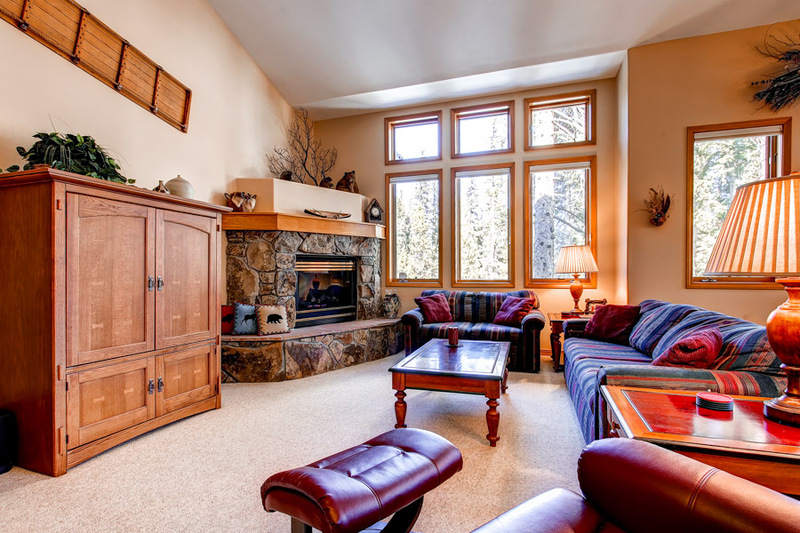 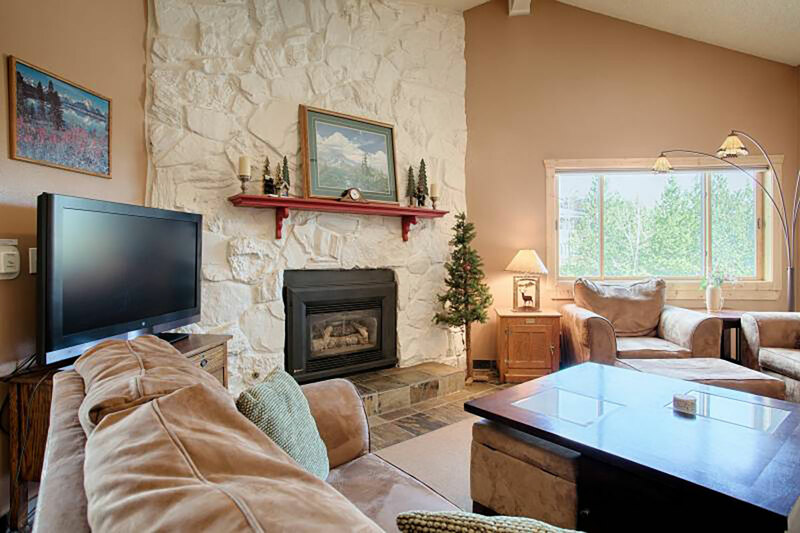 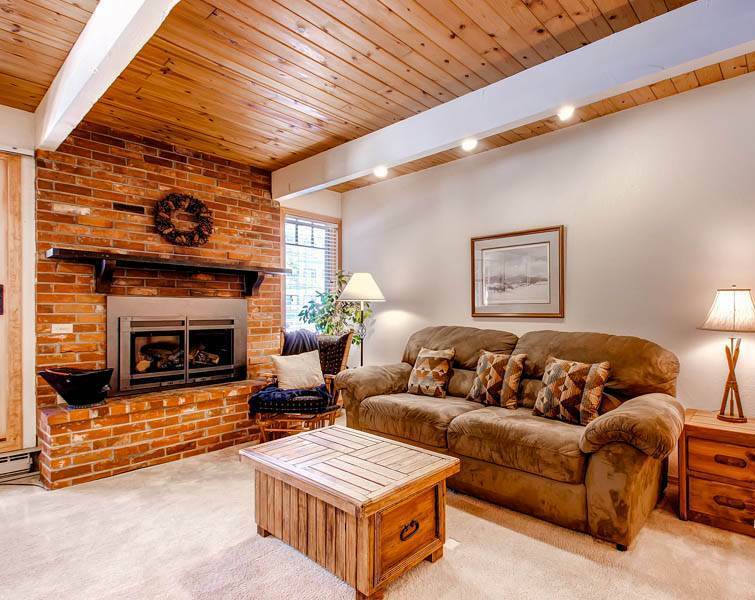 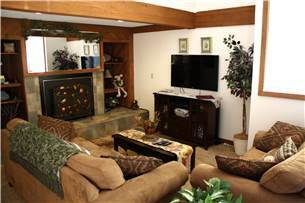 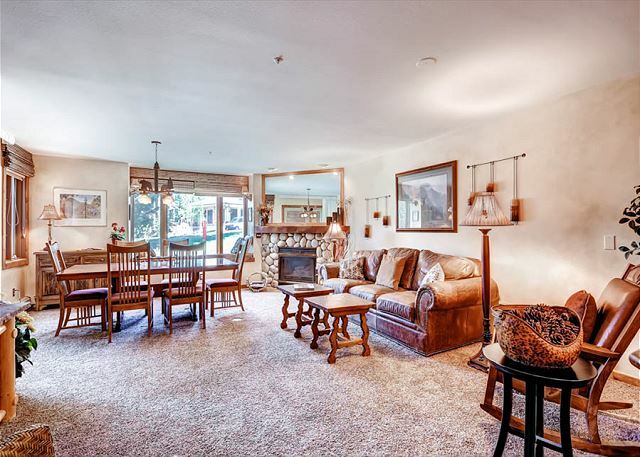 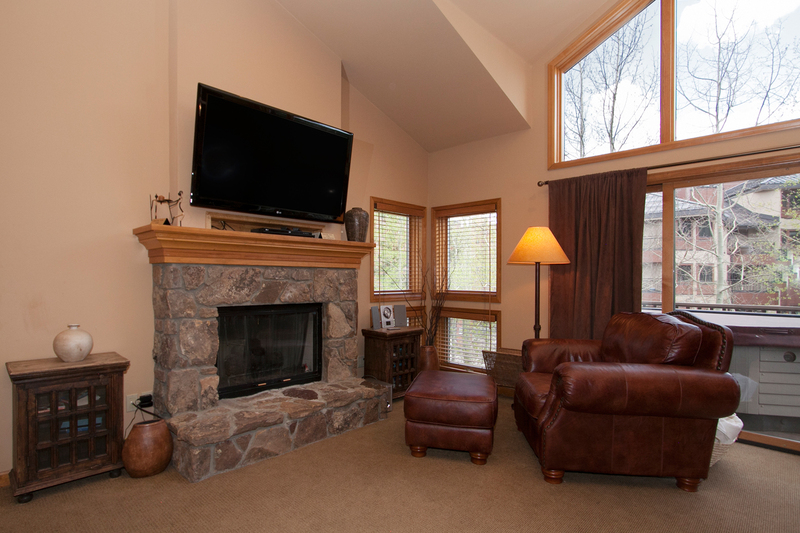 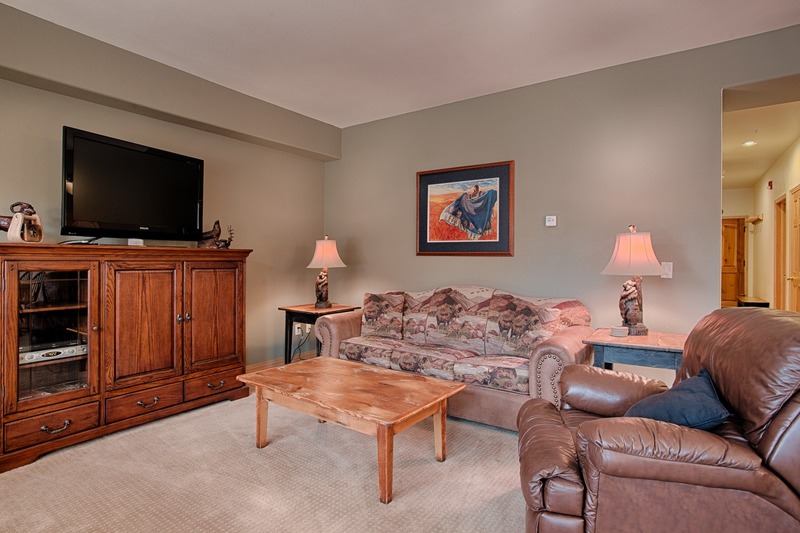 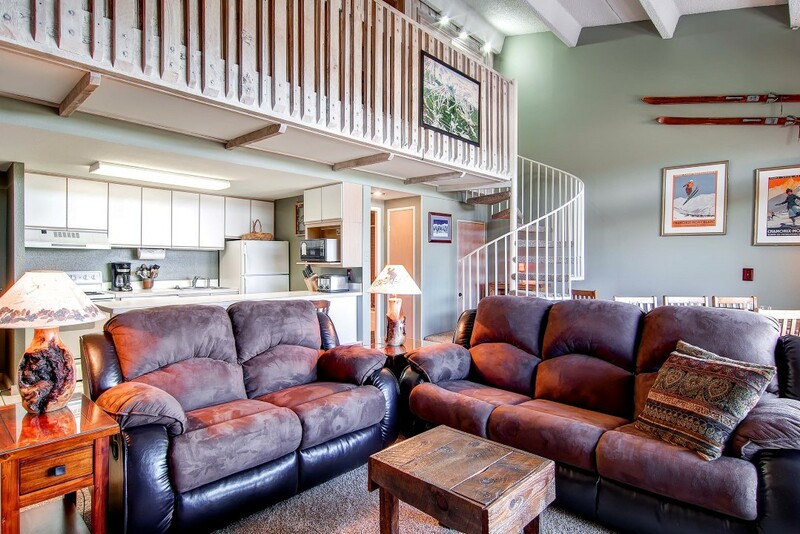 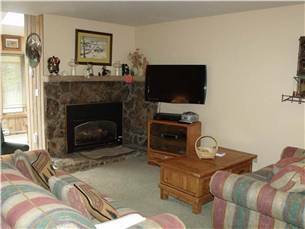 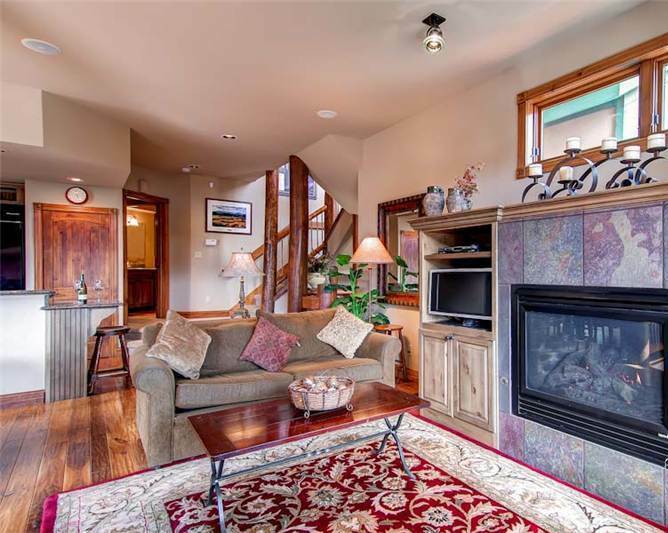 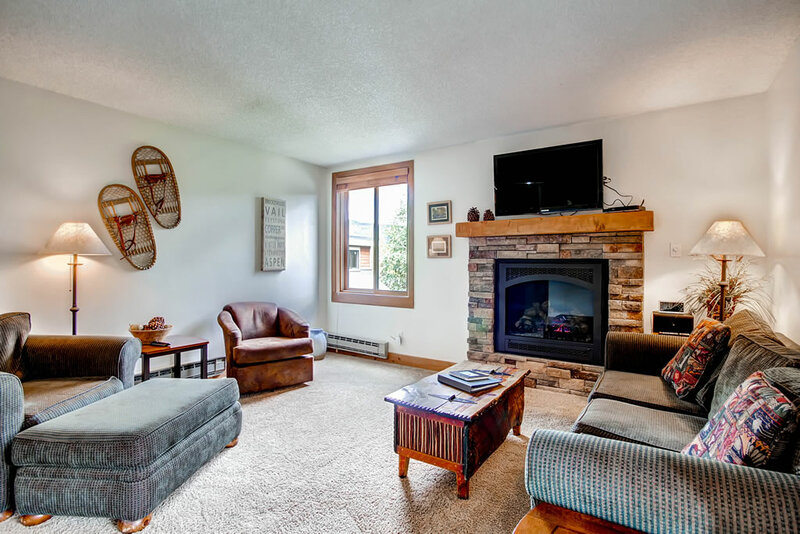 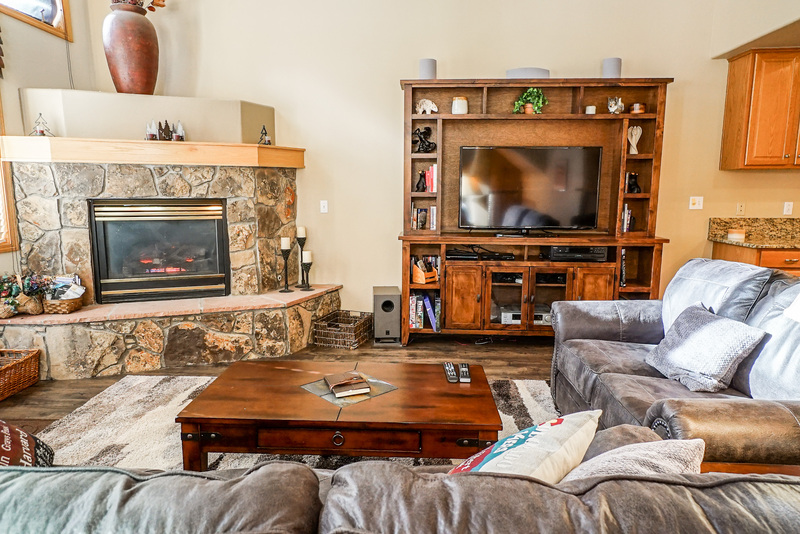 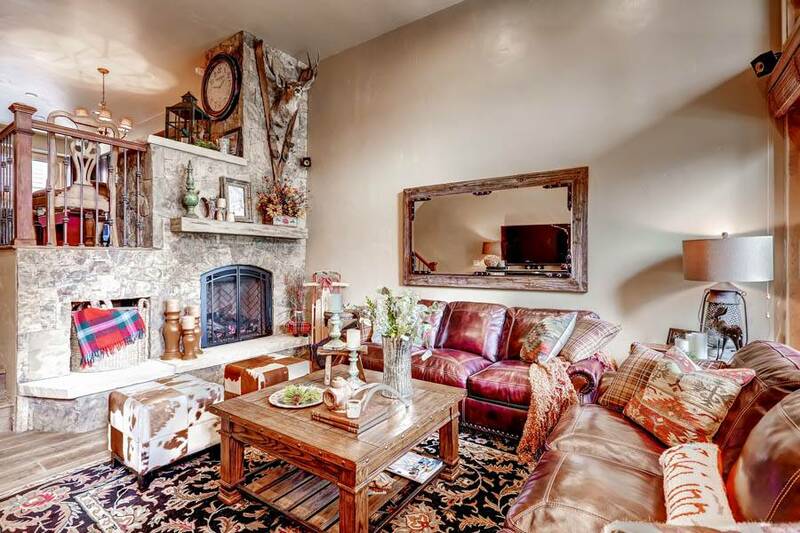 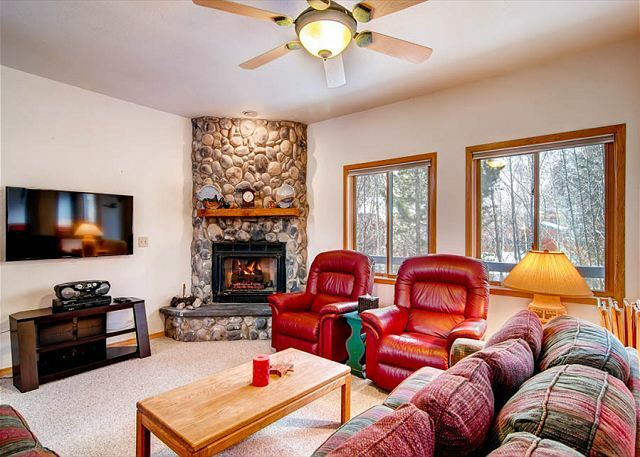 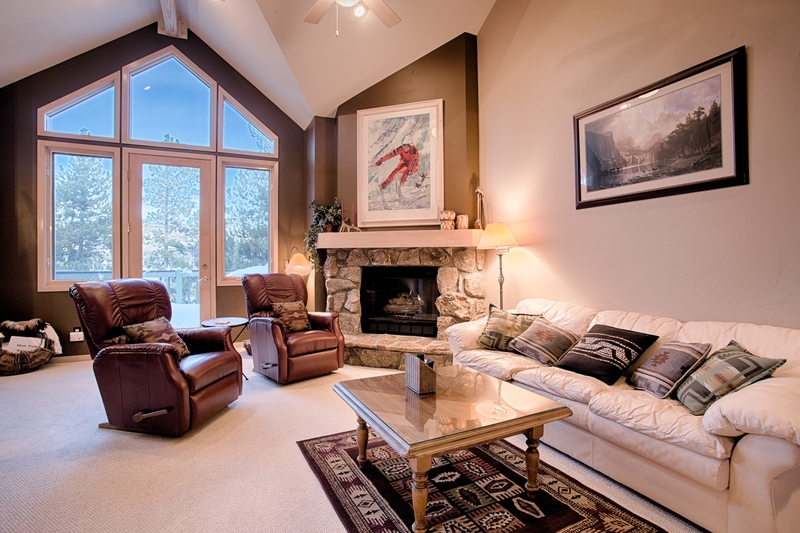 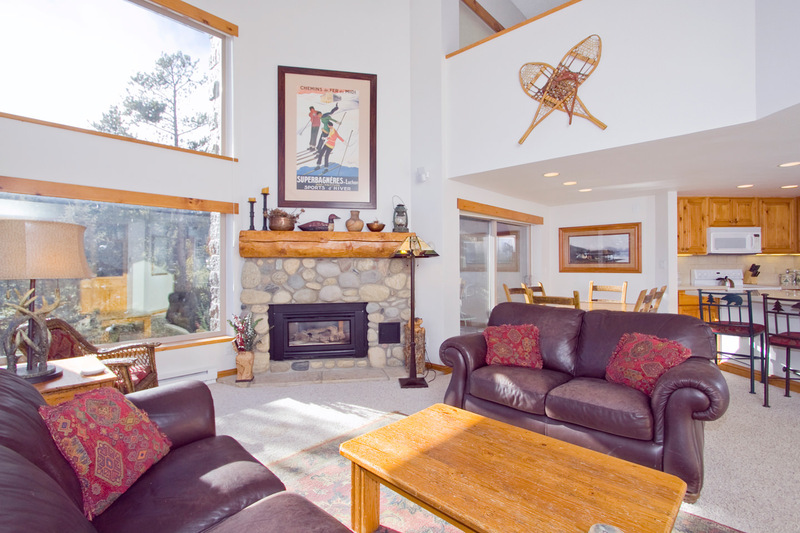 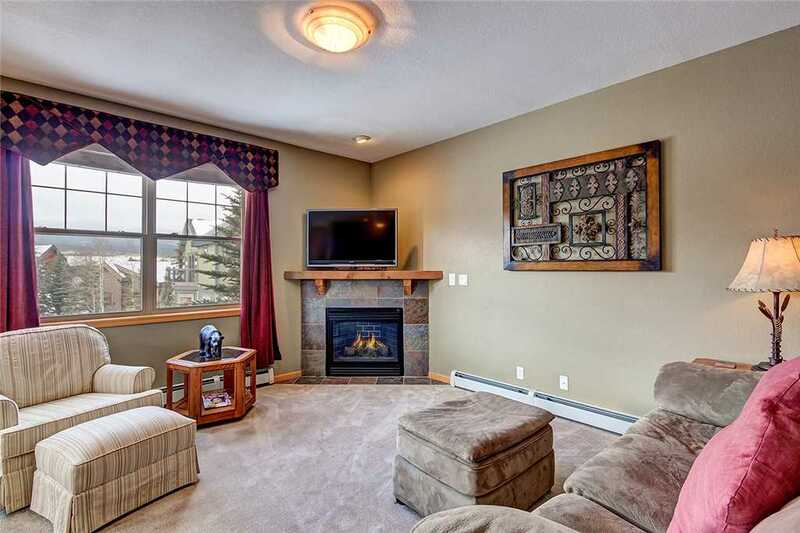 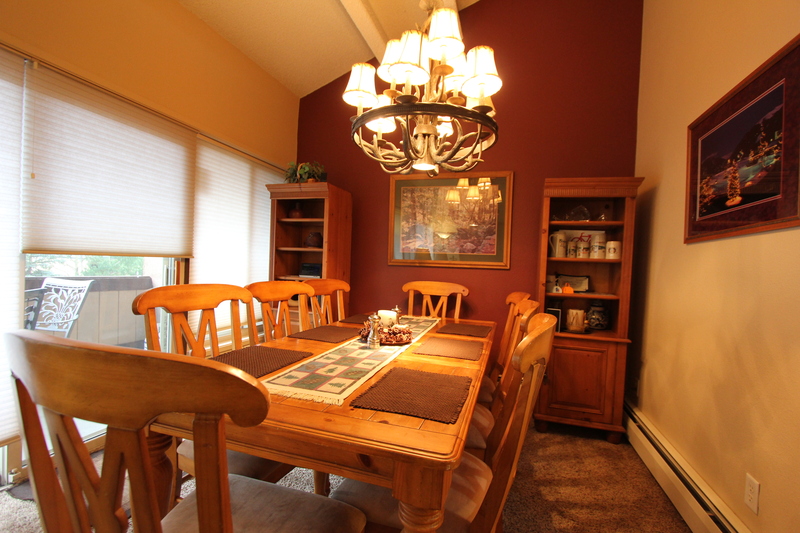 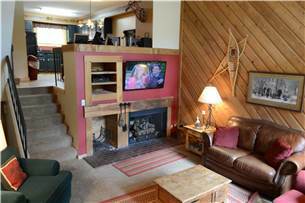 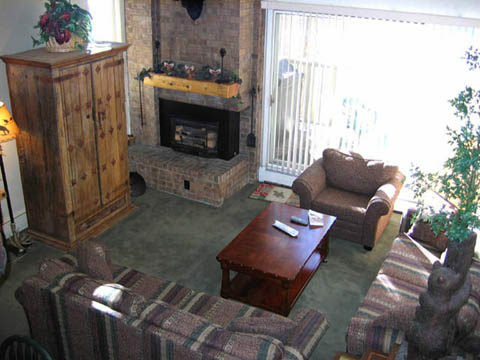 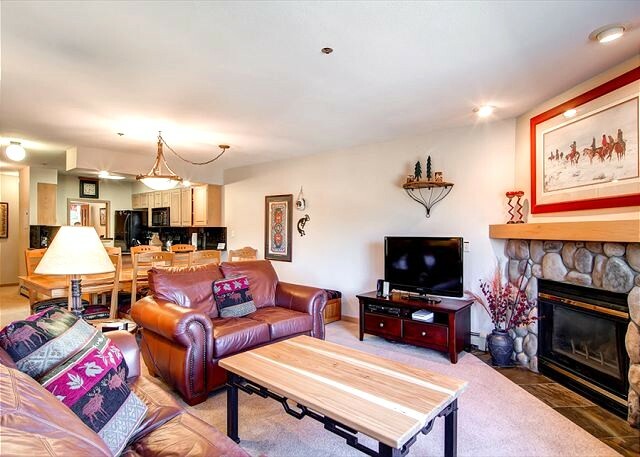 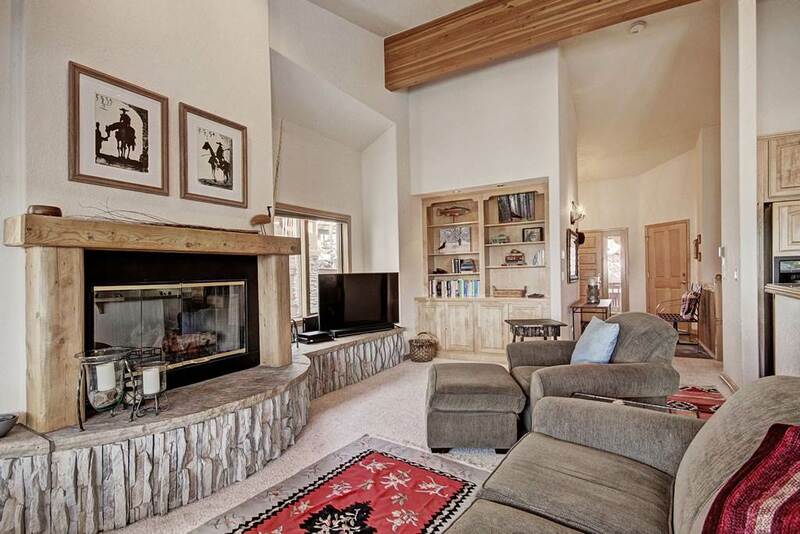 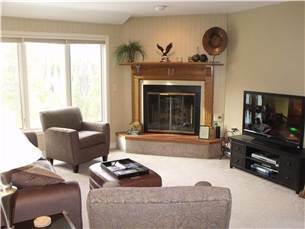 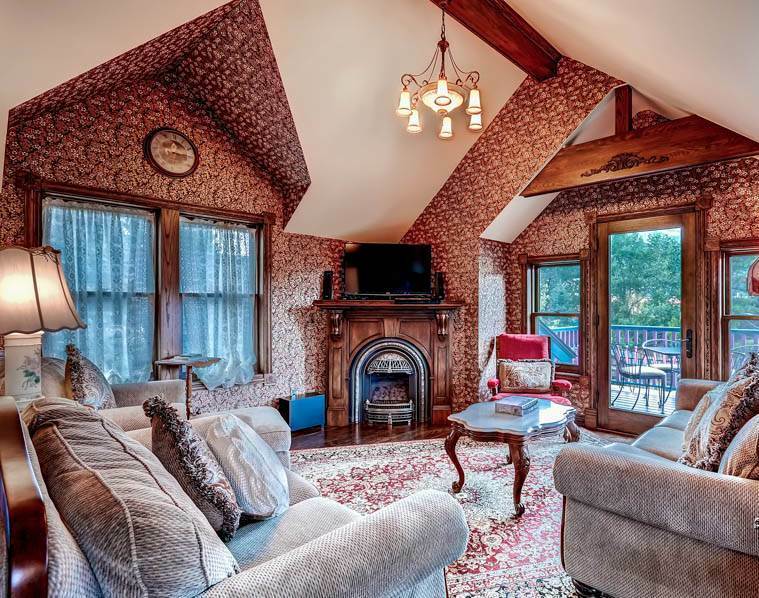 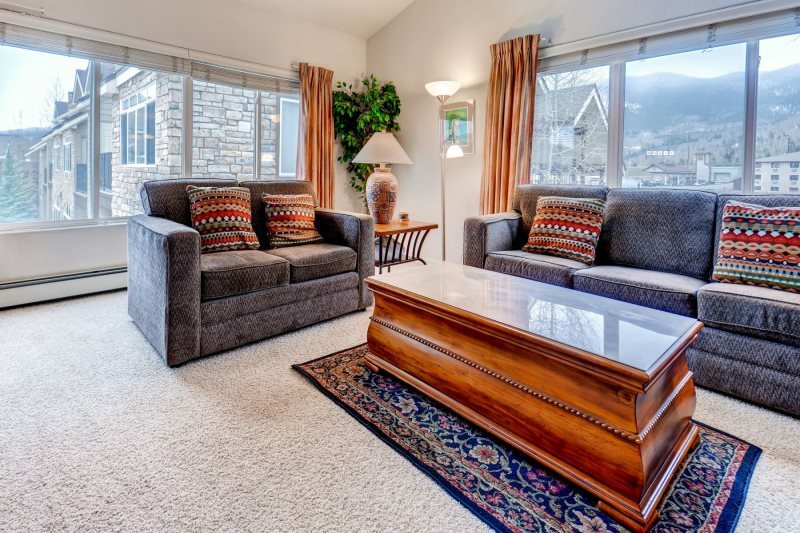 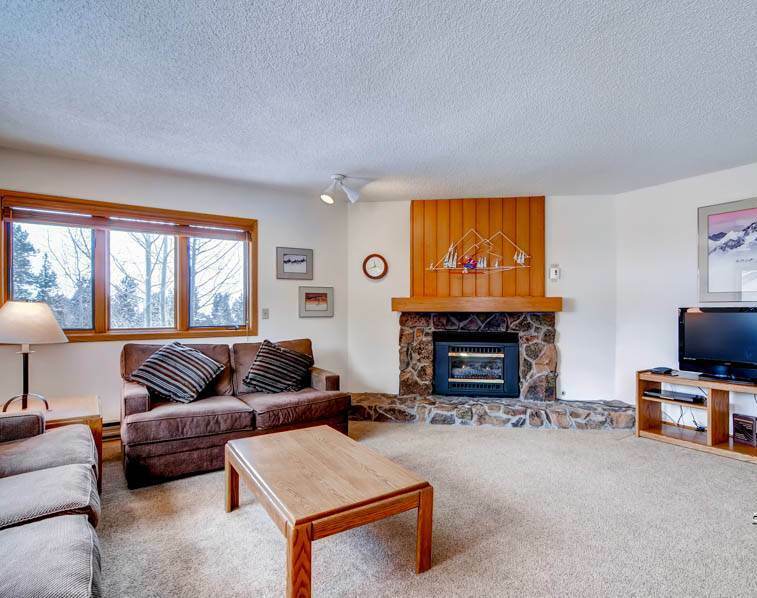 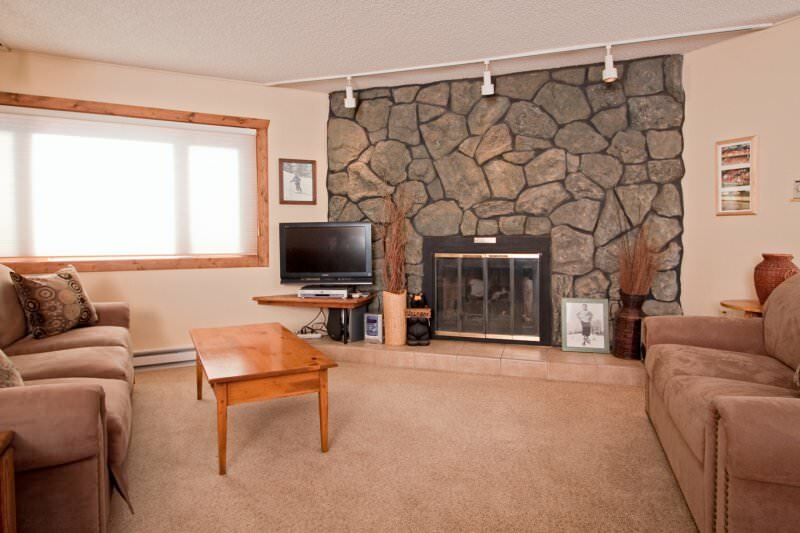 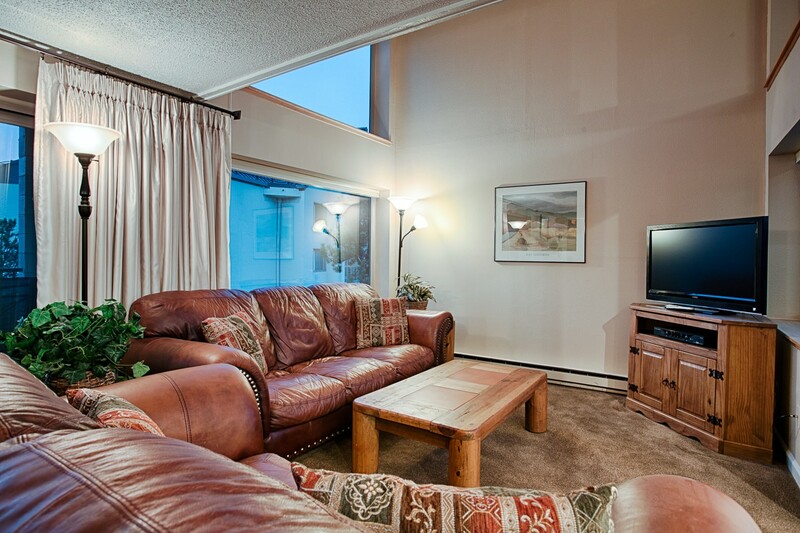 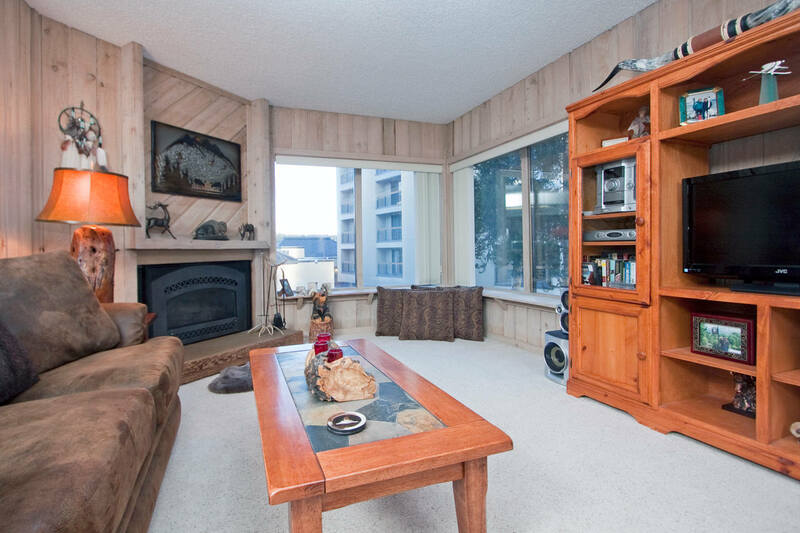 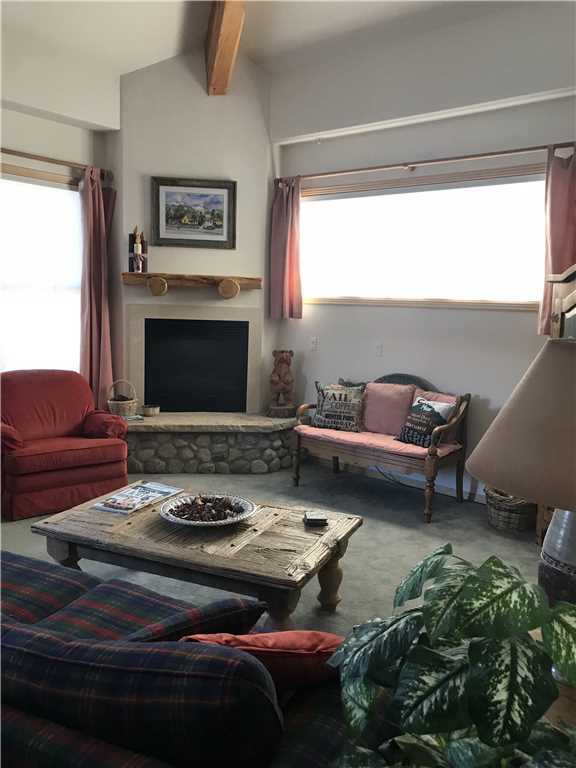 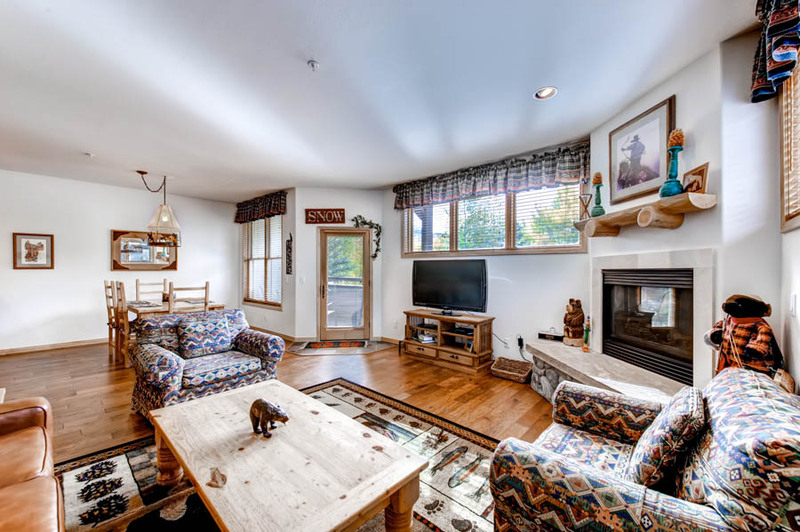 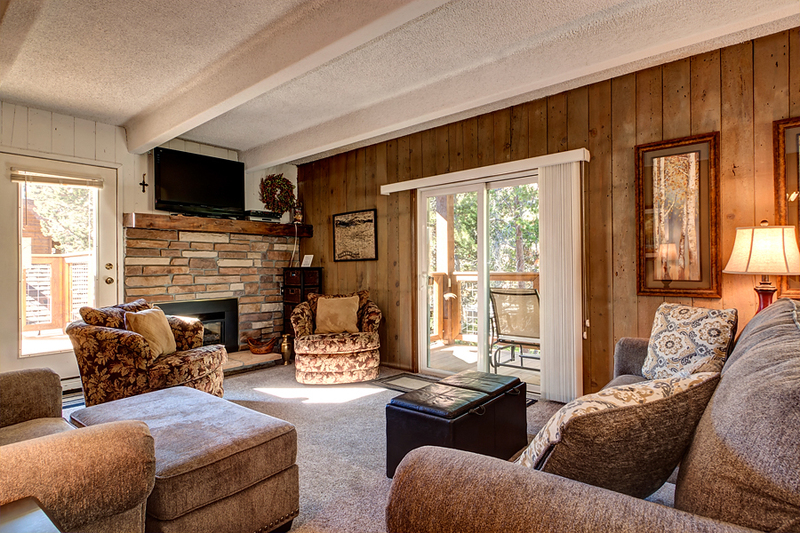 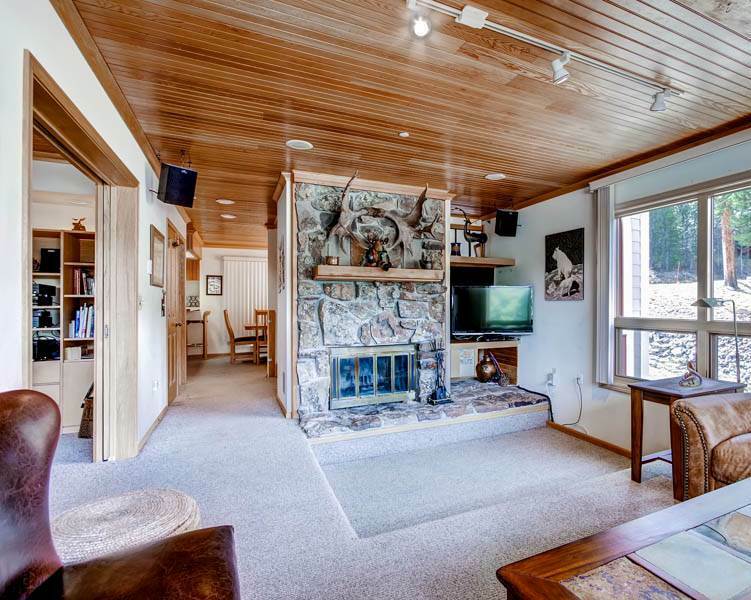 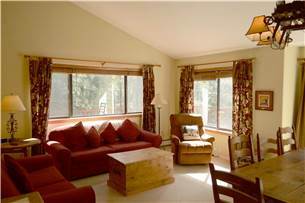 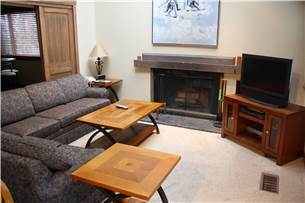 The living area is large and airy, with huge windows, comfortable seating, a gas fireplace and a large LCD-TV for kicking back after your day outdoors. 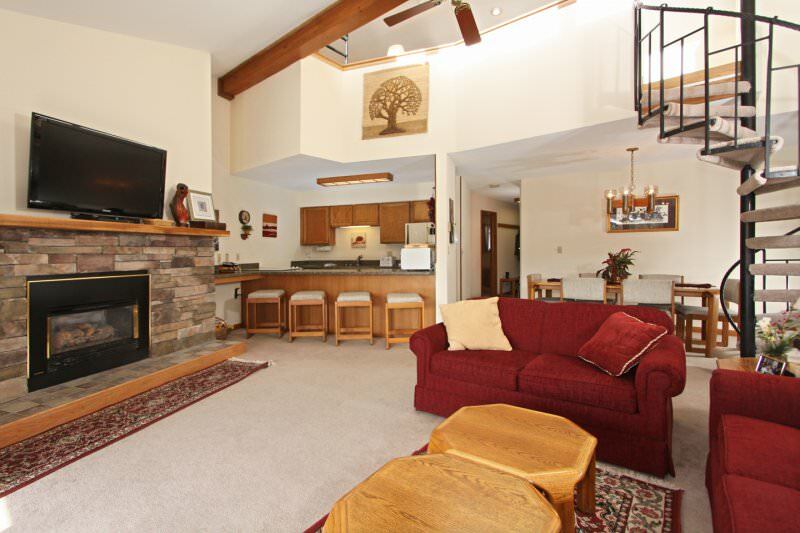 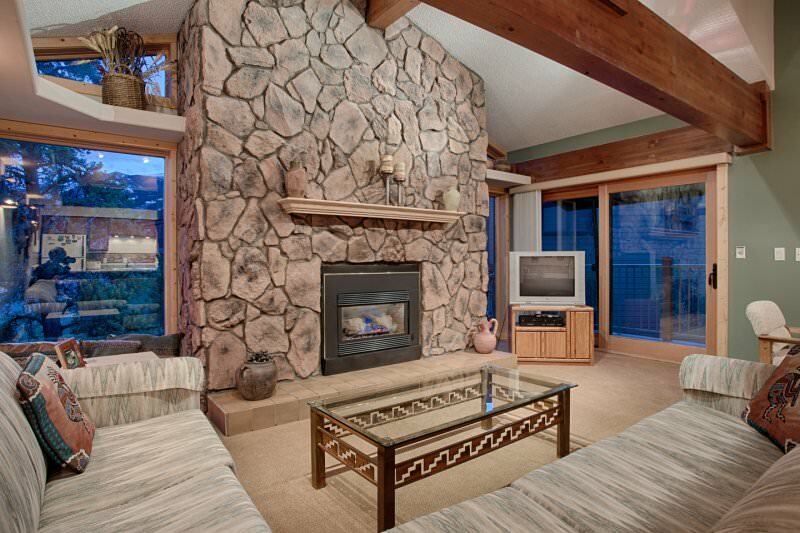 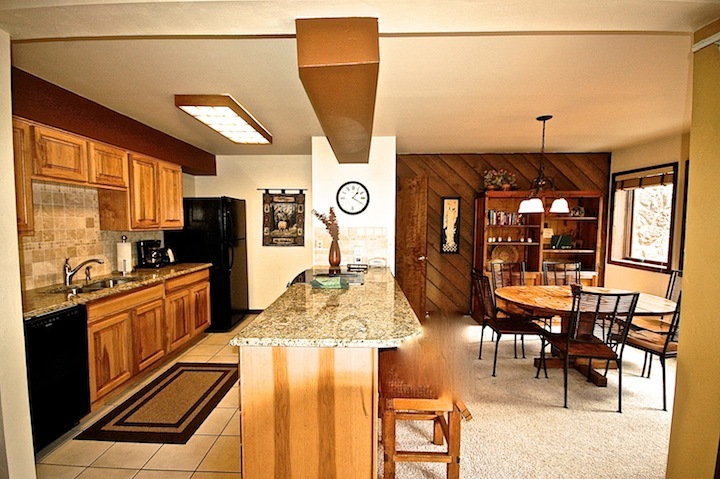 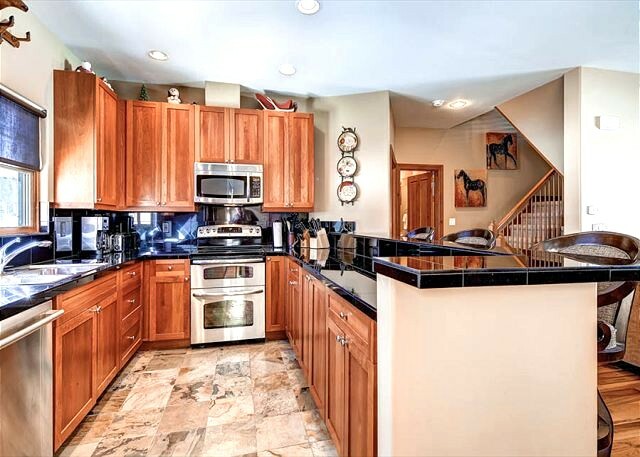 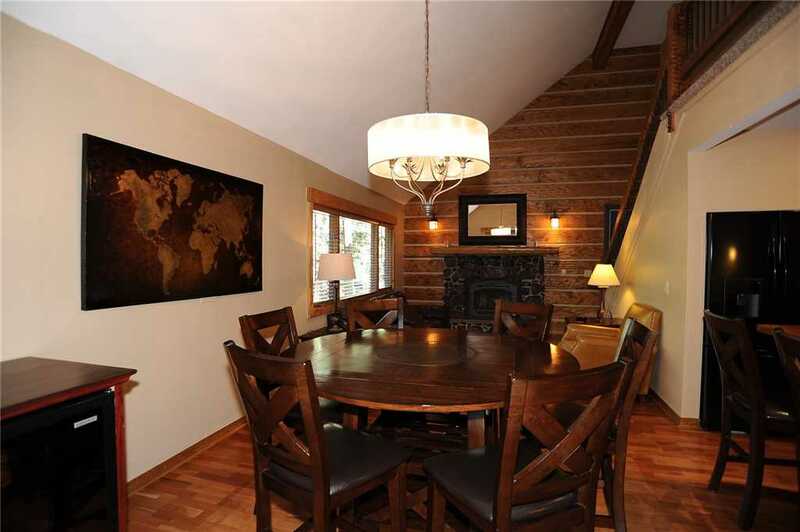 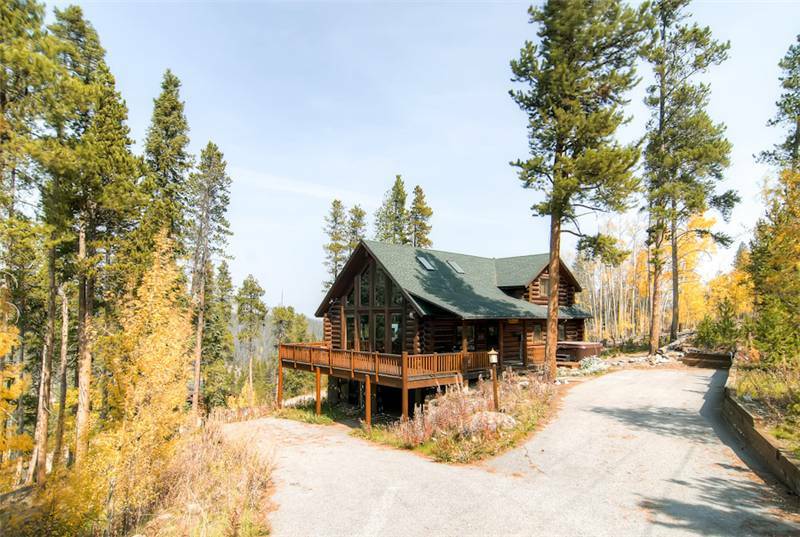 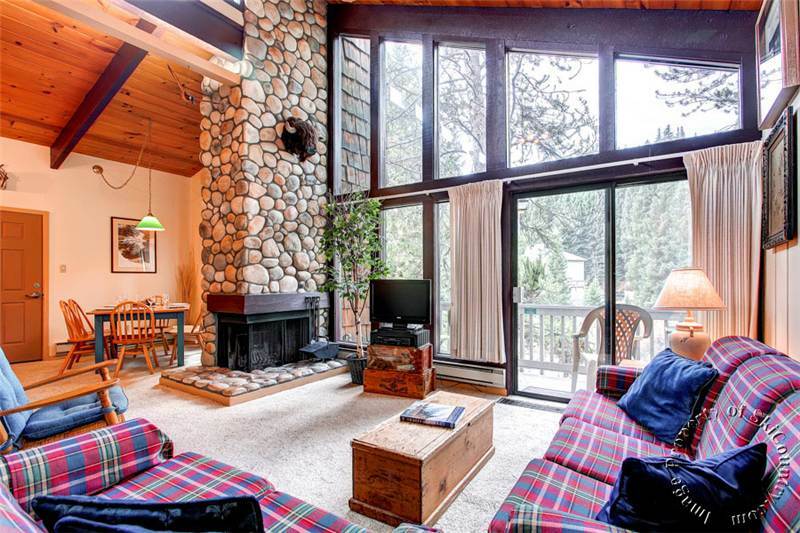 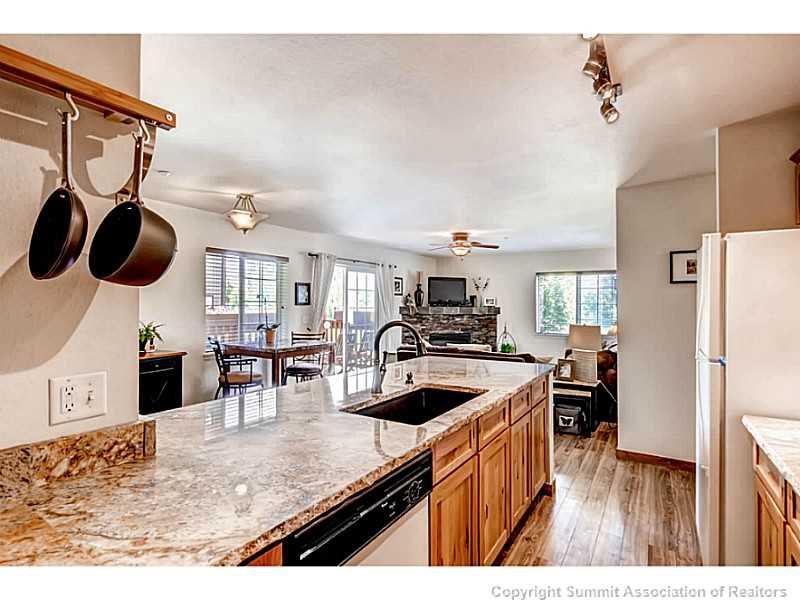 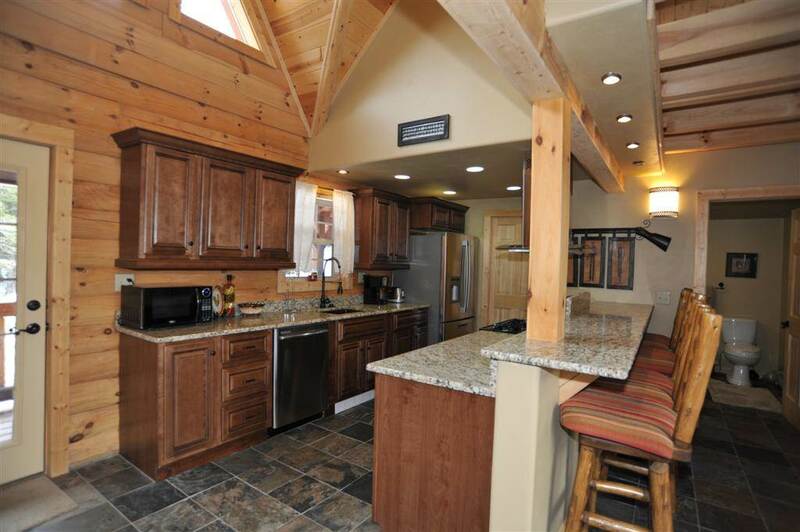 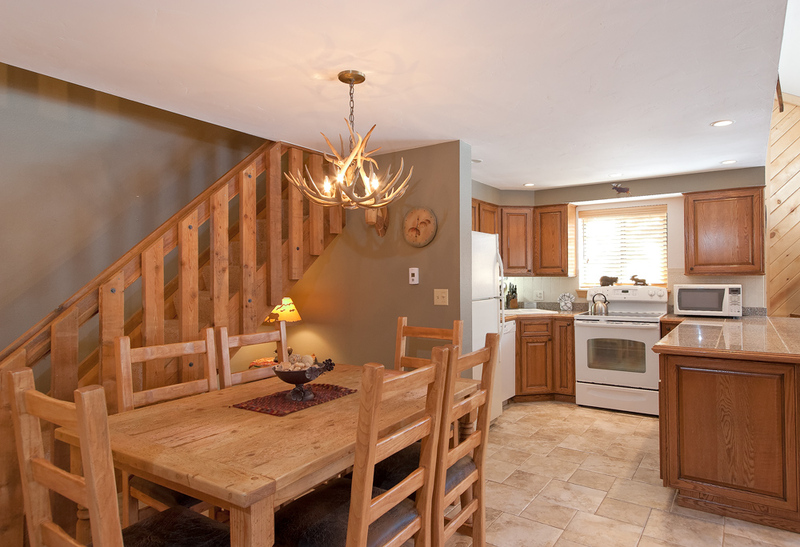 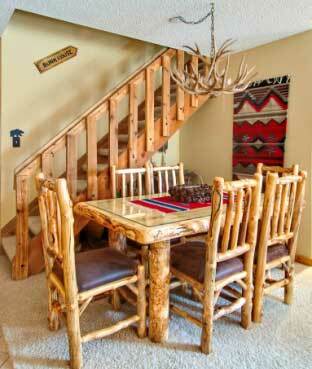 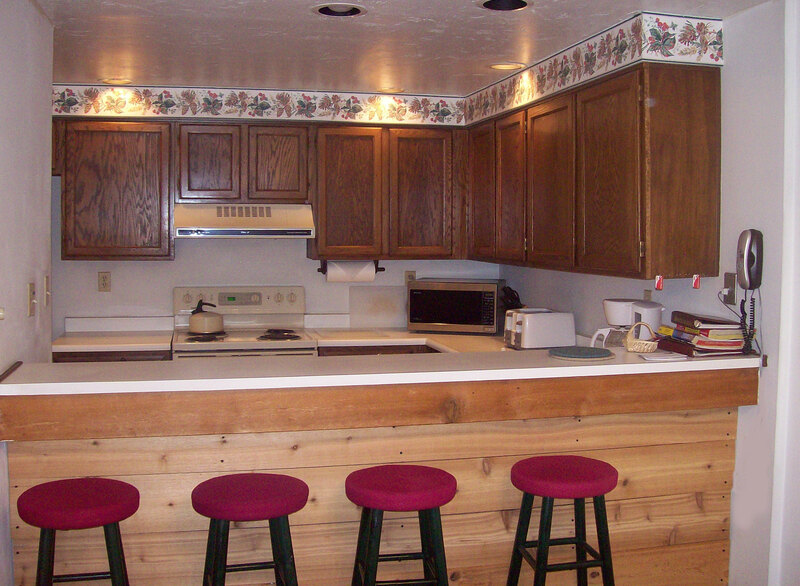 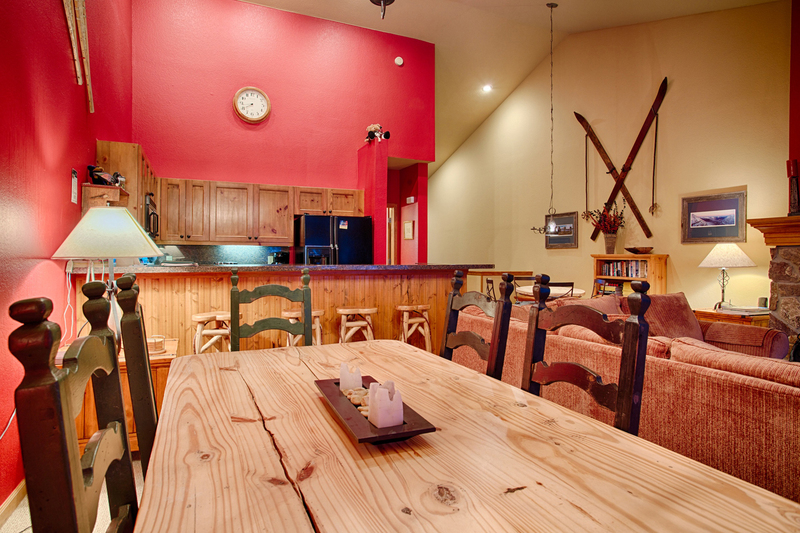 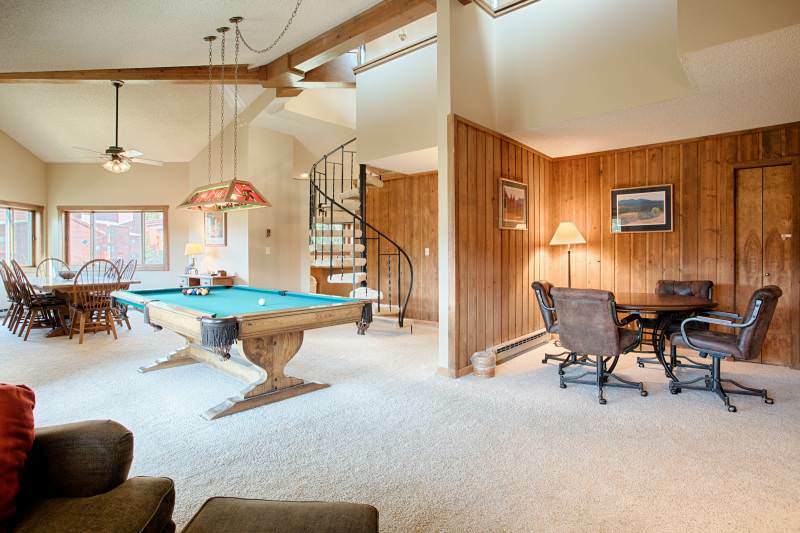 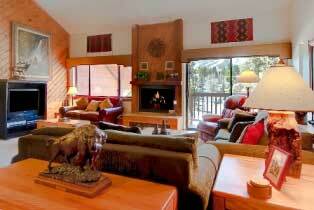 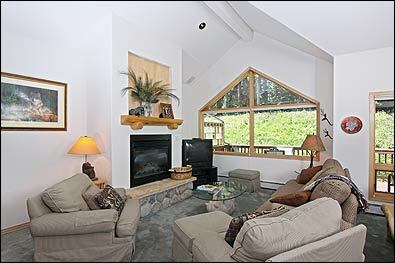 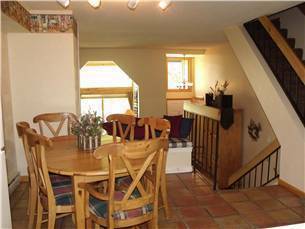 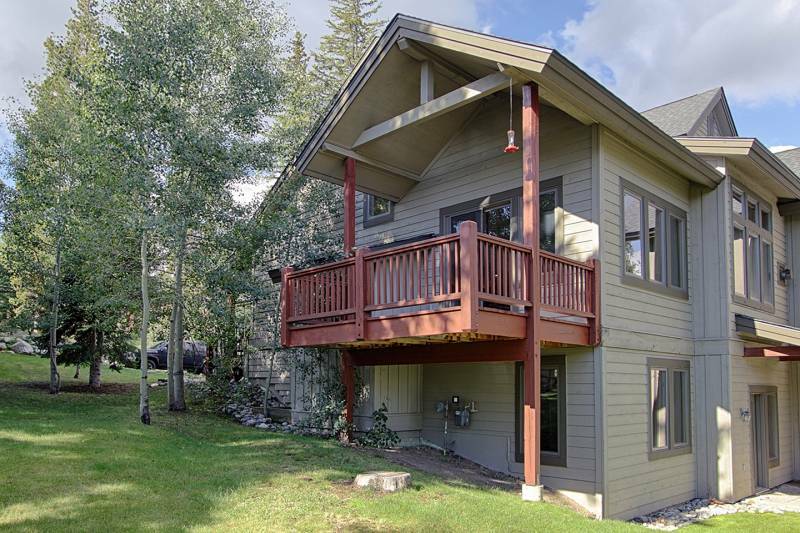 And the large deck area is superb, with a private hot tub and a gas grill overlooking an alpine meadow. 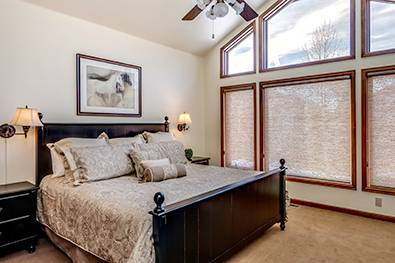 The home features two master bedrooms —one upstairs and one on the main level — making it a great choice for two families to share. 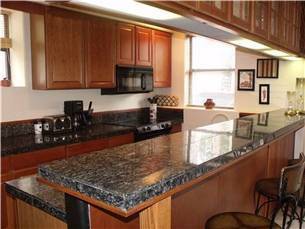 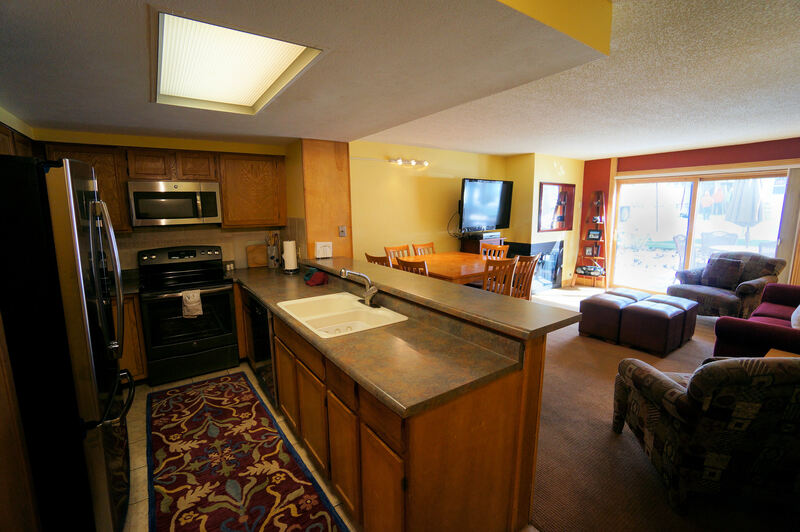 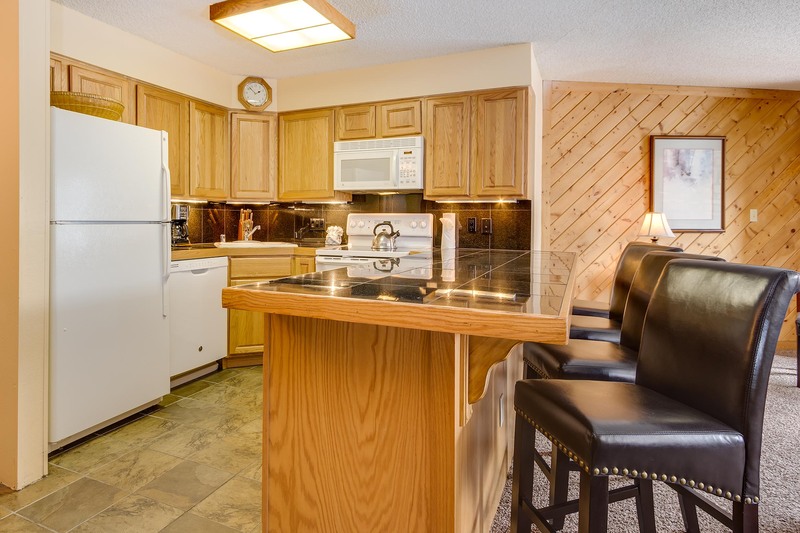 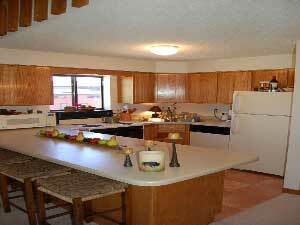 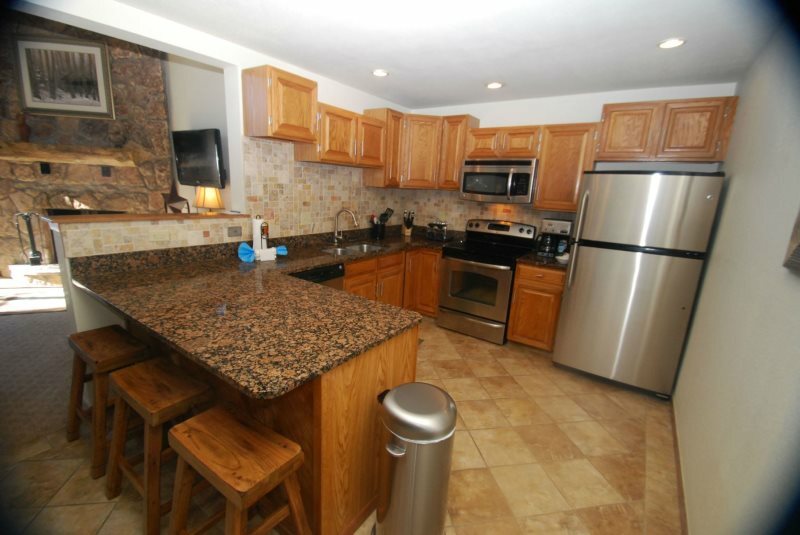 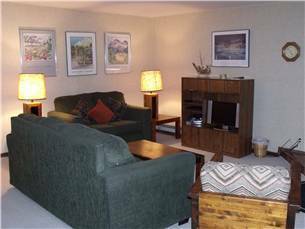 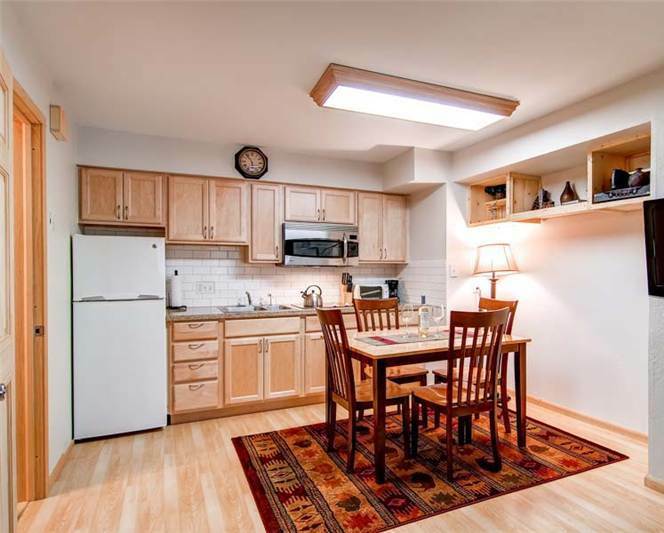 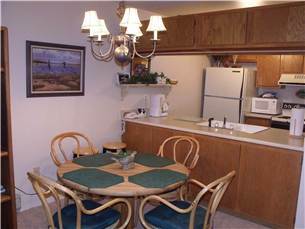 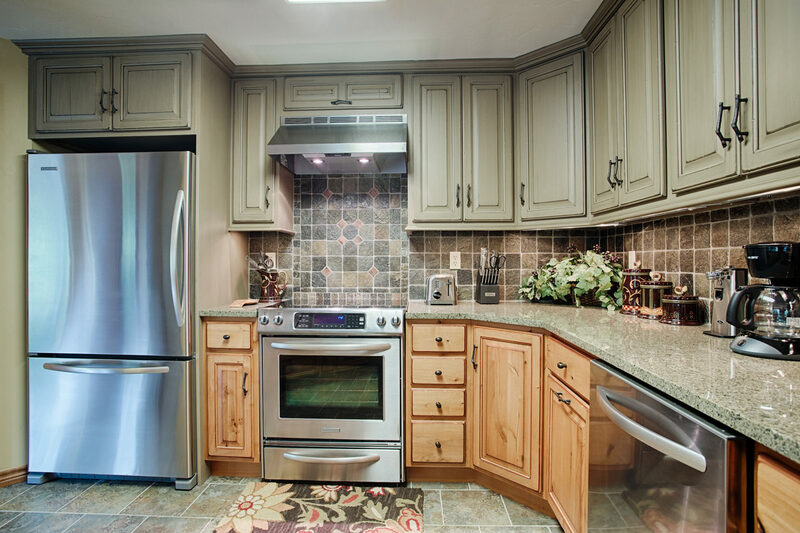 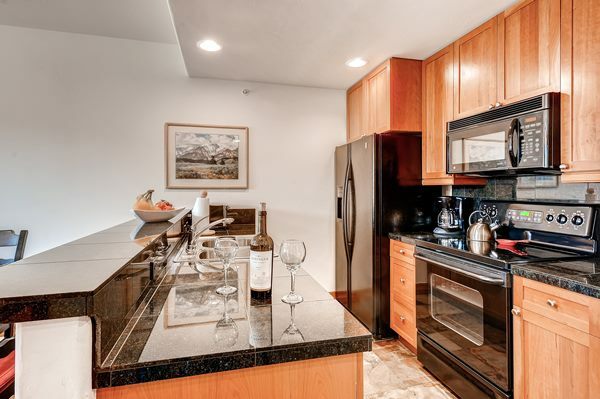 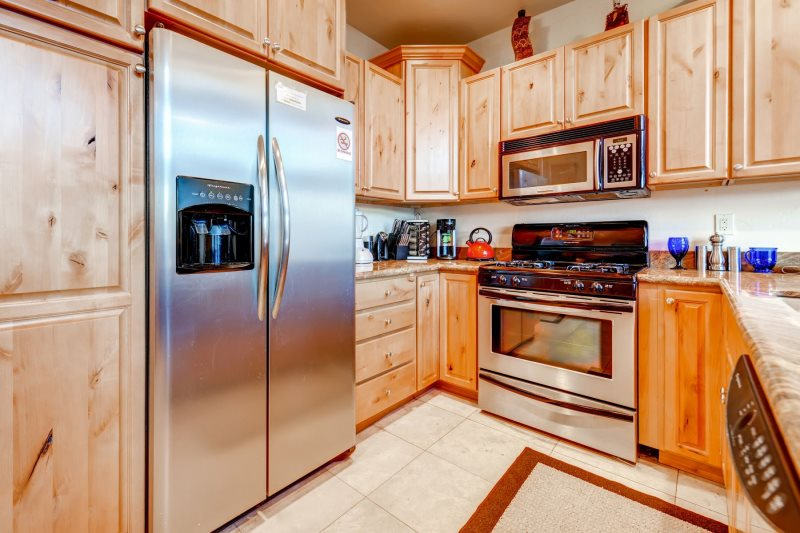 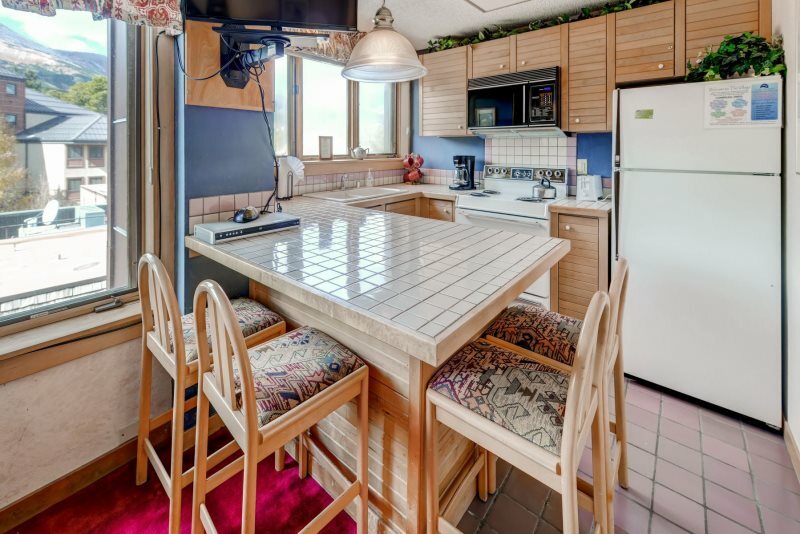 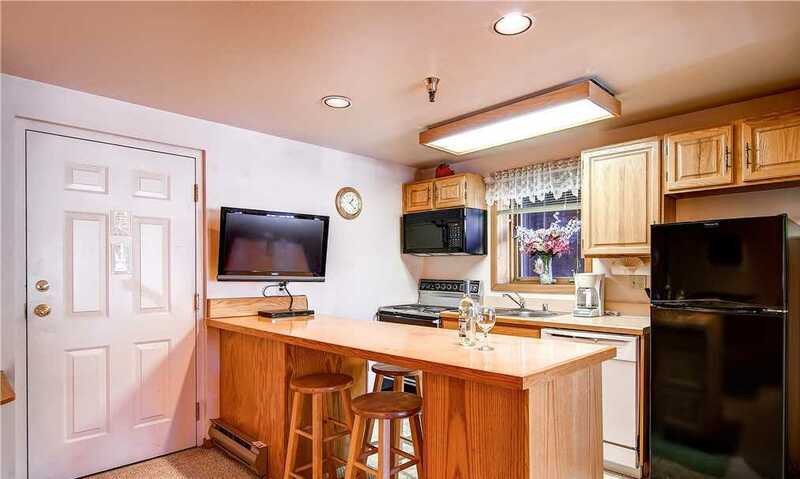 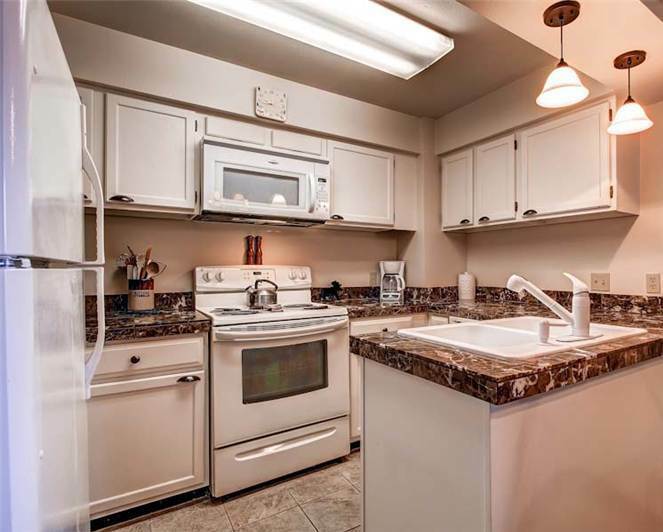 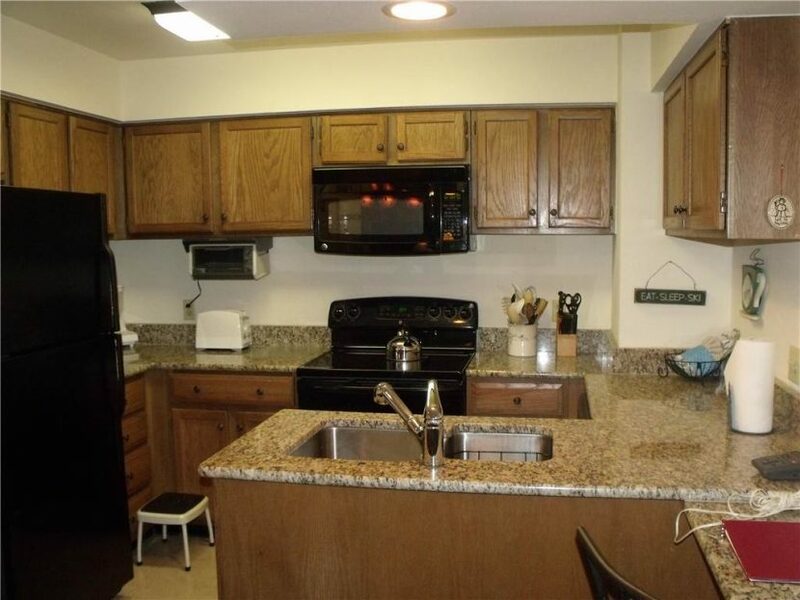 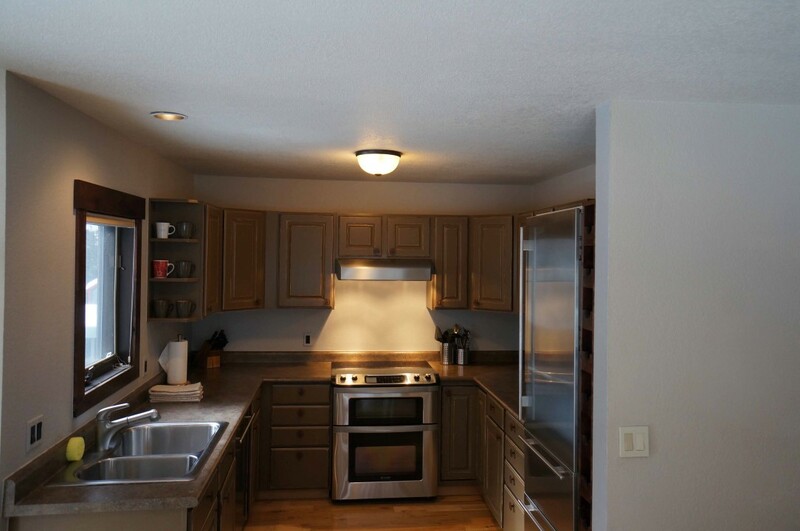 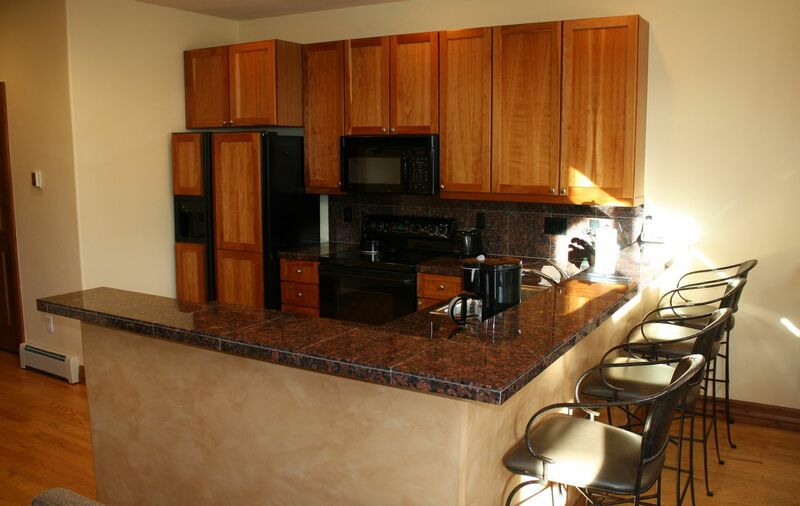 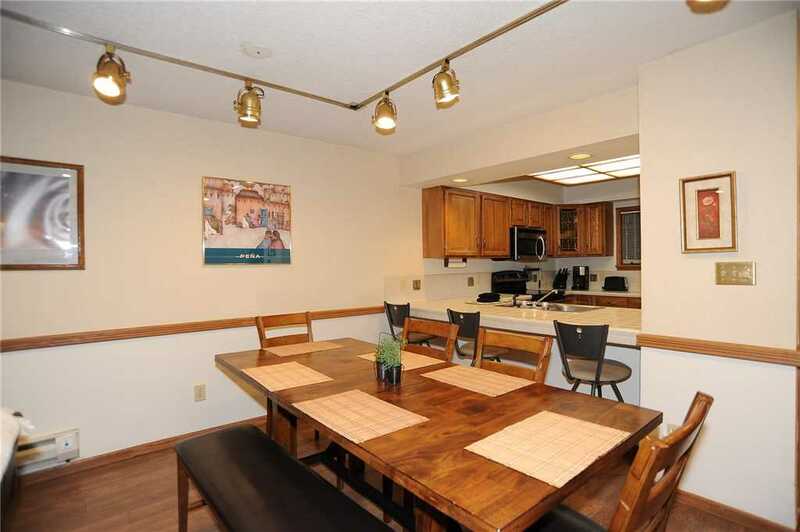 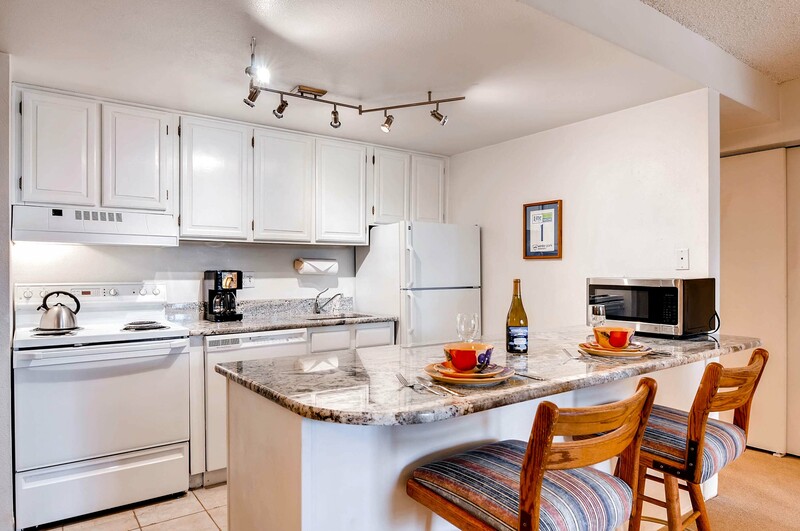 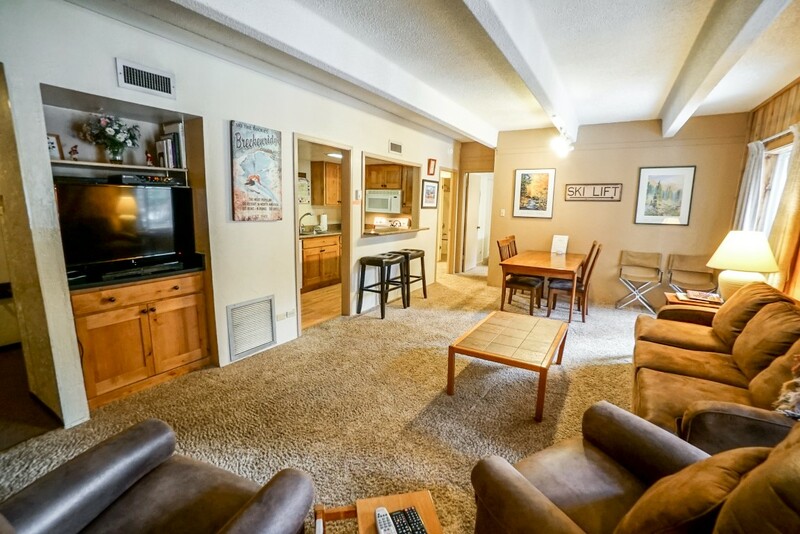 Your large group will also appreciate the heated garage with room to park two cars (additional driveway parking), a washer and dryer, and complementary Wi-Fi throughout the unit. 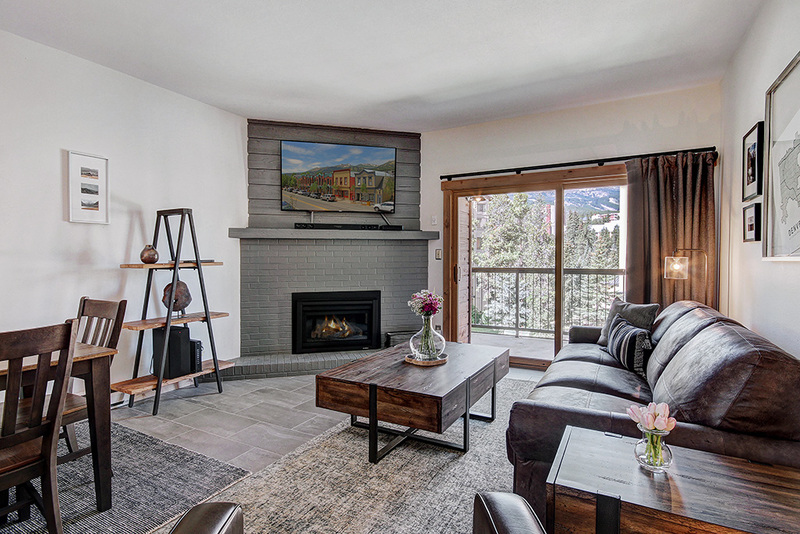 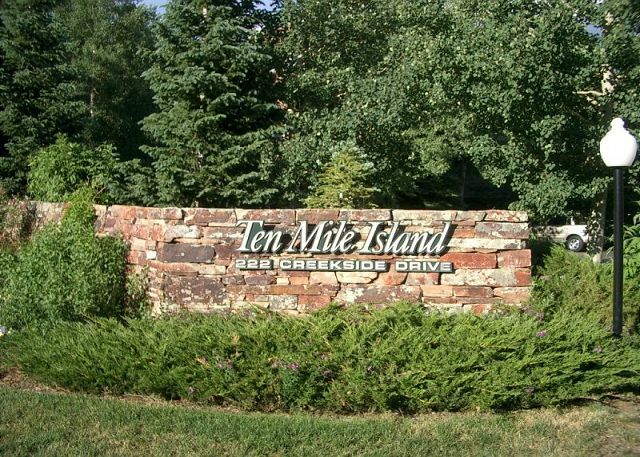 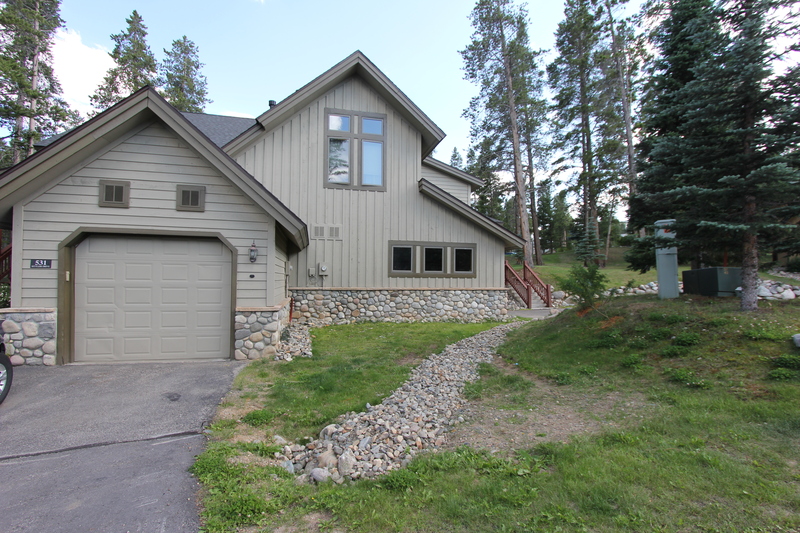 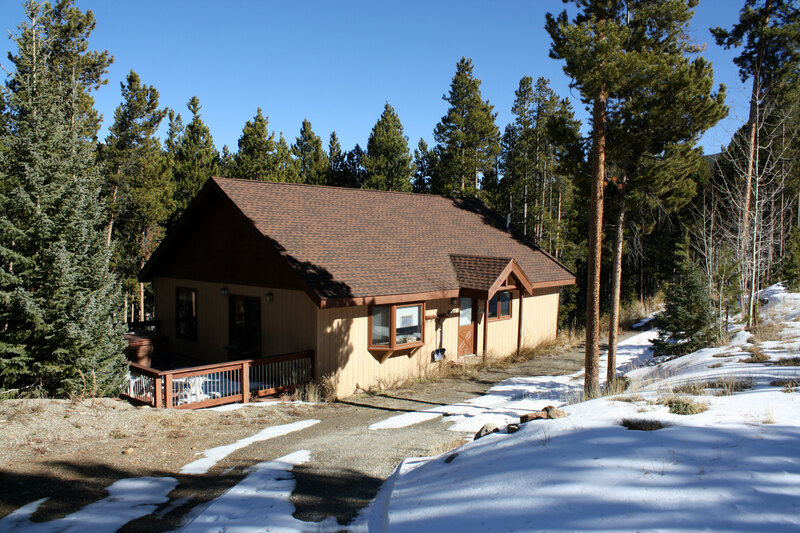 Highlands Green 84 offers space, luxury and a beautiful setting to enjoy the best outdoor activities Breckenridge has to offer. 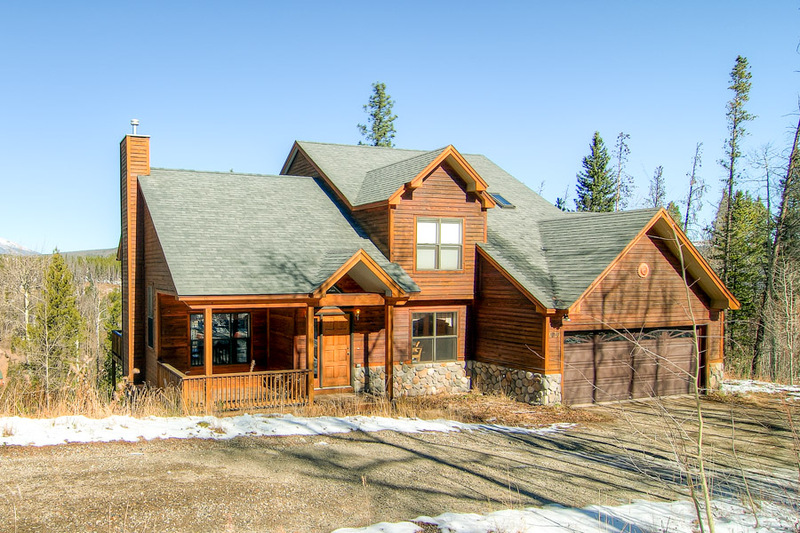 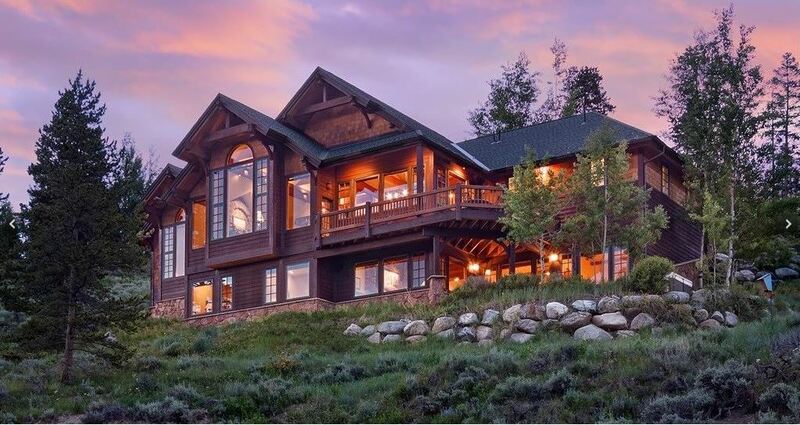 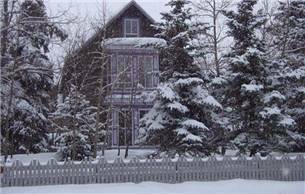 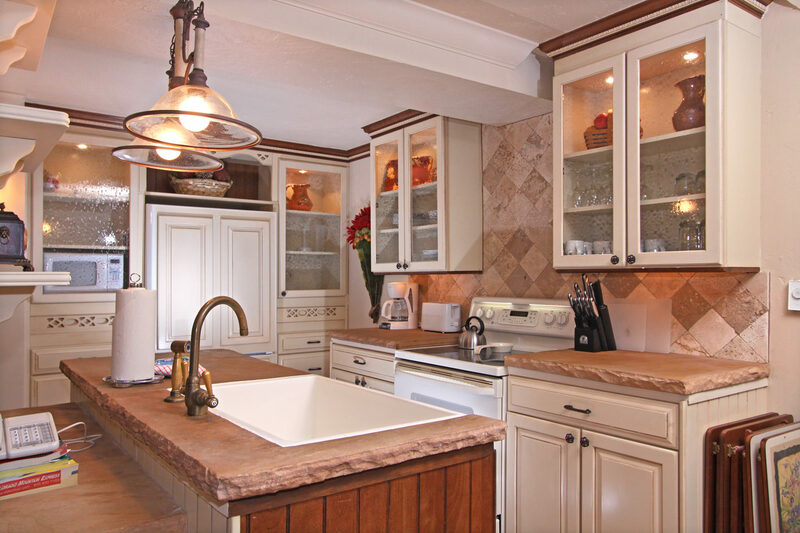 Call us today to learn more about this very special property; you’ll be glad you did! 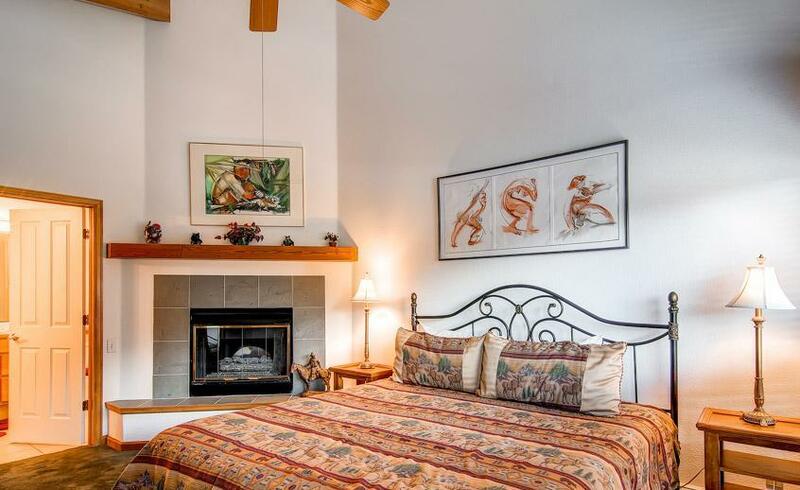 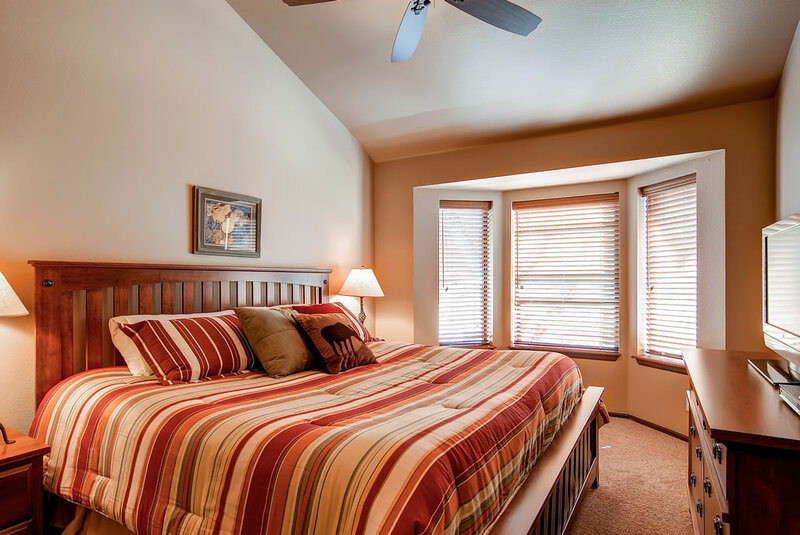 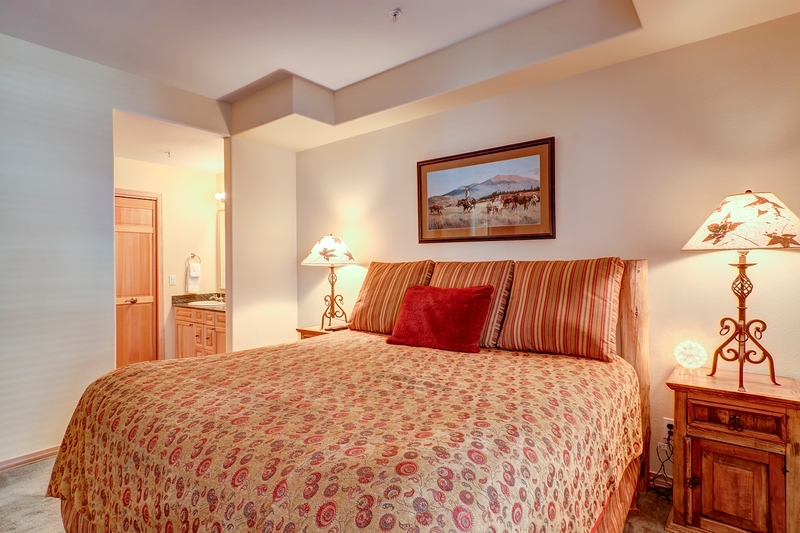 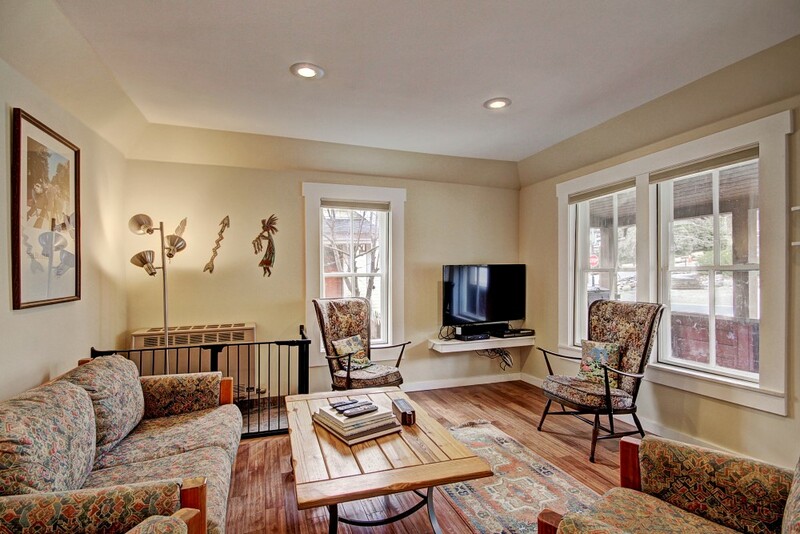 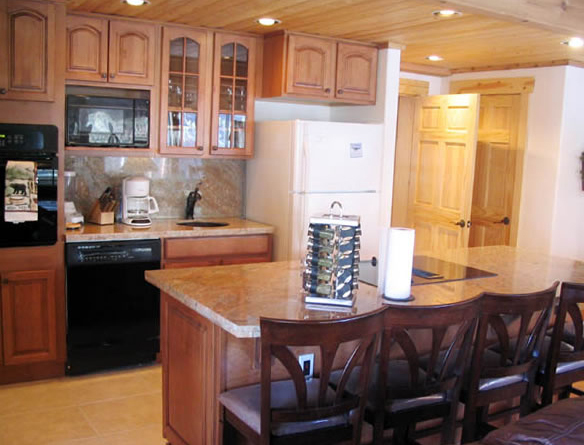 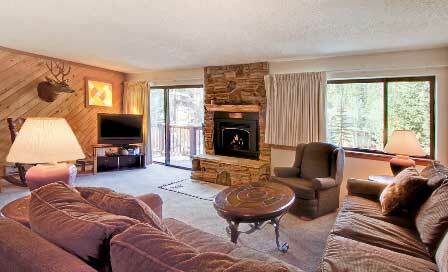 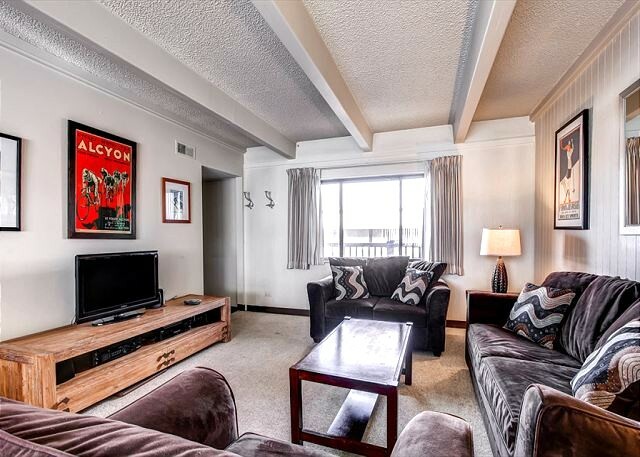 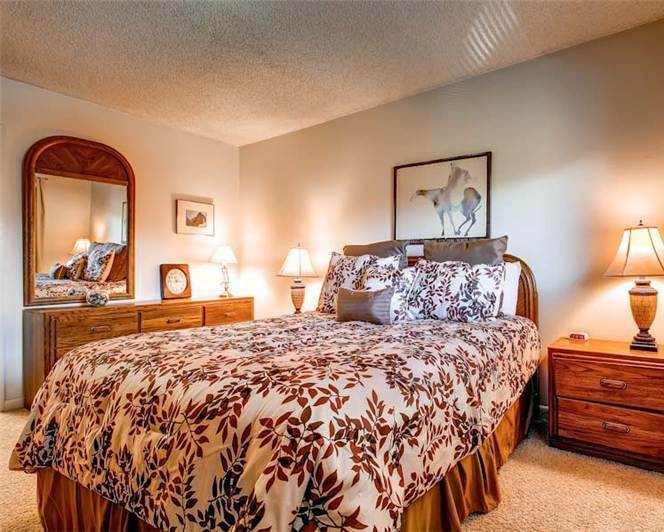 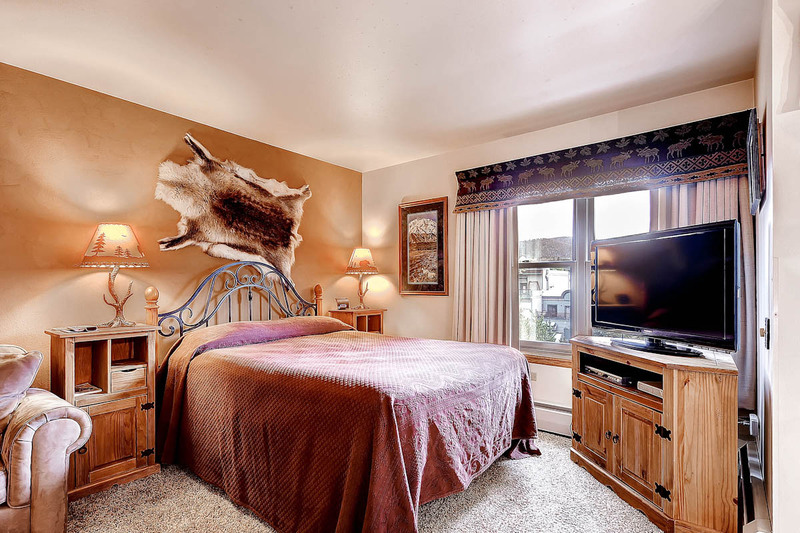 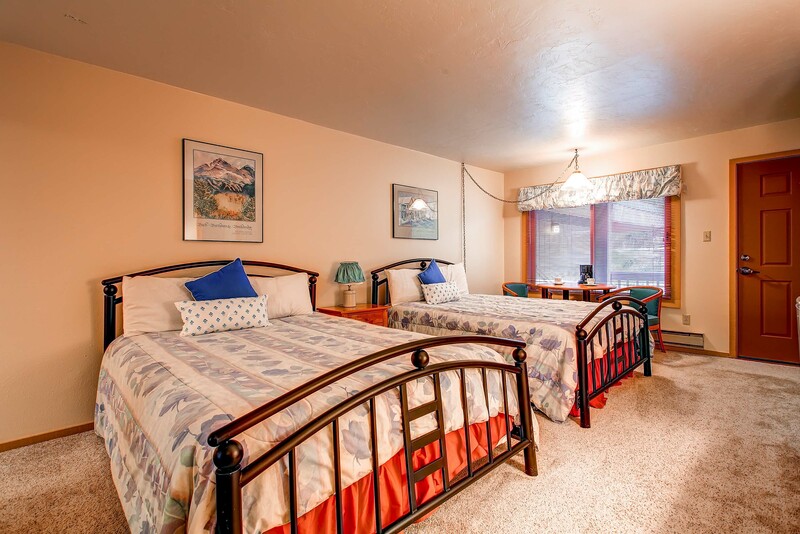 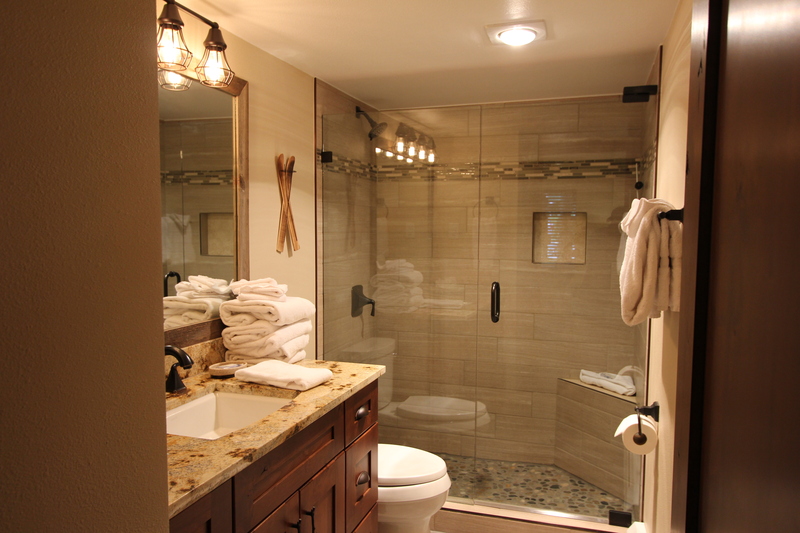 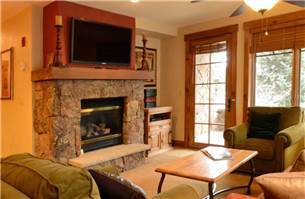 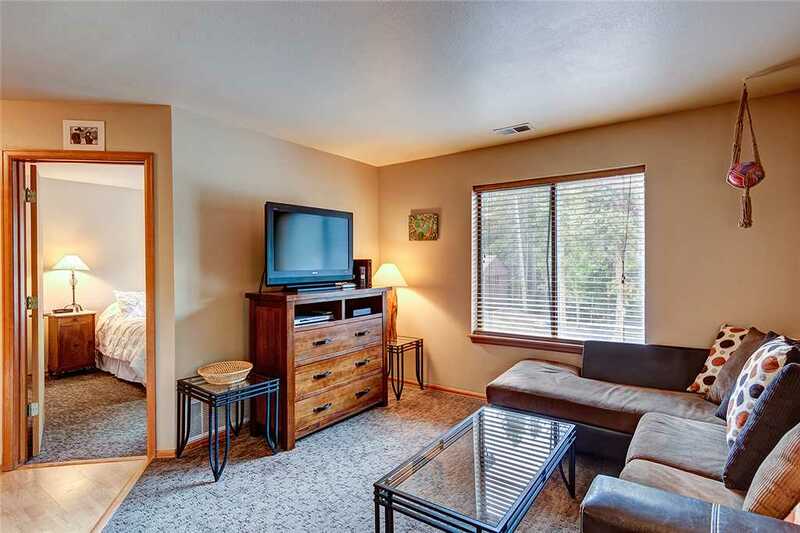 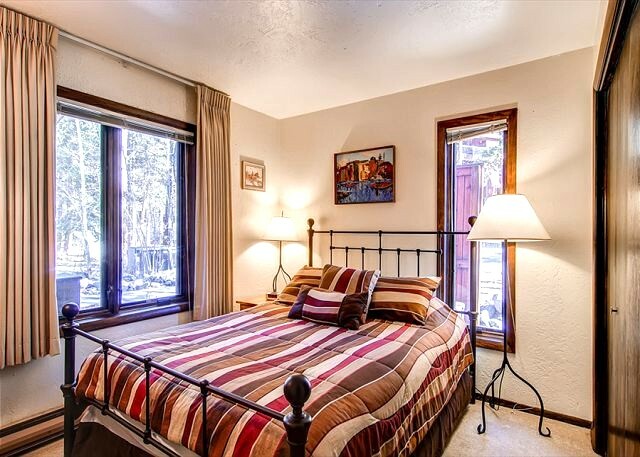 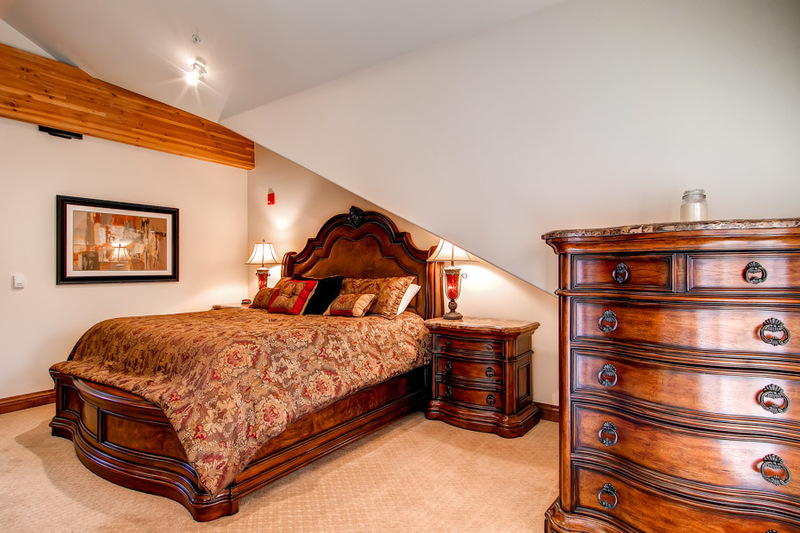 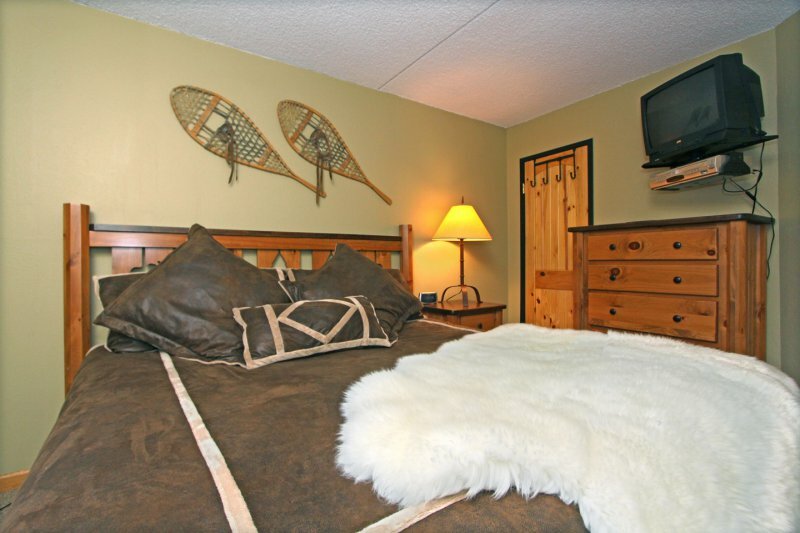 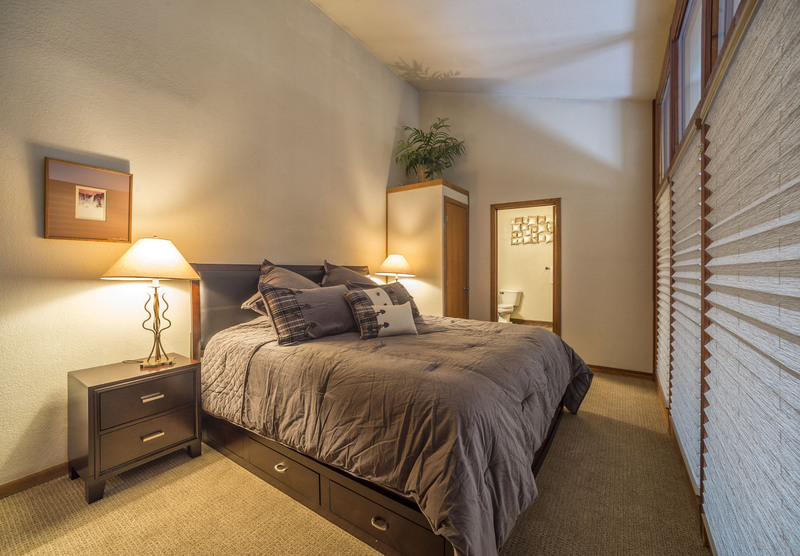 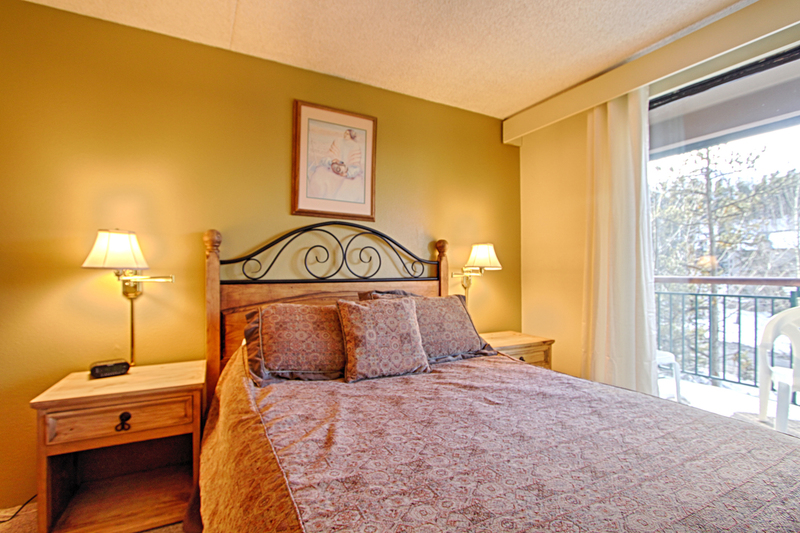 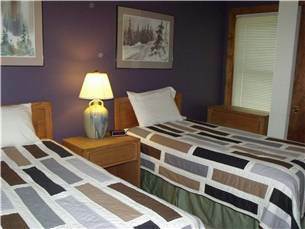 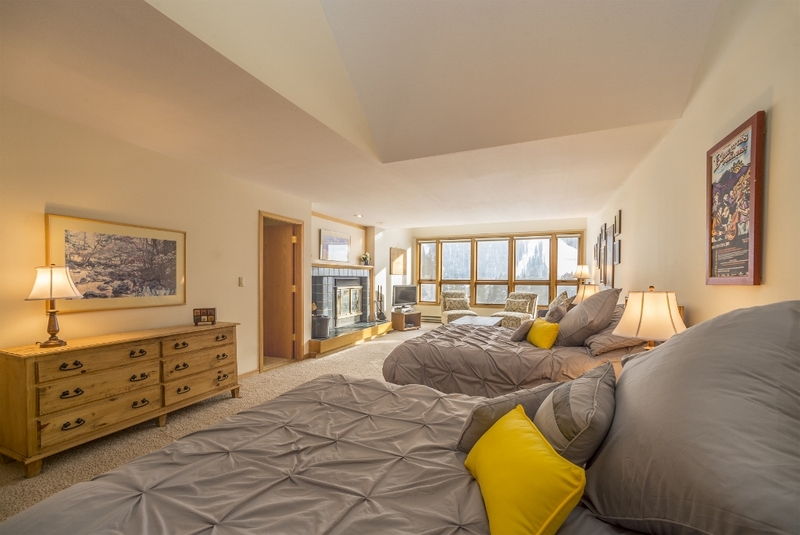 • Master suite: king bed, in-suite bathroom with a separate soaking tub and walk-in shower, TV. 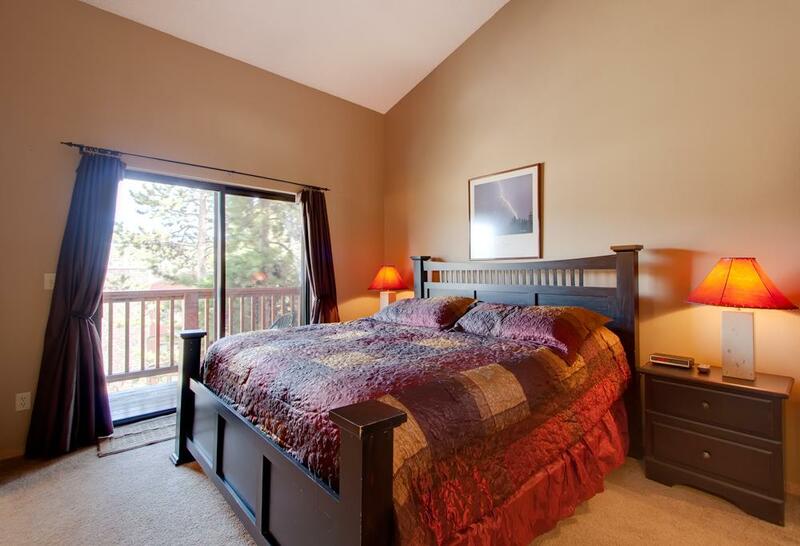 • Bedroom 2: queen bed, TV. 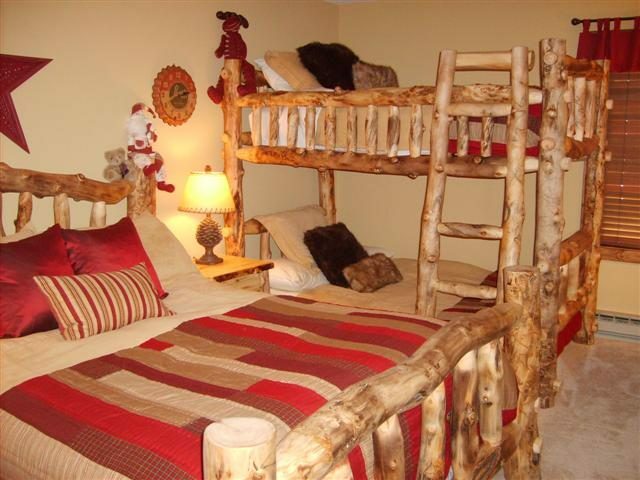 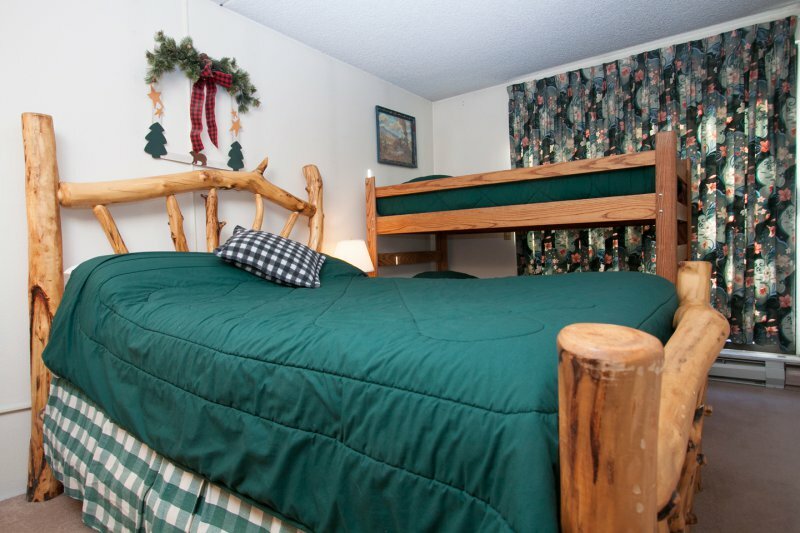 • Bedroom 3: log double bunk bed (sleeps 4), TV. 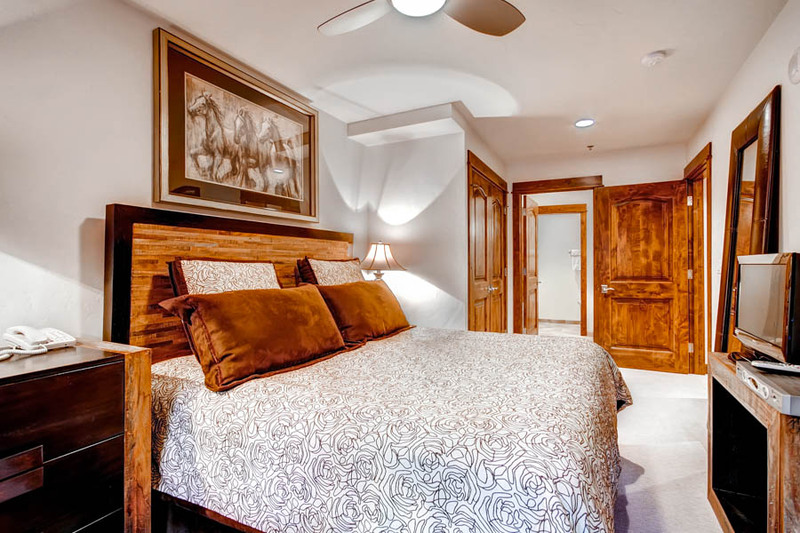 • Master suite 2: king bed, in-suite bathroom with a separate soaking tub and walk-in shower, LCD-TV, sitting room, private door to deck/hot tub. 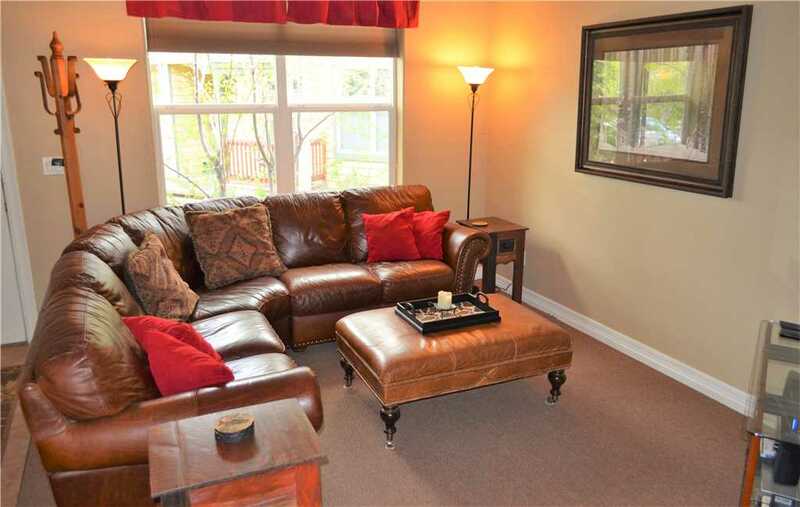 • Living Room: Sleeper sofa.